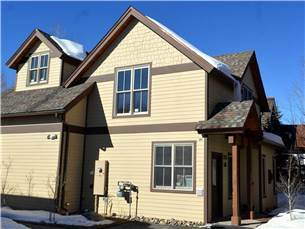 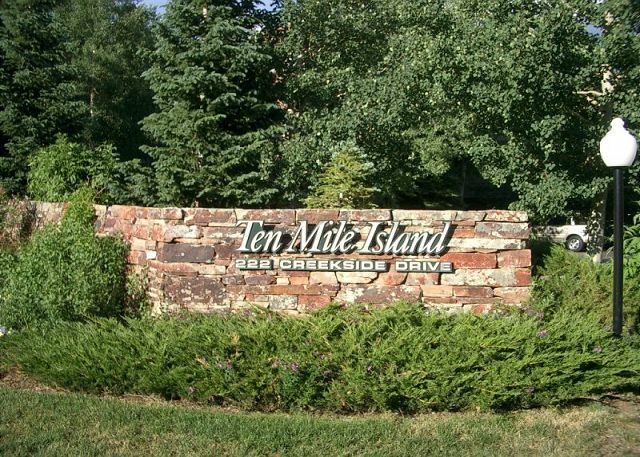 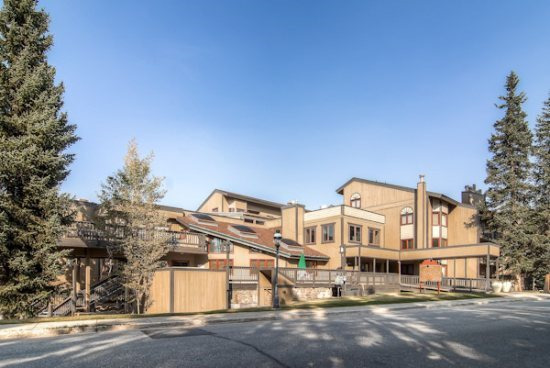 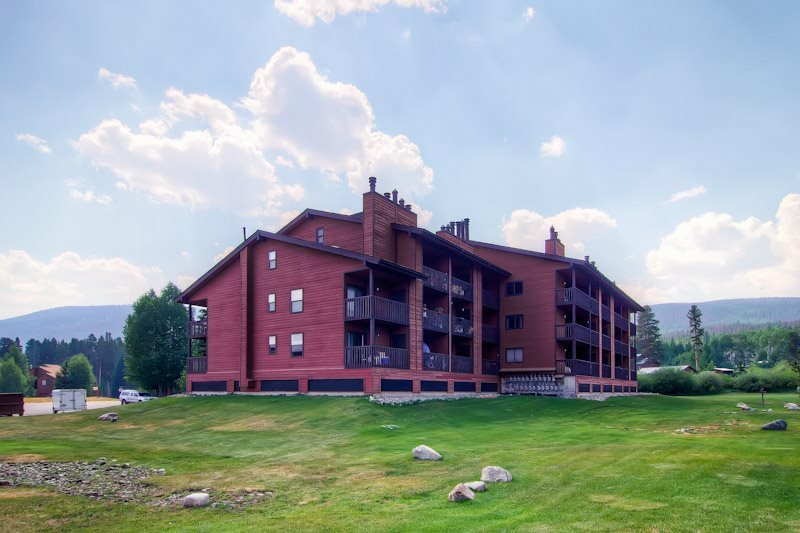 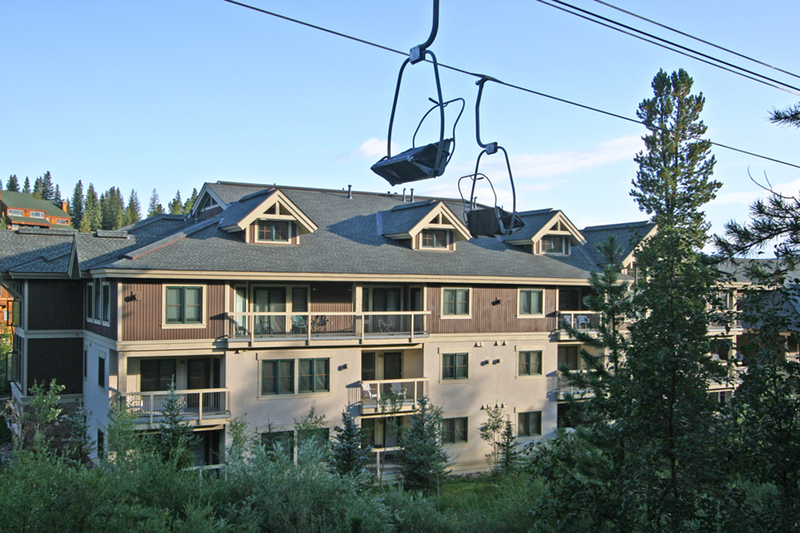 The Boulevard Bend complex is upscale Frisco — beautiful condos in a fantastic location close to Main Street, the Frisco Marina, the Lake Dillon bike path and more. 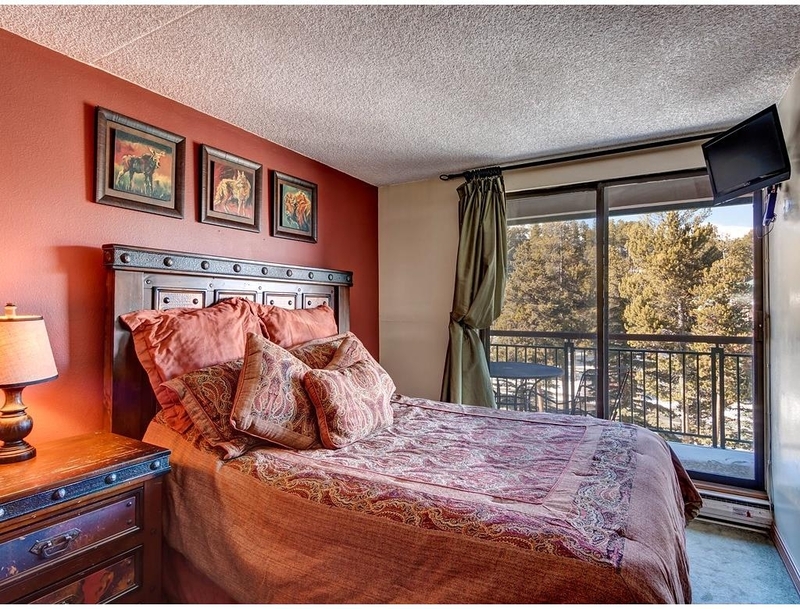 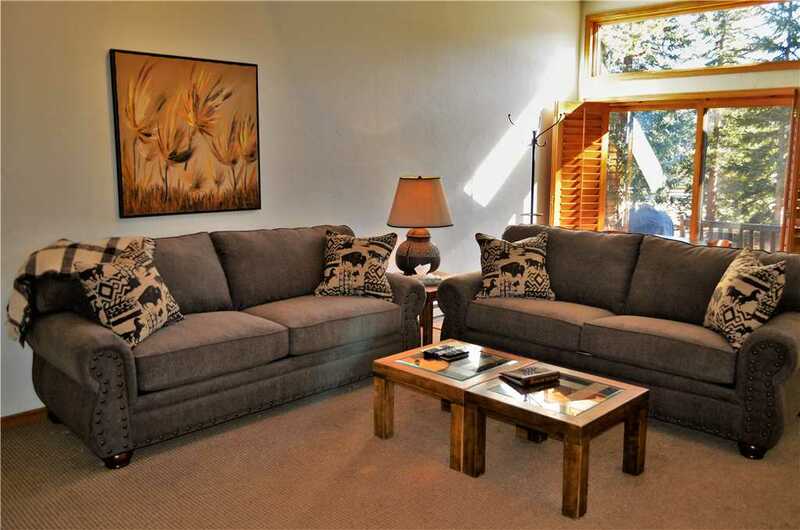 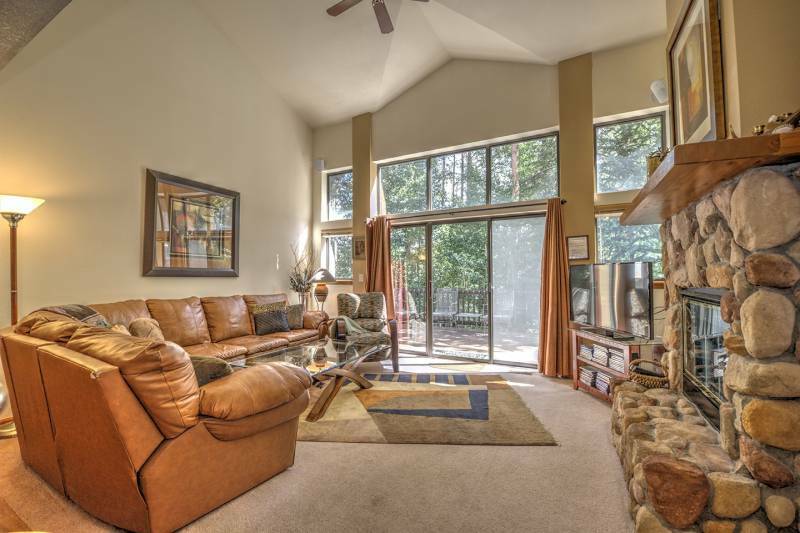 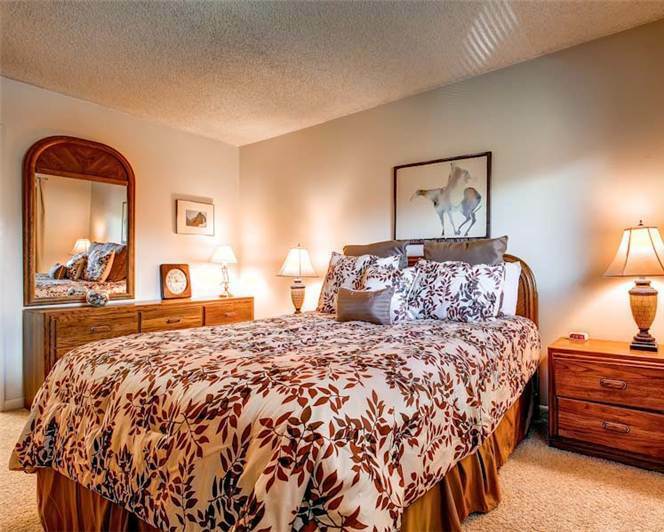 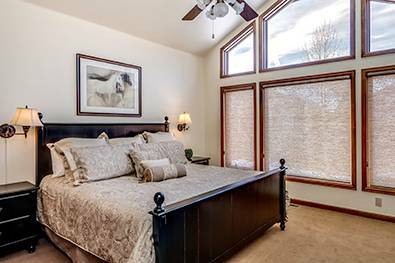 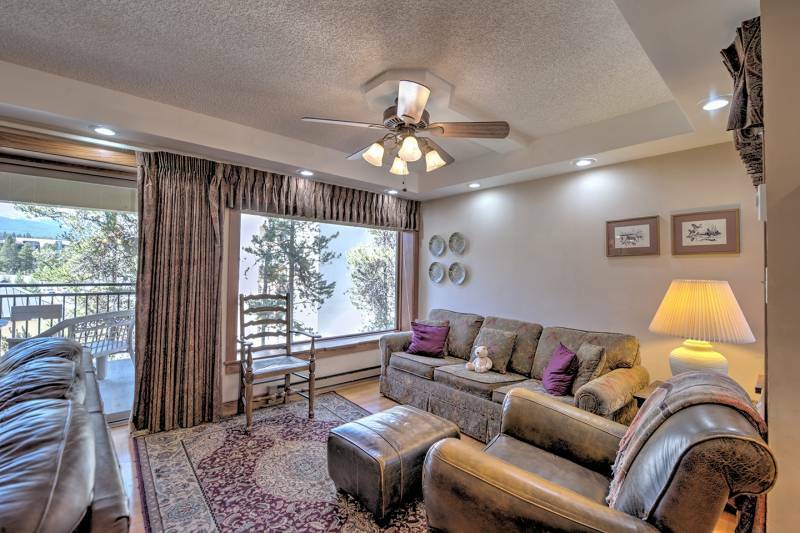 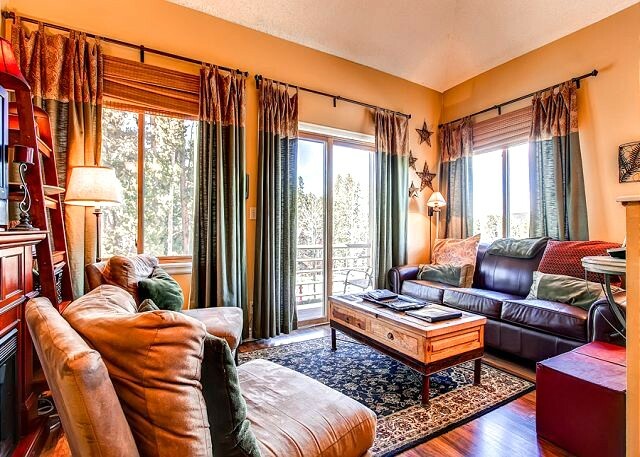 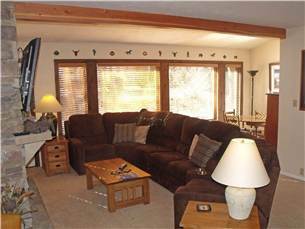 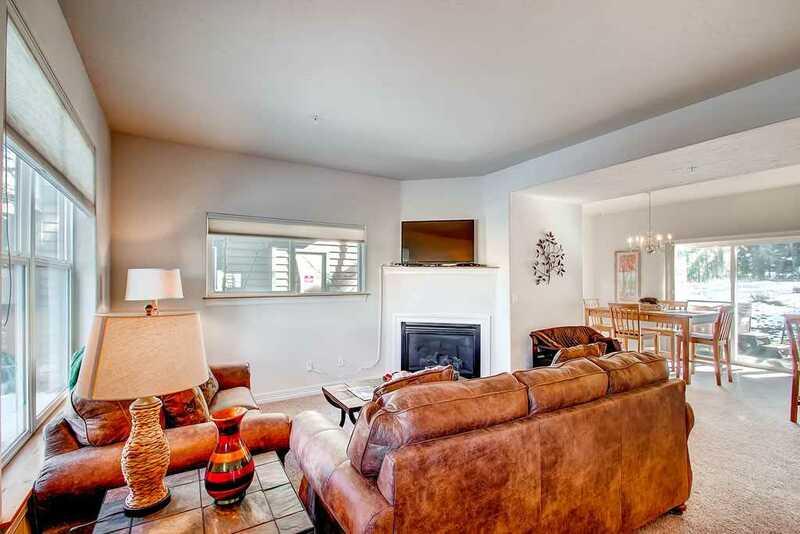 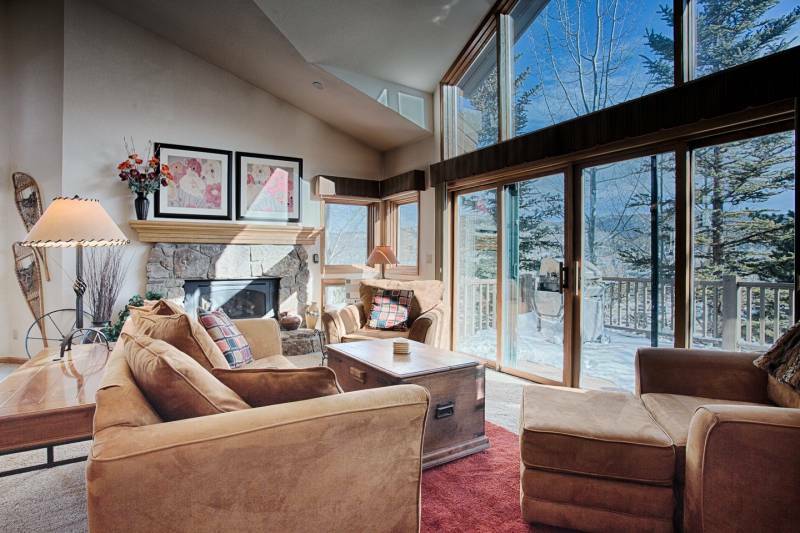 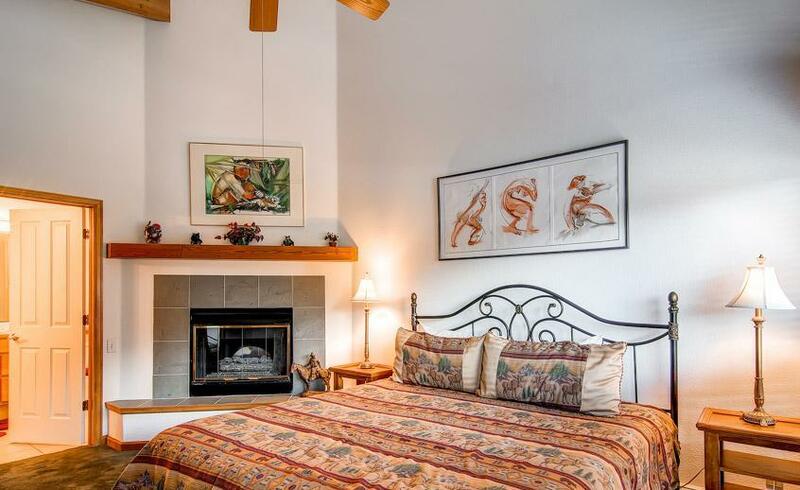 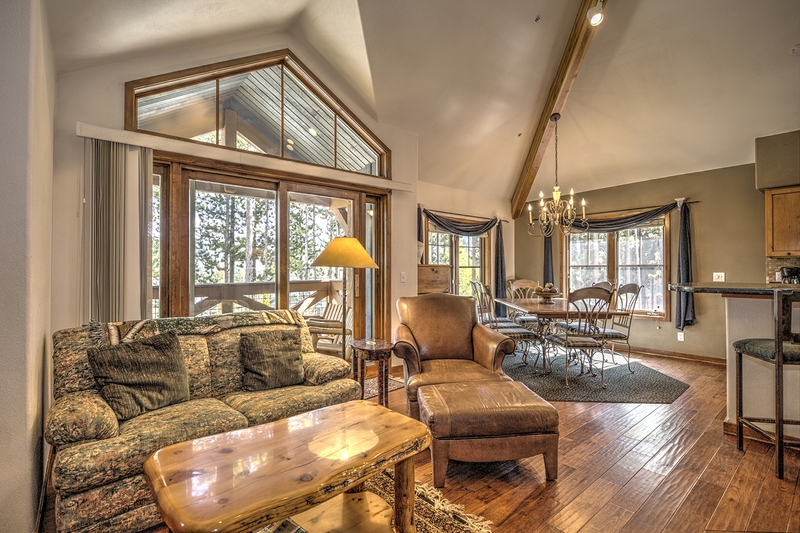 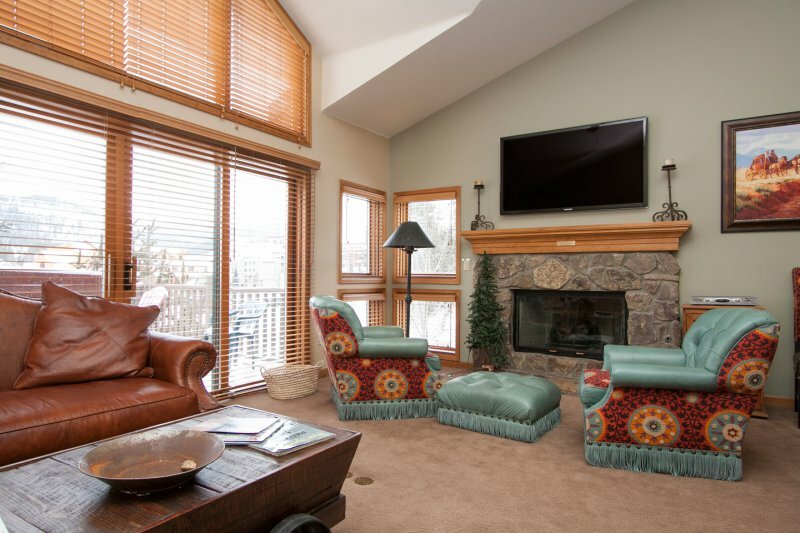 Relax, take in the lake and mountain views, and enjoy the high-end furnishings and finishing touches. 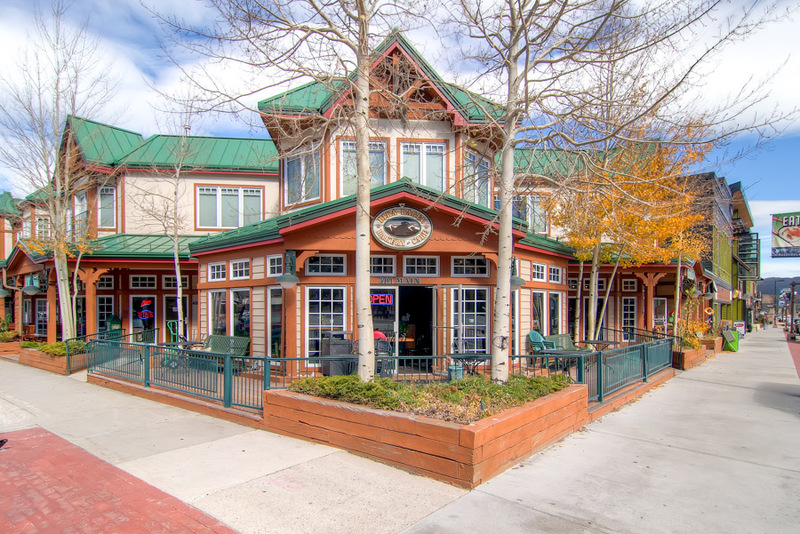 Stroll to the marina or head downtown for dinner. 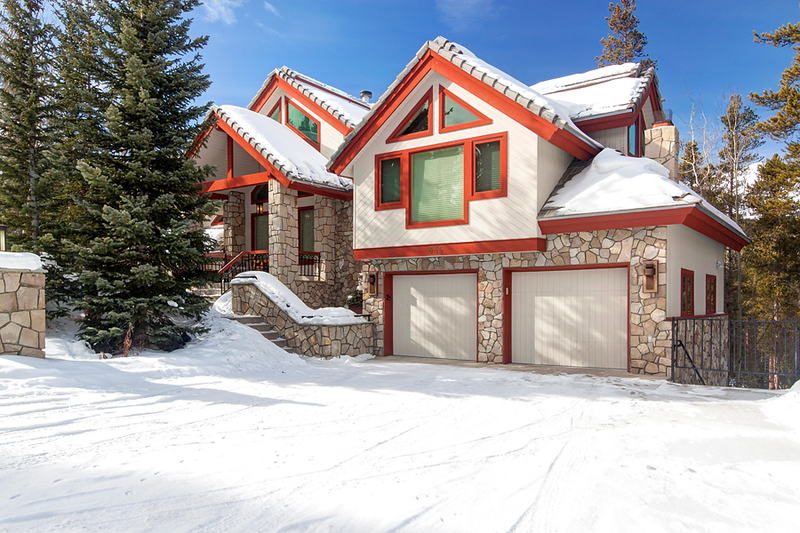 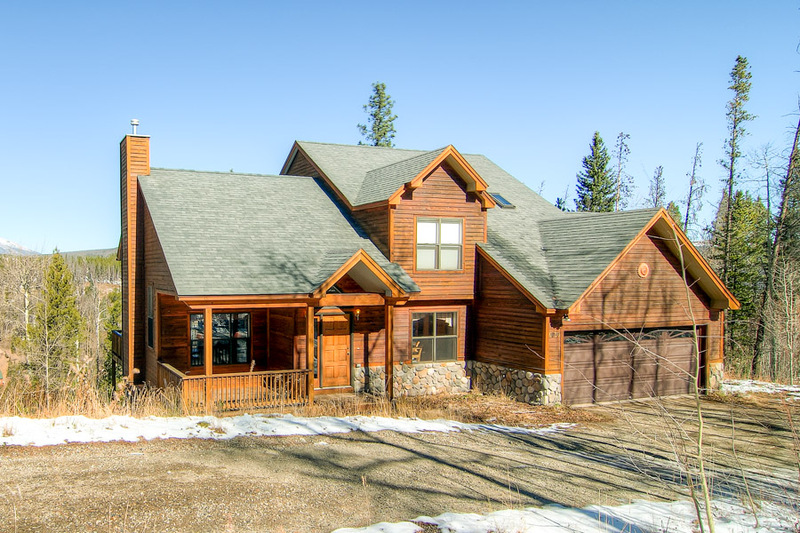 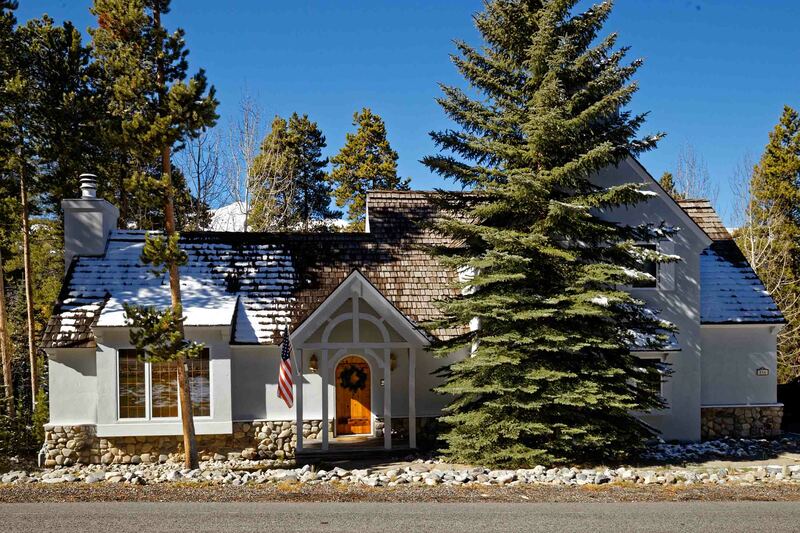 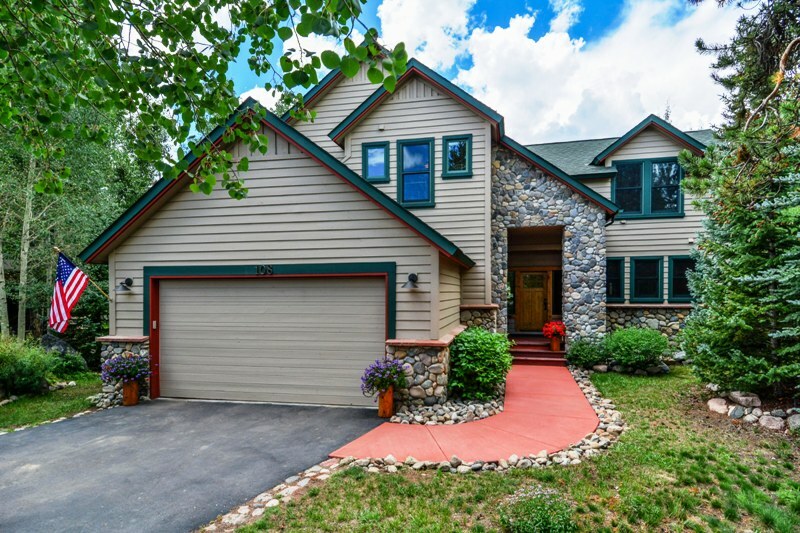 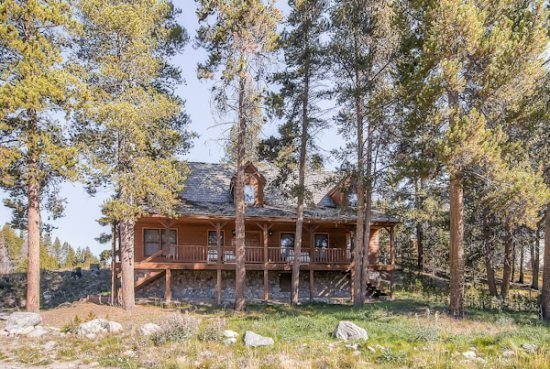 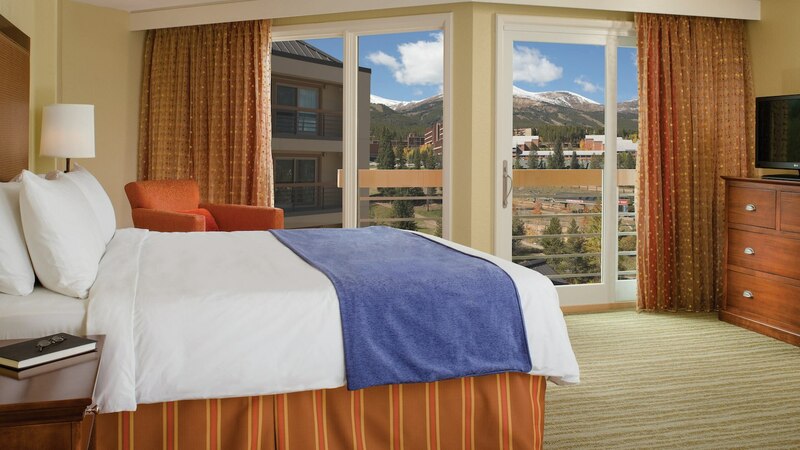 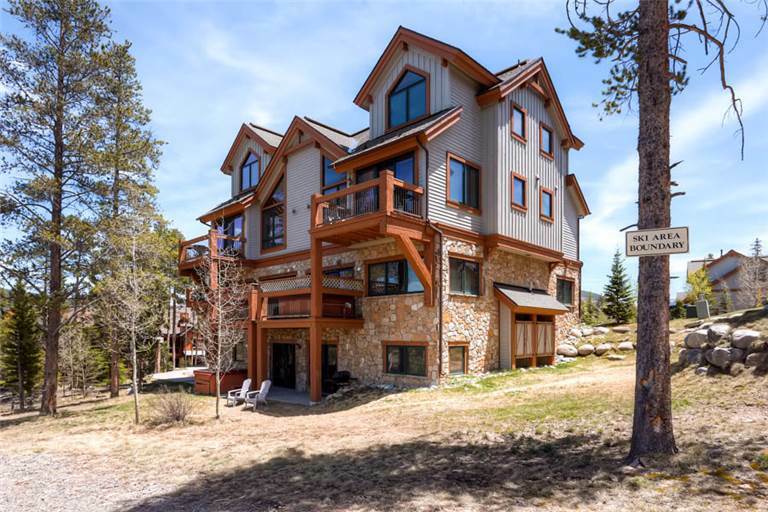 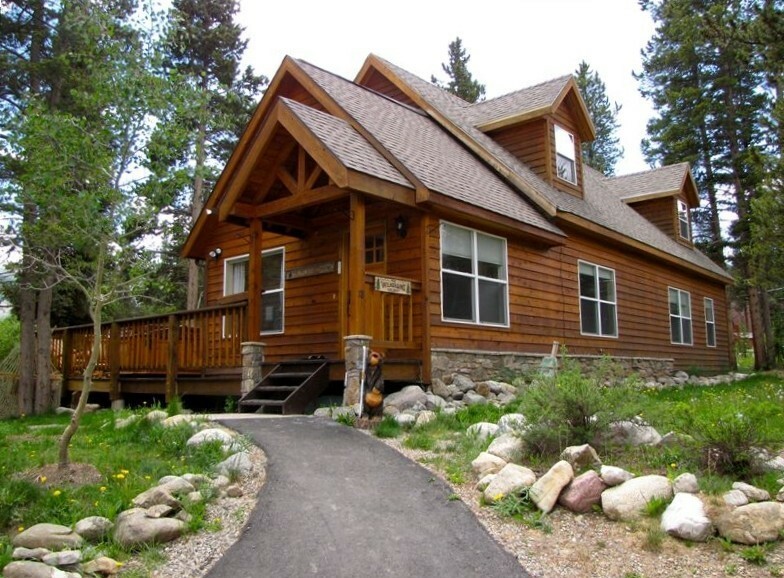 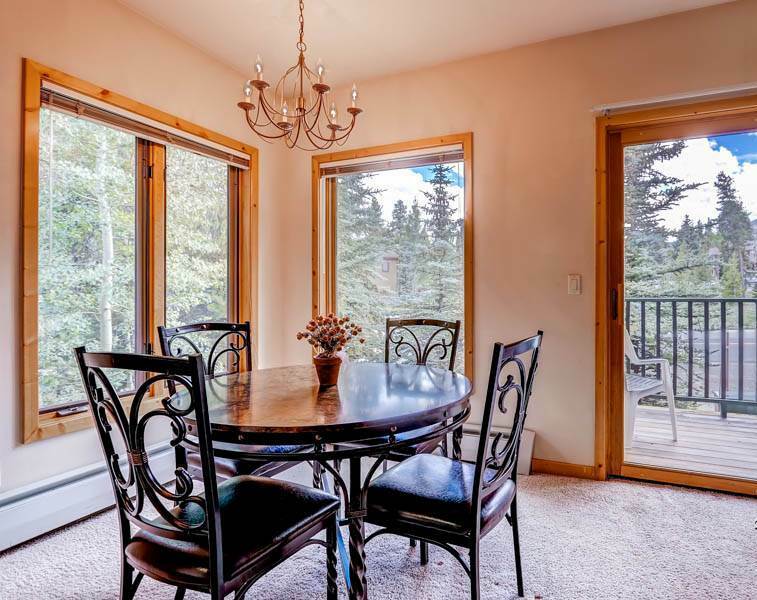 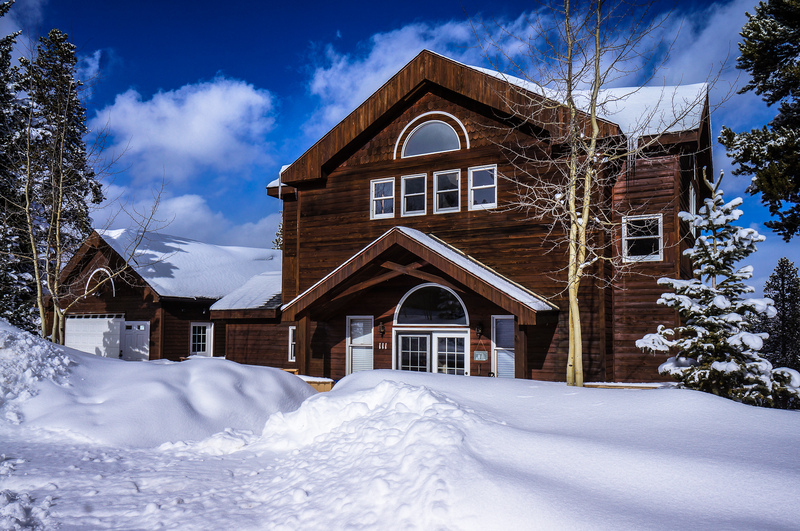 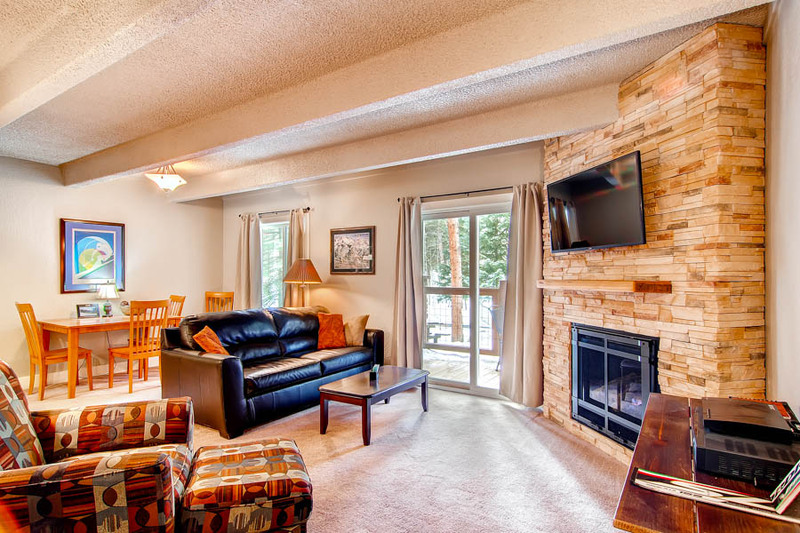 And in the winter, you’re just a quick drive or free bus trip (5-minute walk to bus stop) to Copper Mountain, Breckenridge, Keystone and Arapahoe Basin. 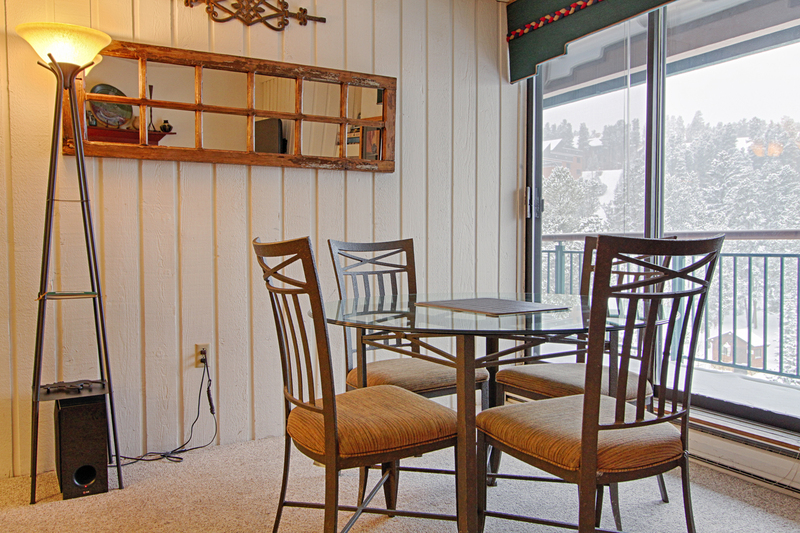 Boulevard Bend 2 is a premium condo that’s perfect for up to eight guests. 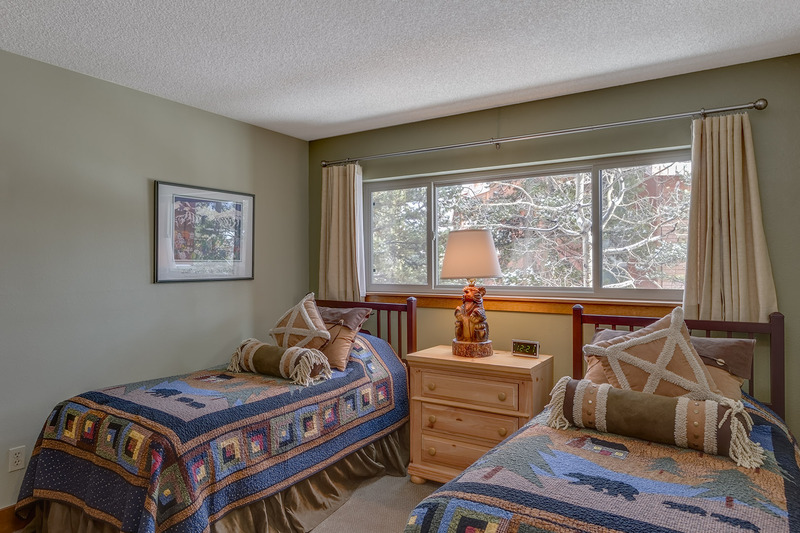 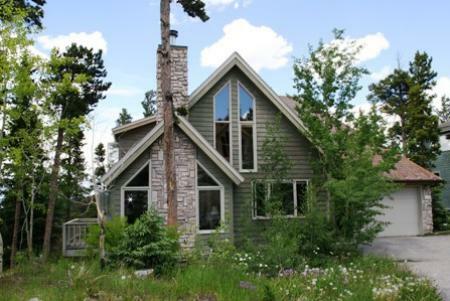 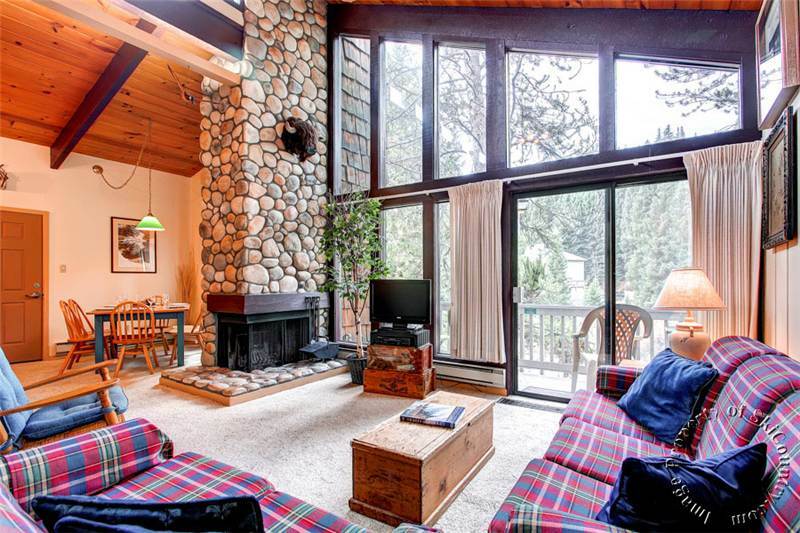 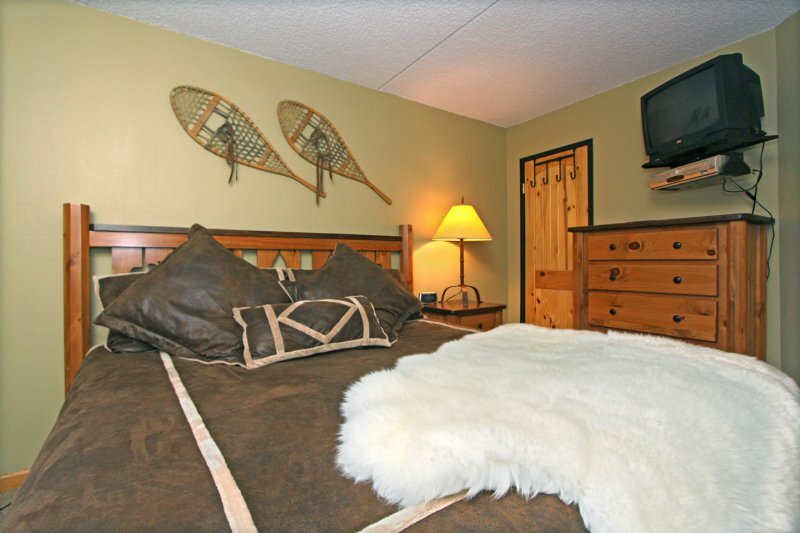 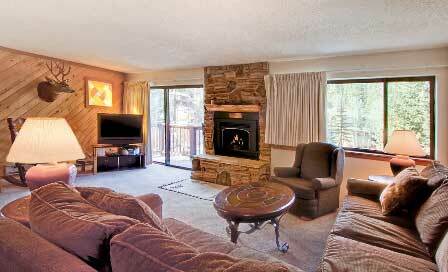 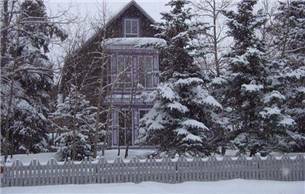 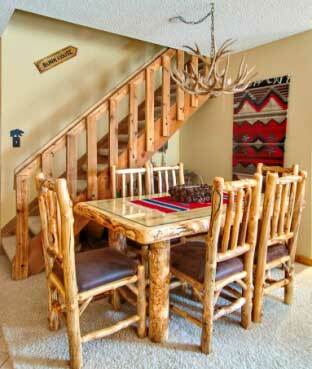 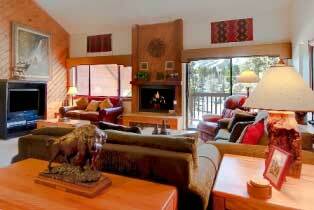 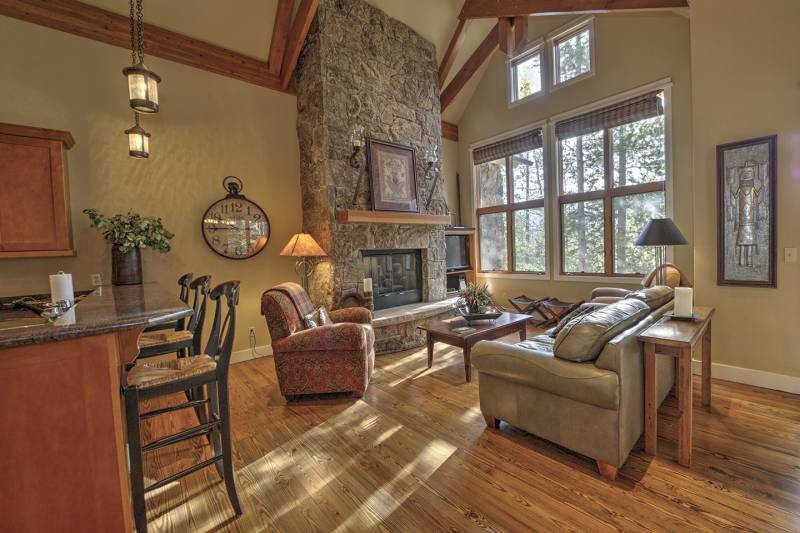 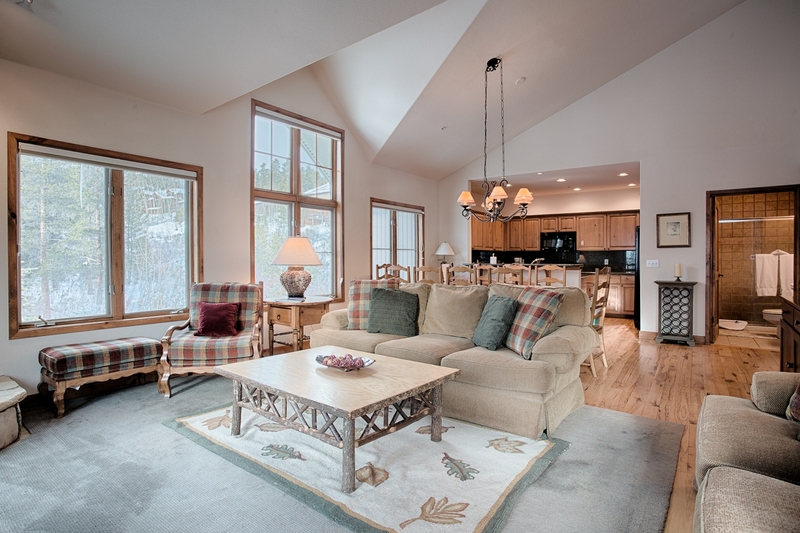 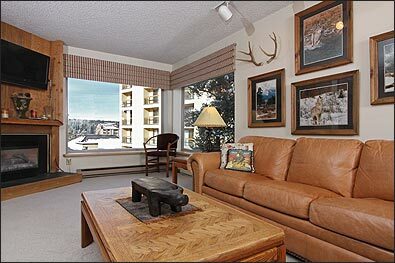 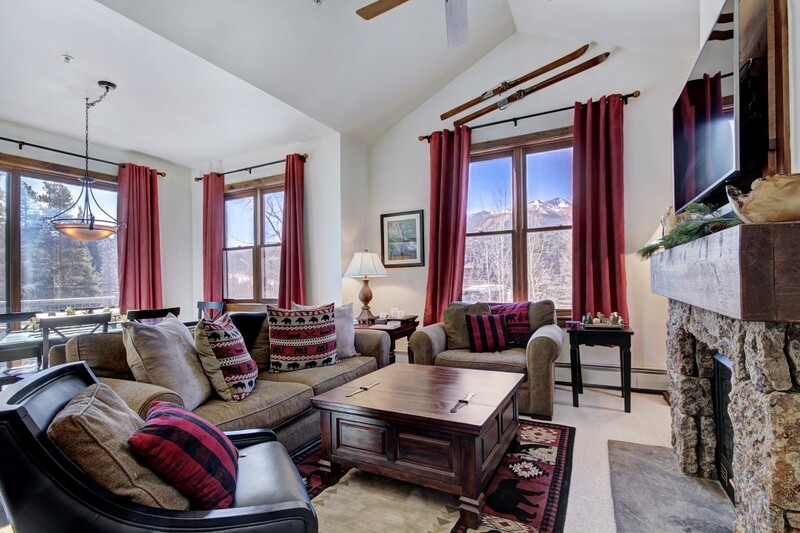 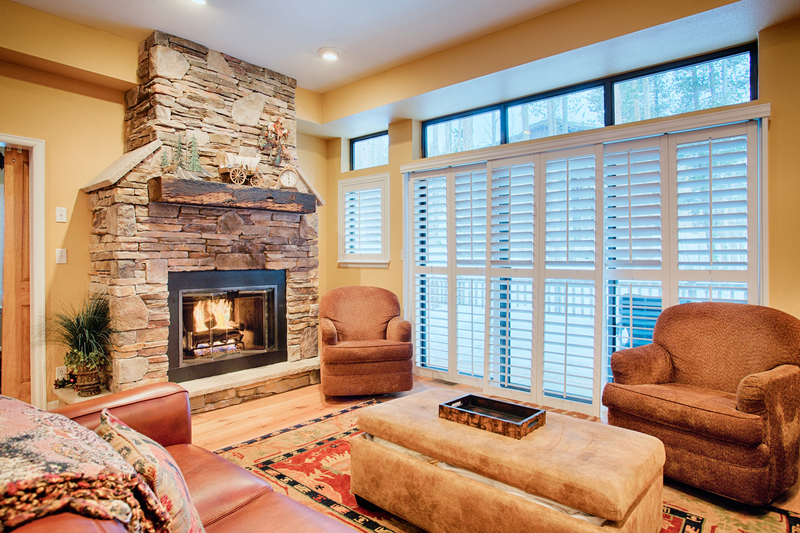 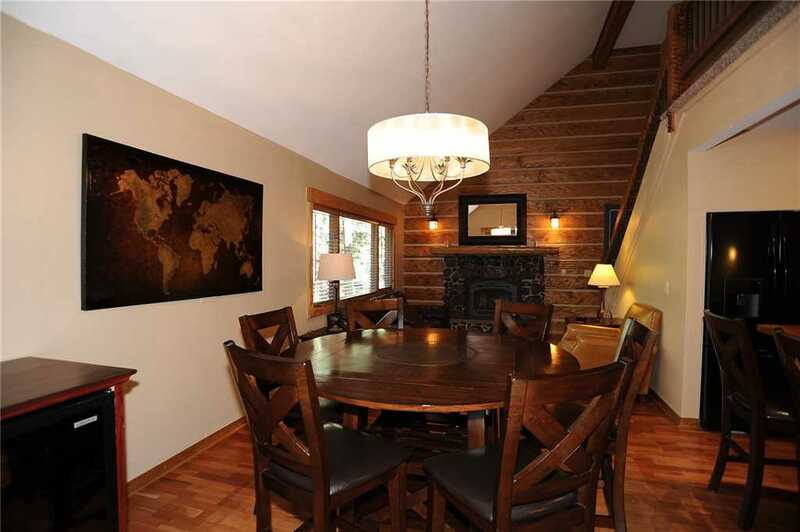 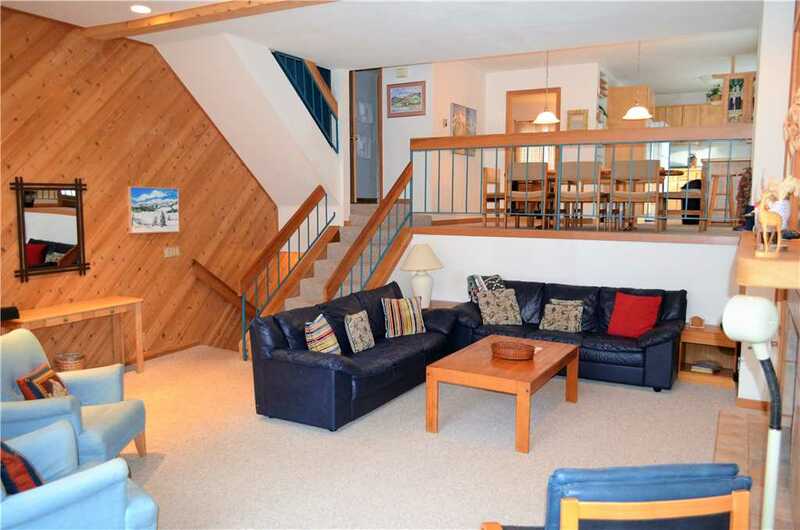 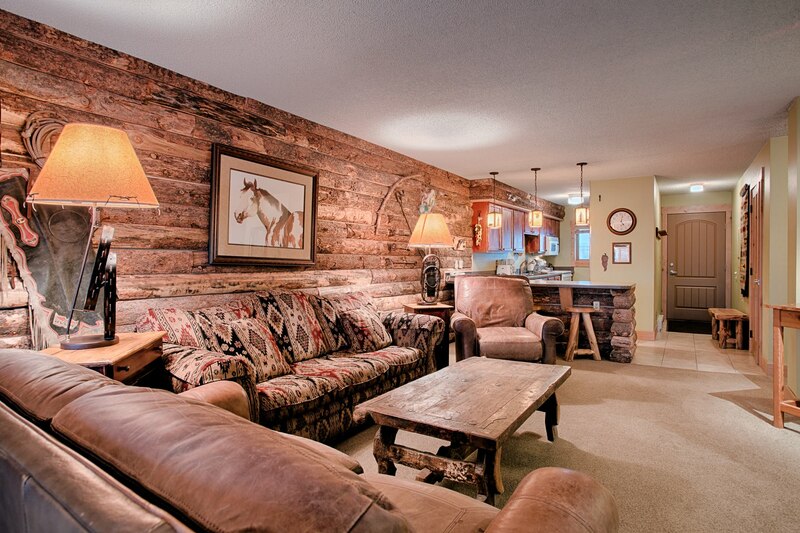 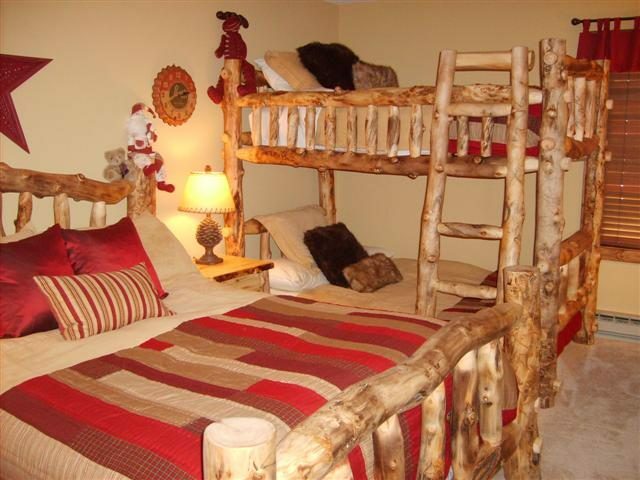 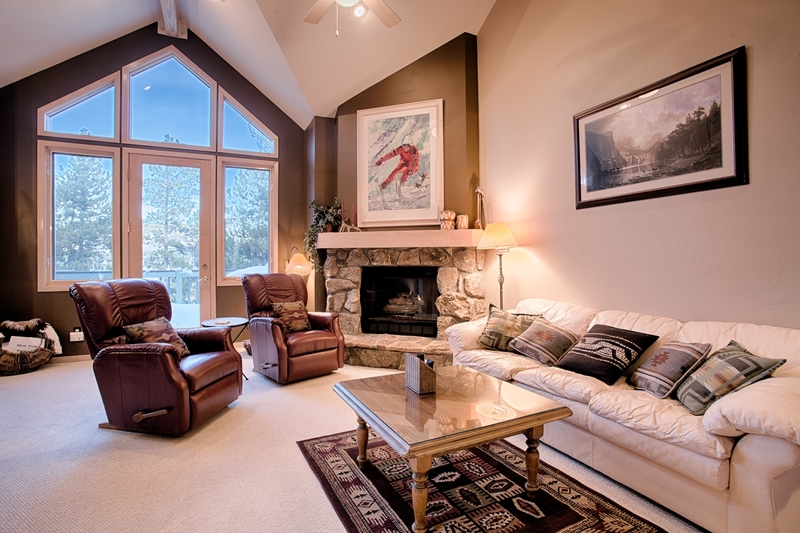 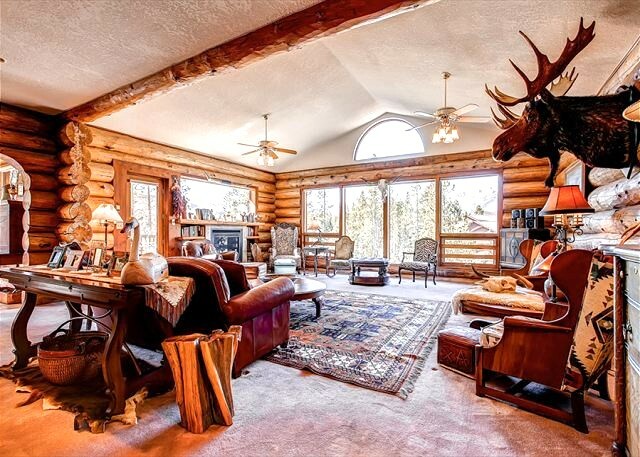 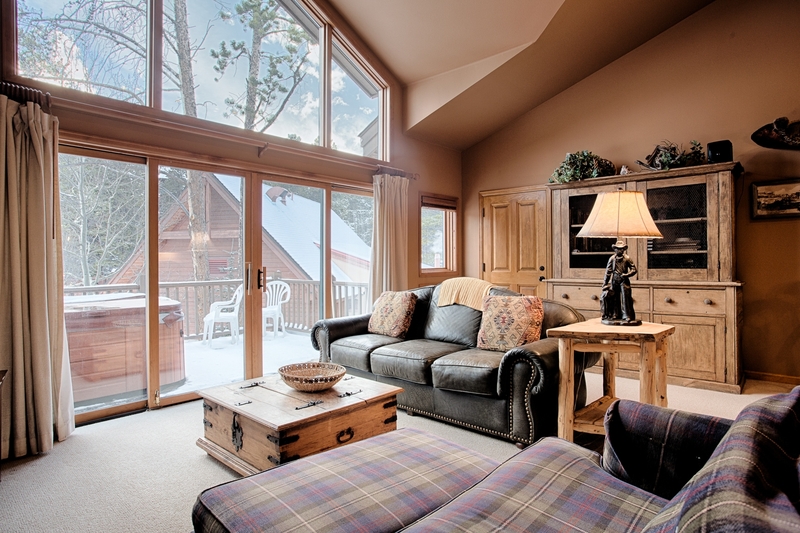 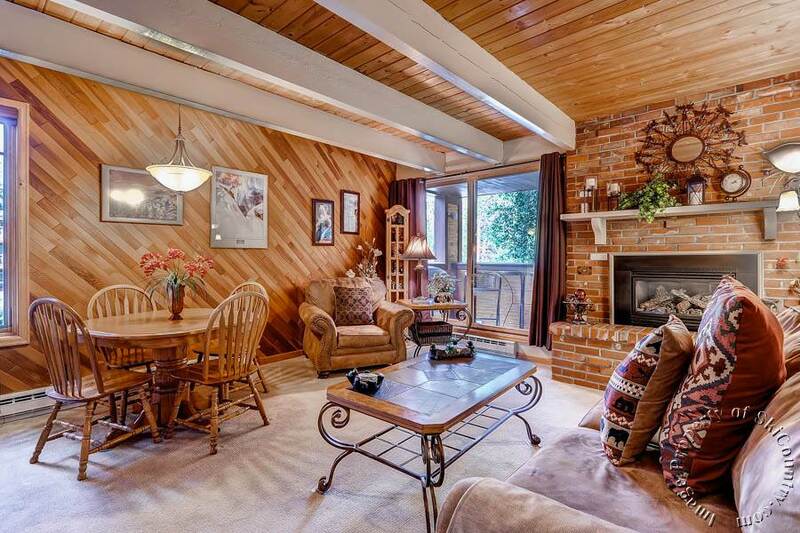 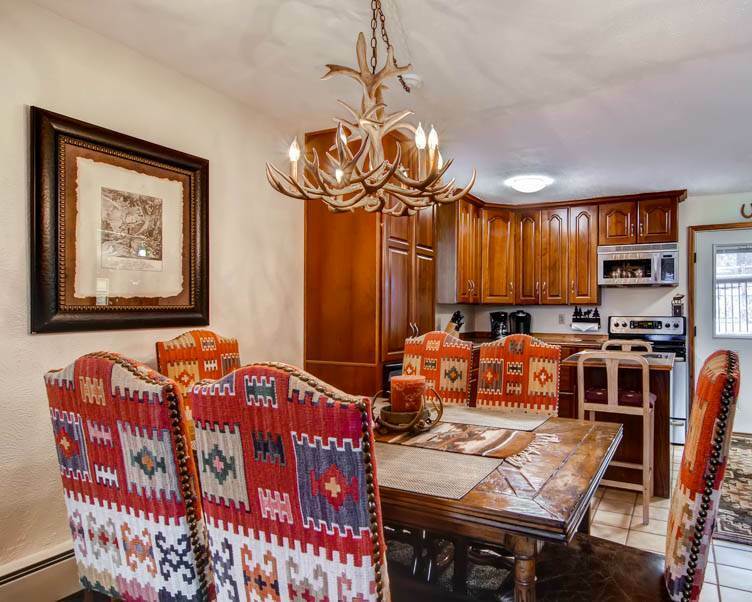 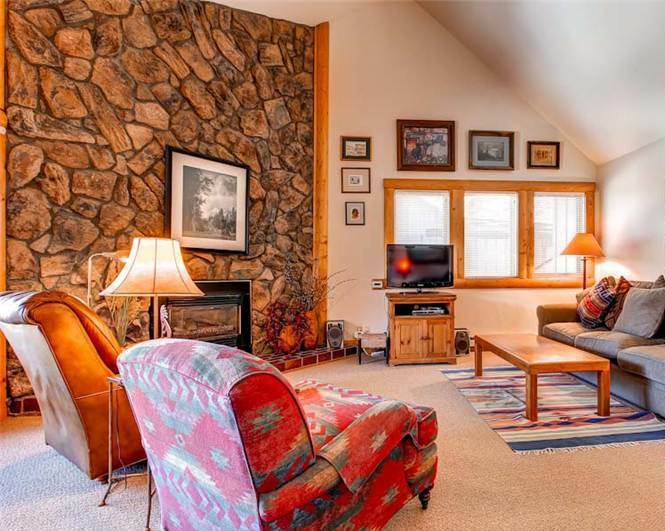 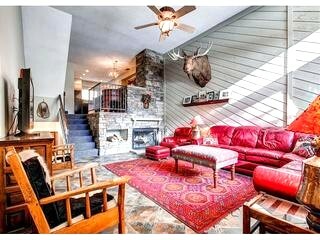 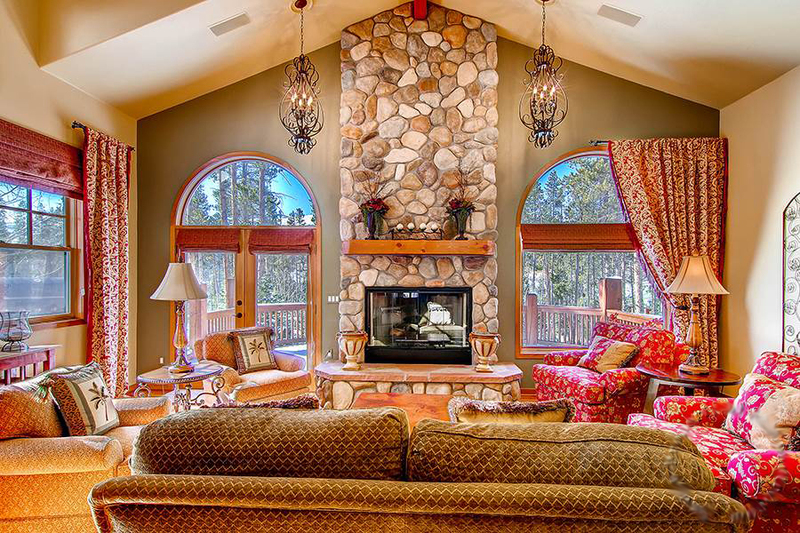 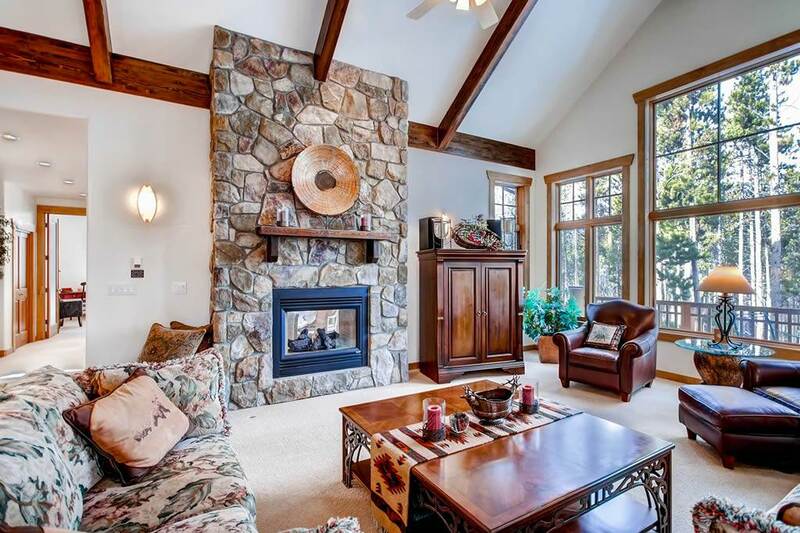 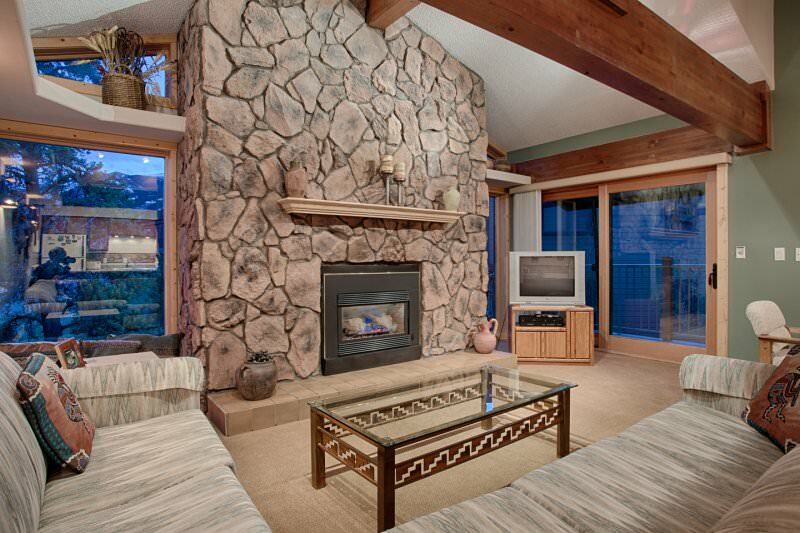 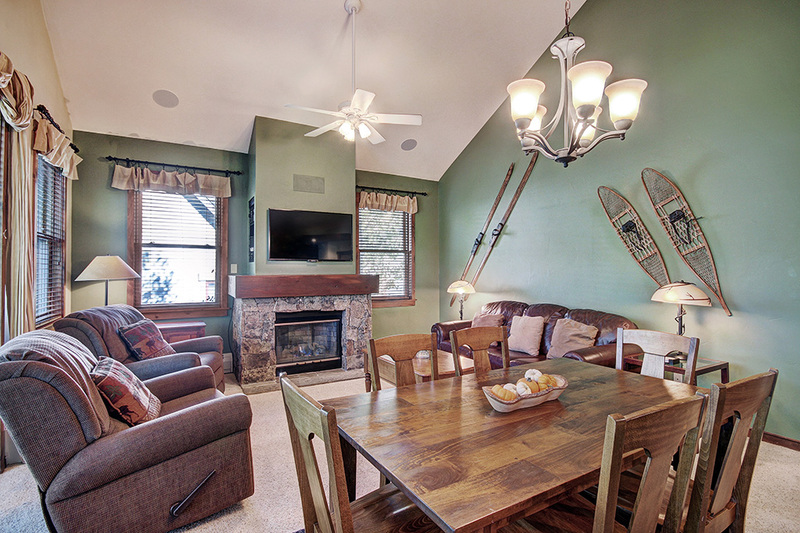 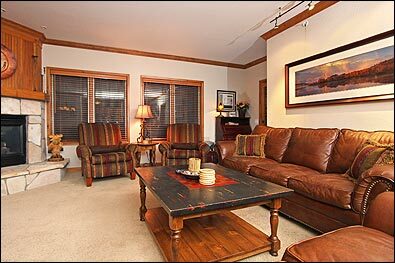 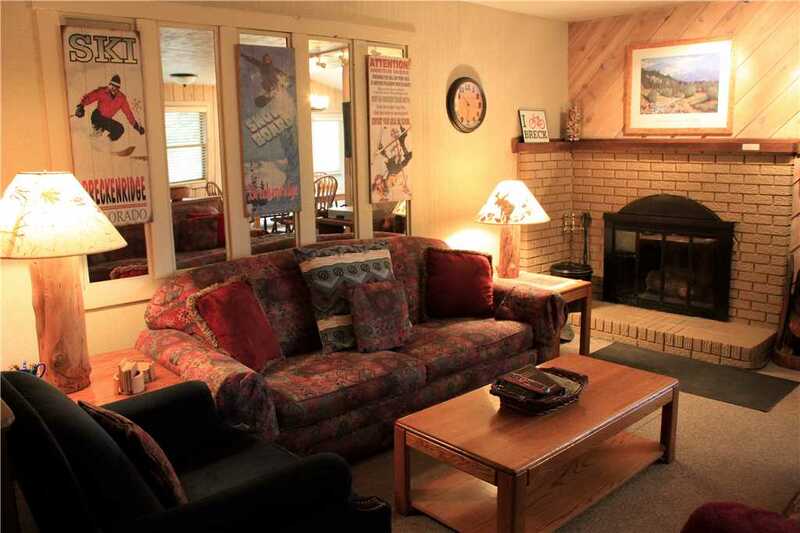 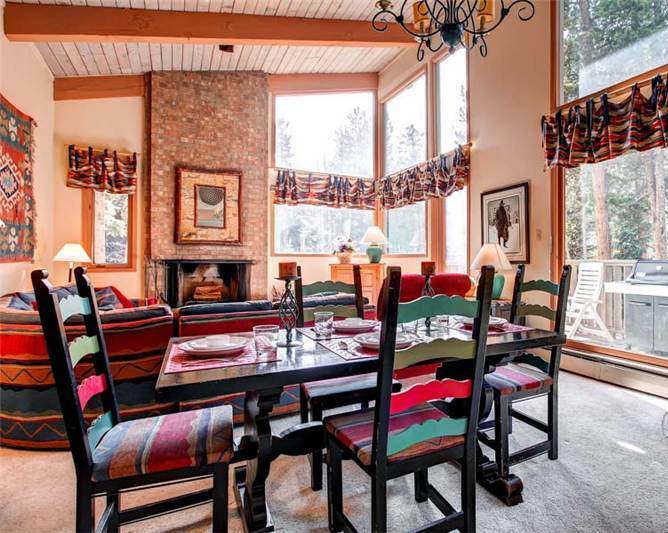 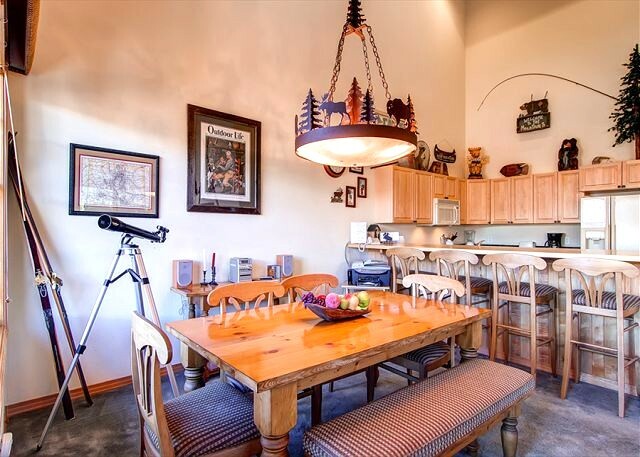 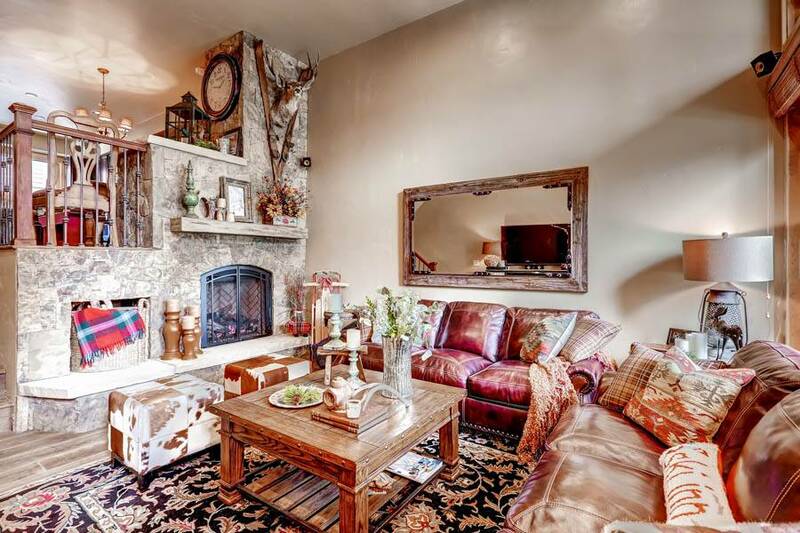 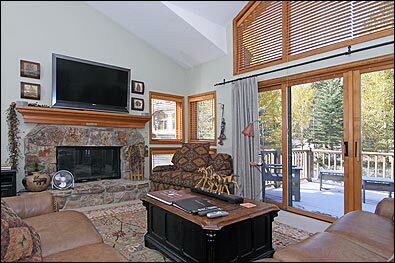 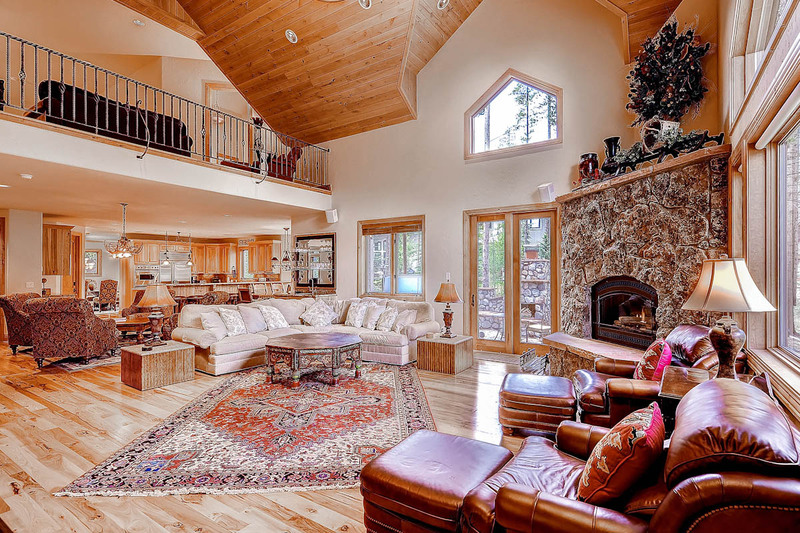 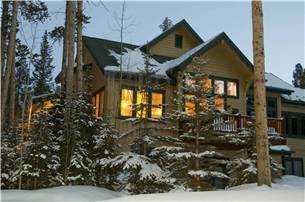 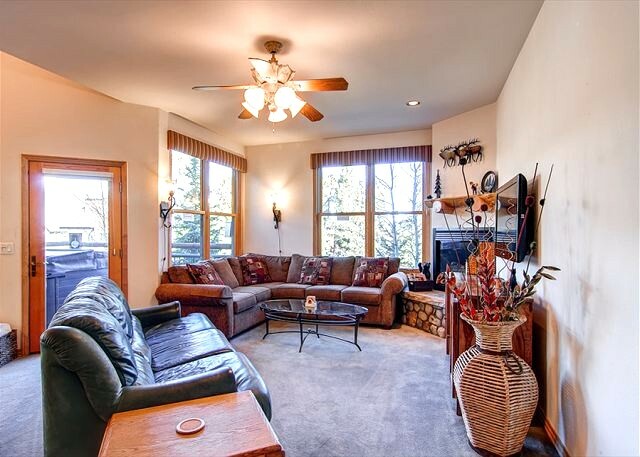 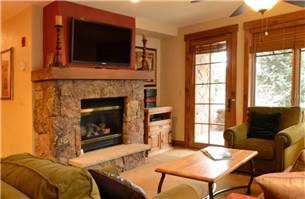 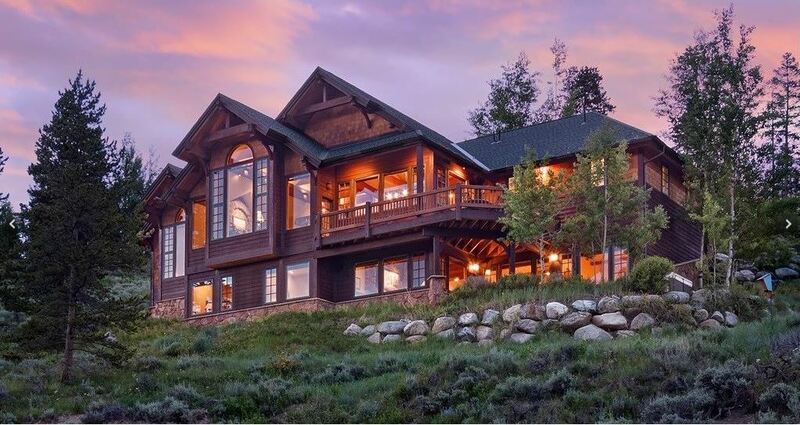 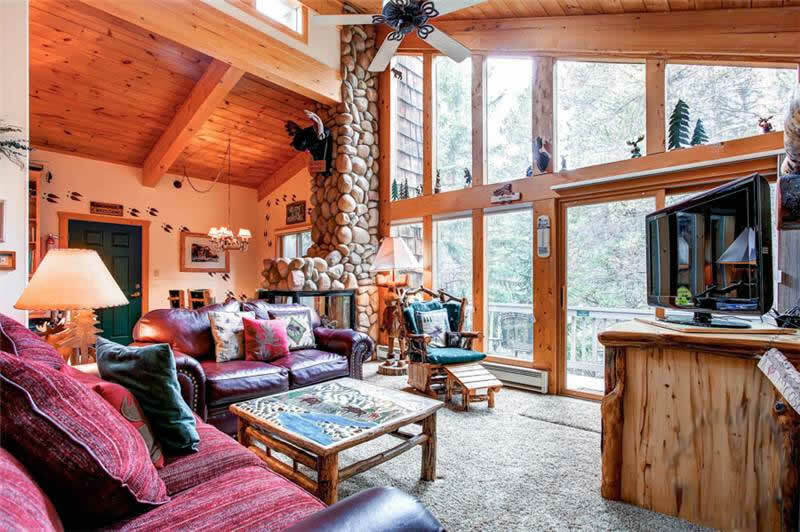 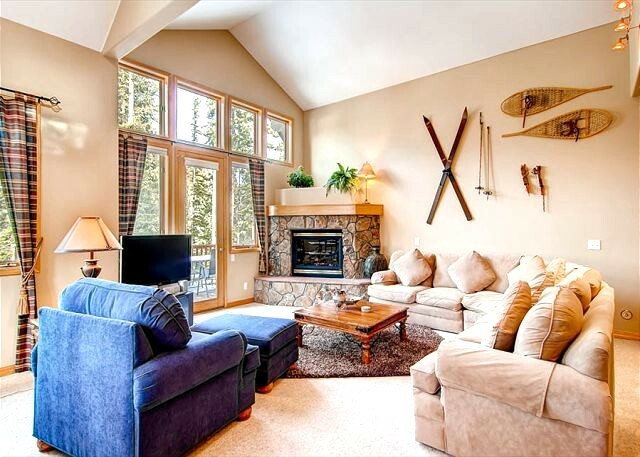 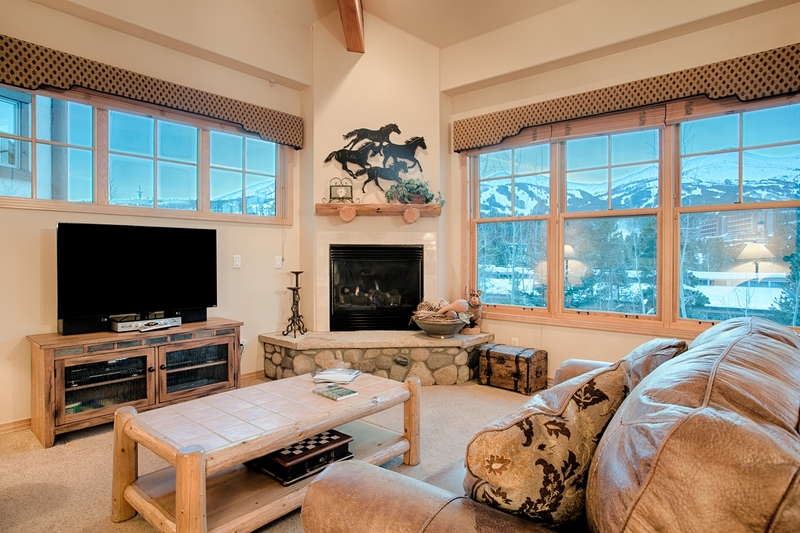 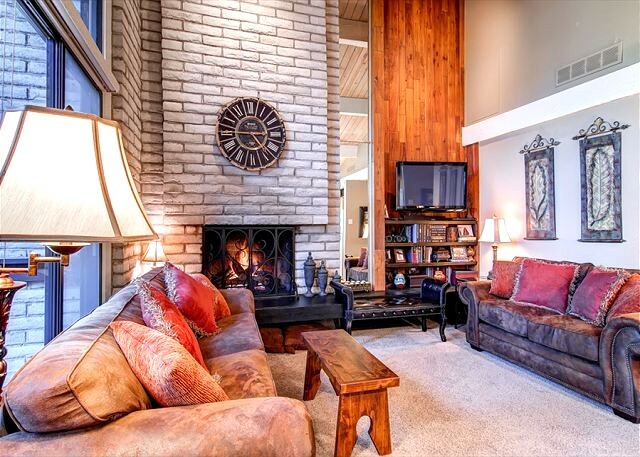 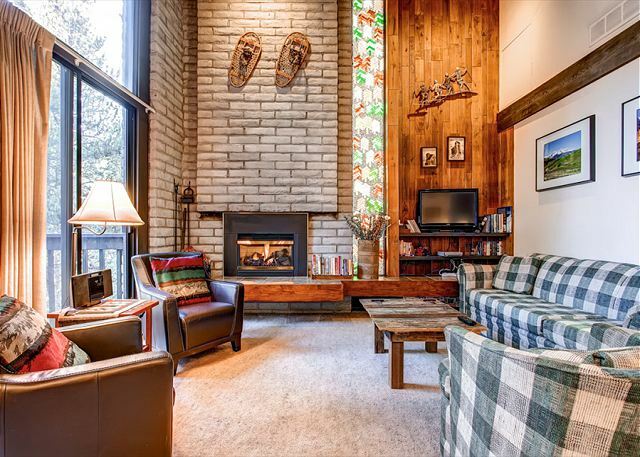 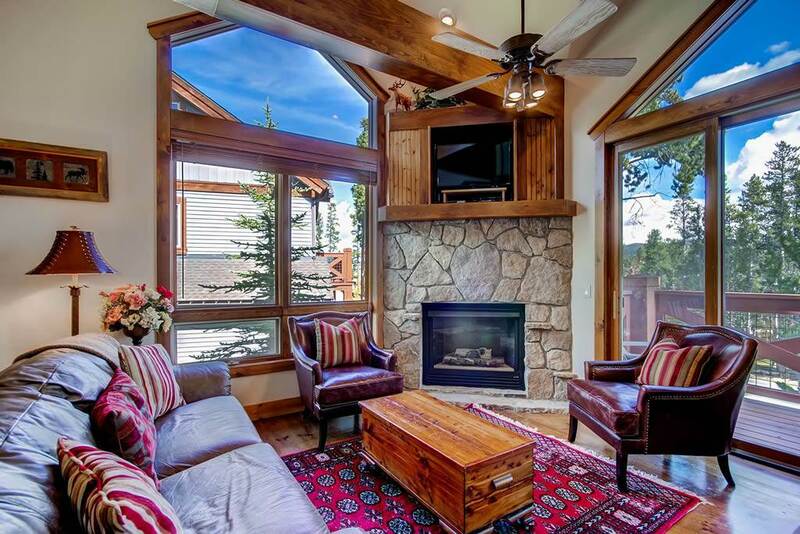 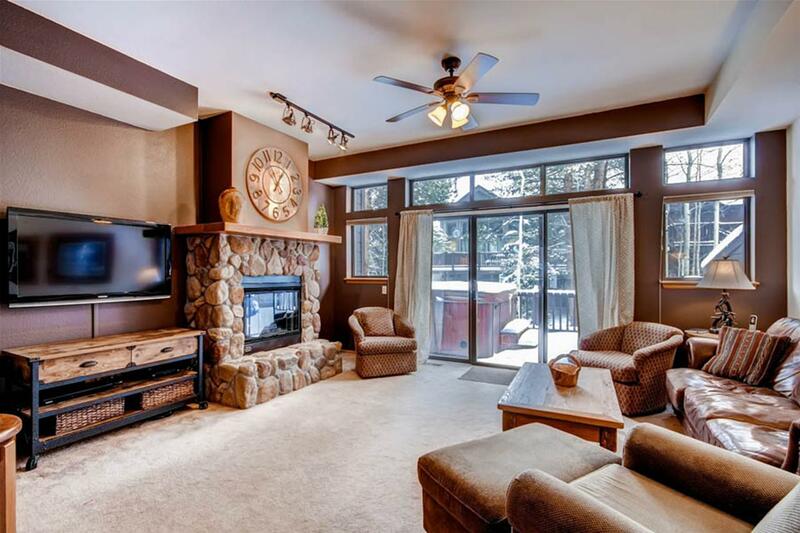 Designed for discriminating tastes but maintaining a comfortable feel, it’s “mountain chic” at its best. 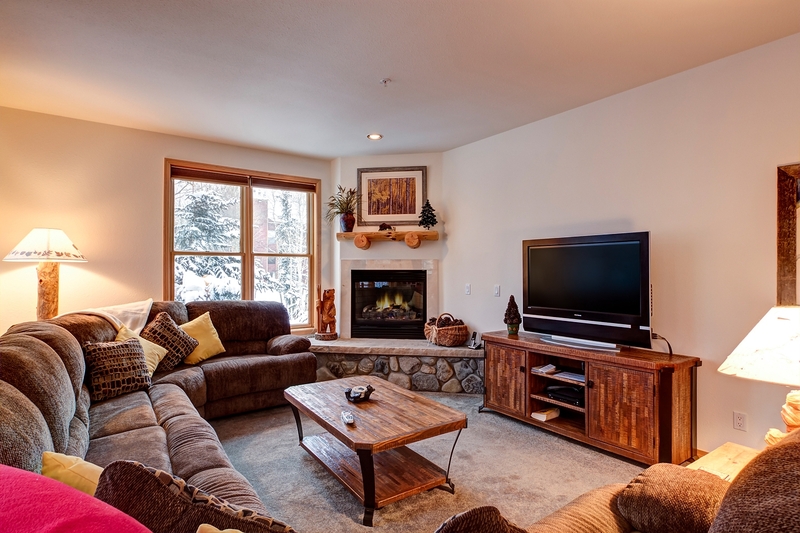 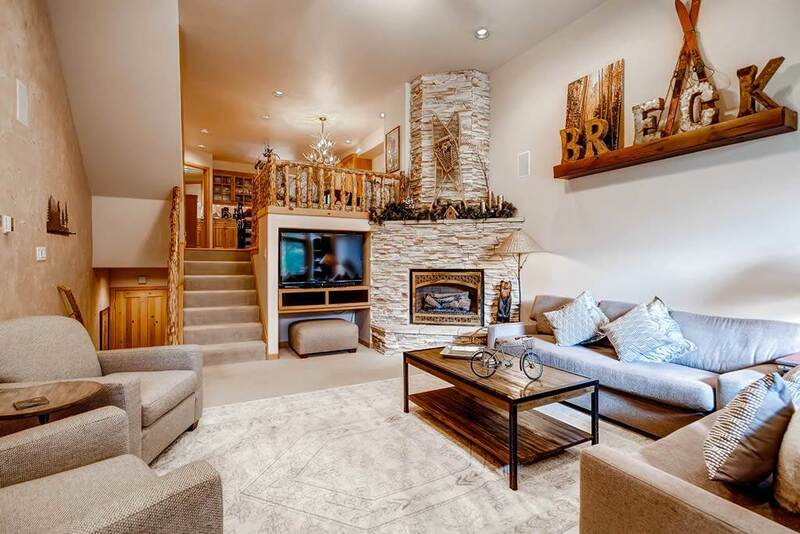 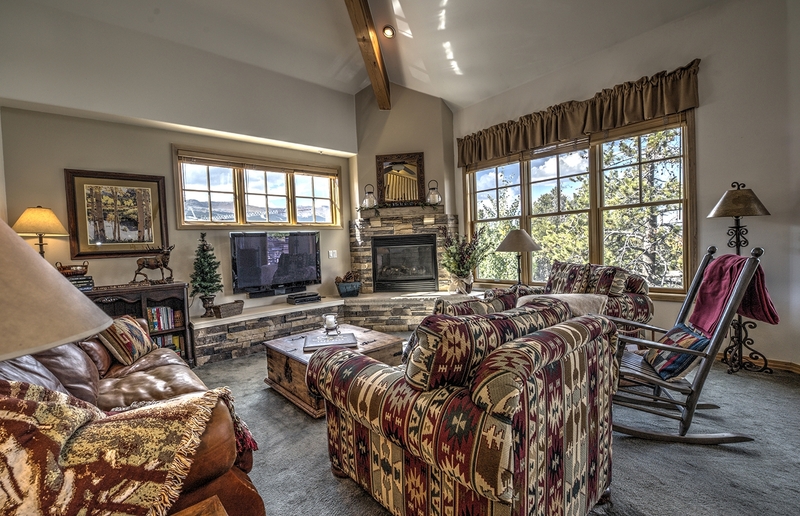 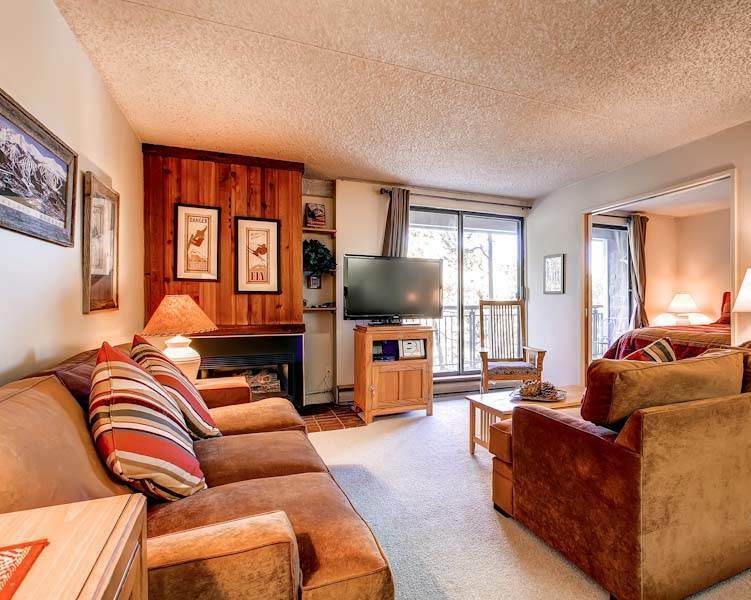 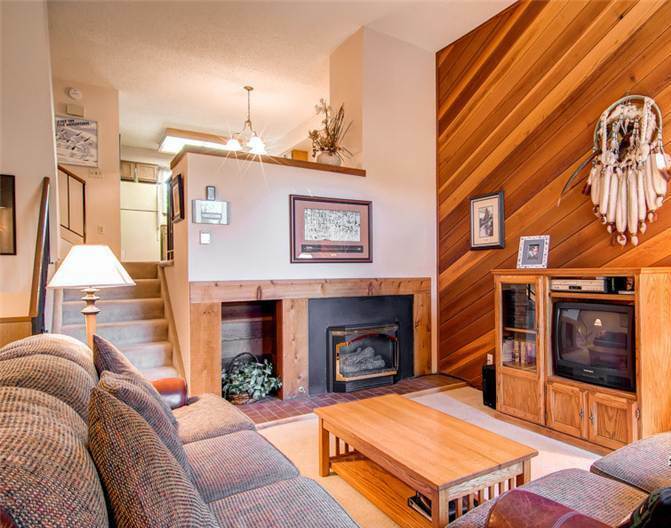 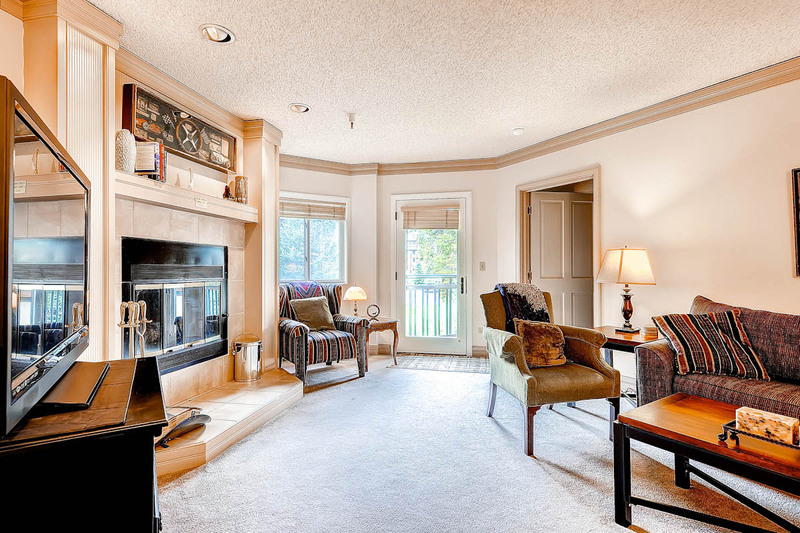 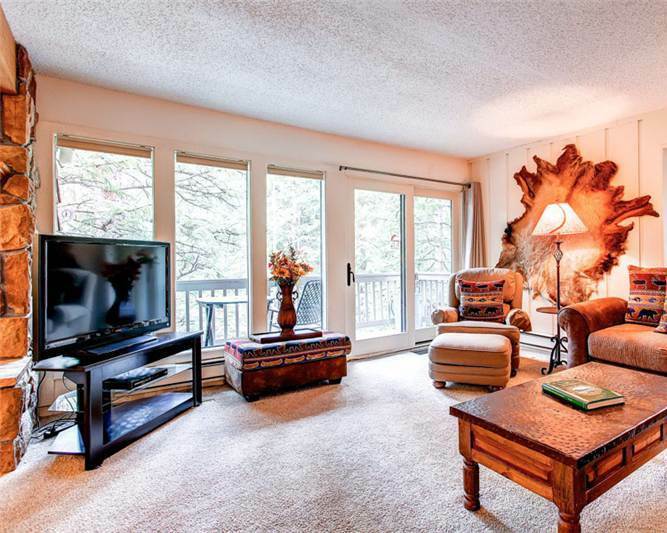 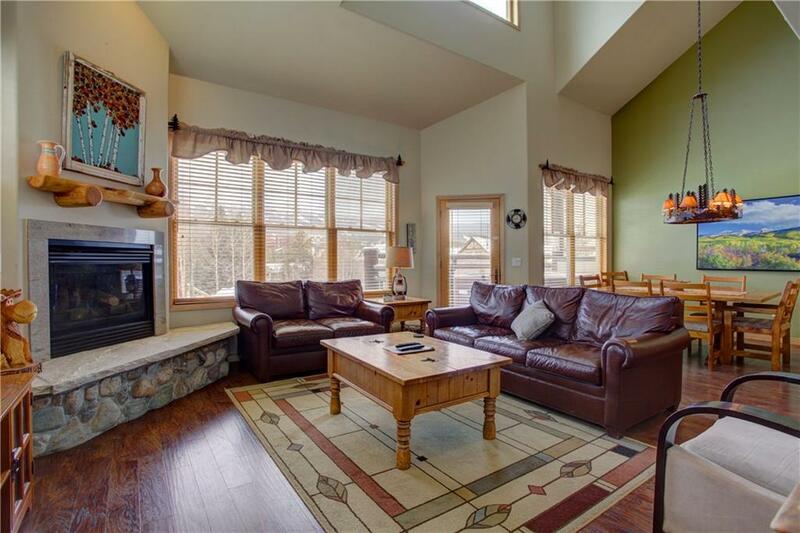 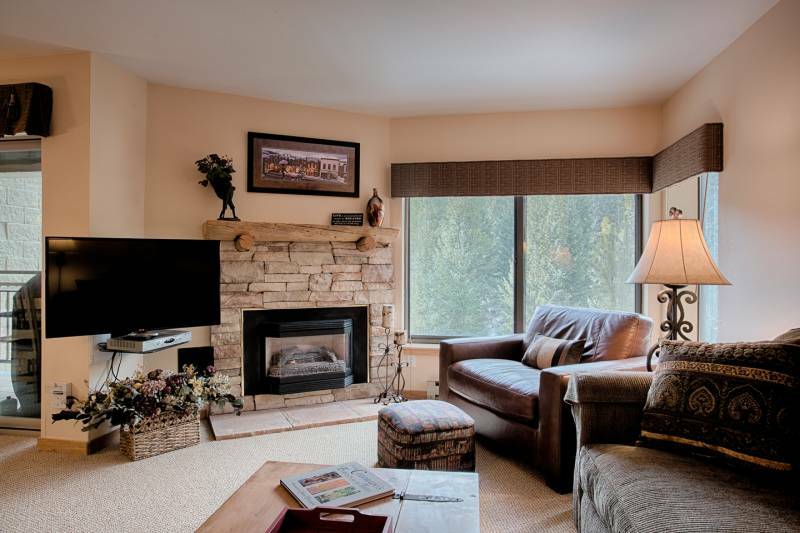 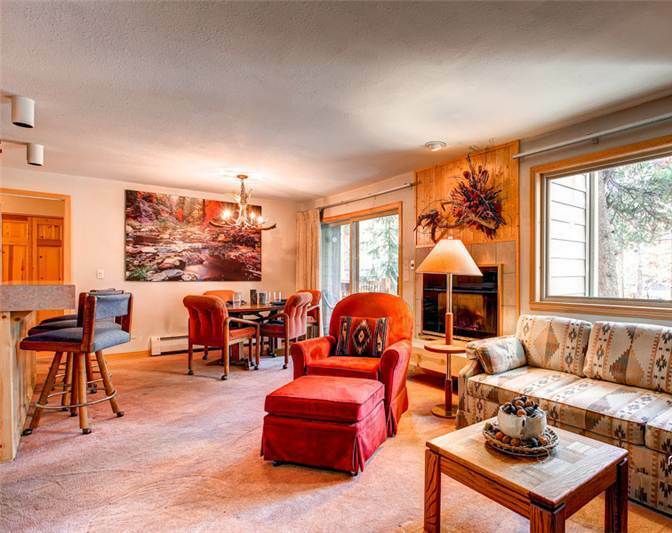 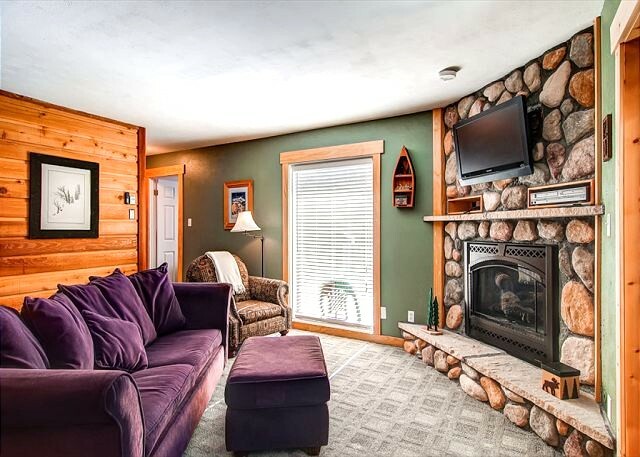 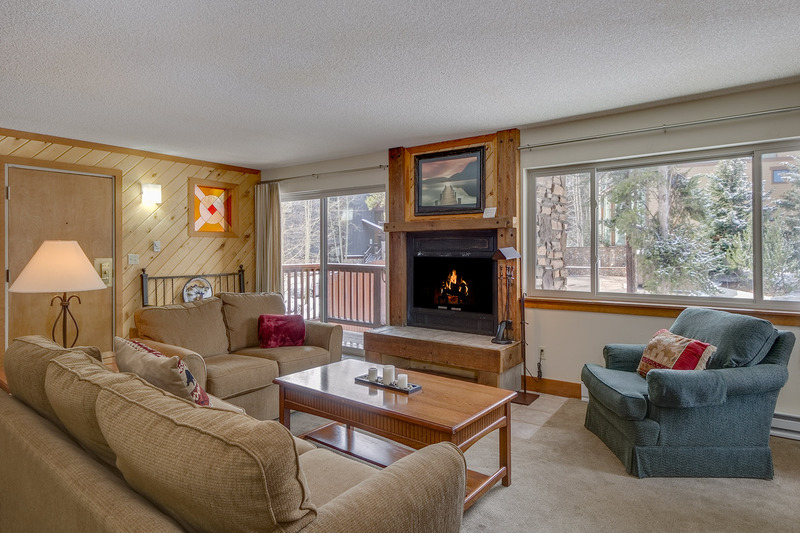 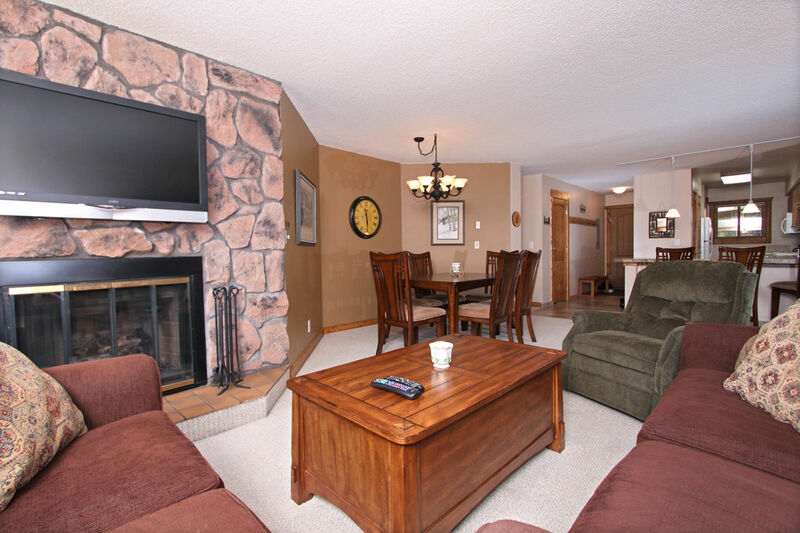 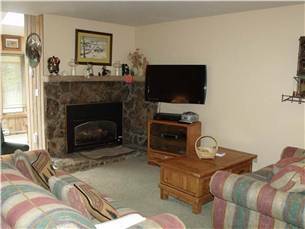 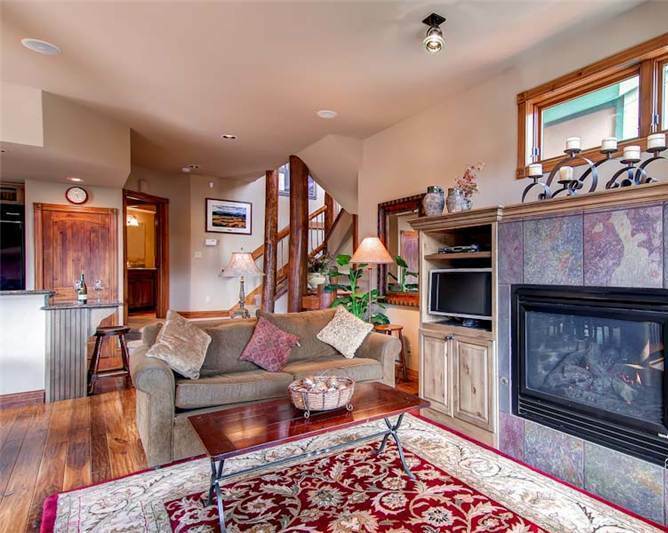 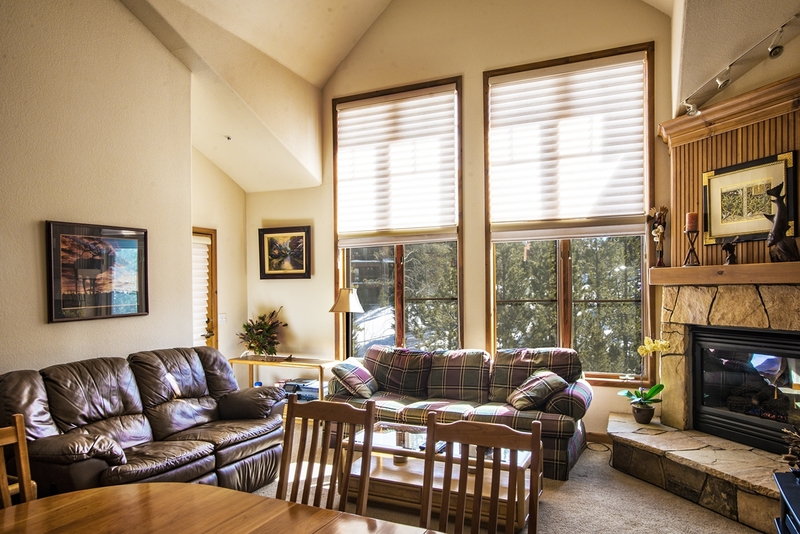 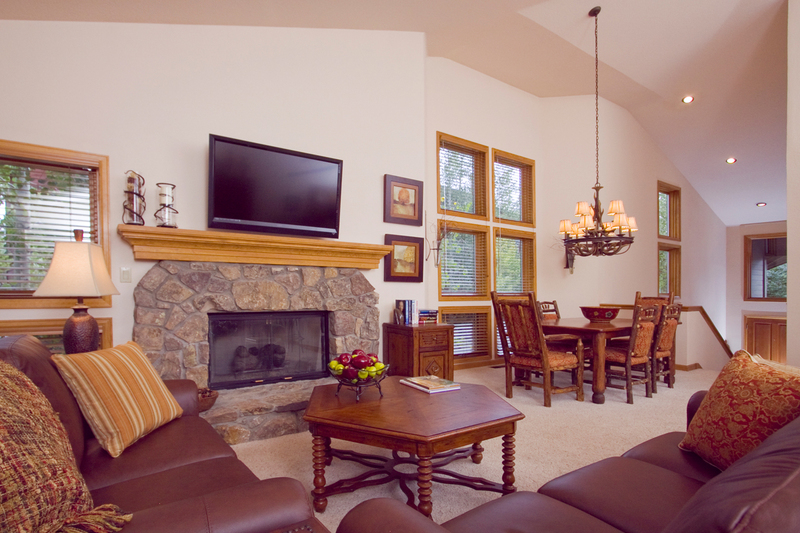 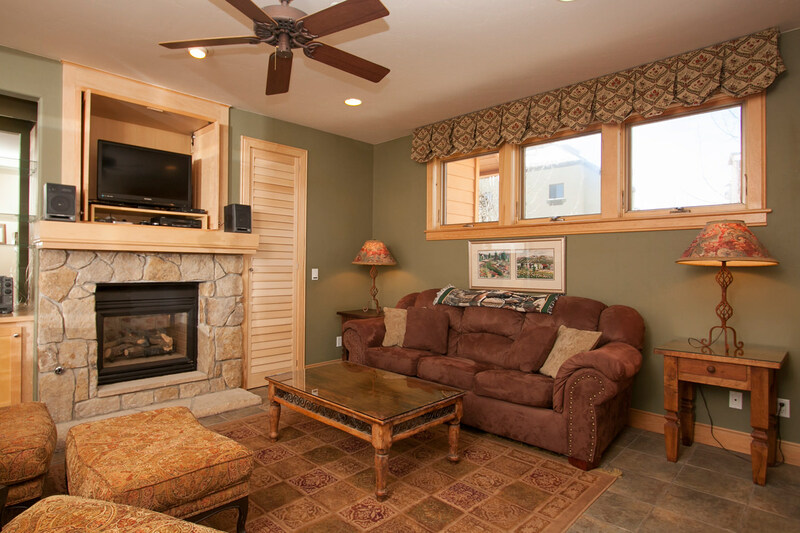 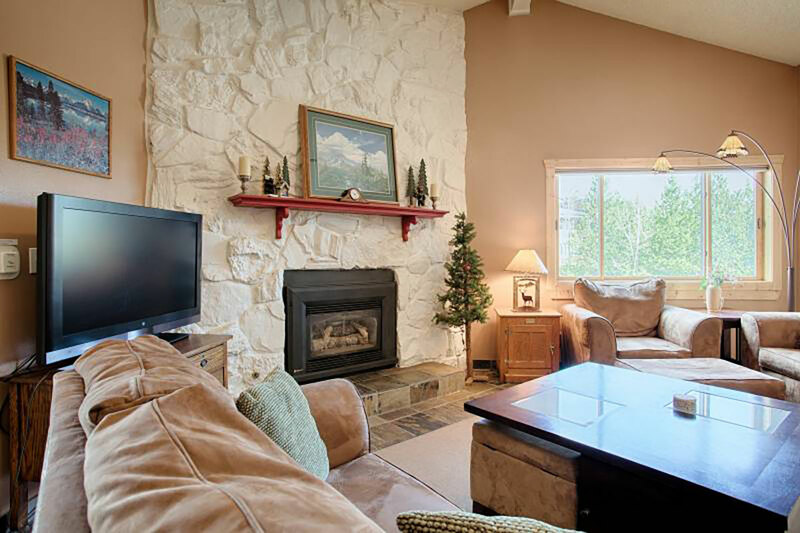 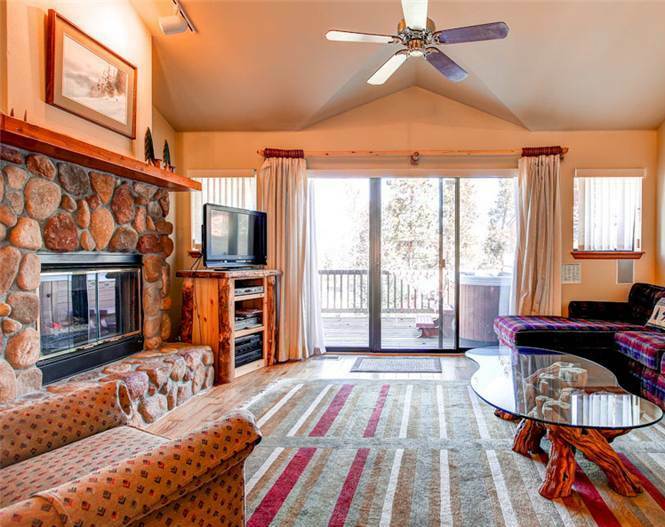 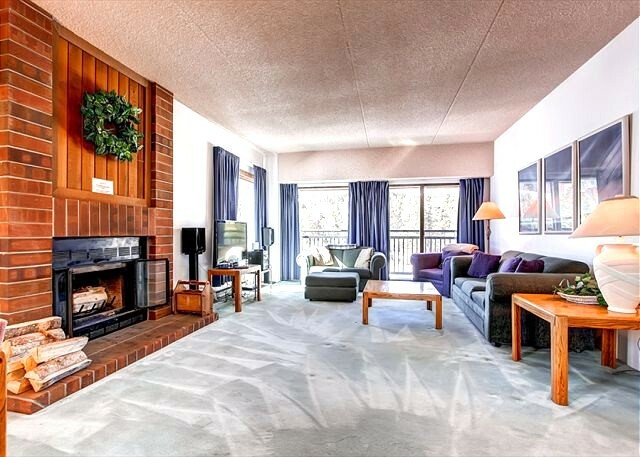 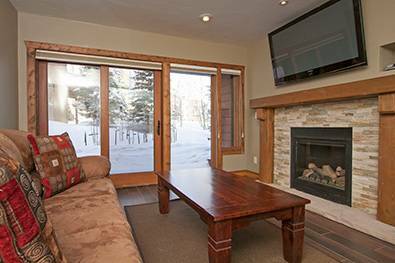 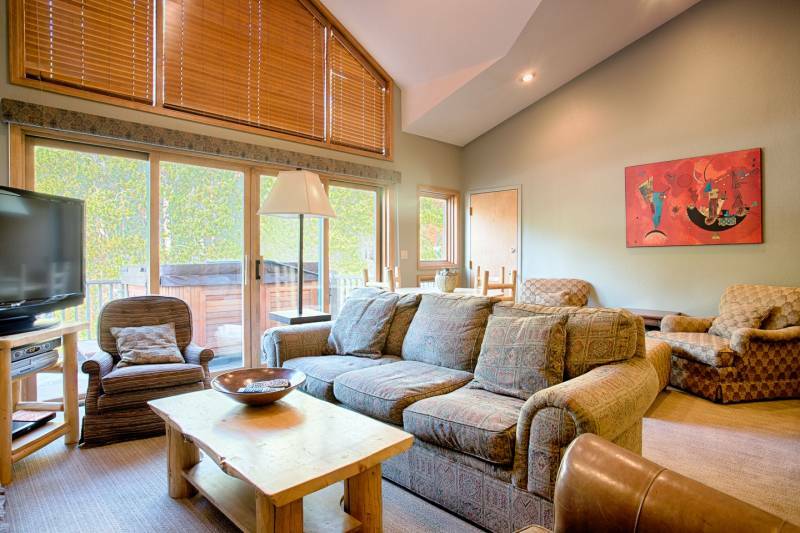 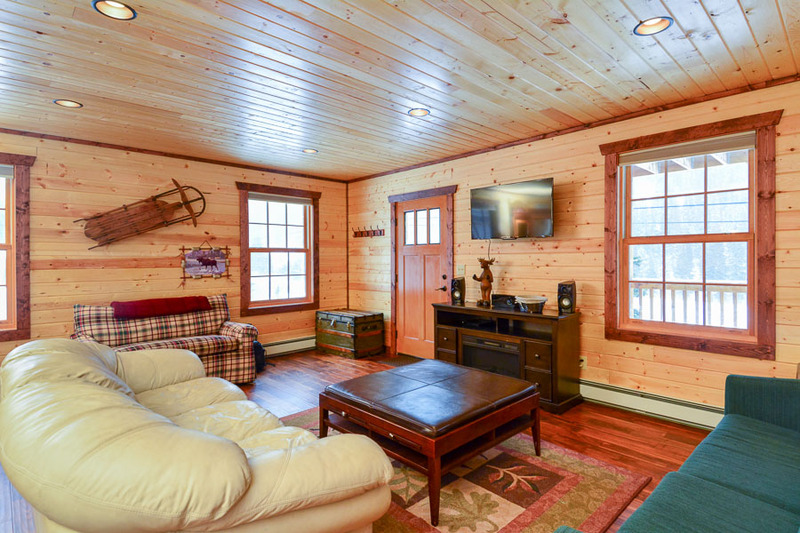 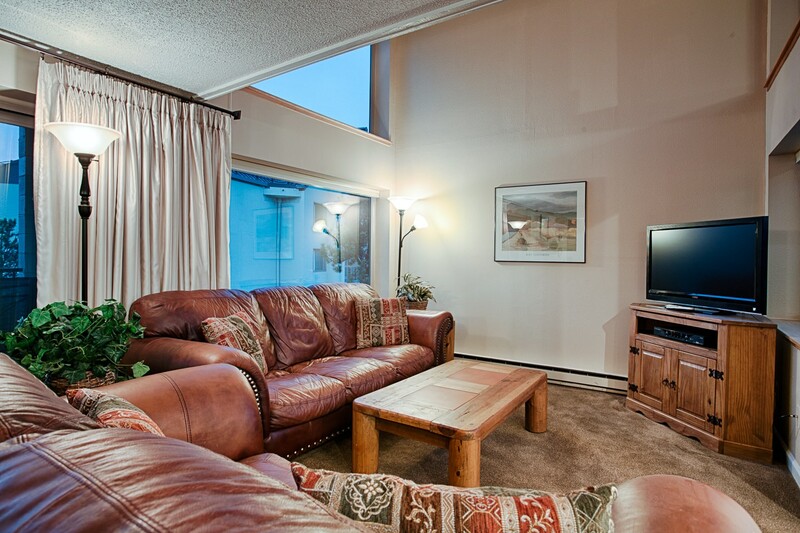 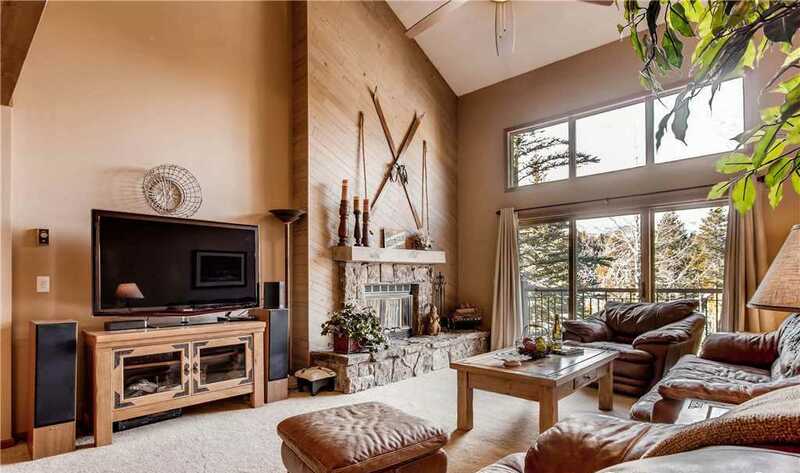 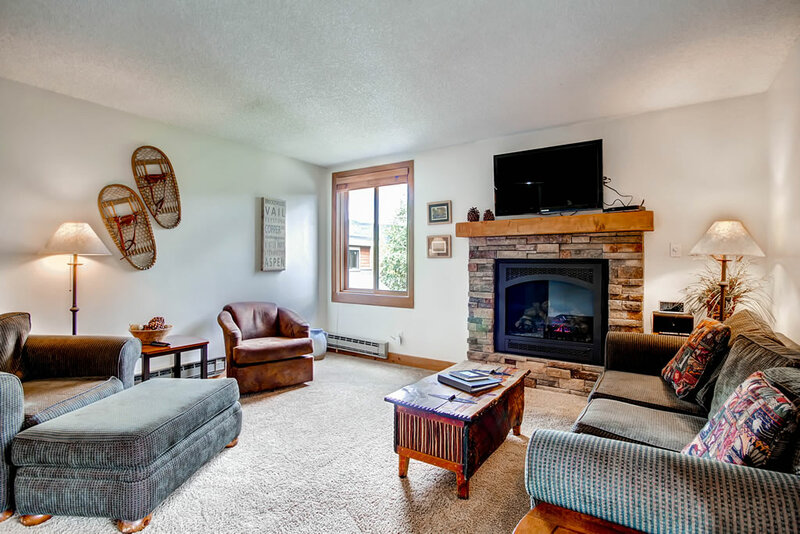 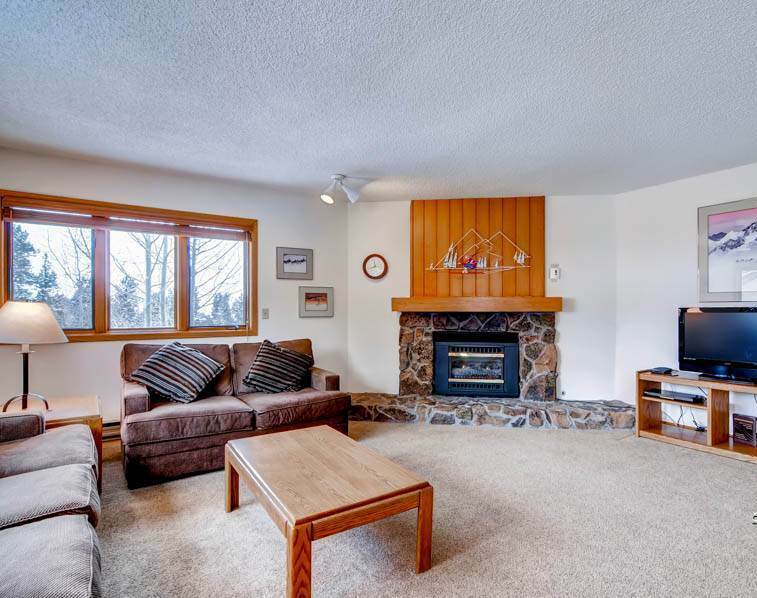 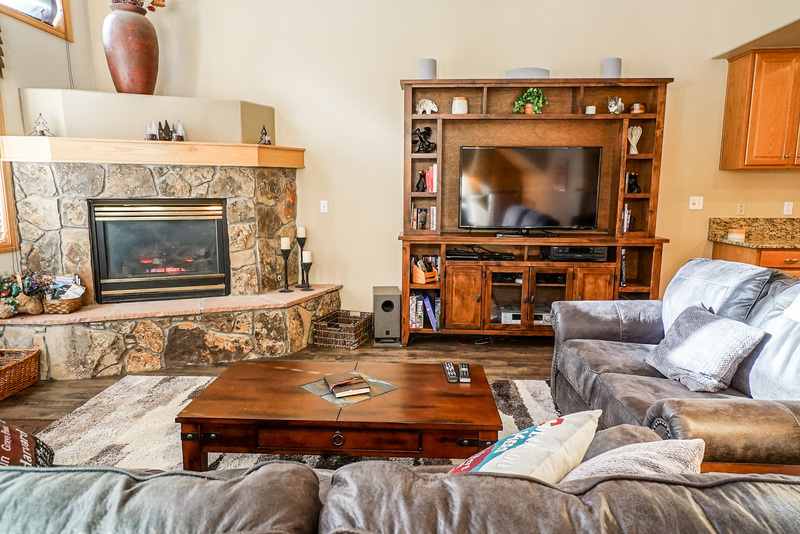 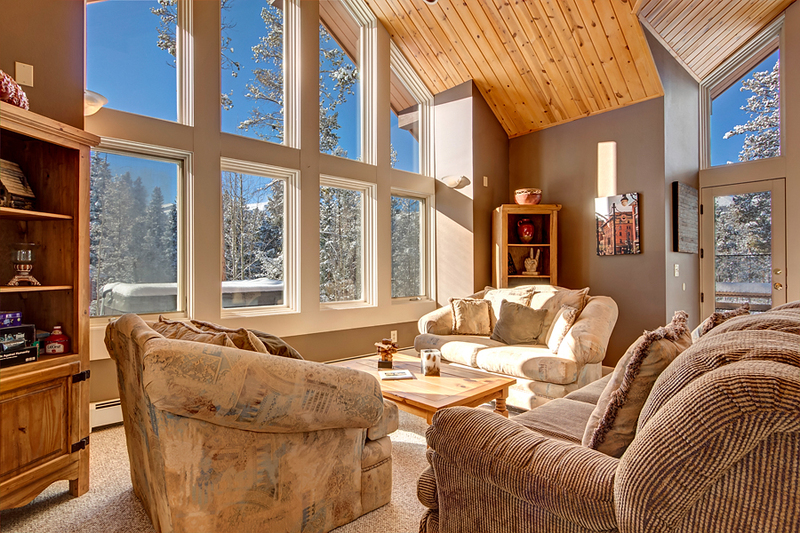 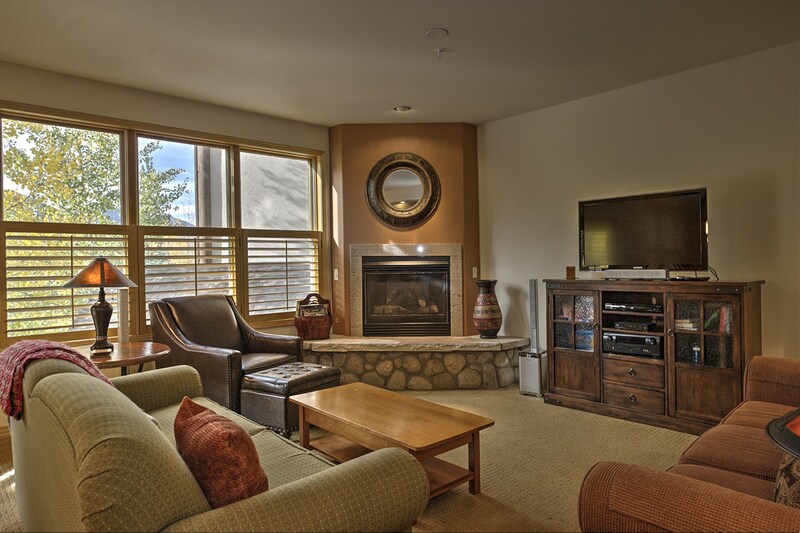 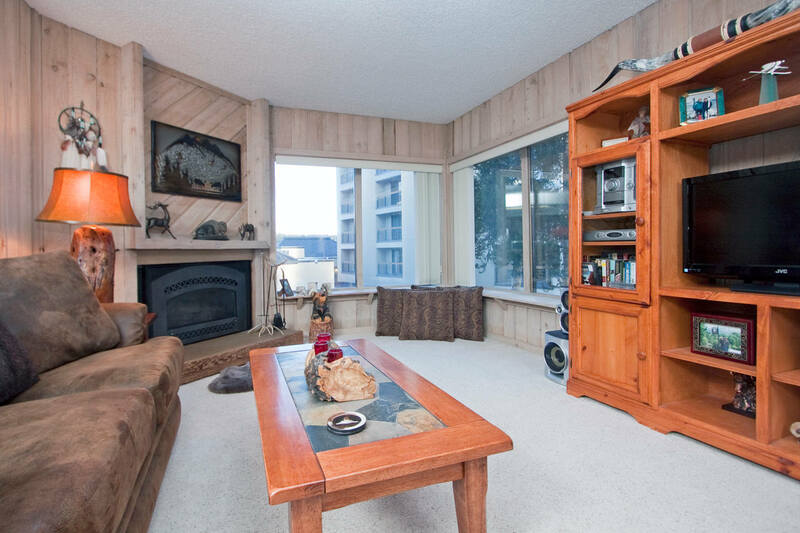 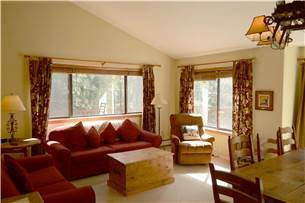 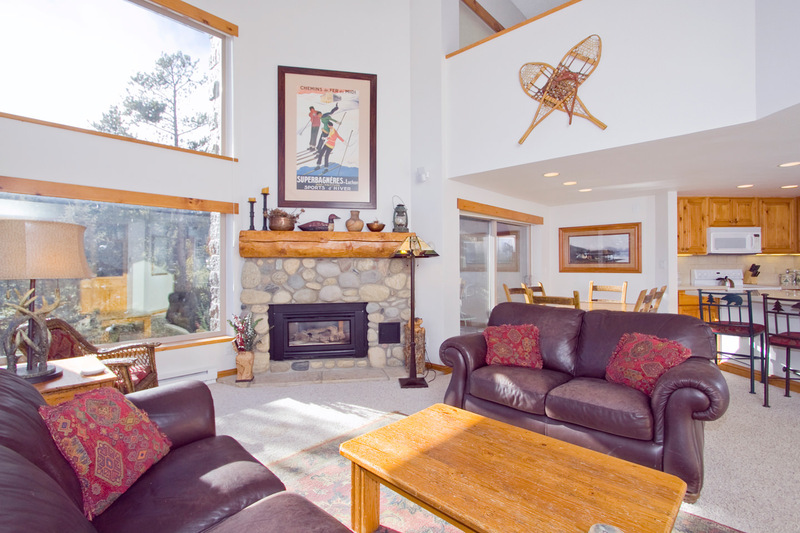 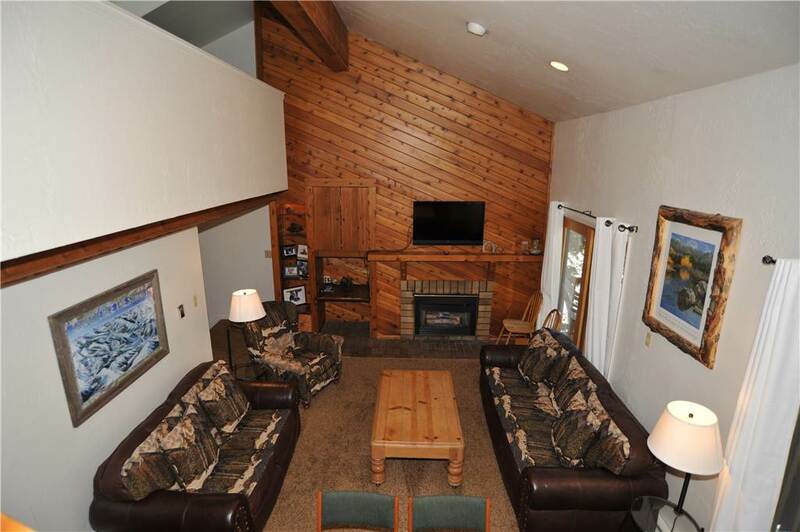 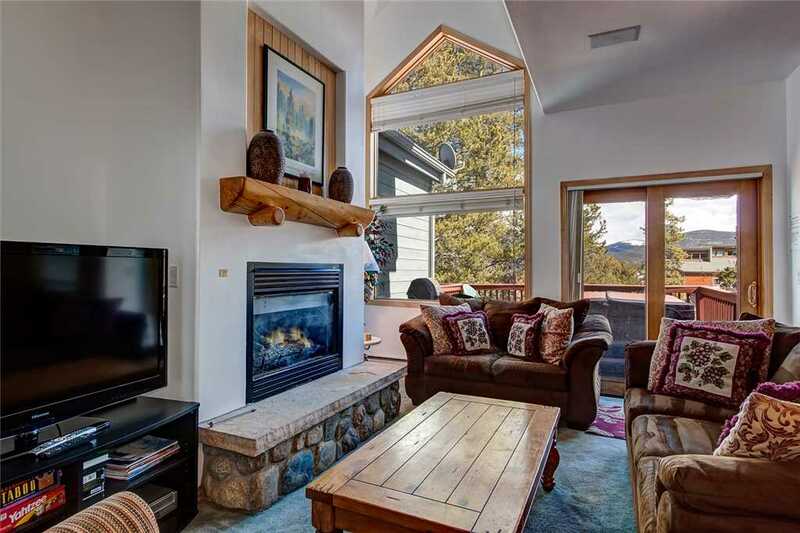 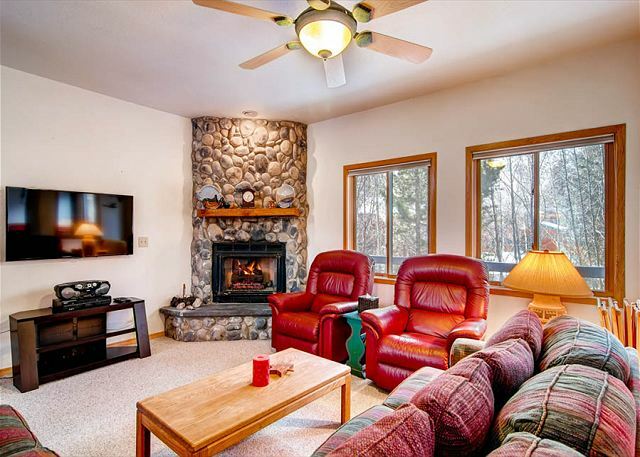 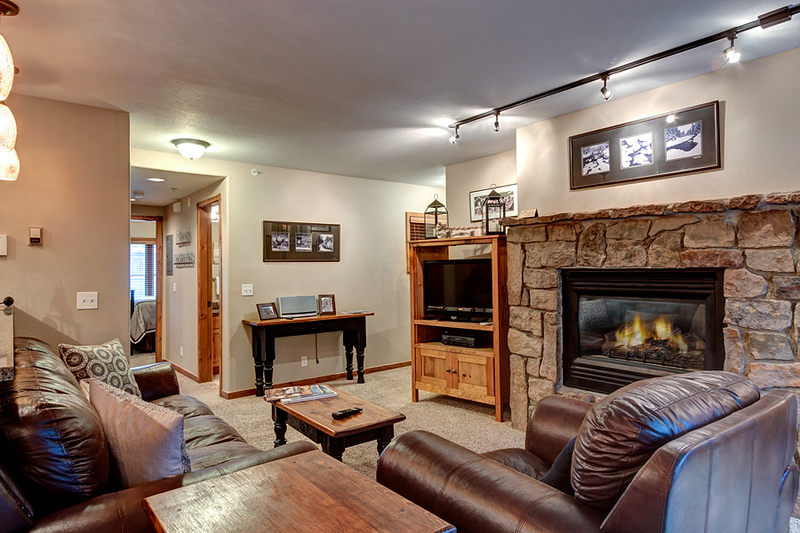 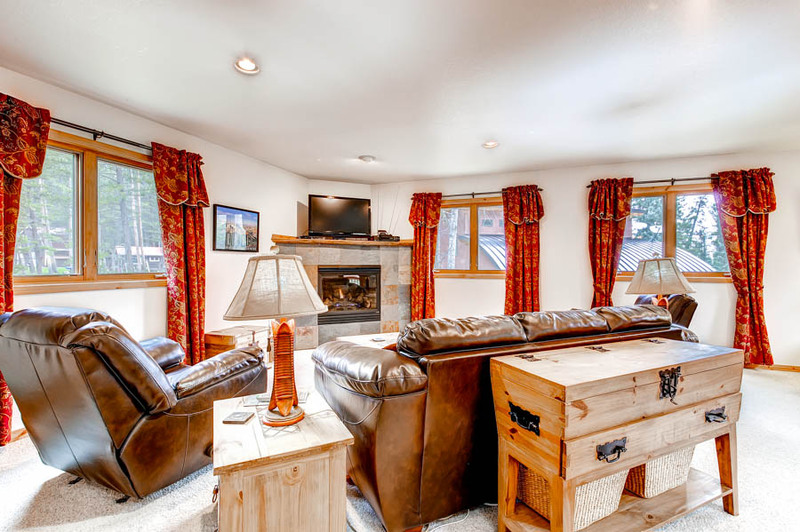 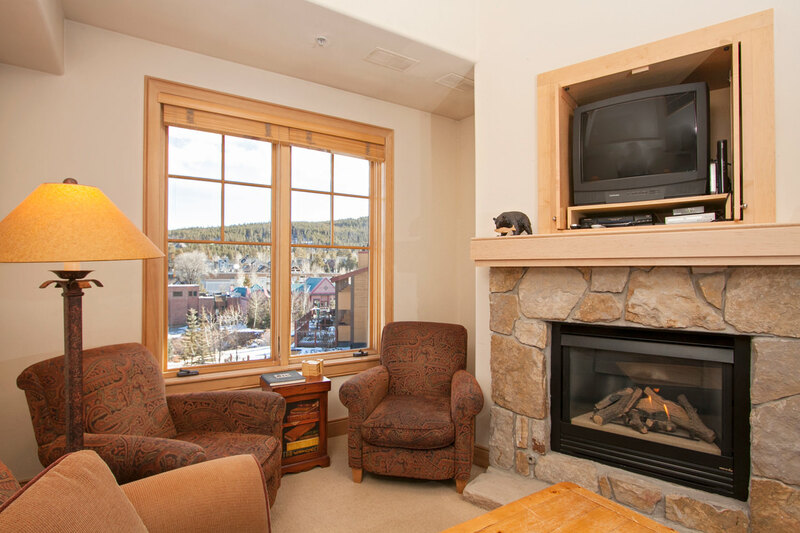 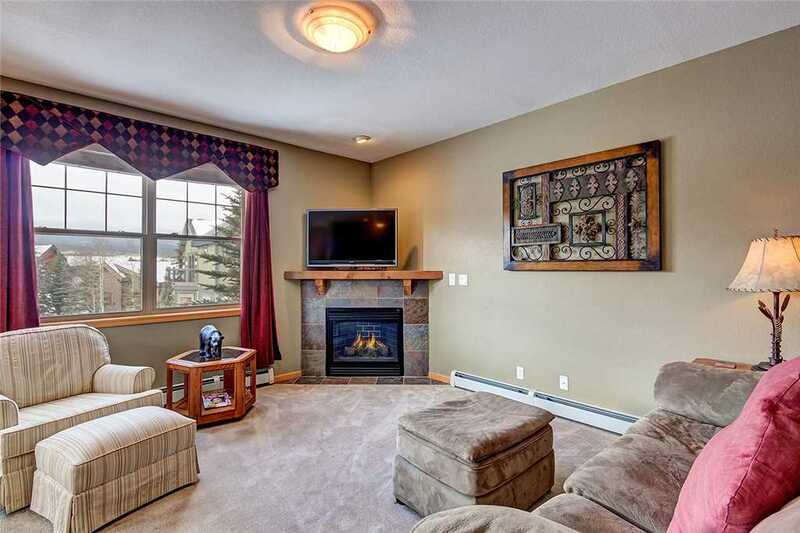 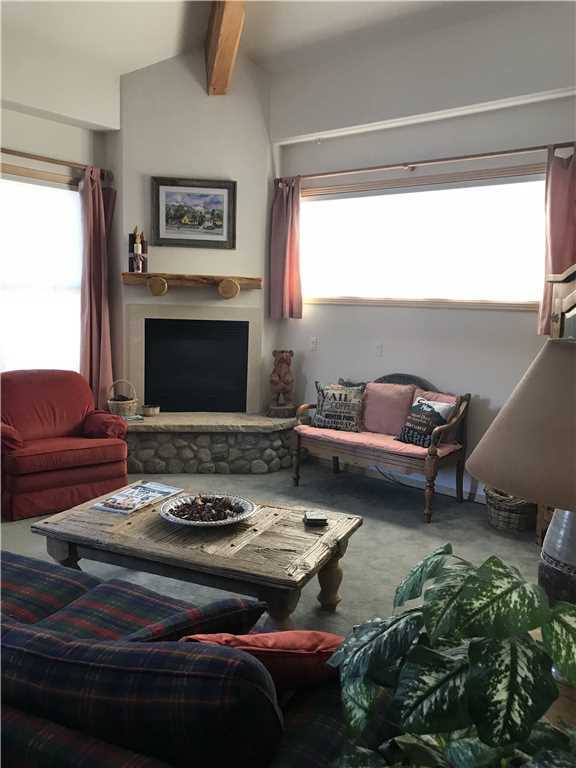 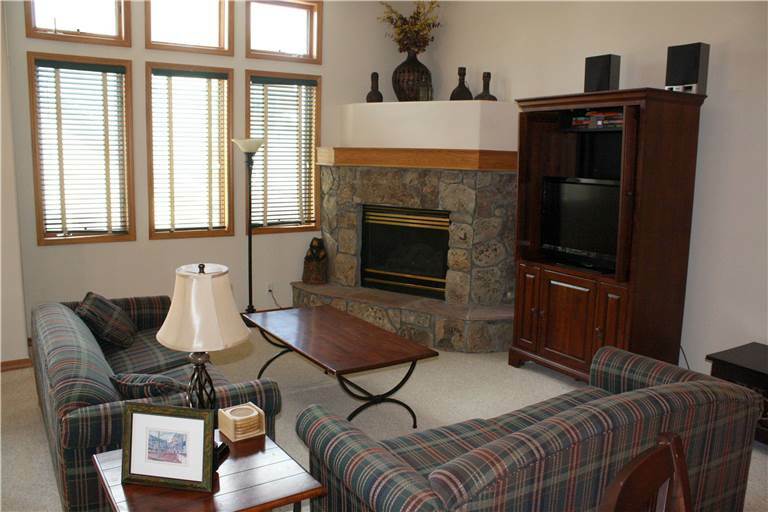 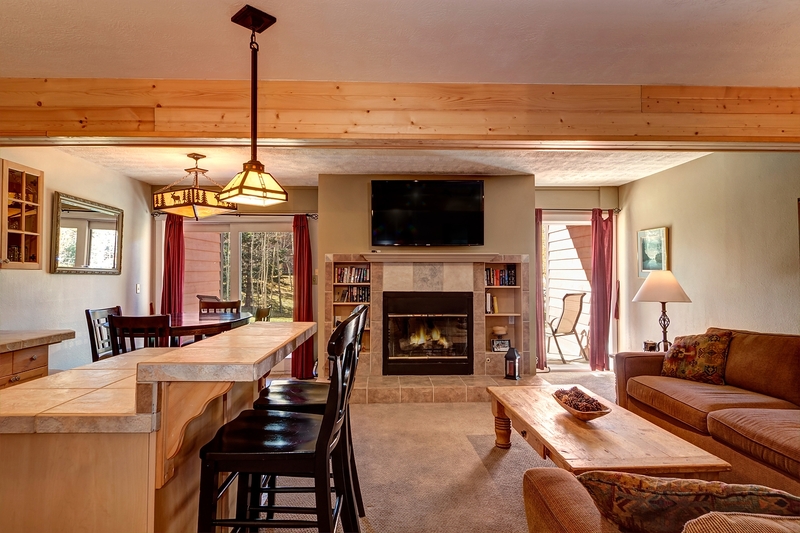 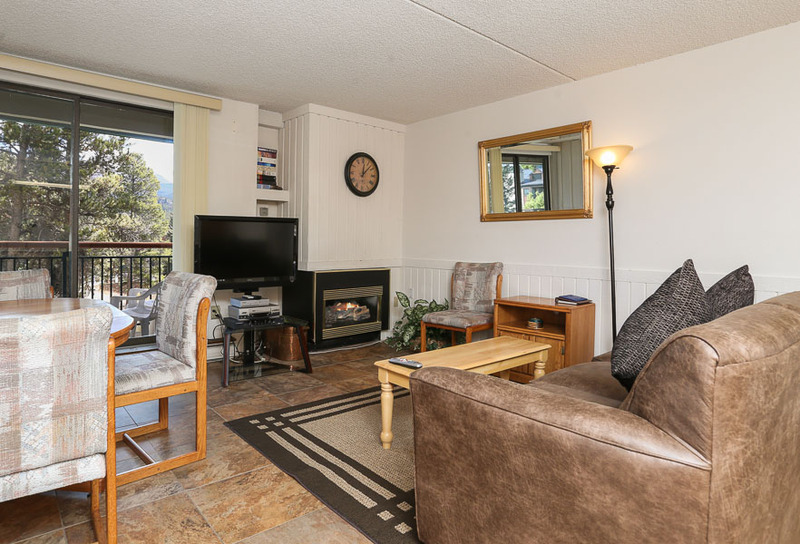 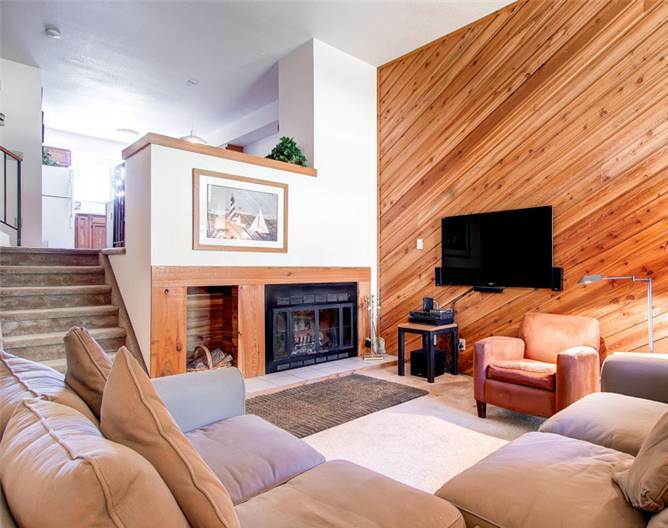 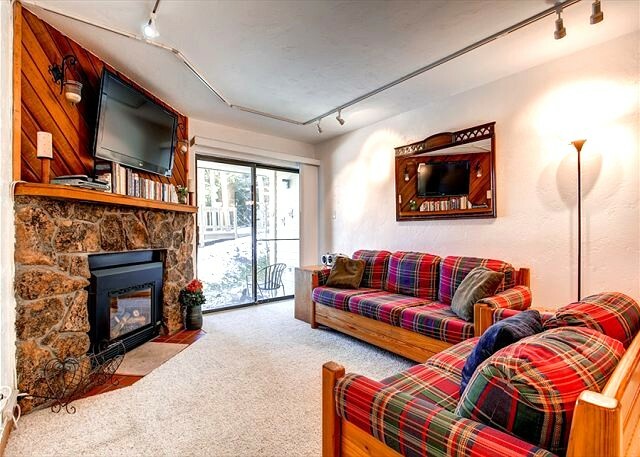 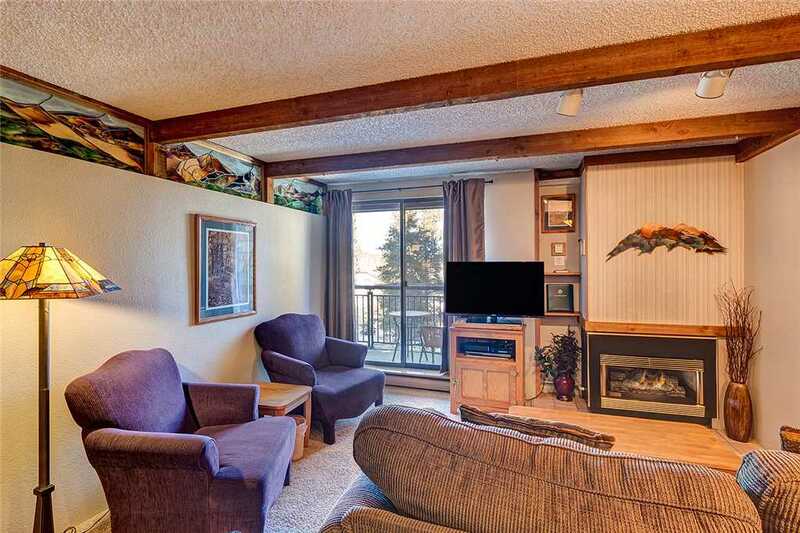 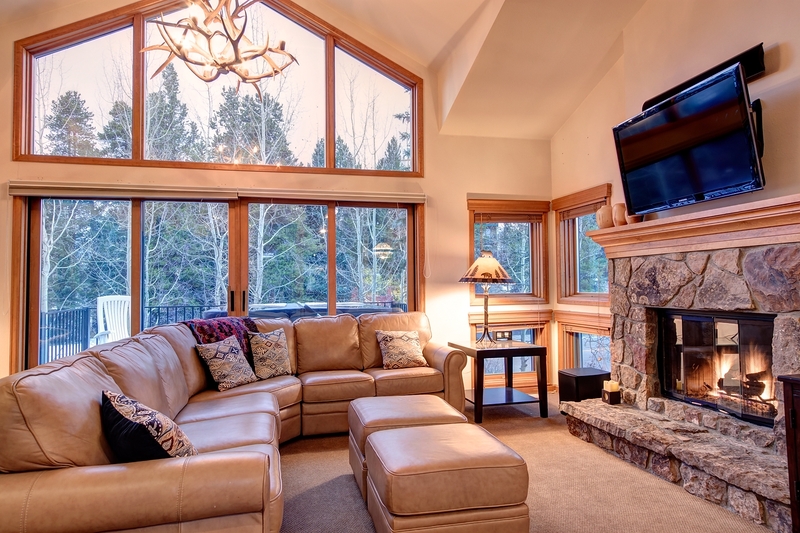 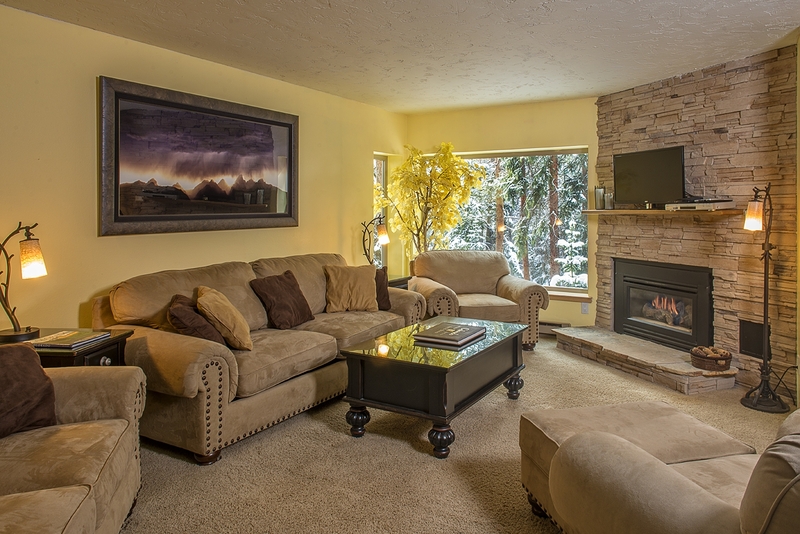 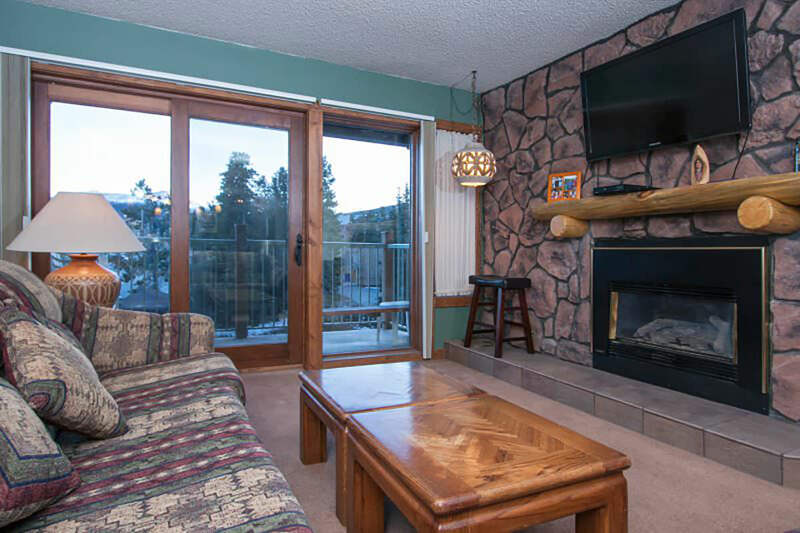 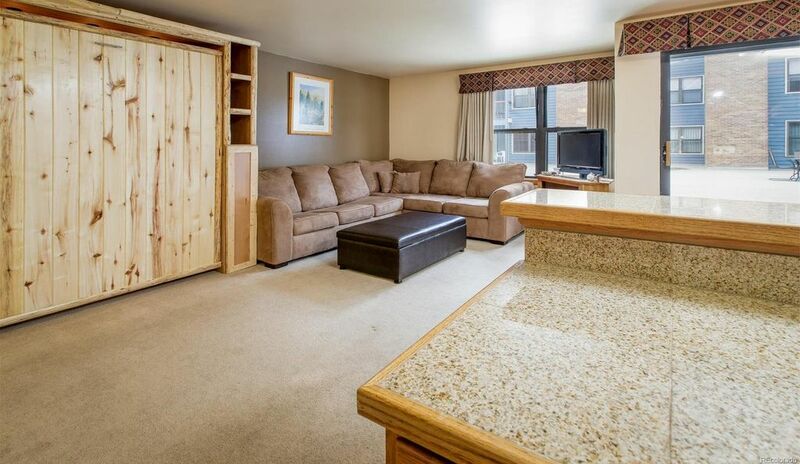 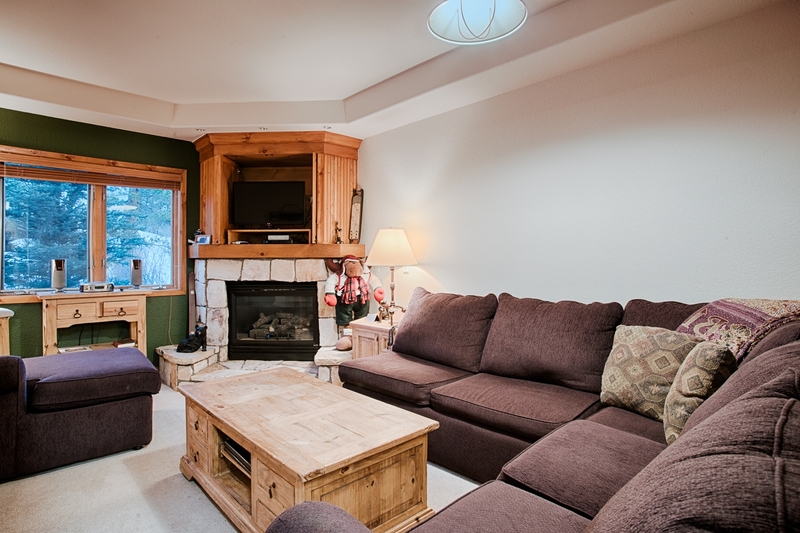 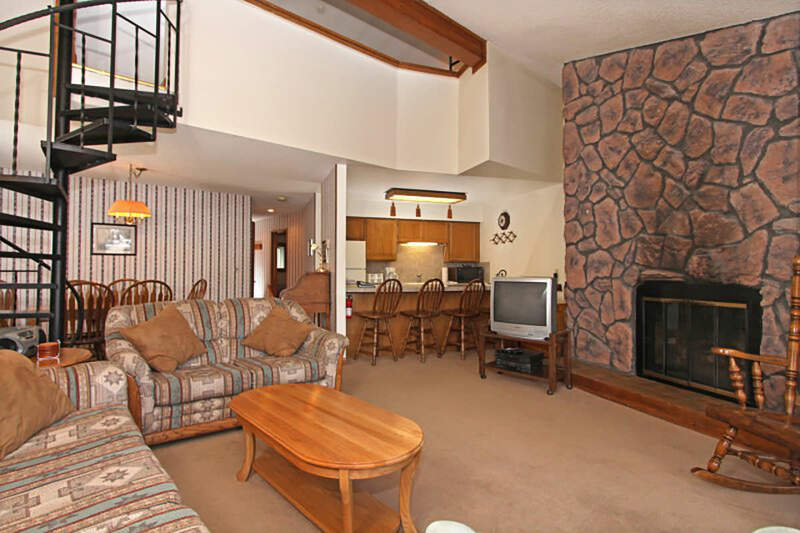 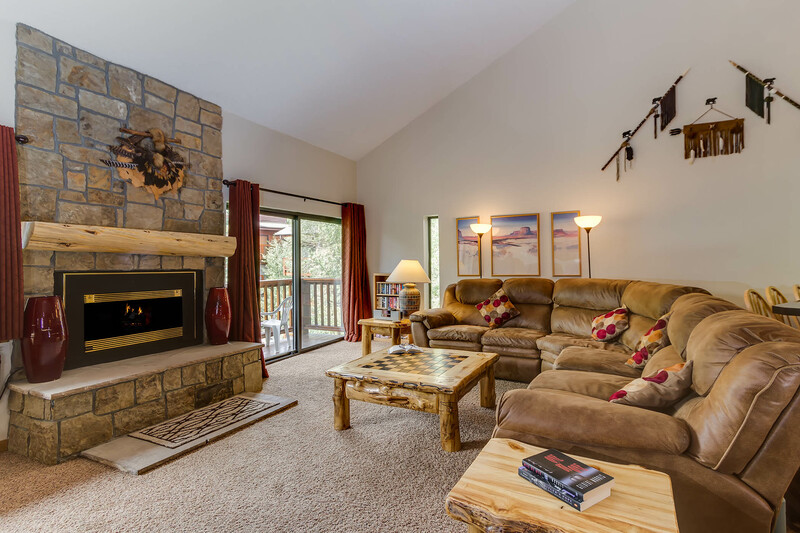 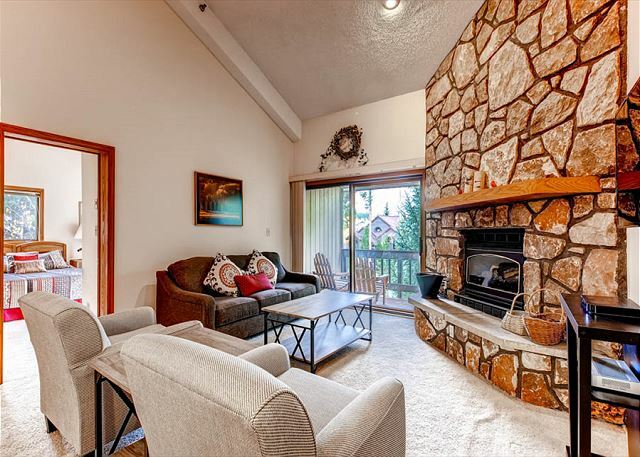 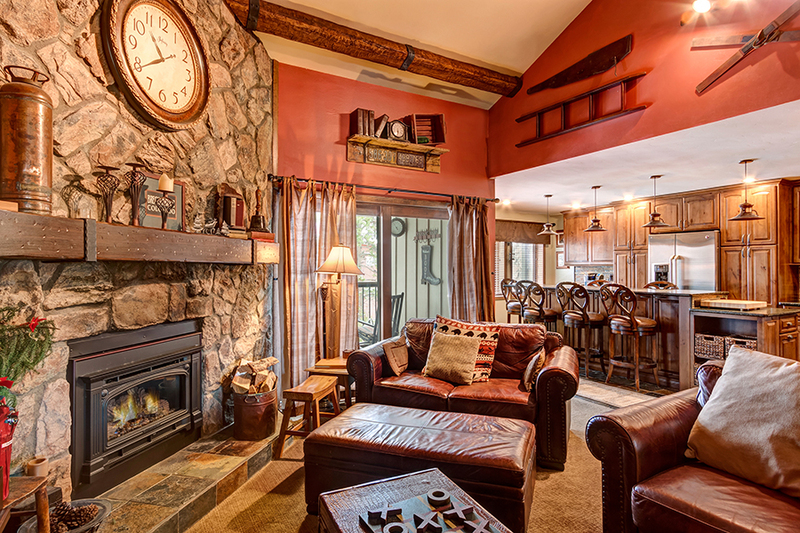 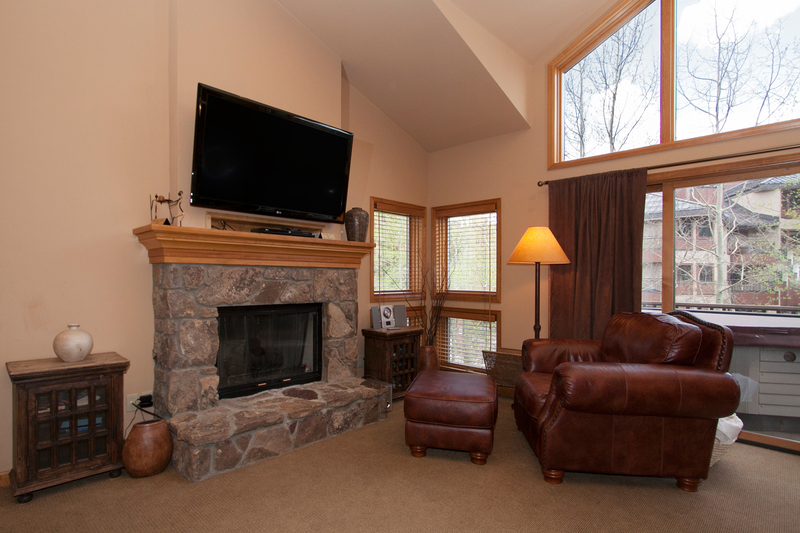 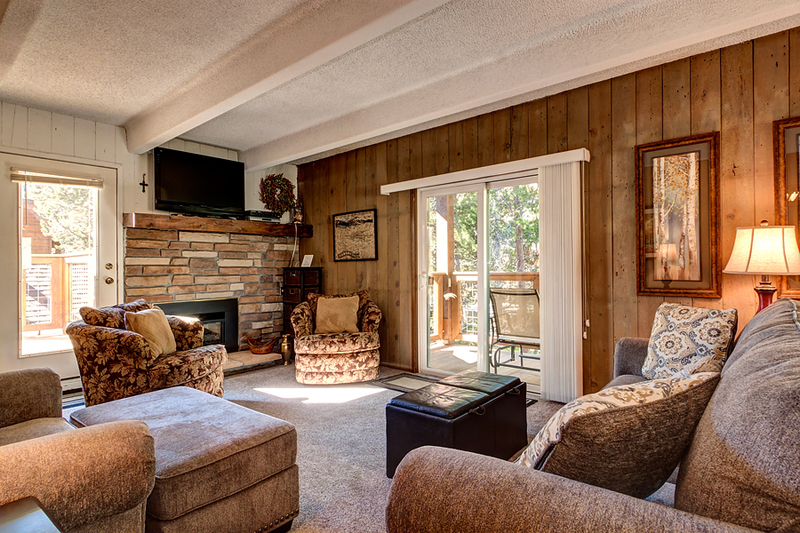 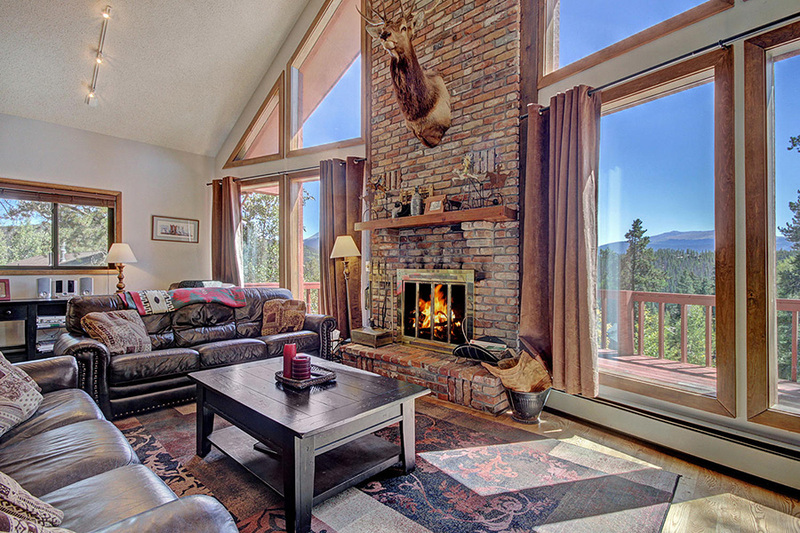 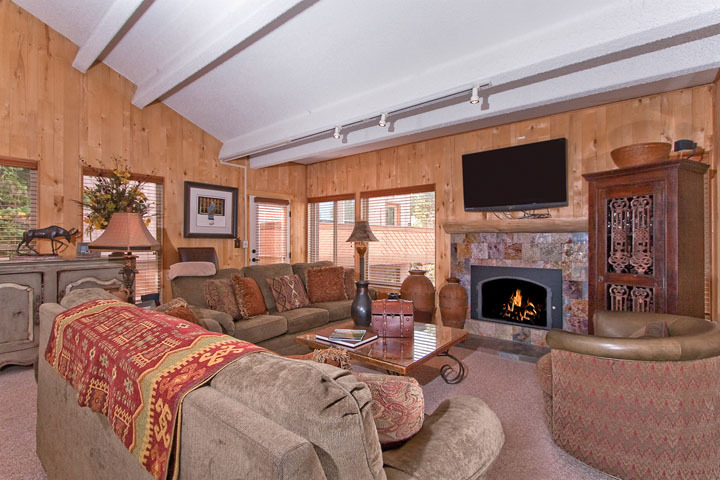 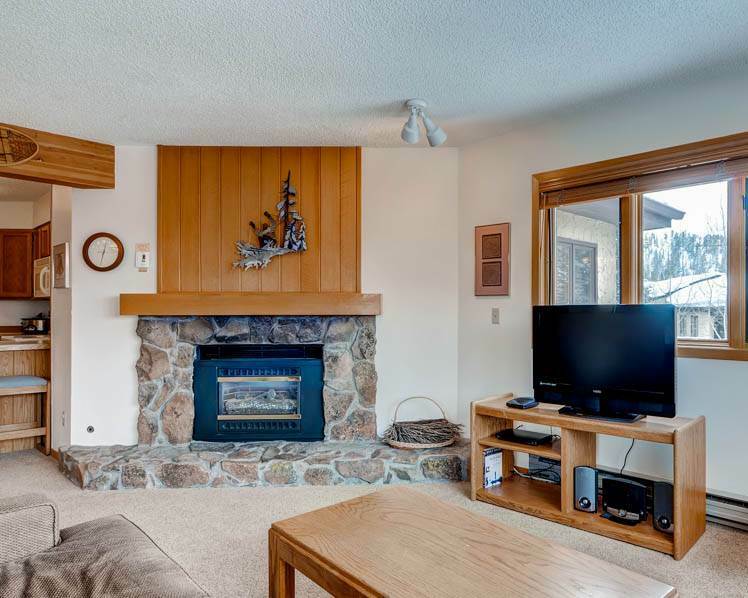 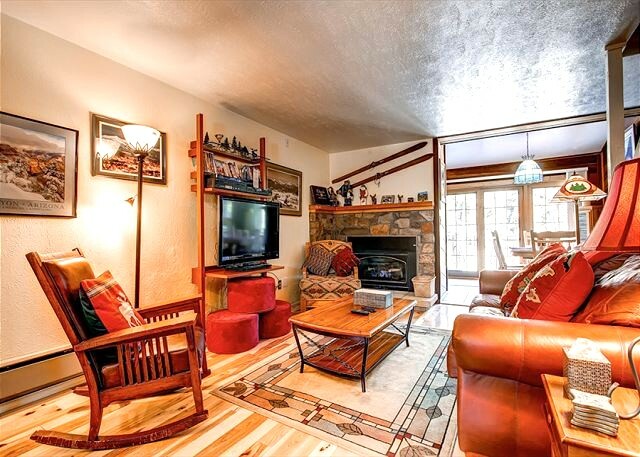 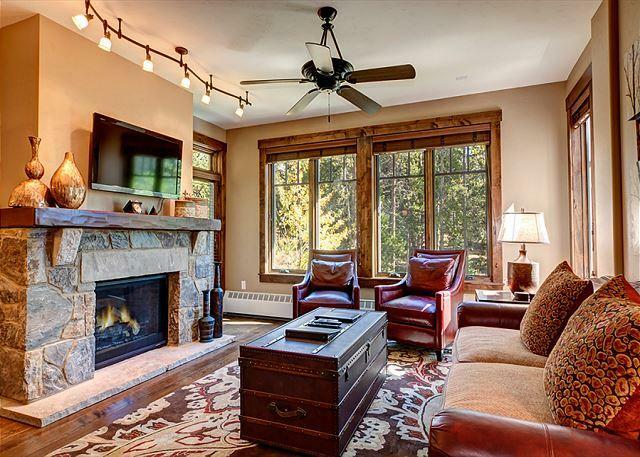 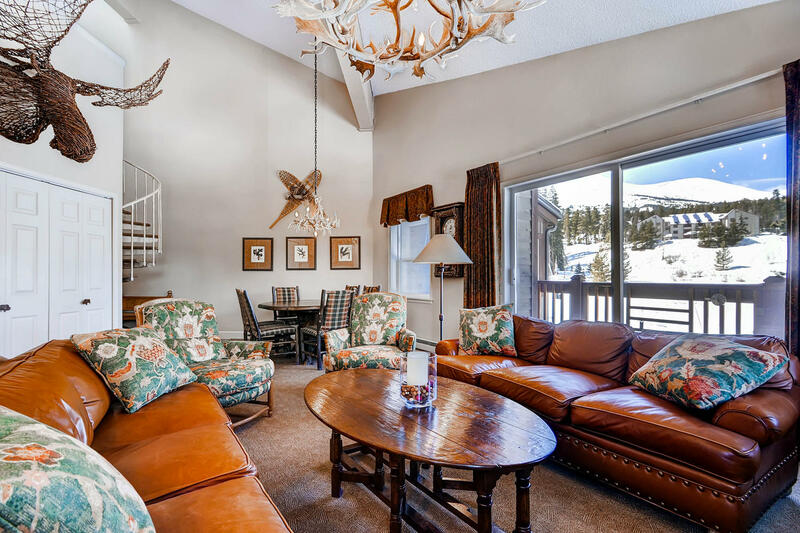 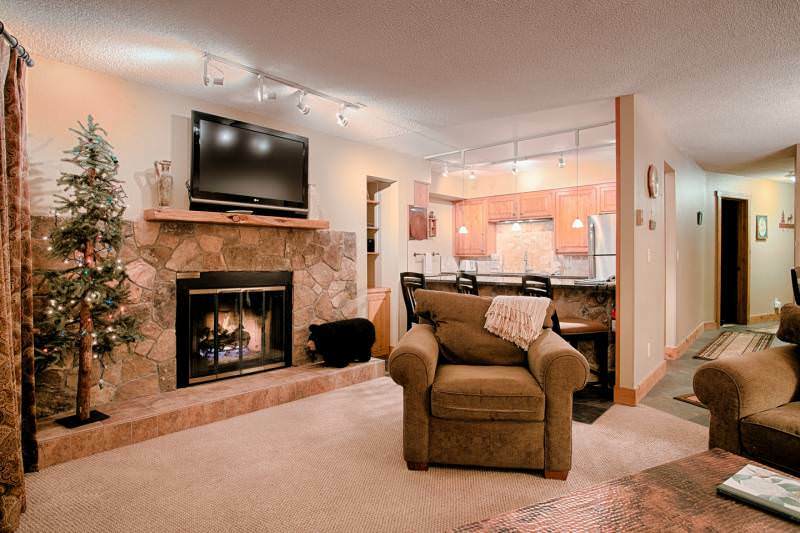 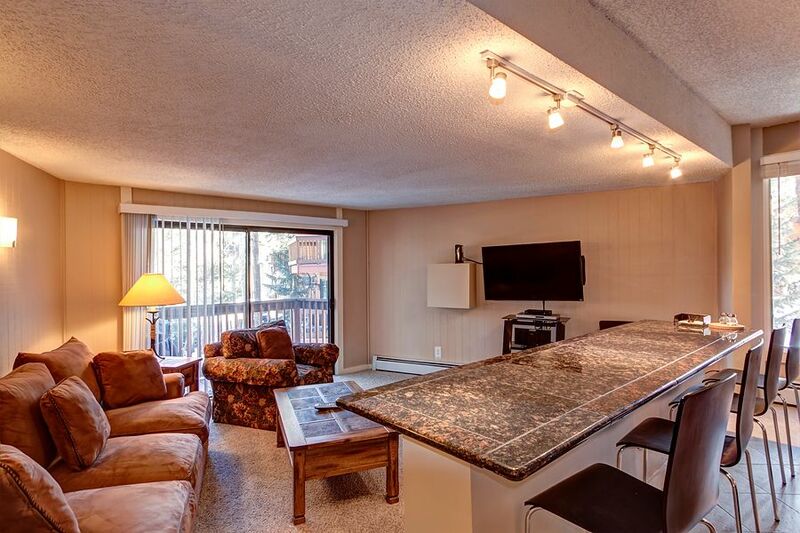 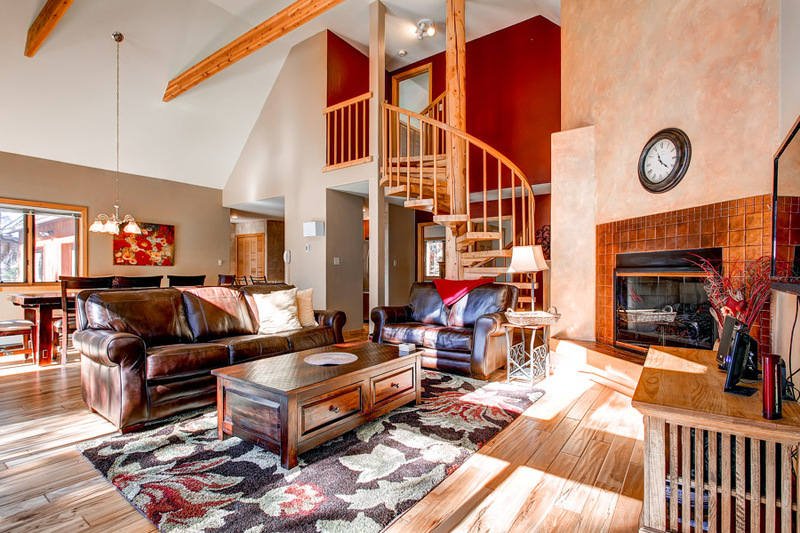 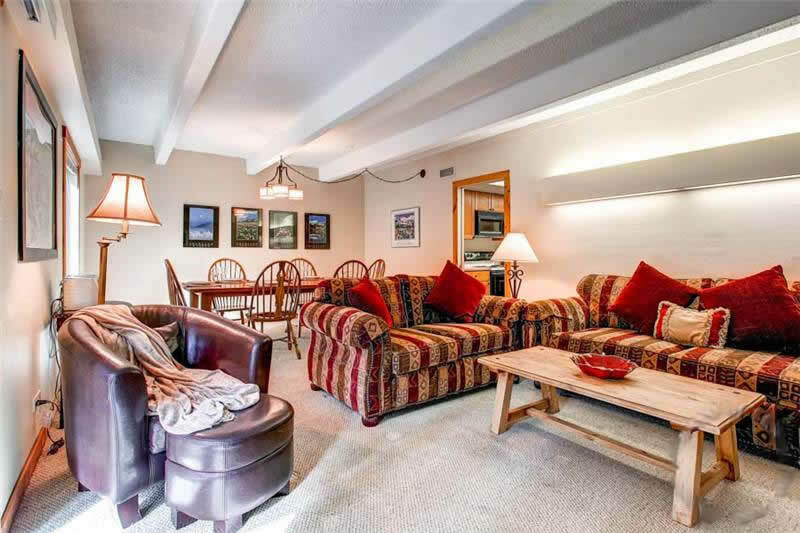 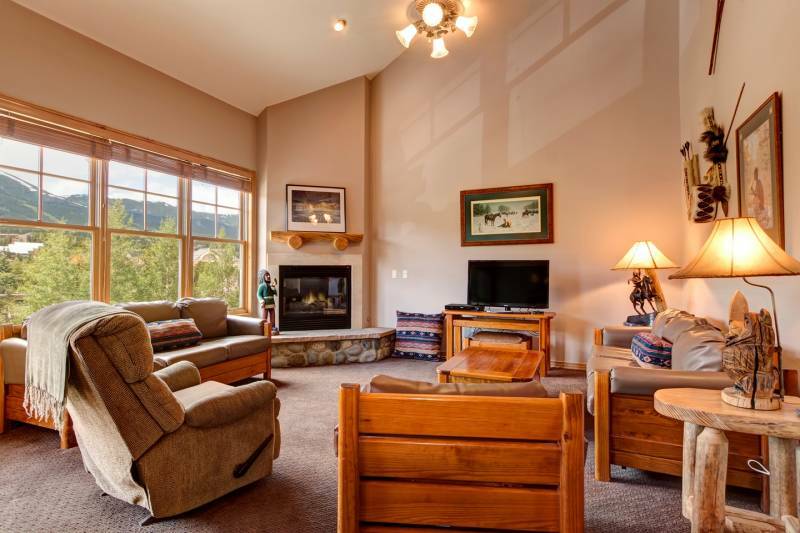 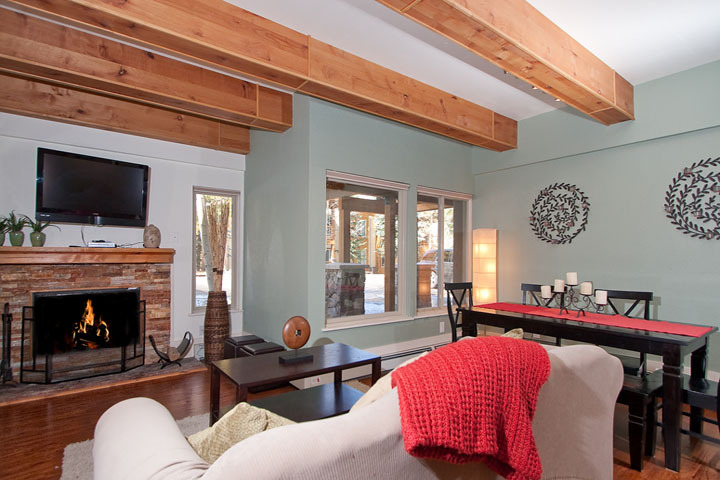 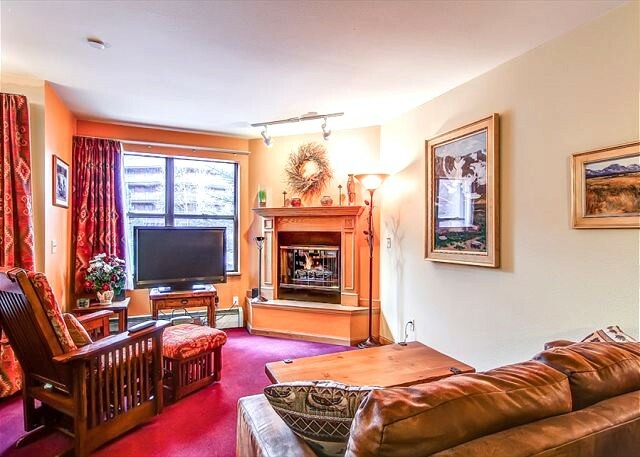 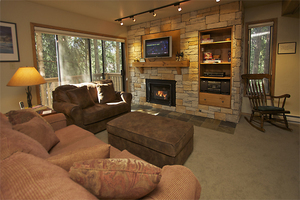 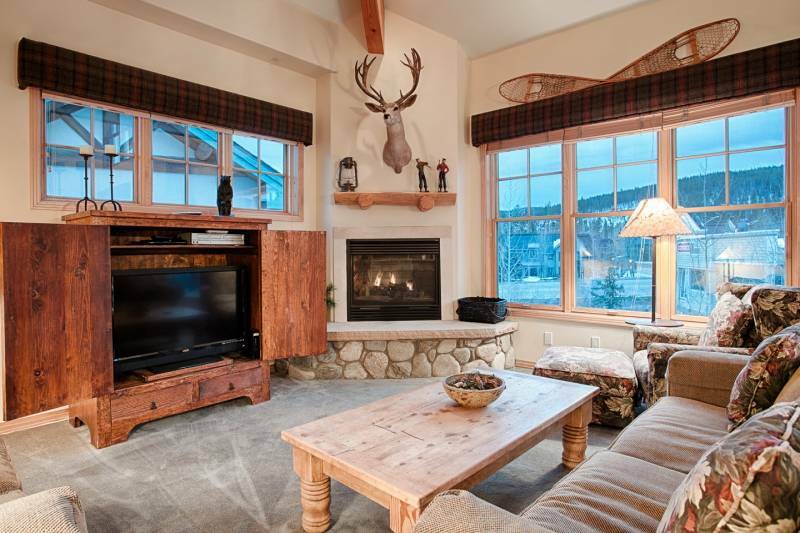 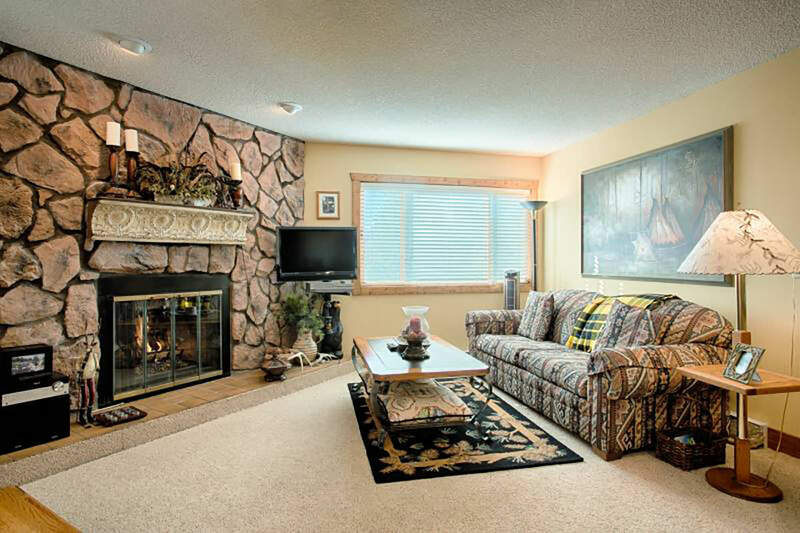 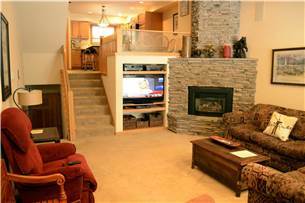 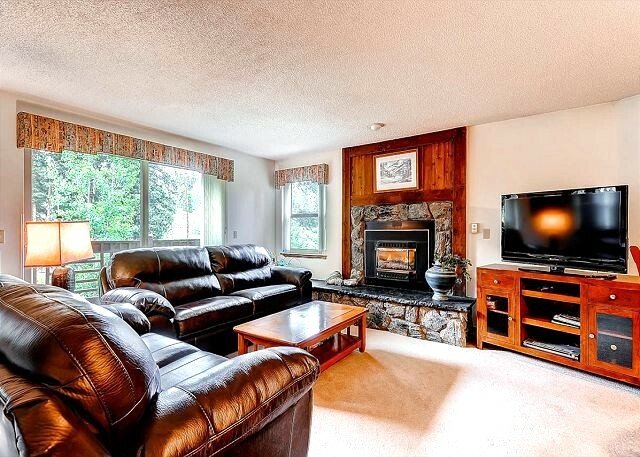 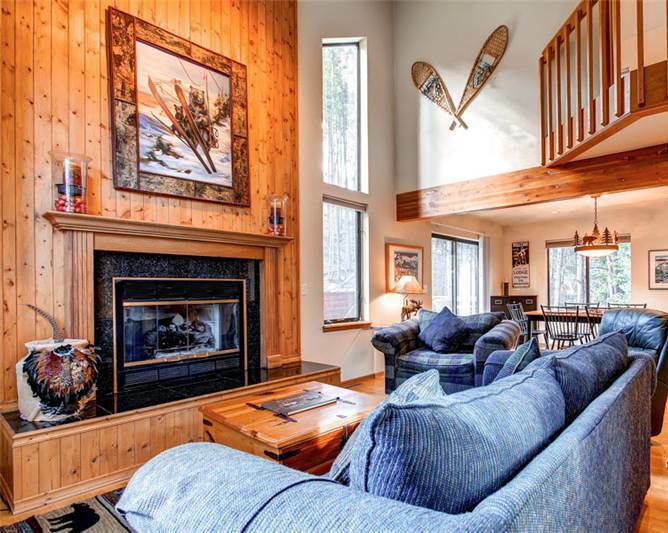 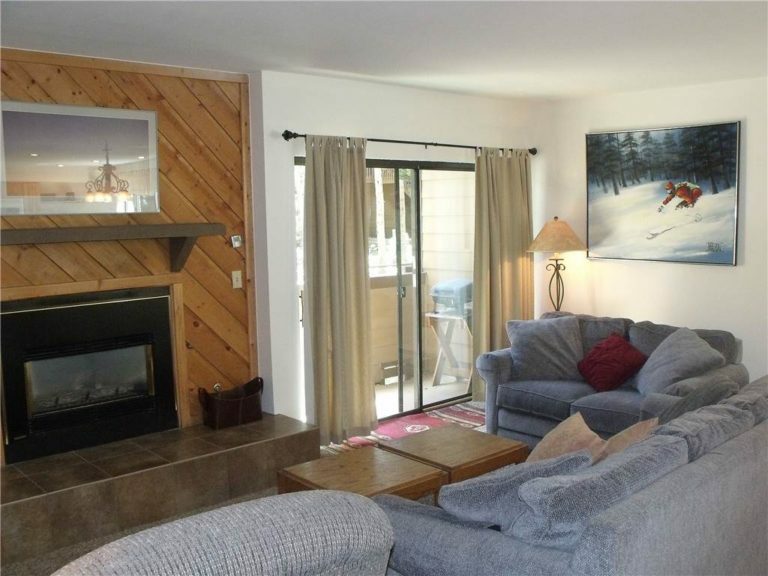 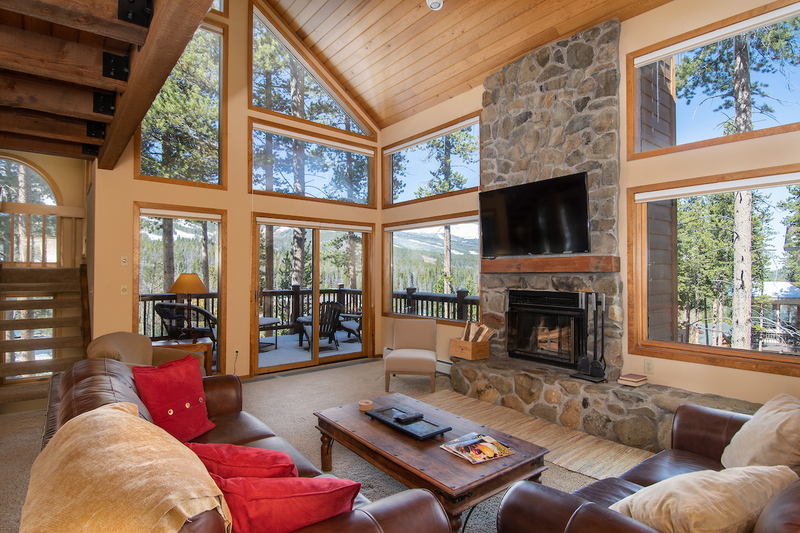 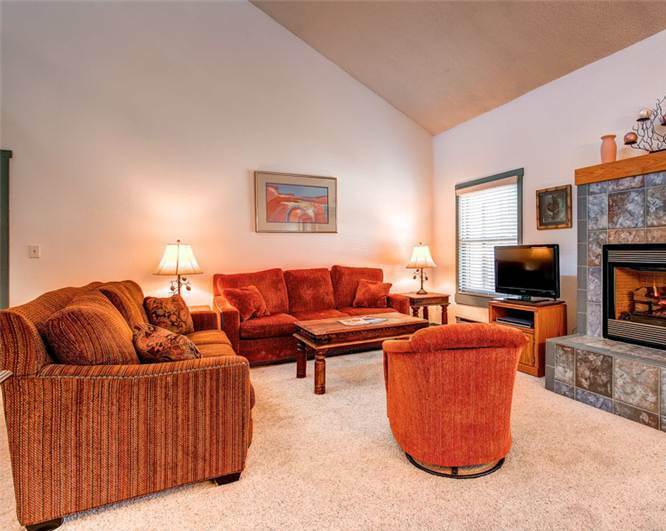 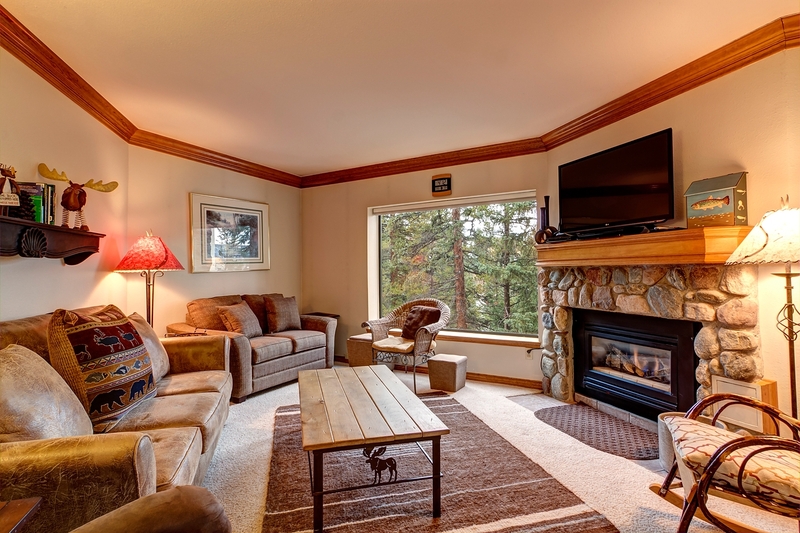 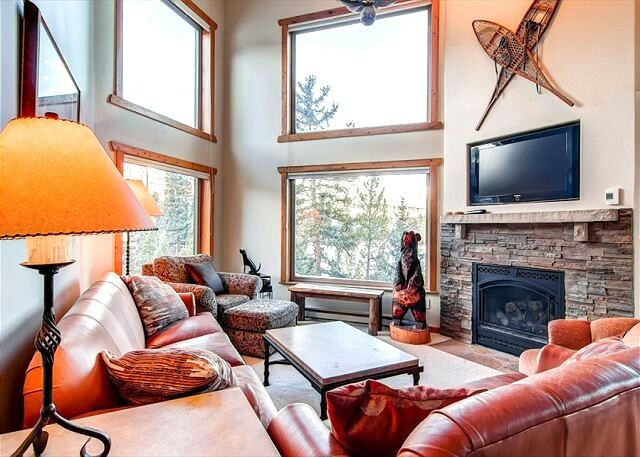 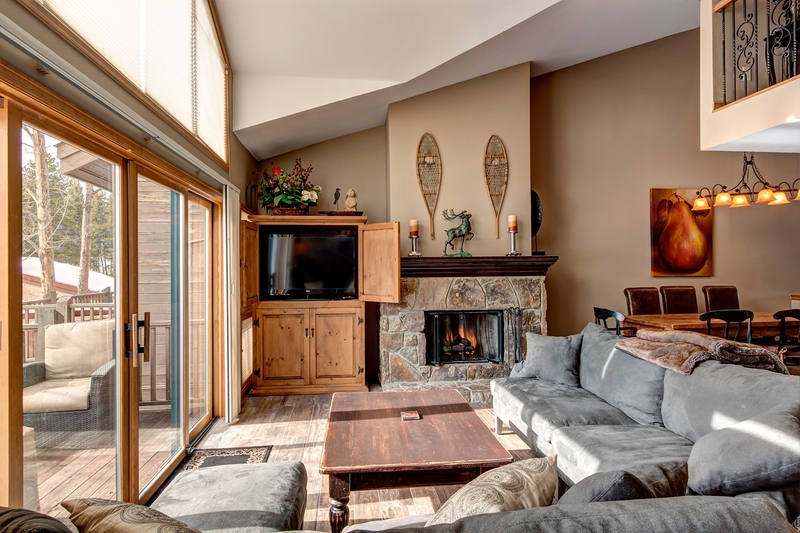 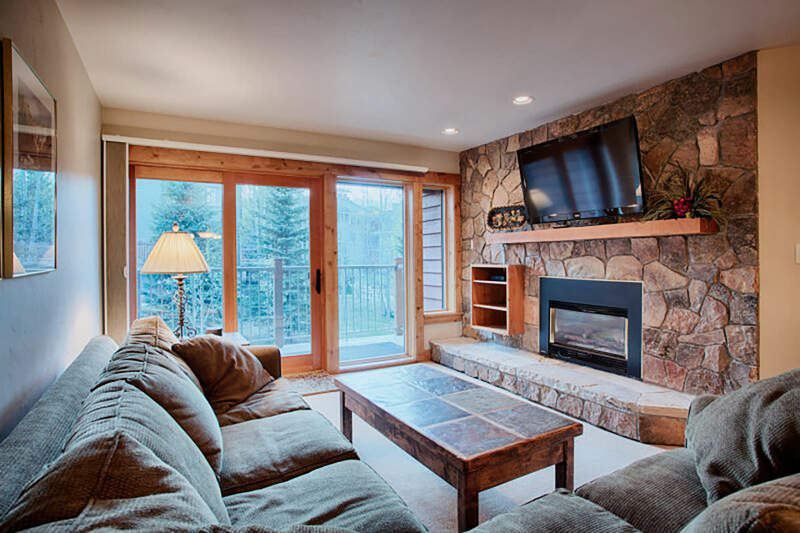 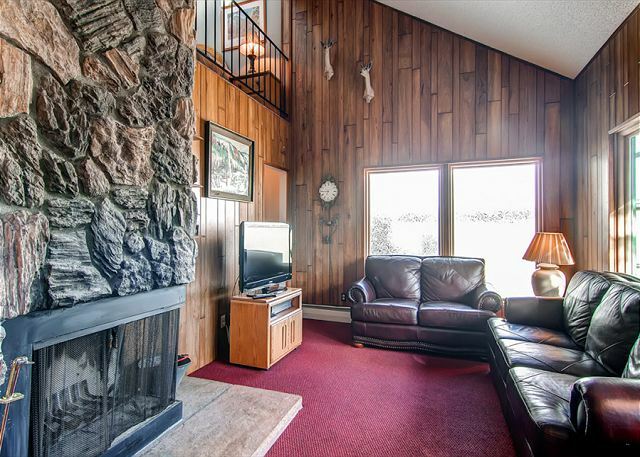 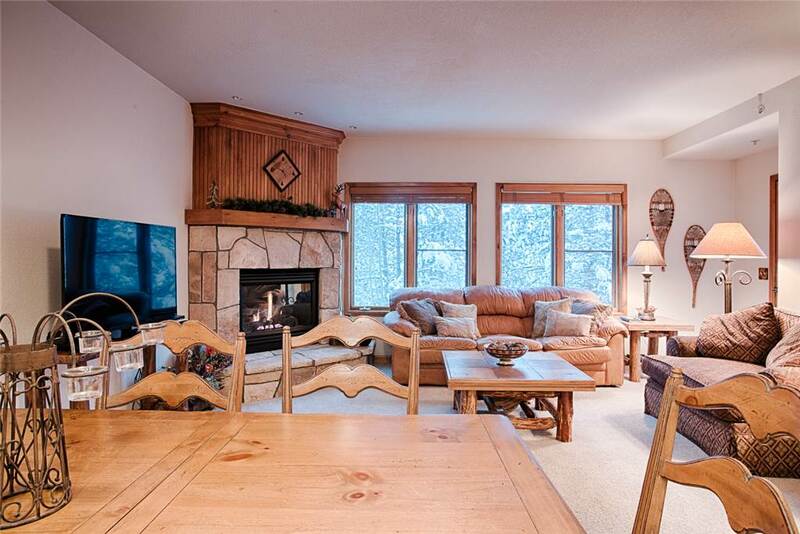 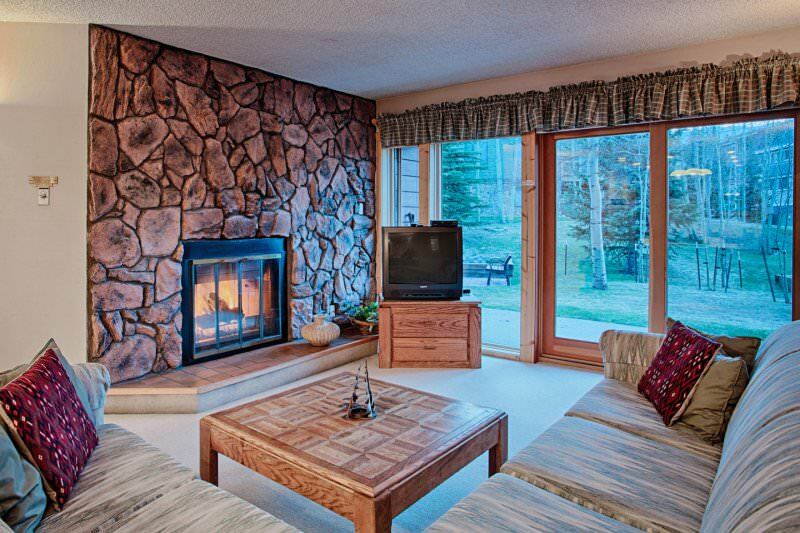 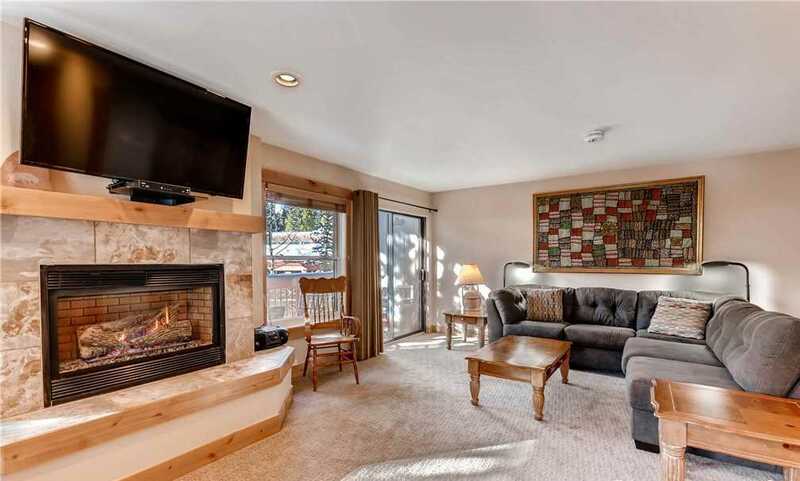 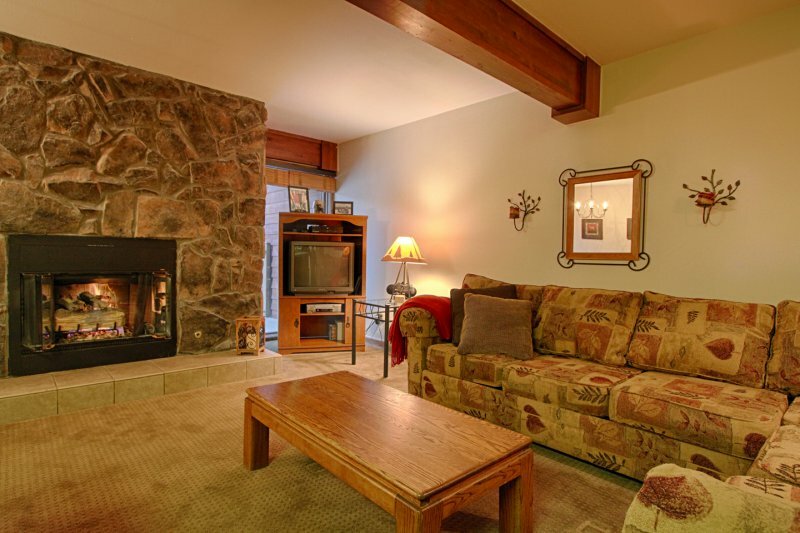 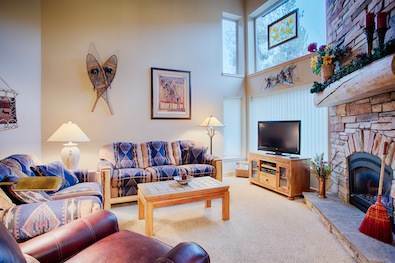 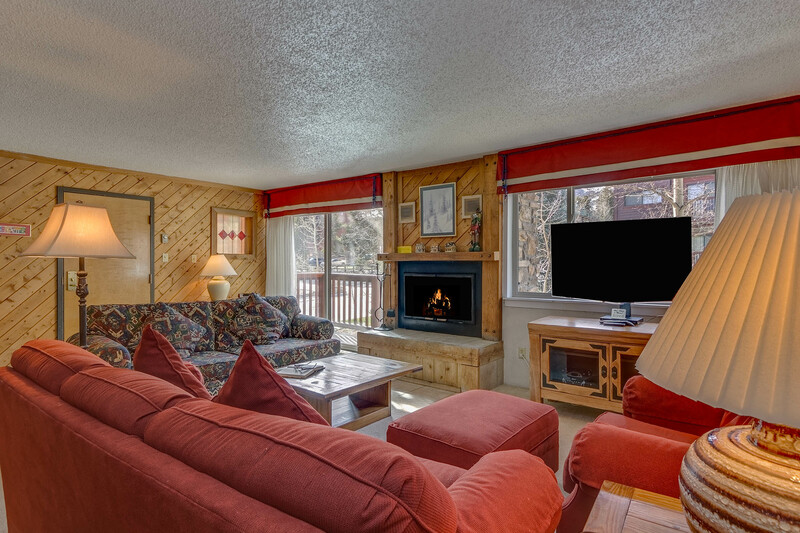 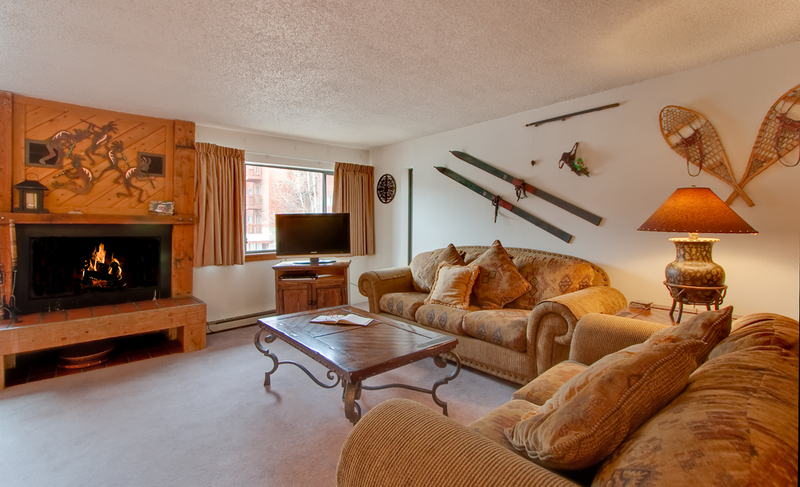 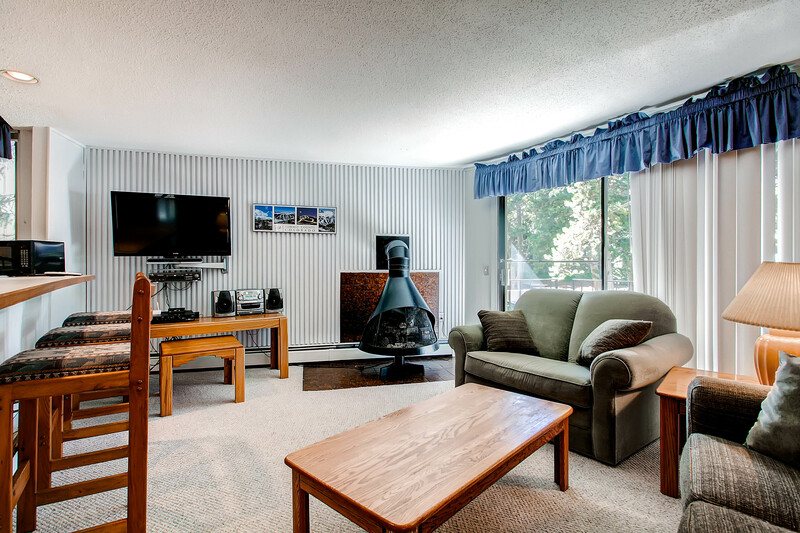 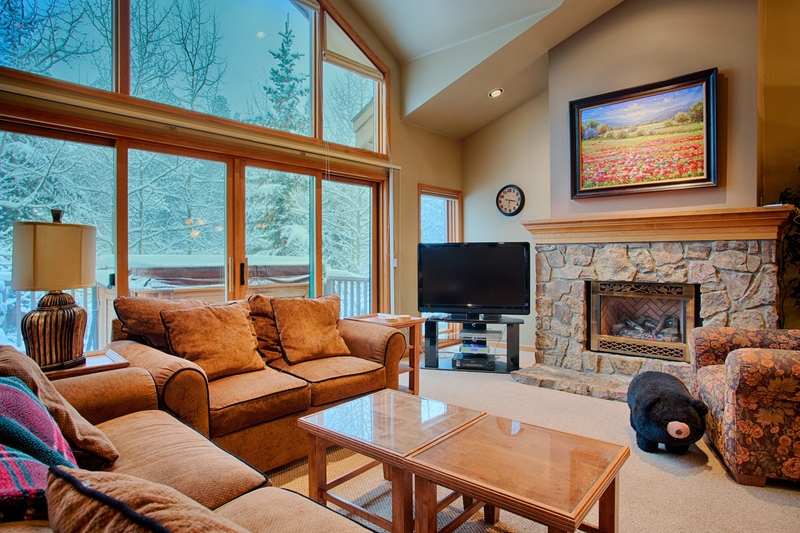 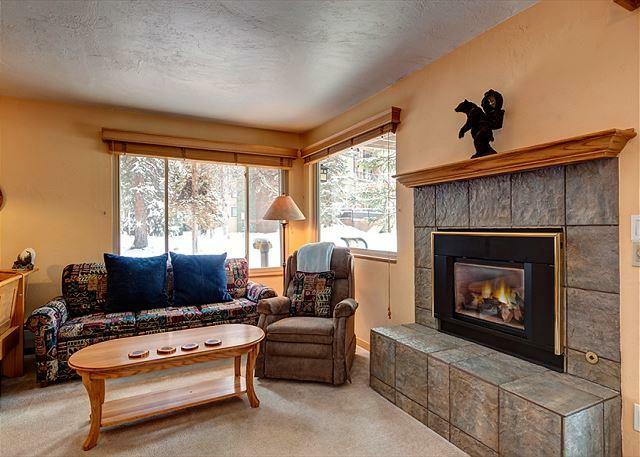 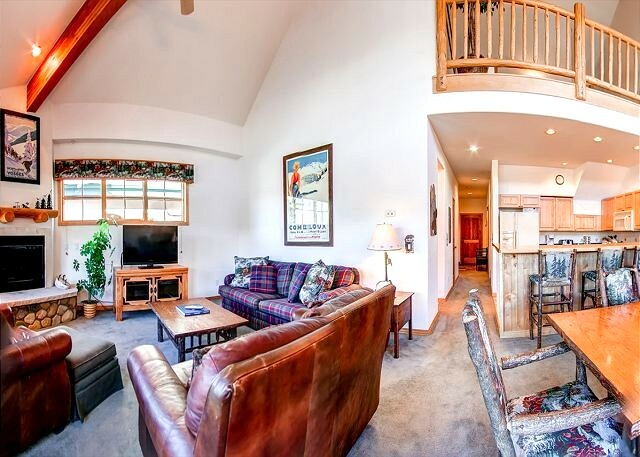 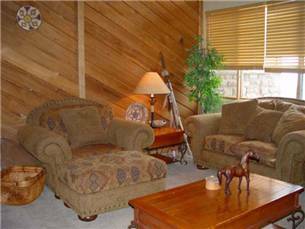 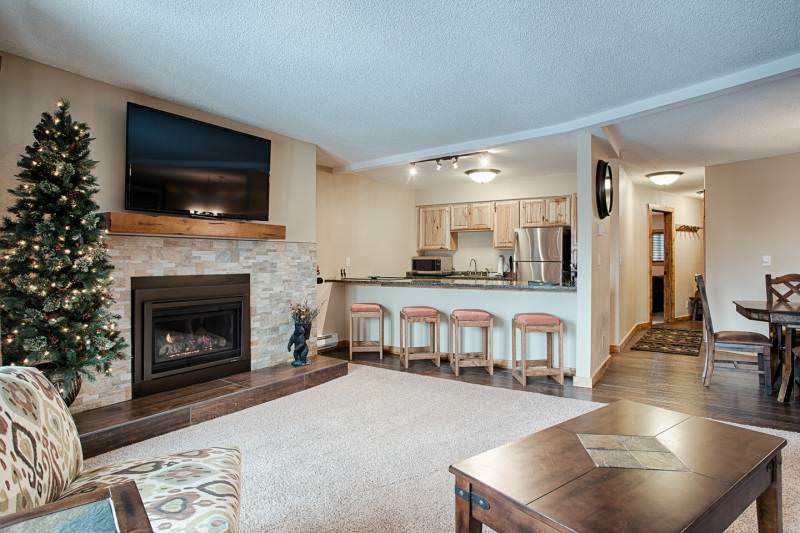 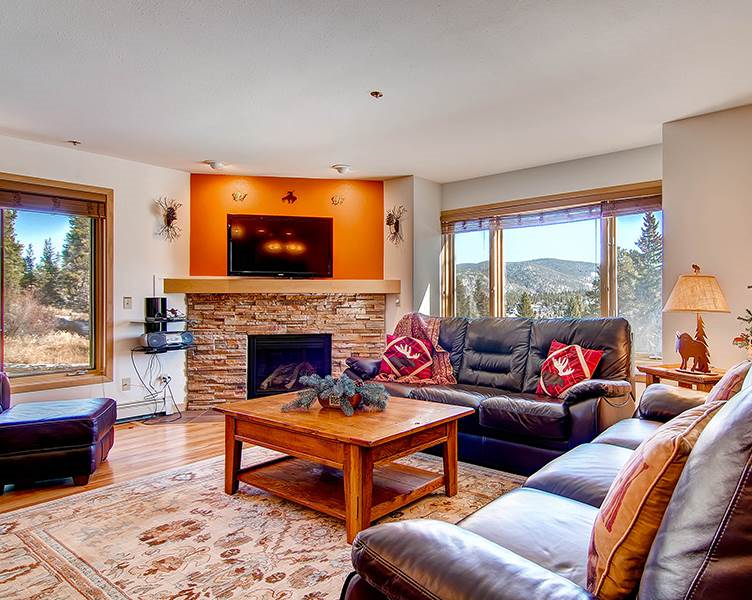 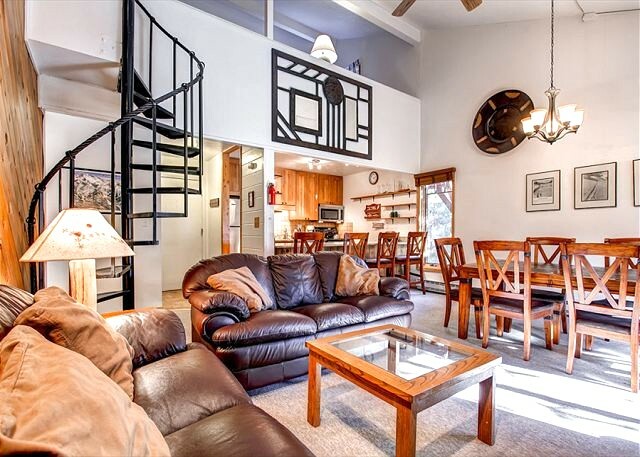 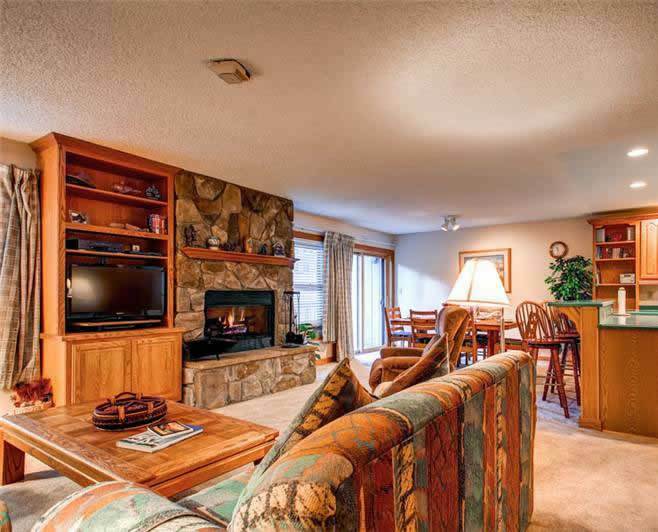 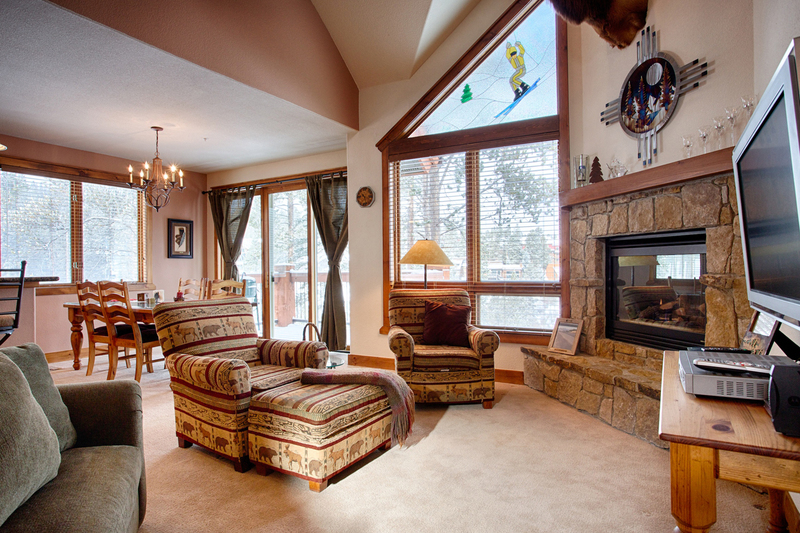 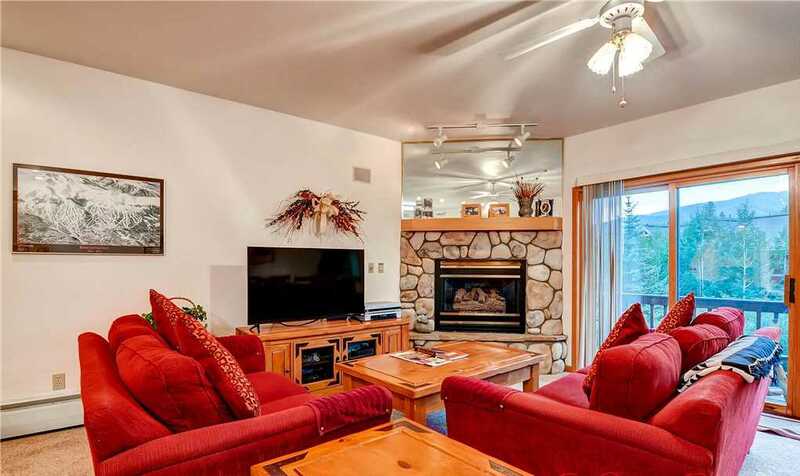 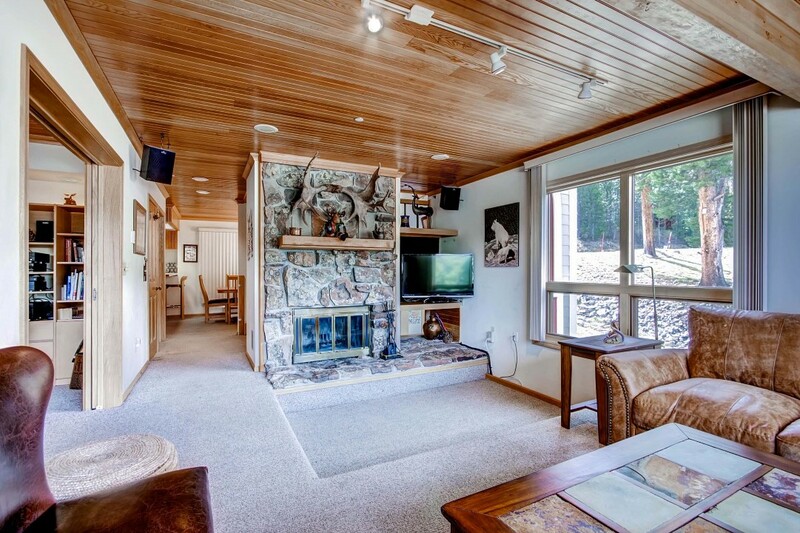 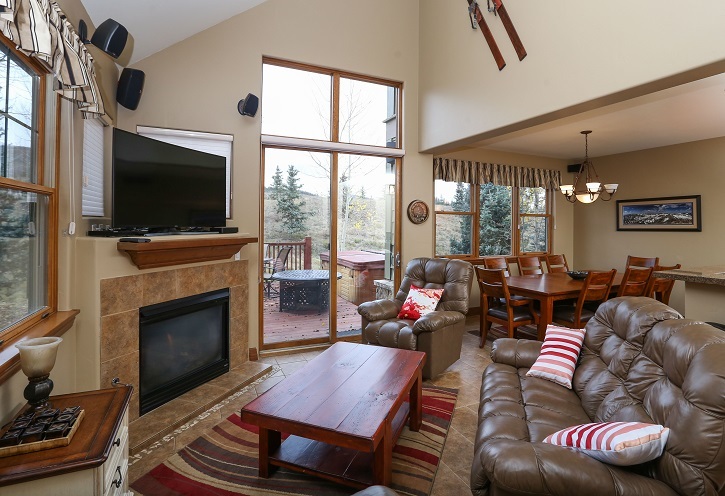 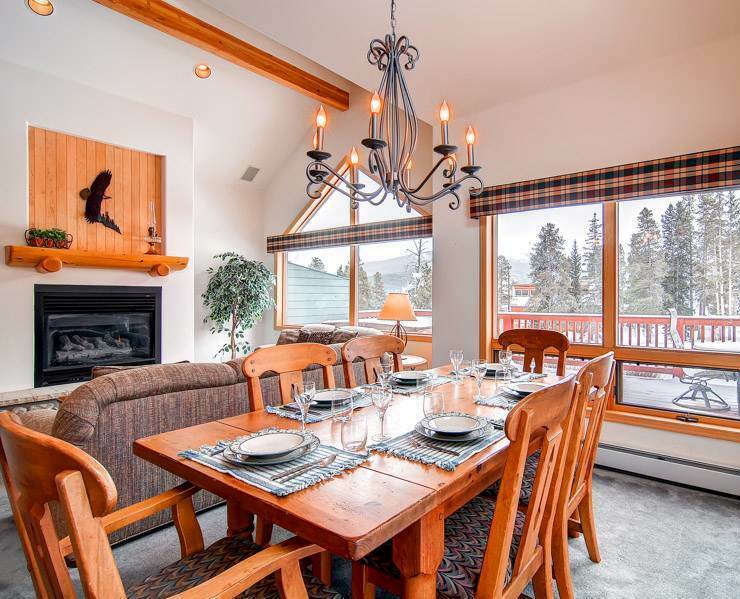 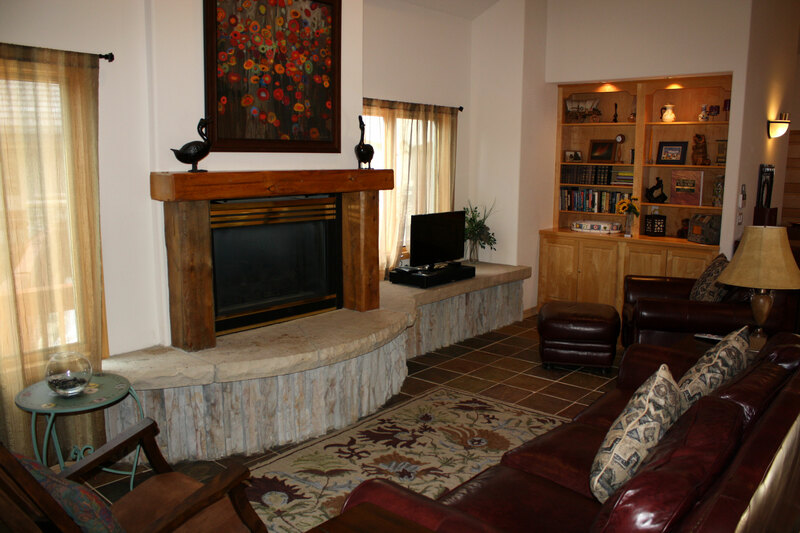 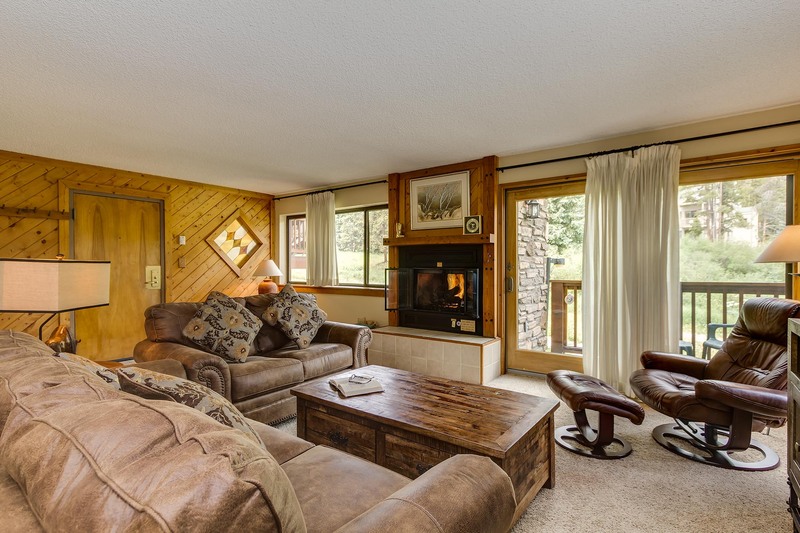 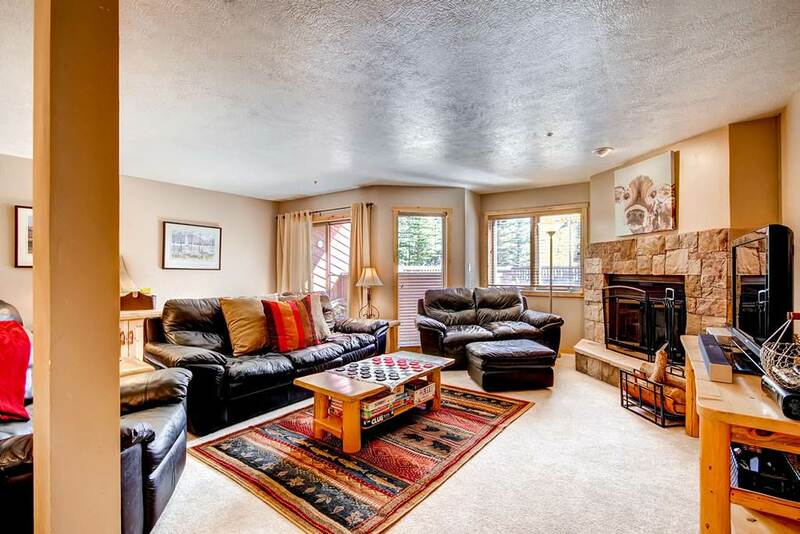 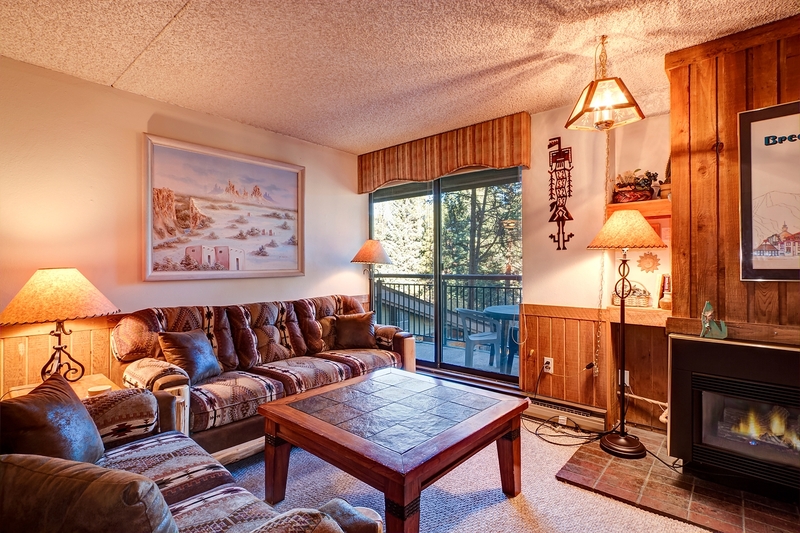 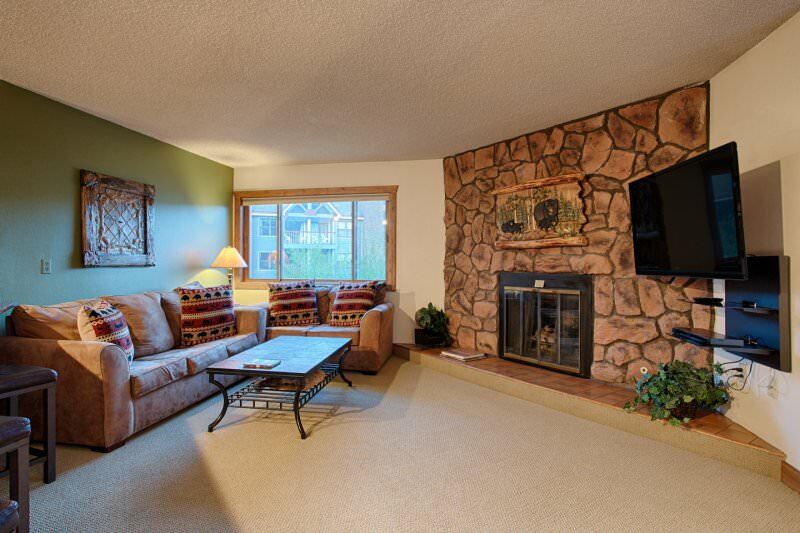 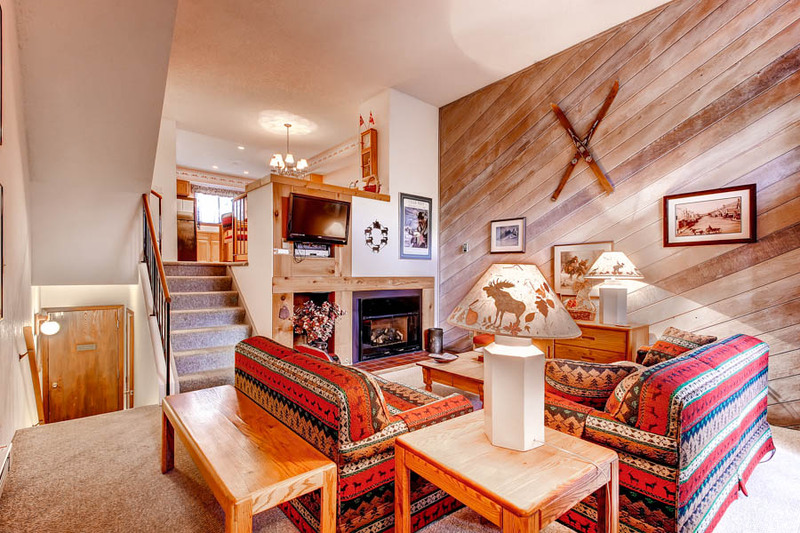 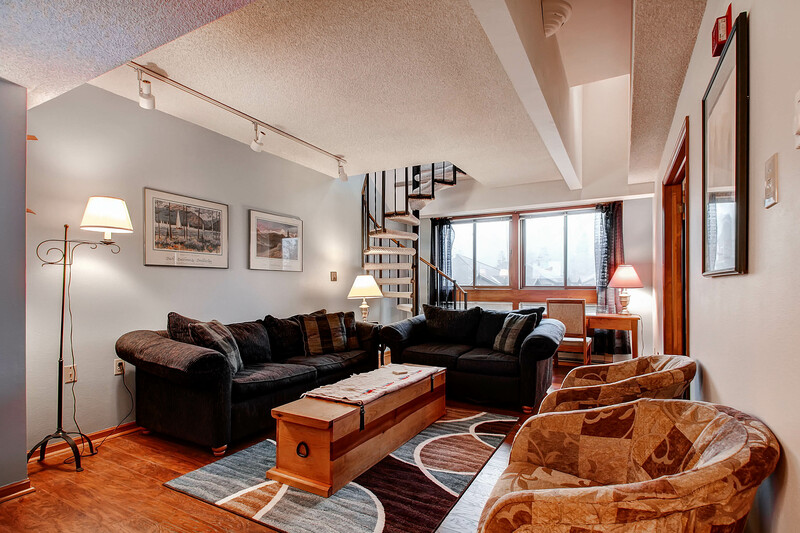 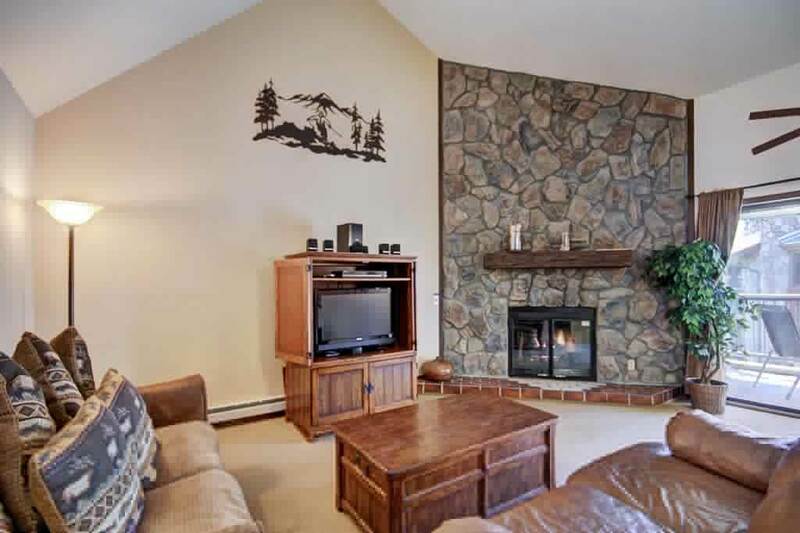 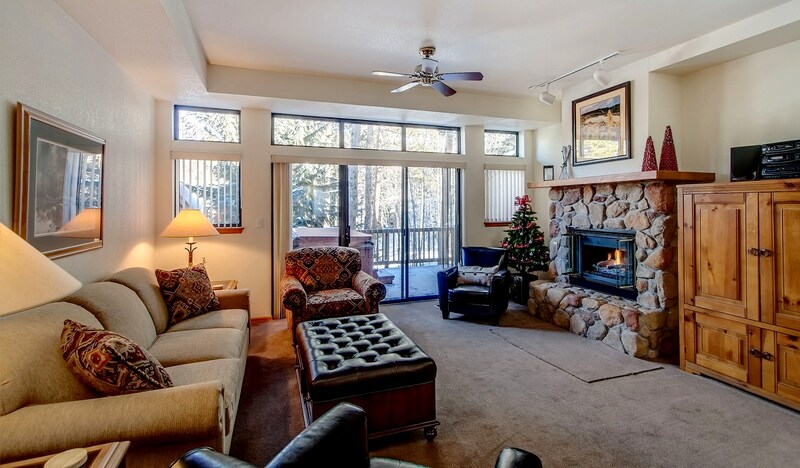 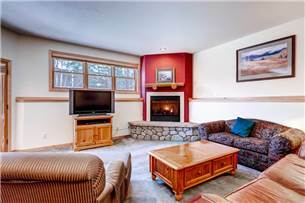 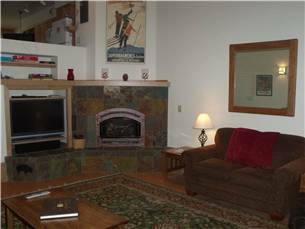 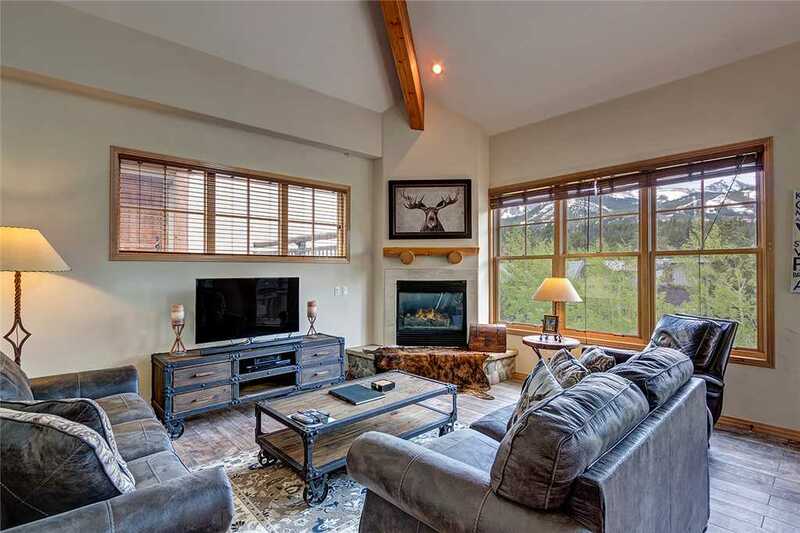 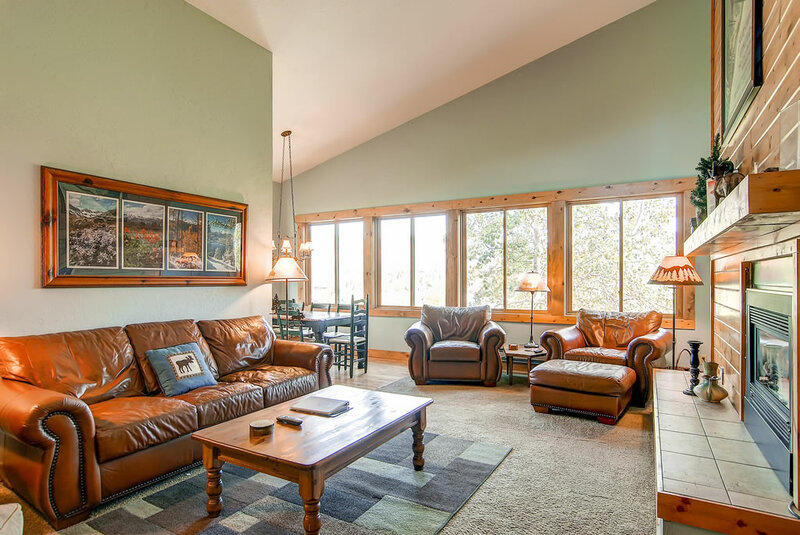 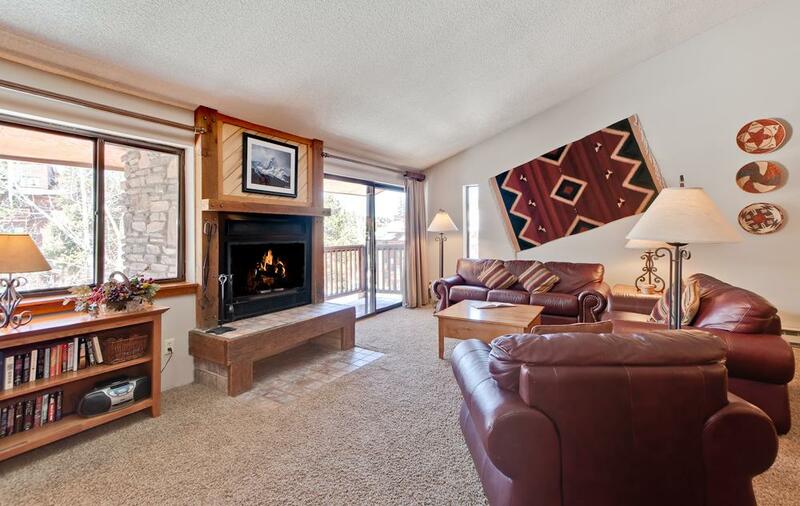 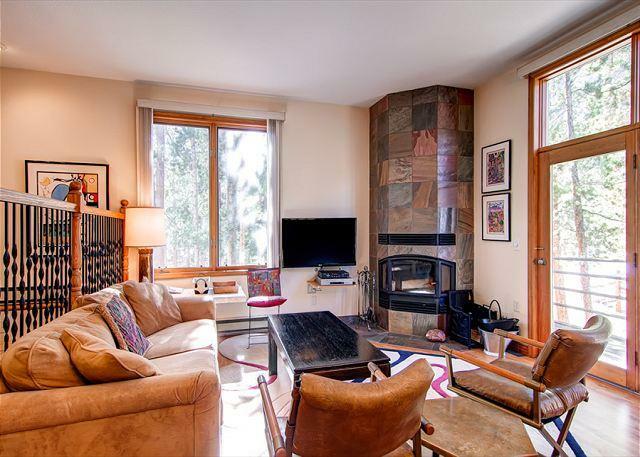 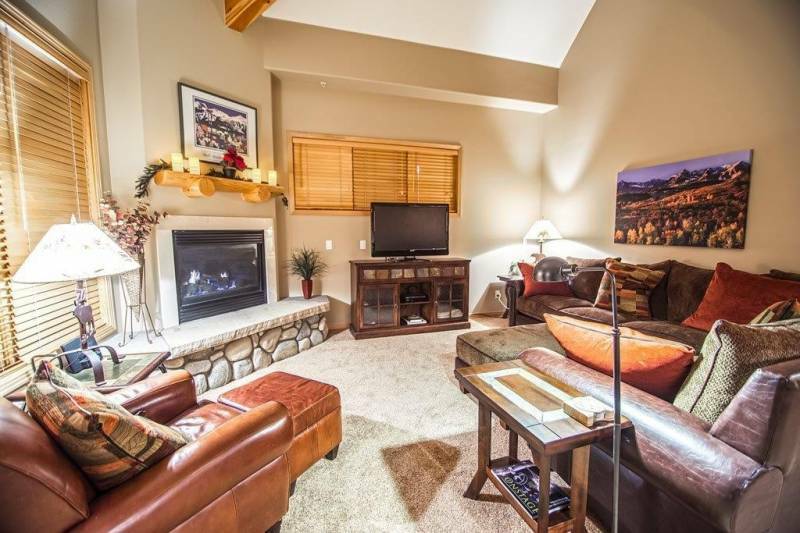 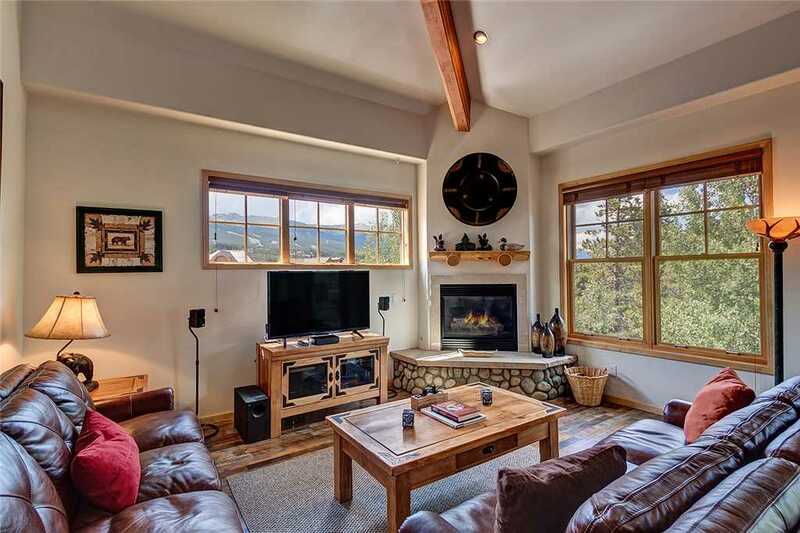 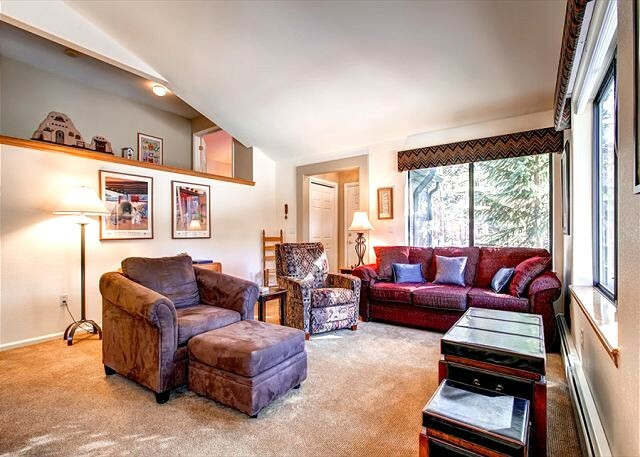 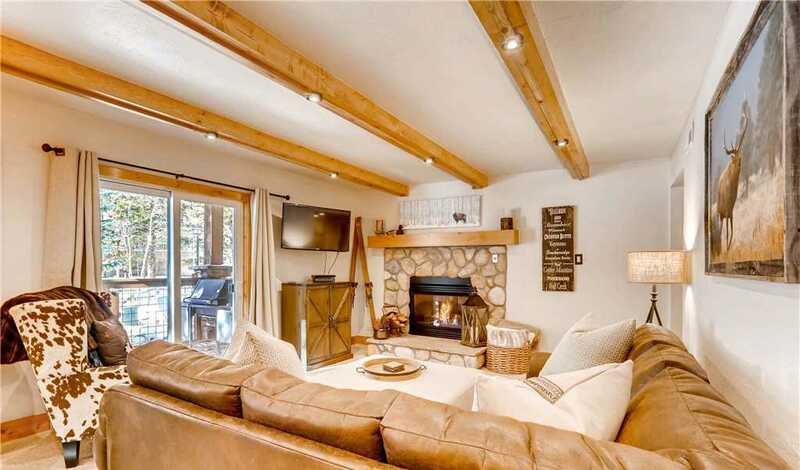 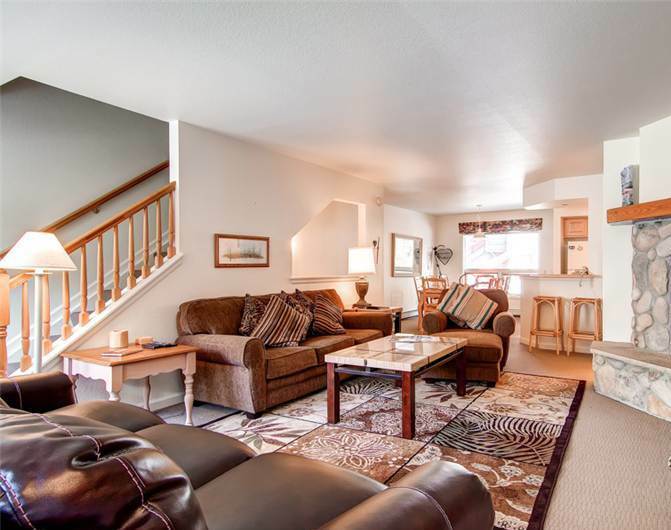 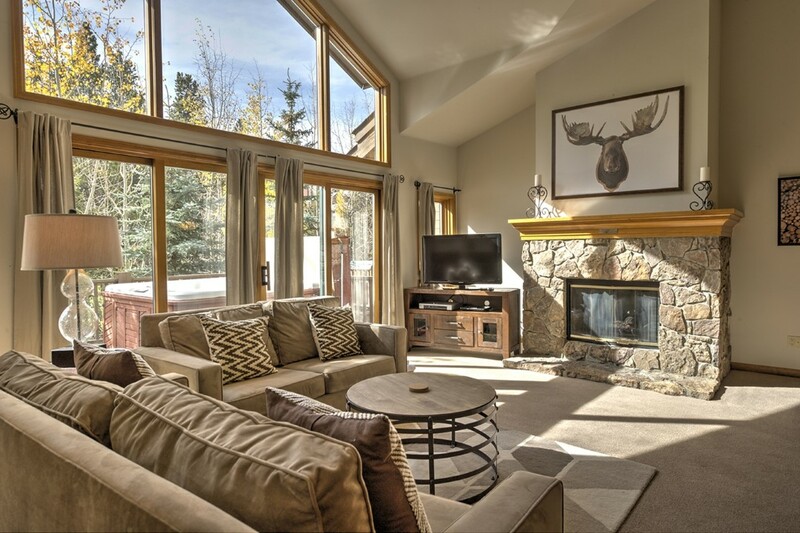 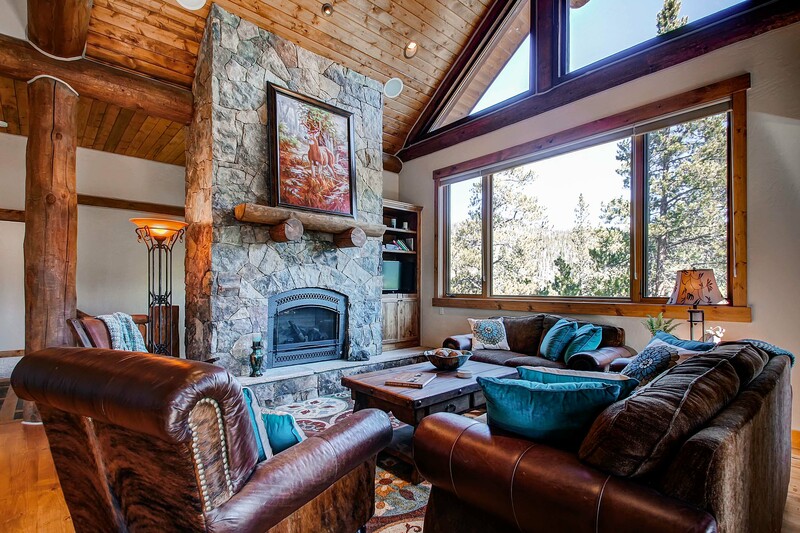 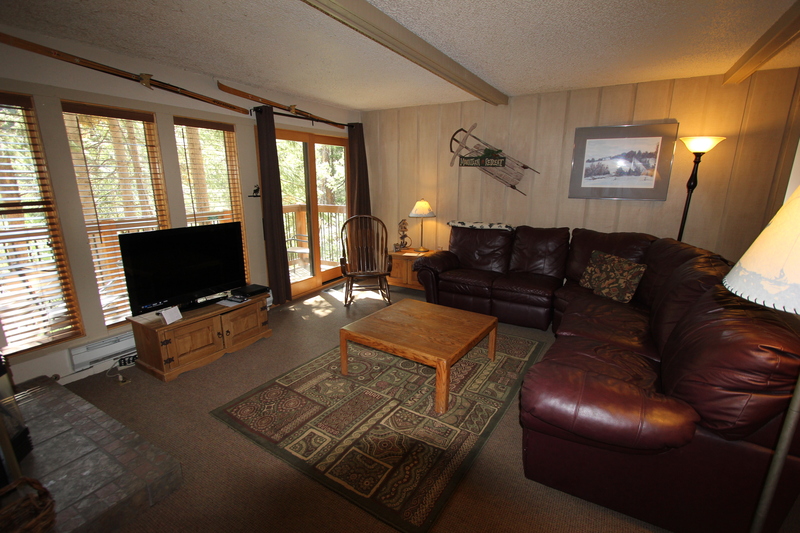 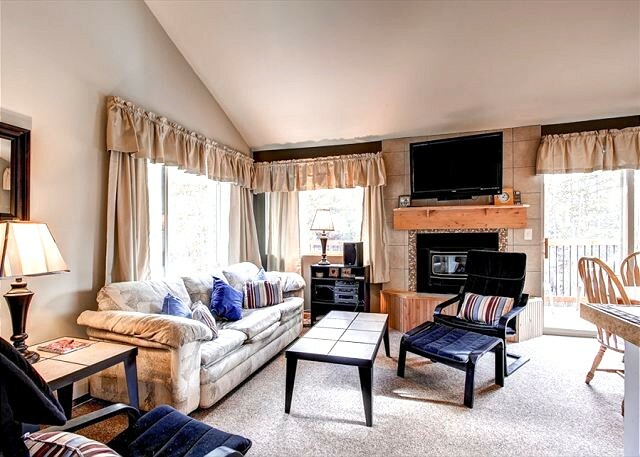 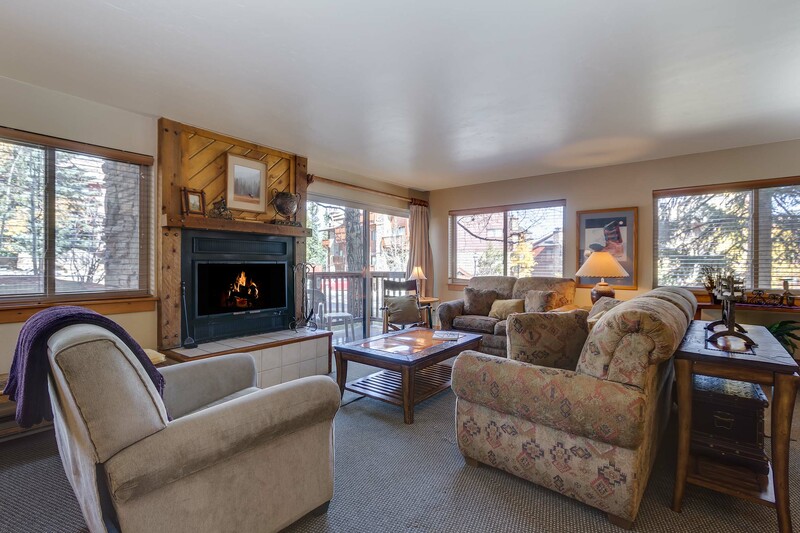 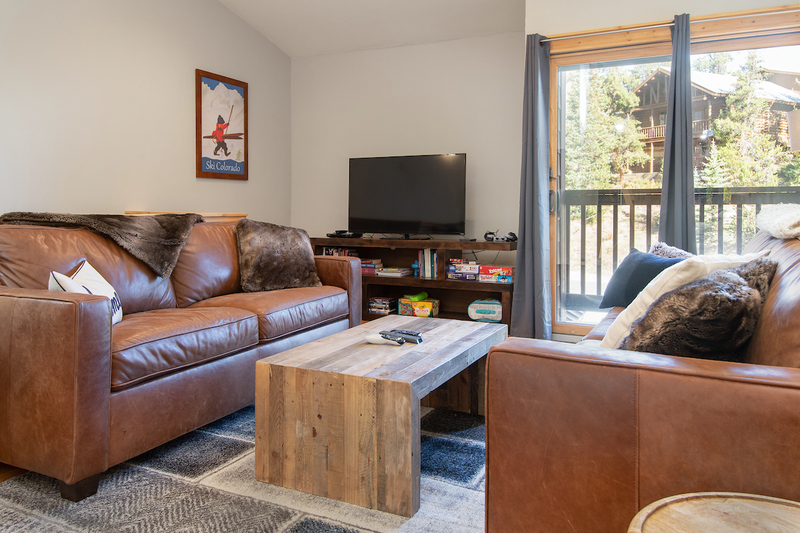 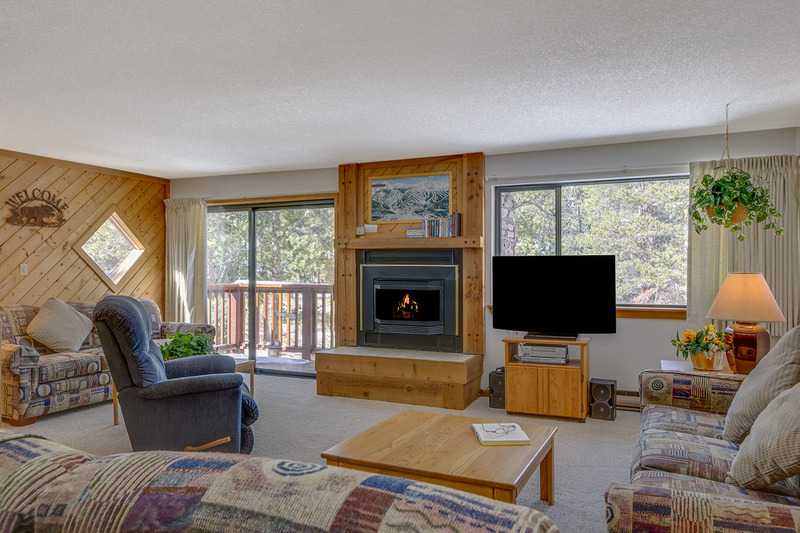 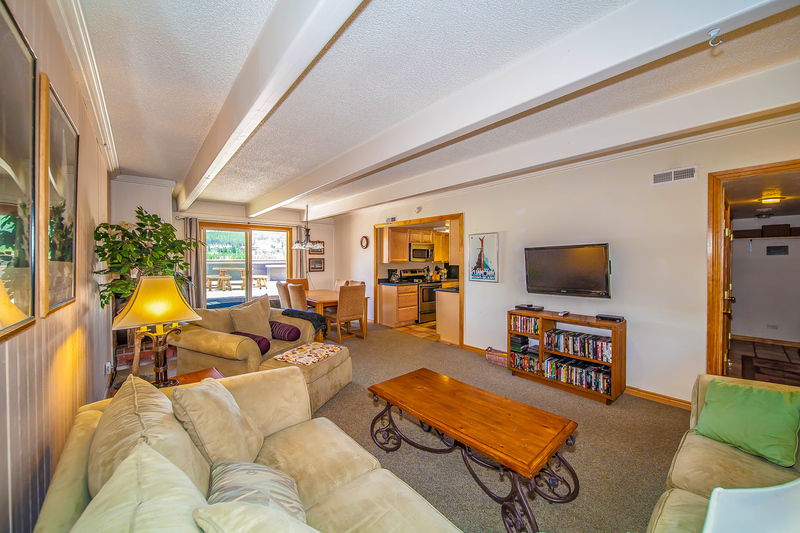 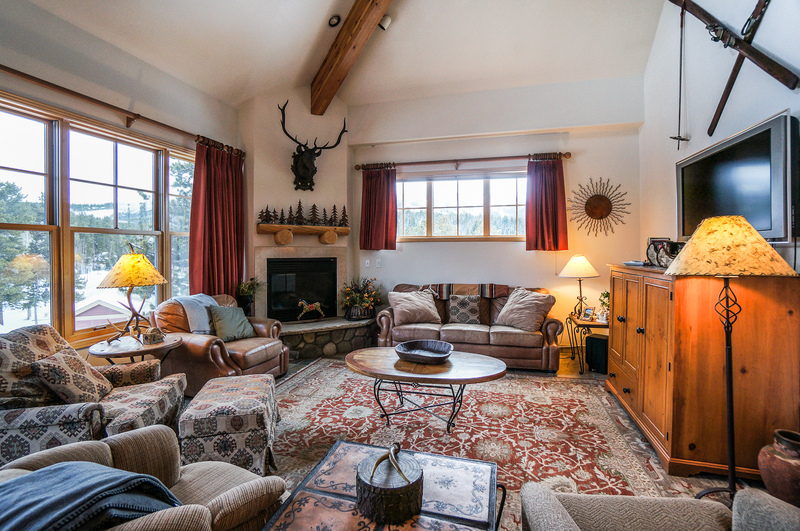 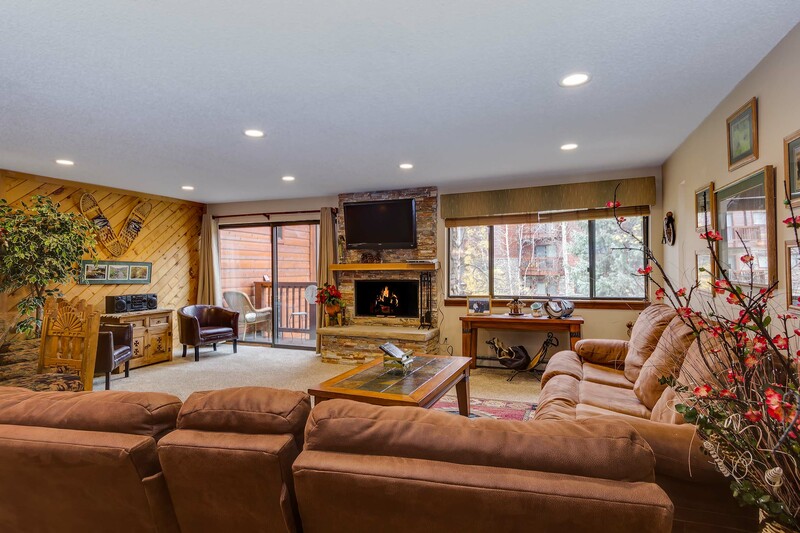 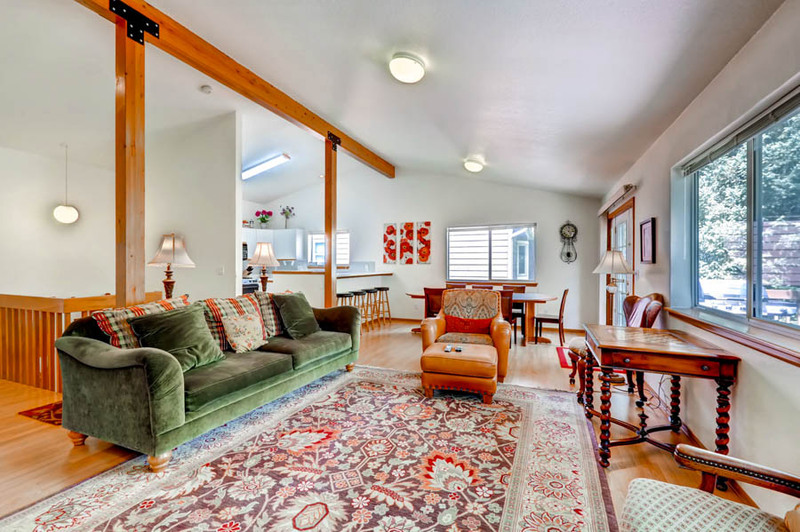 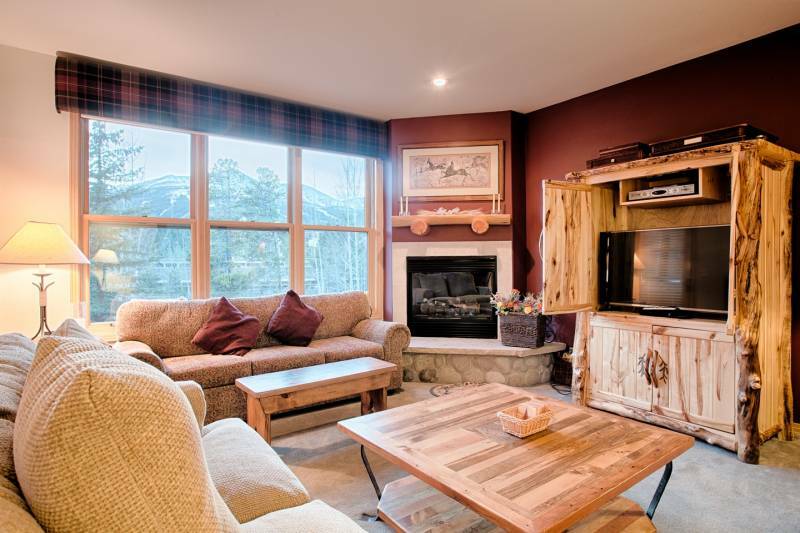 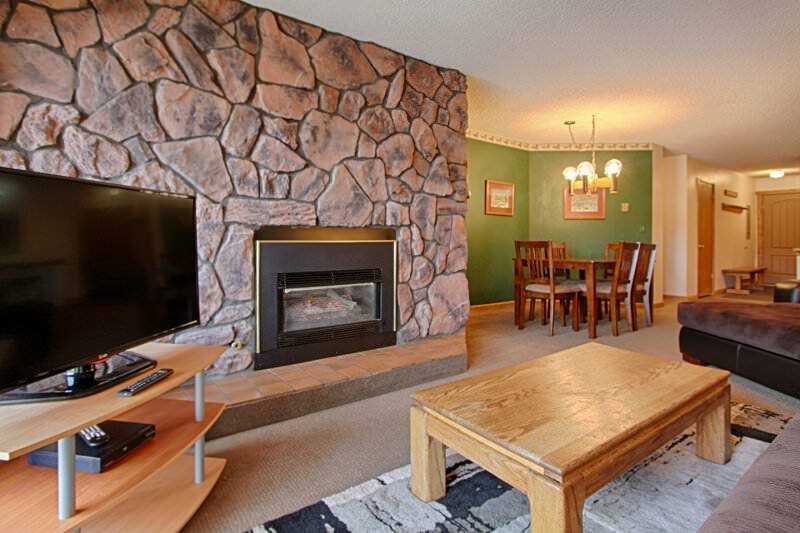 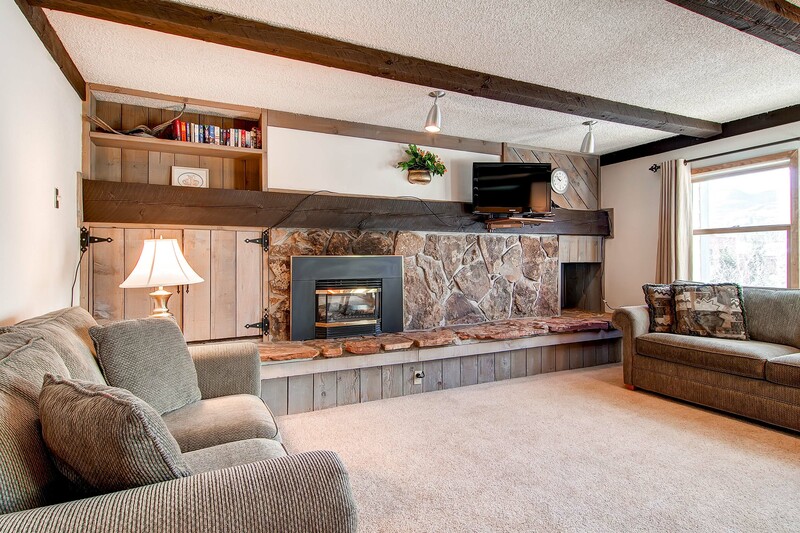 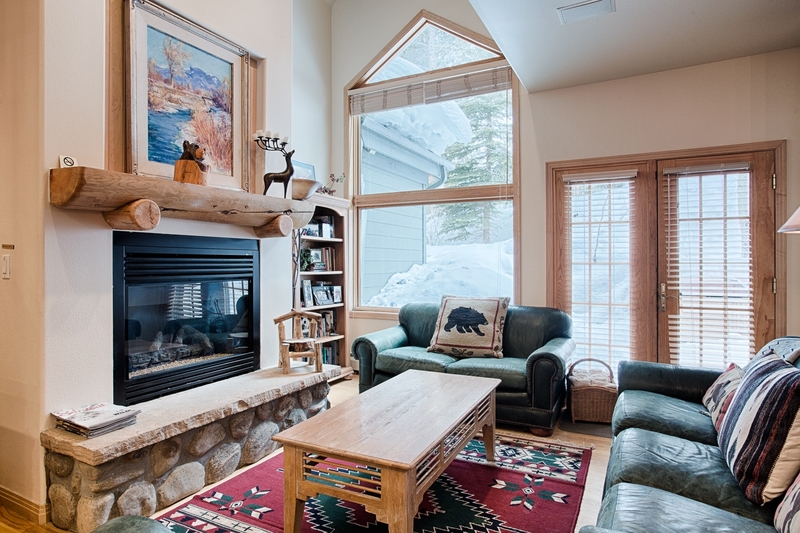 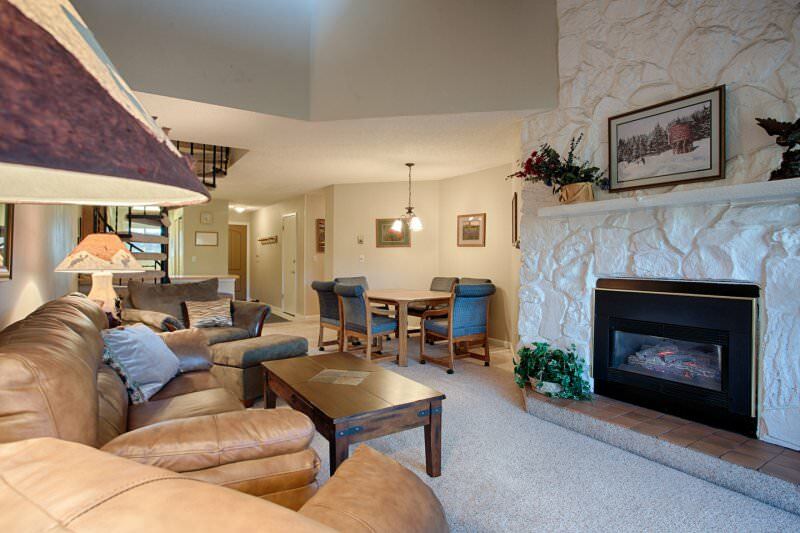 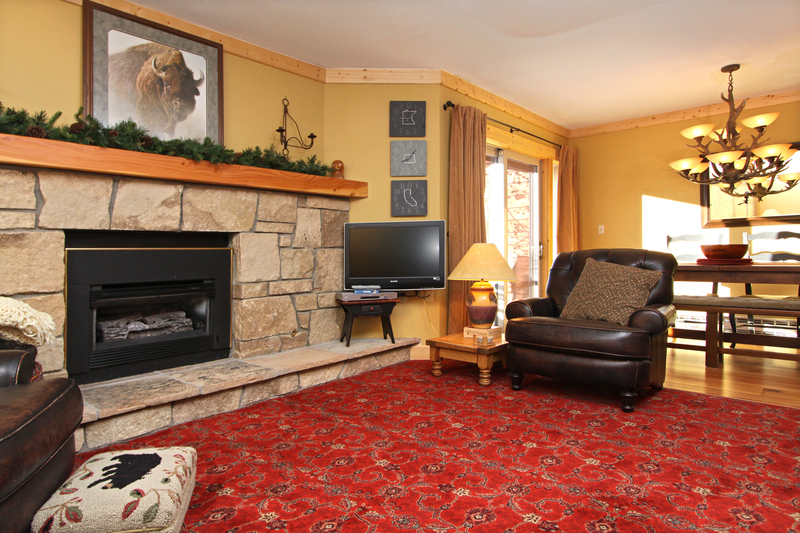 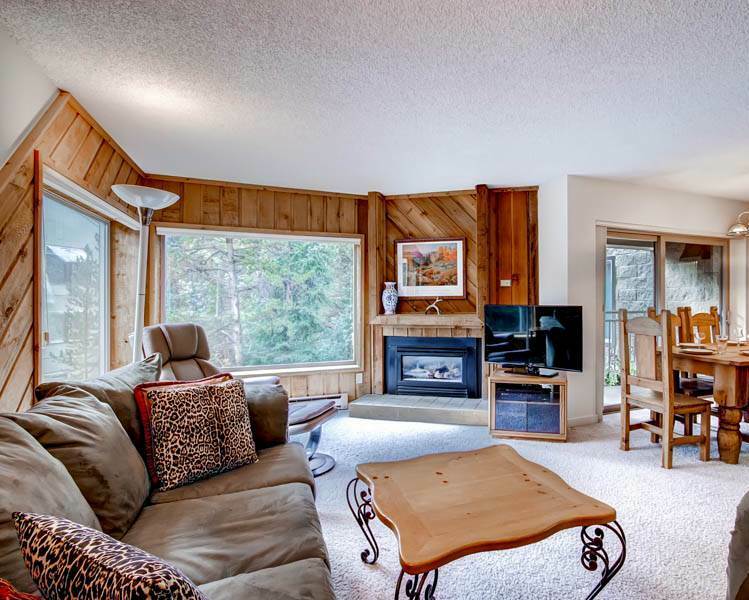 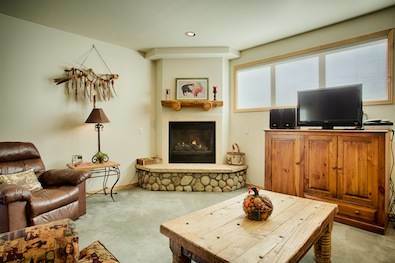 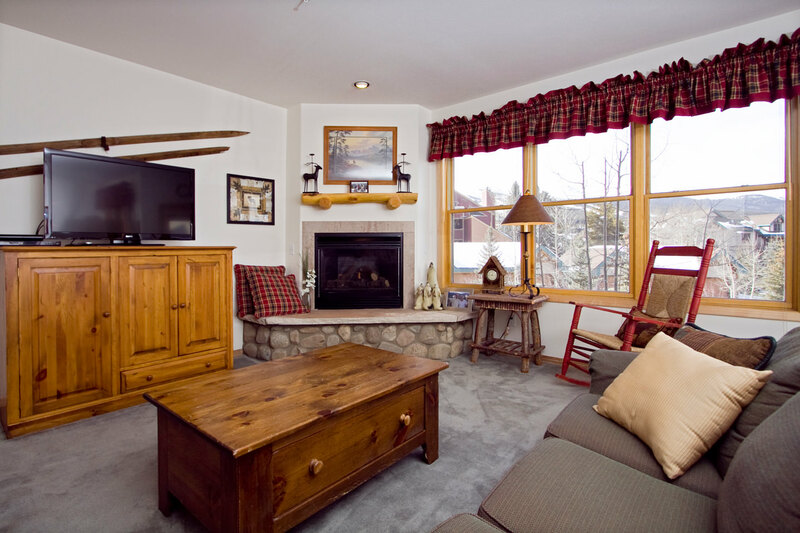 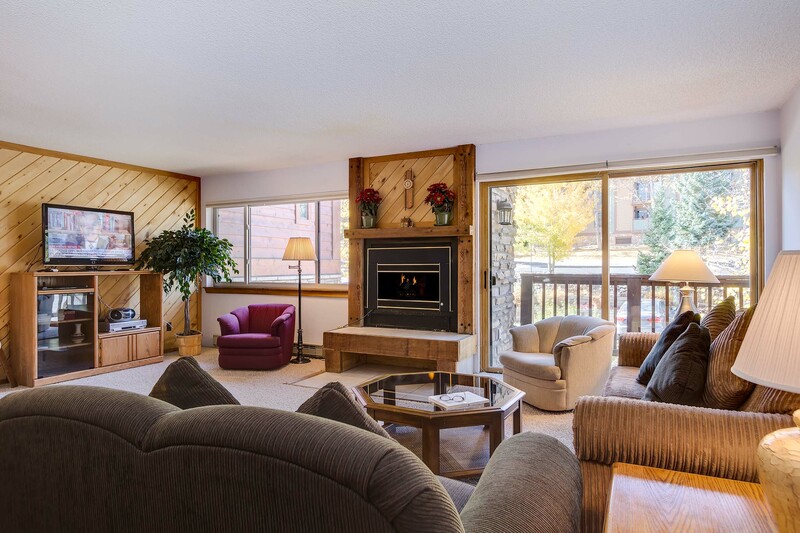 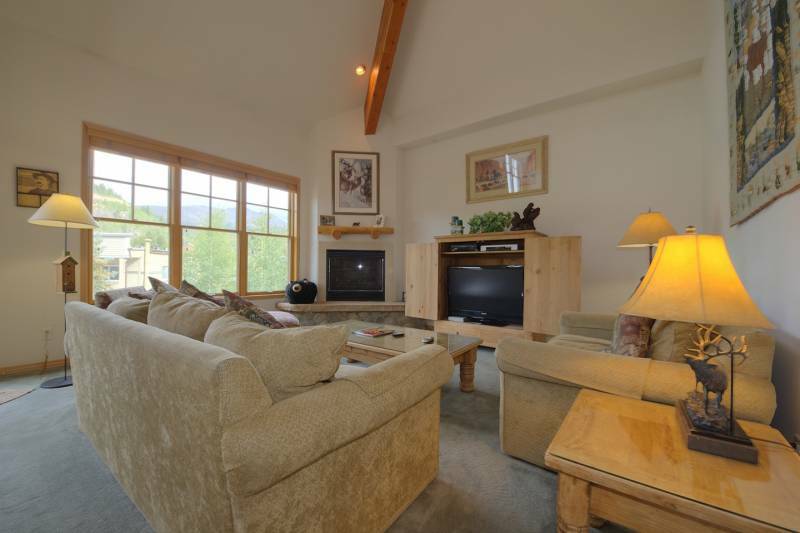 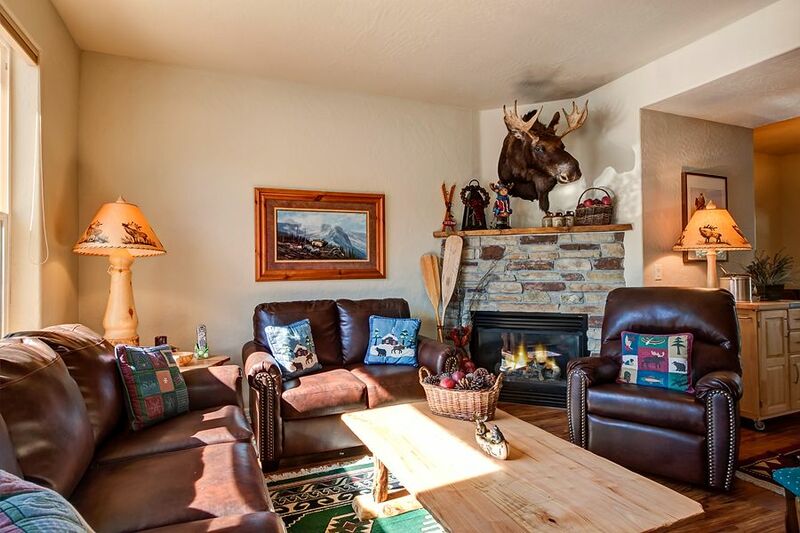 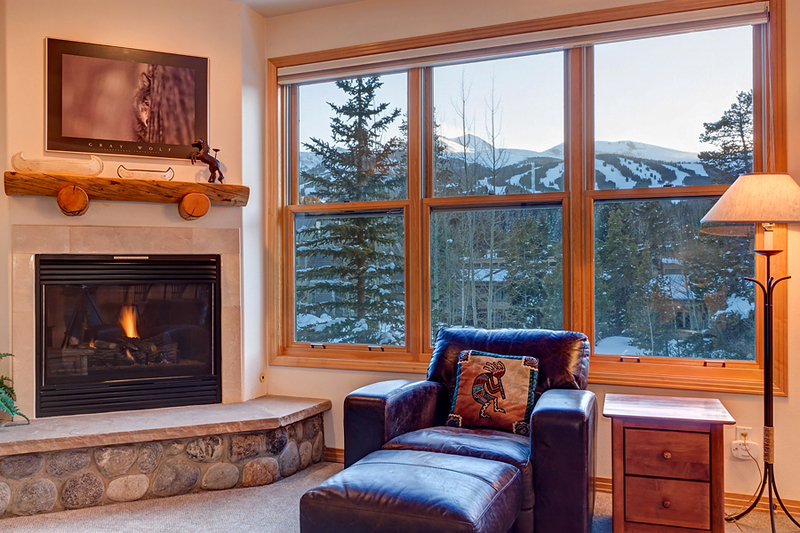 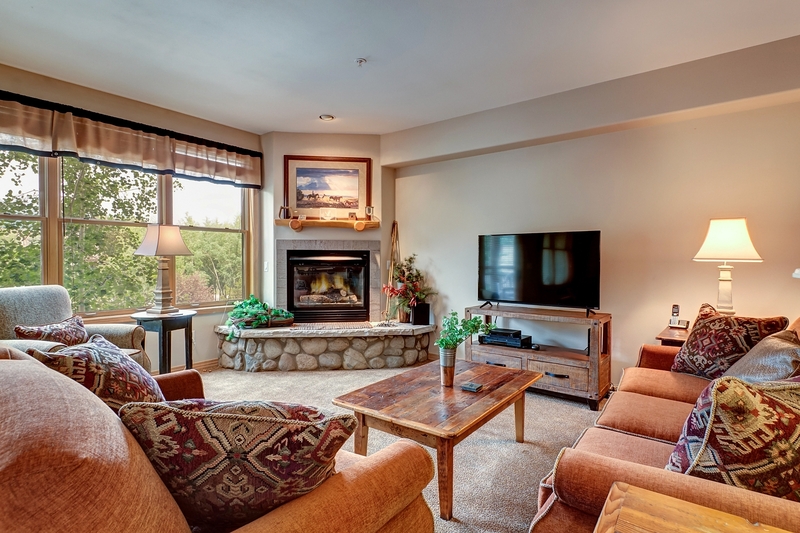 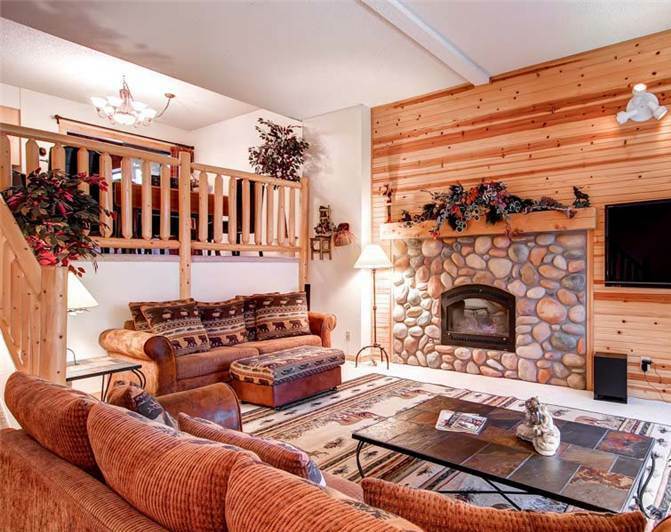 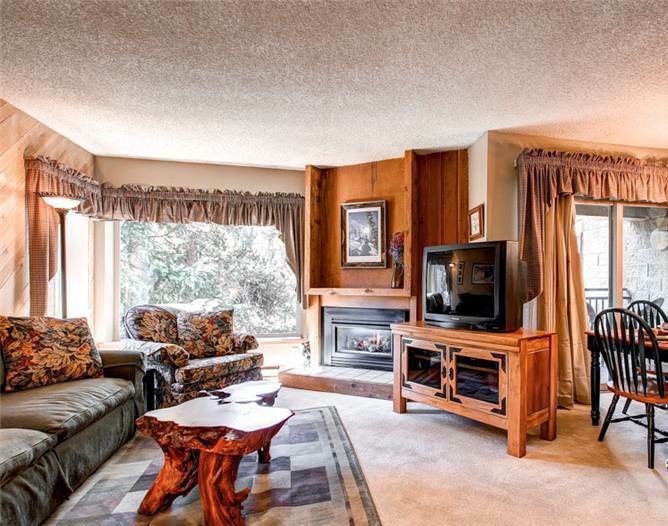 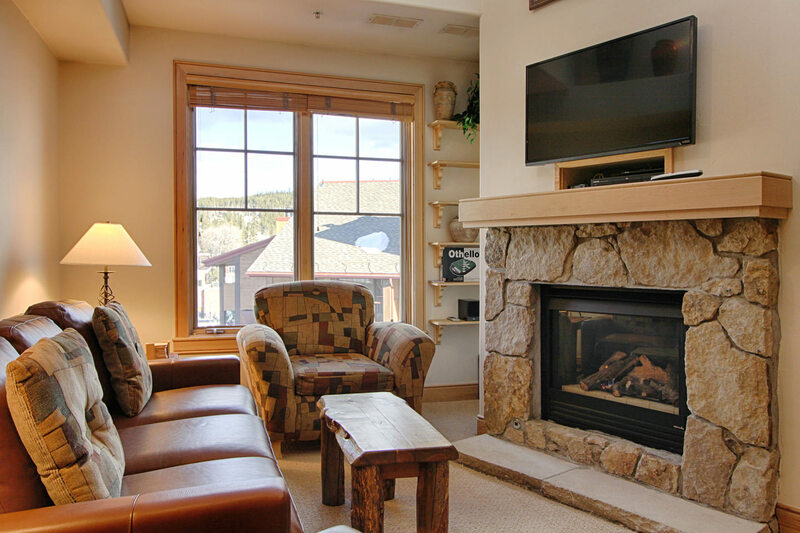 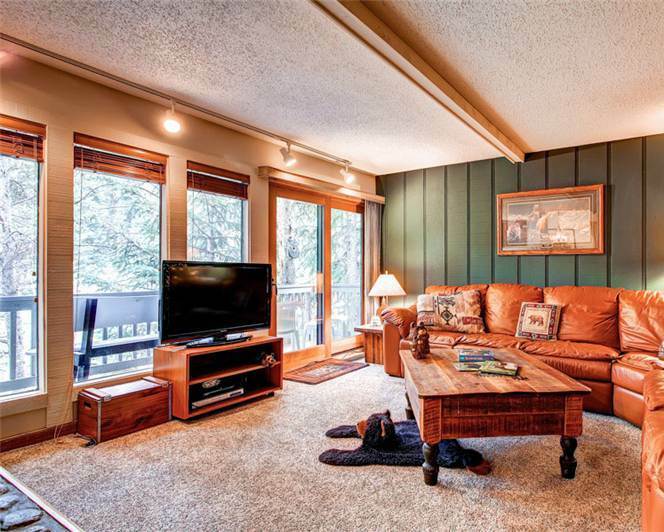 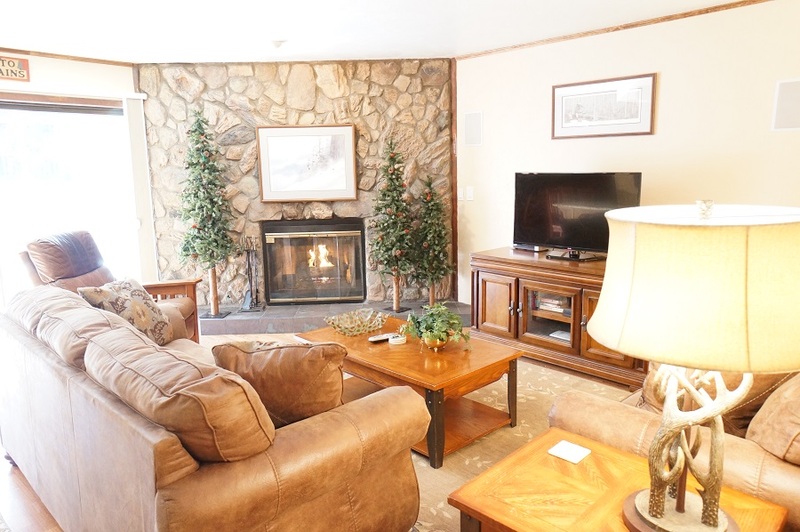 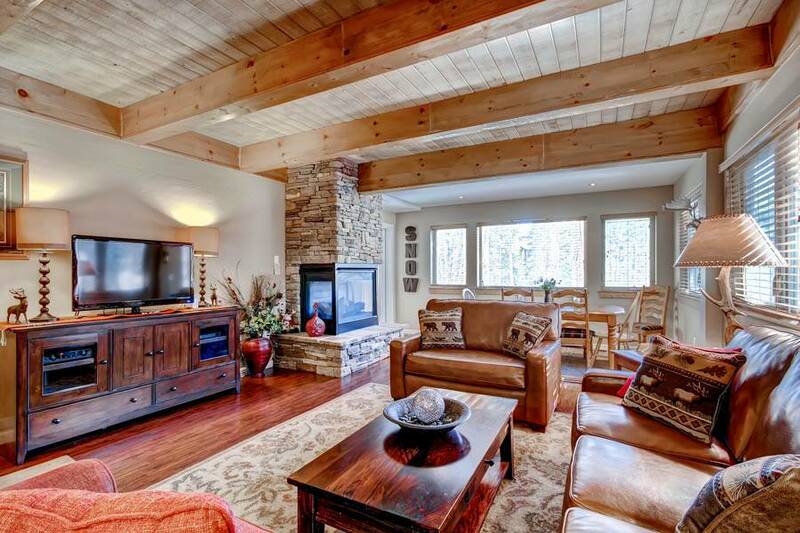 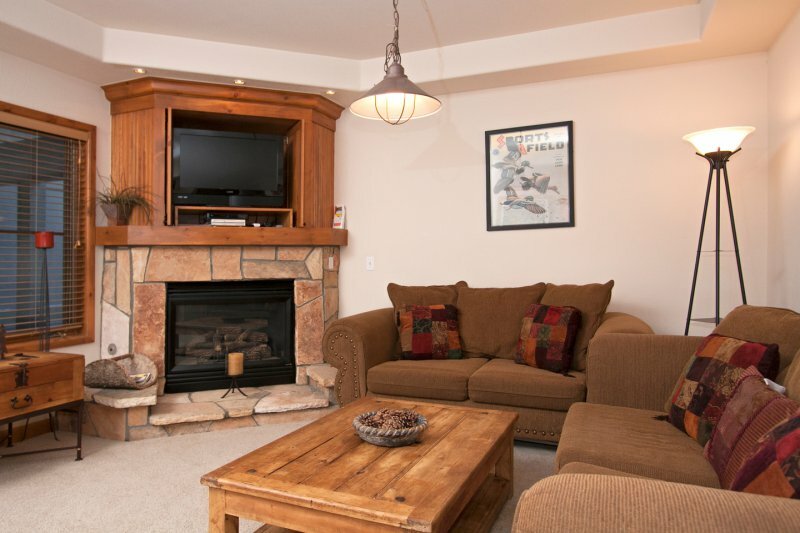 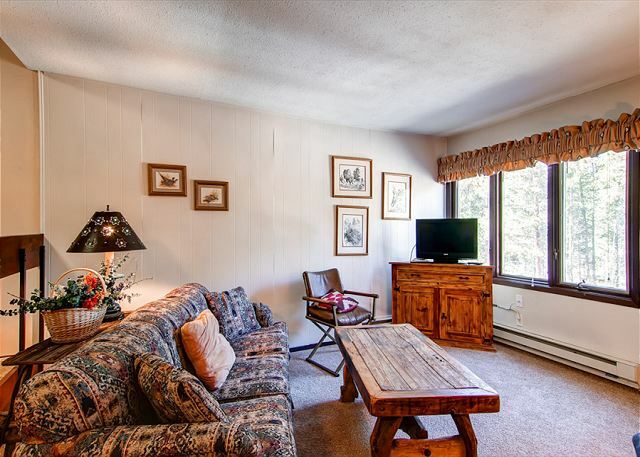 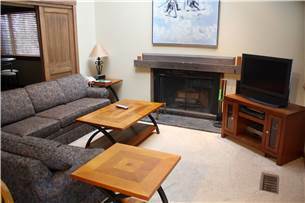 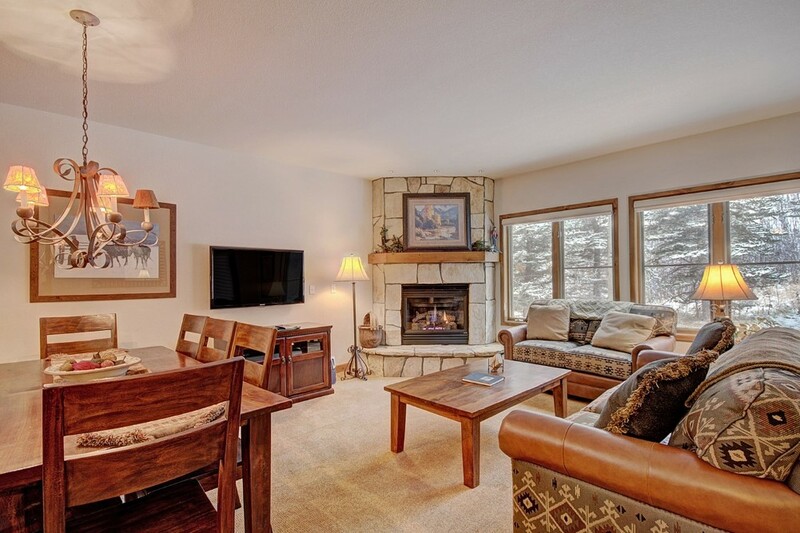 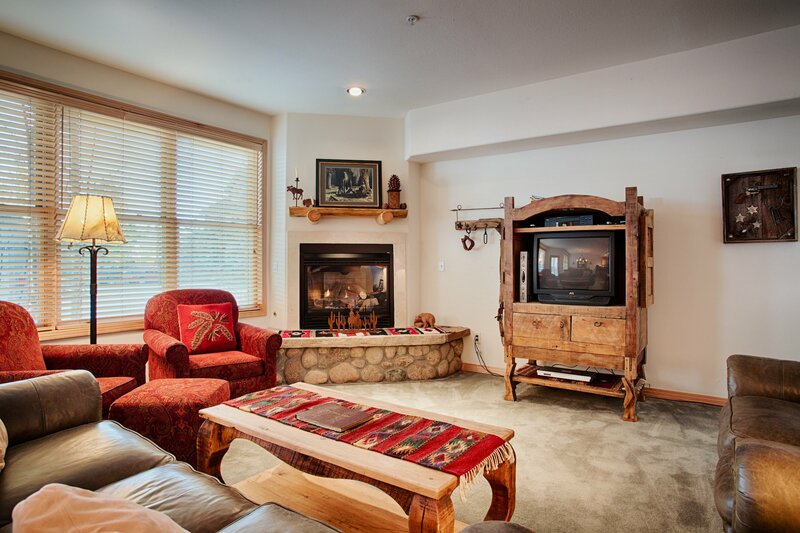 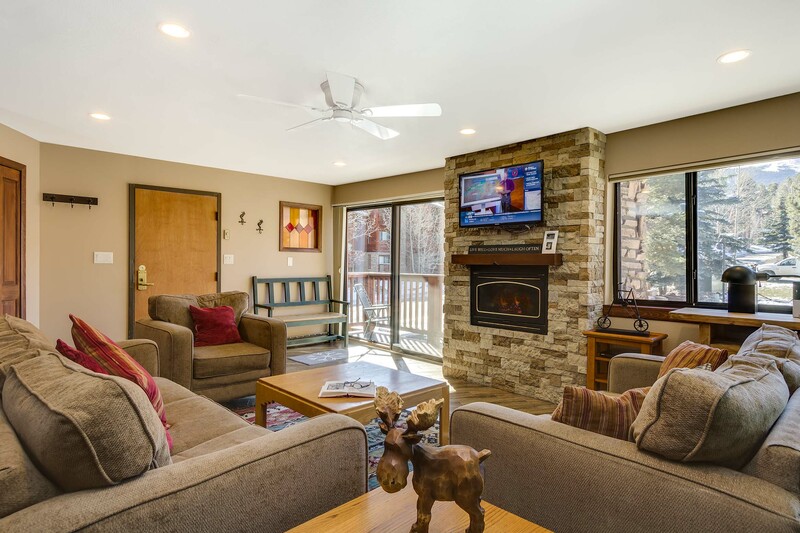 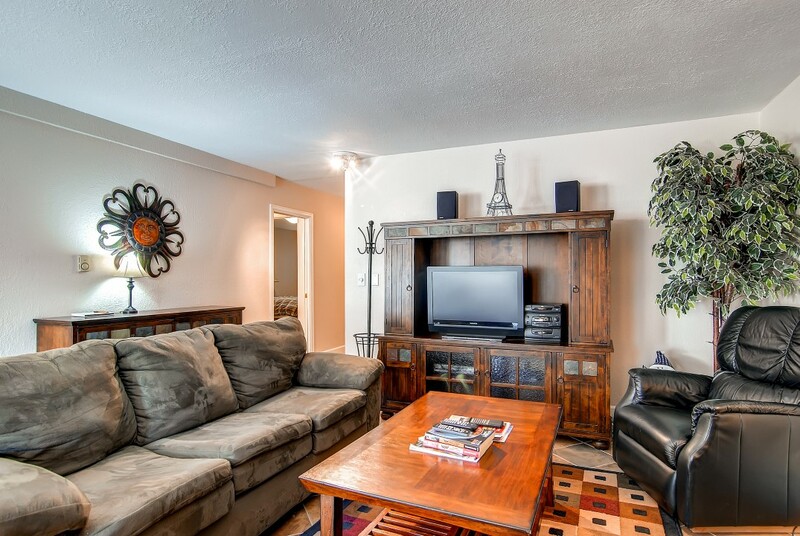 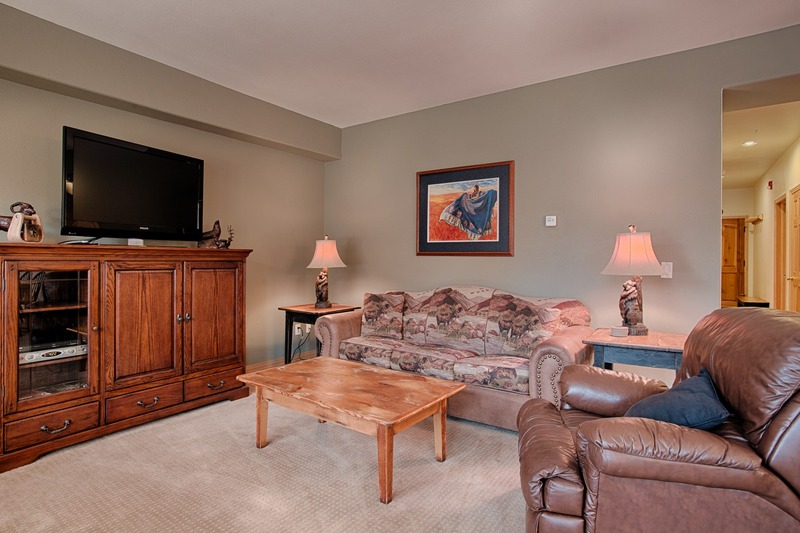 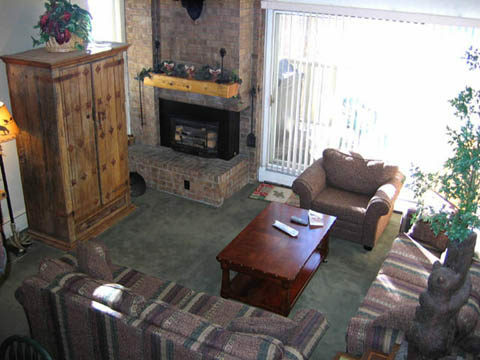 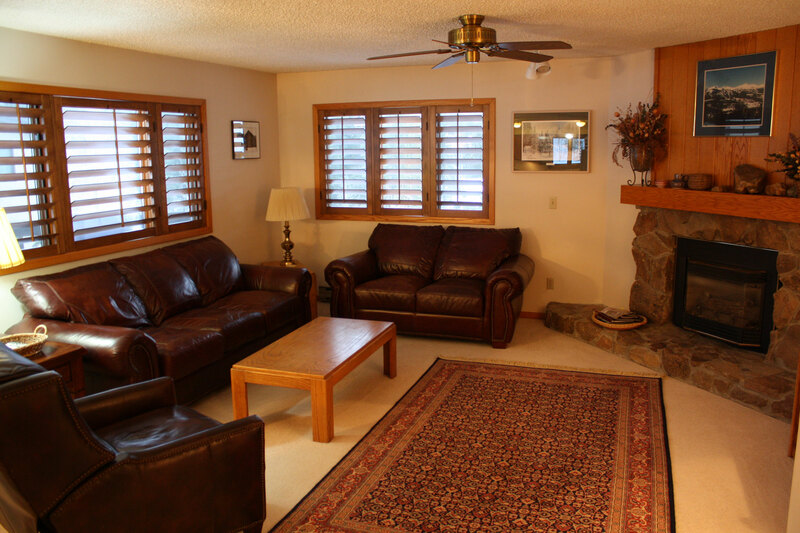 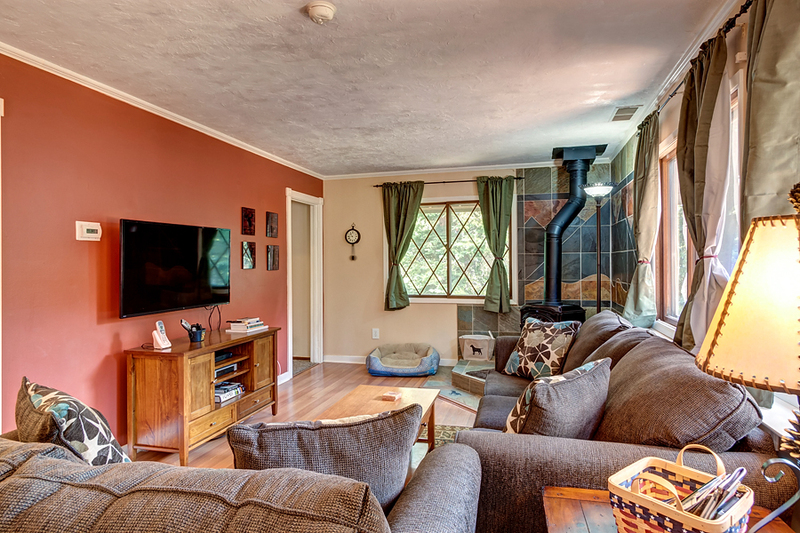 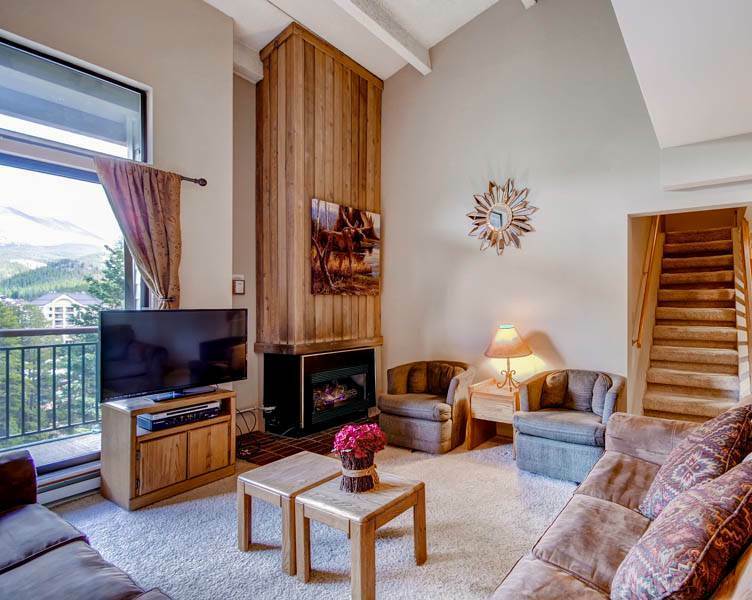 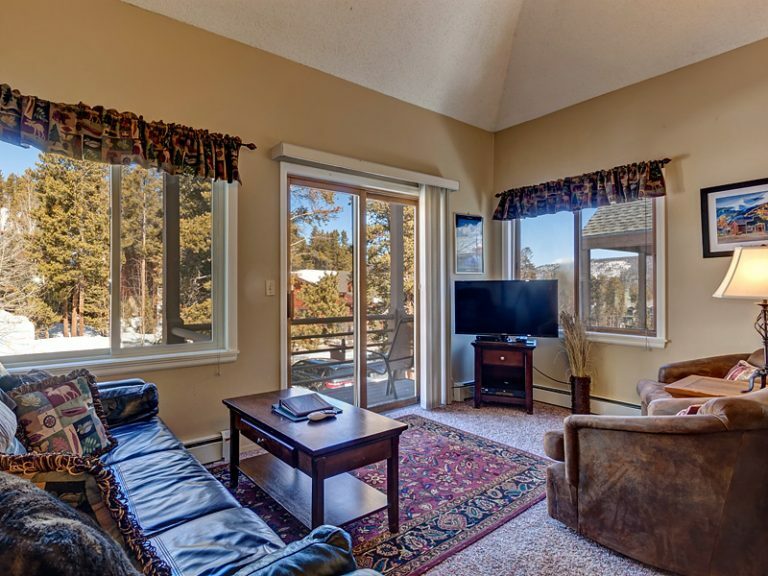 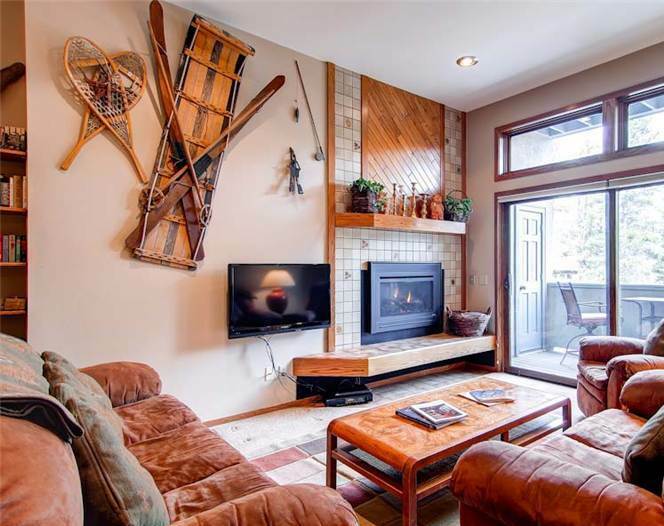 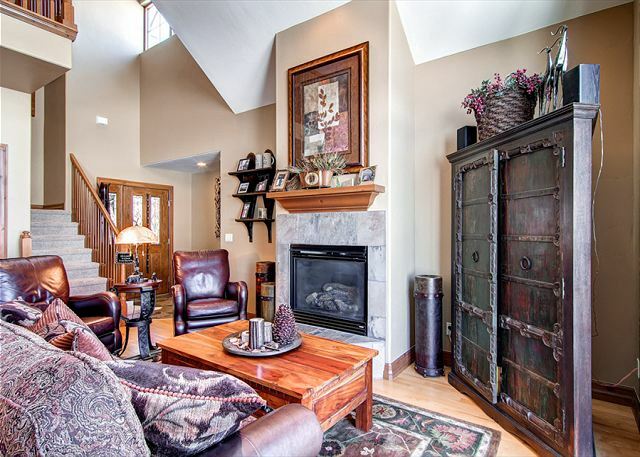 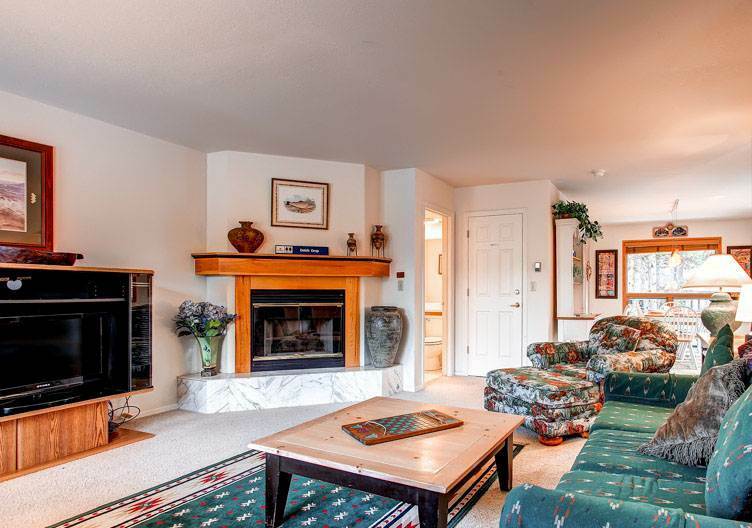 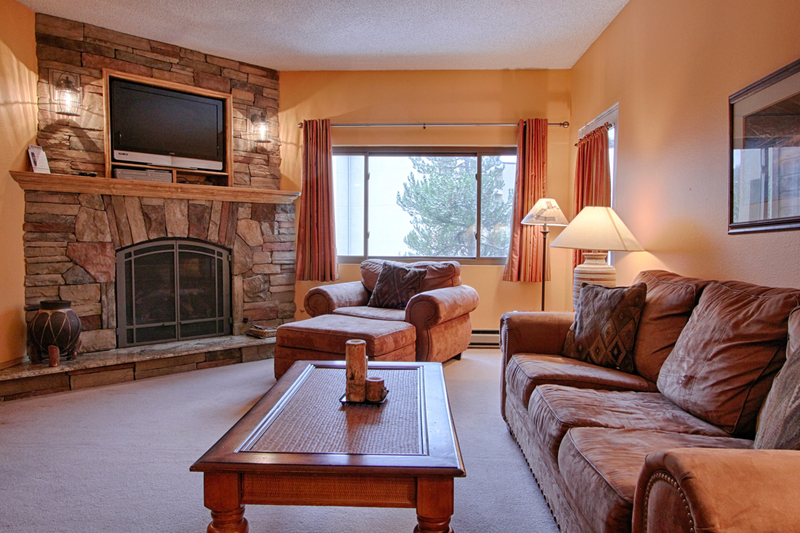 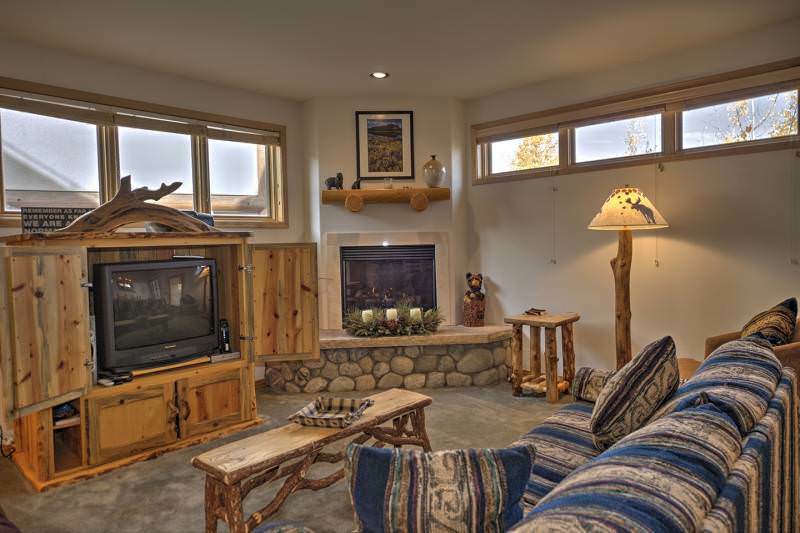 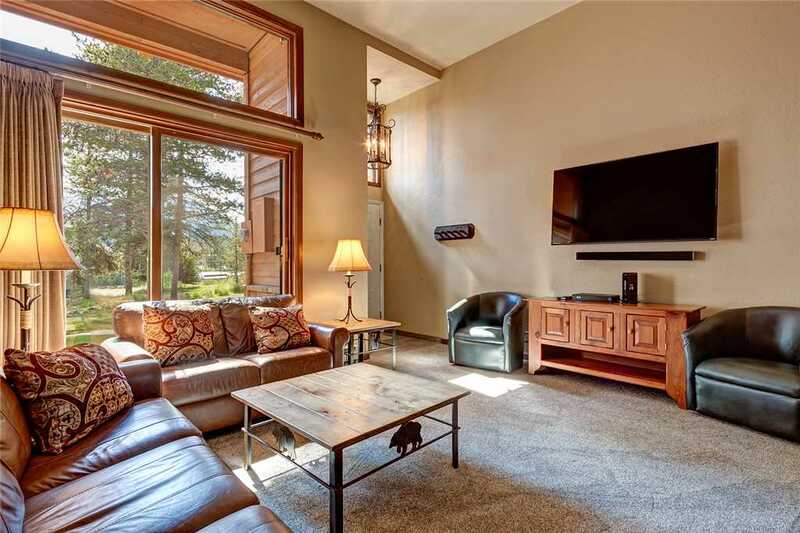 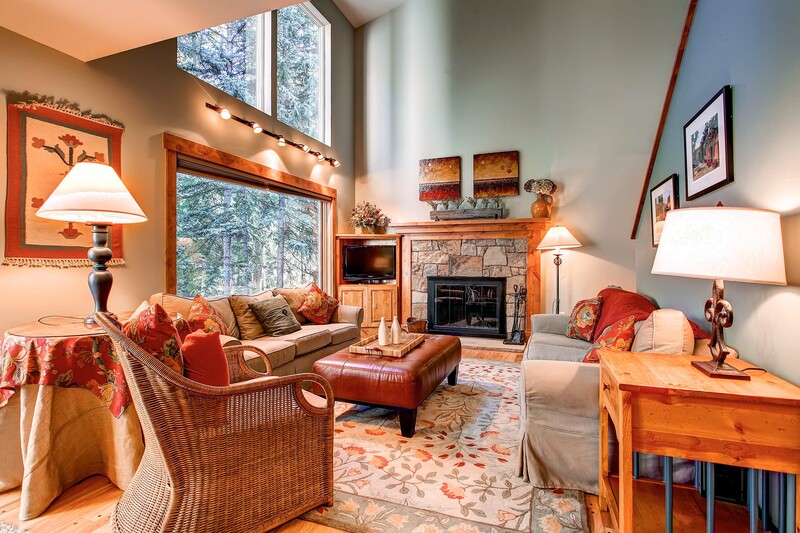 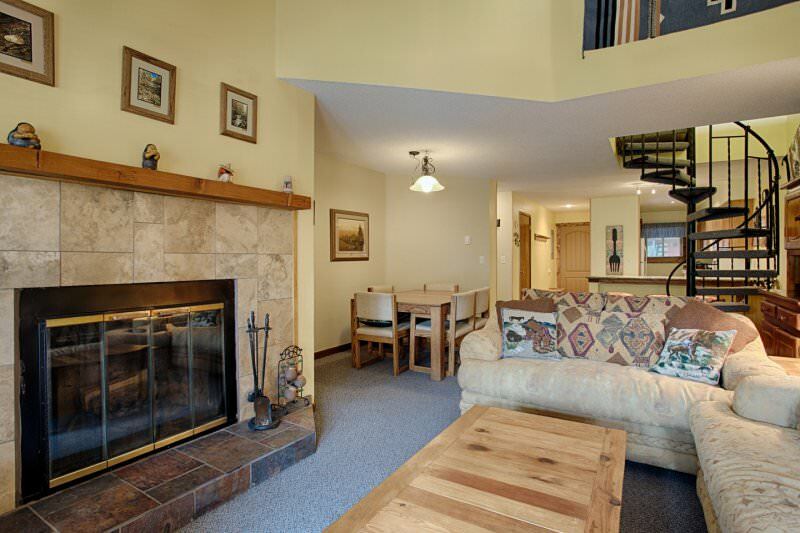 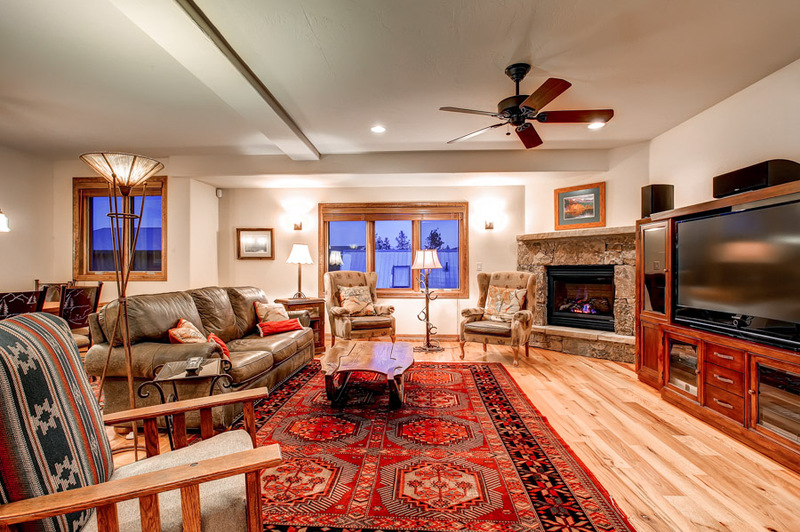 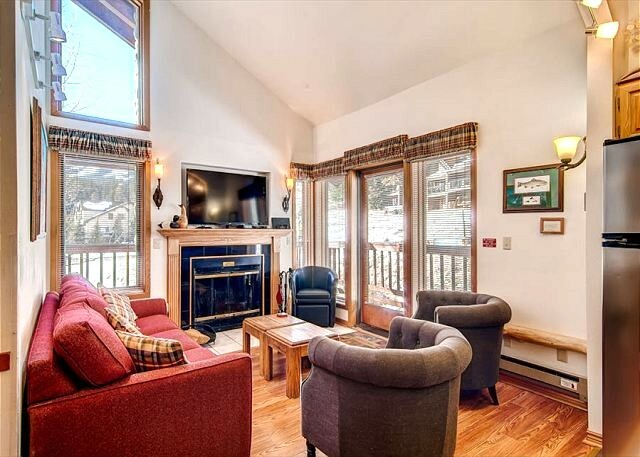 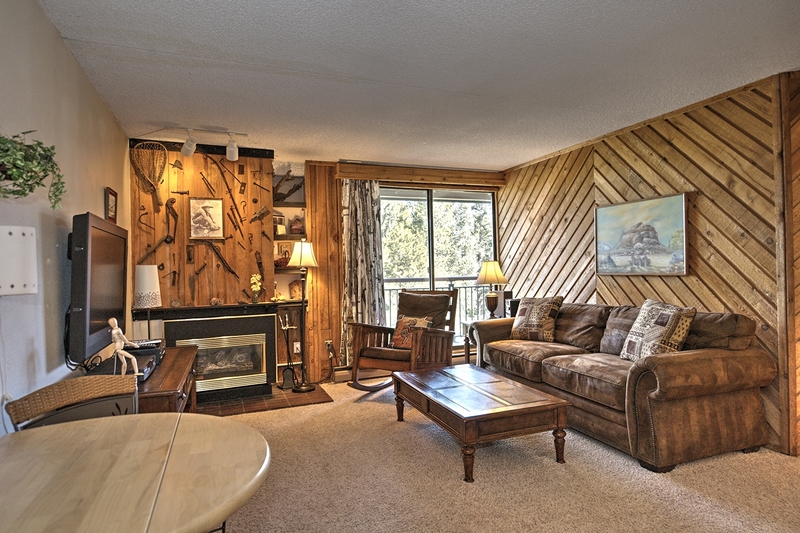 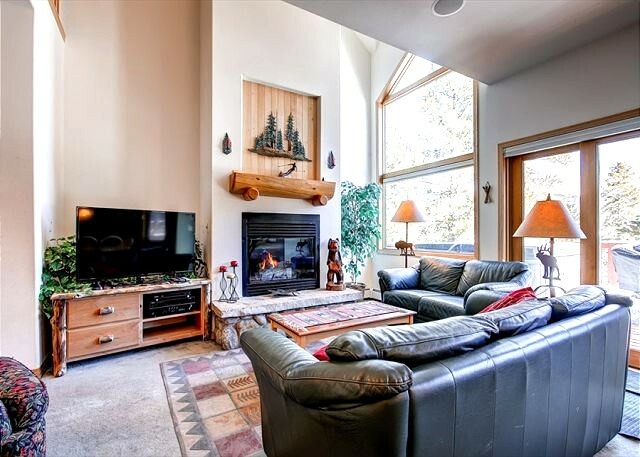 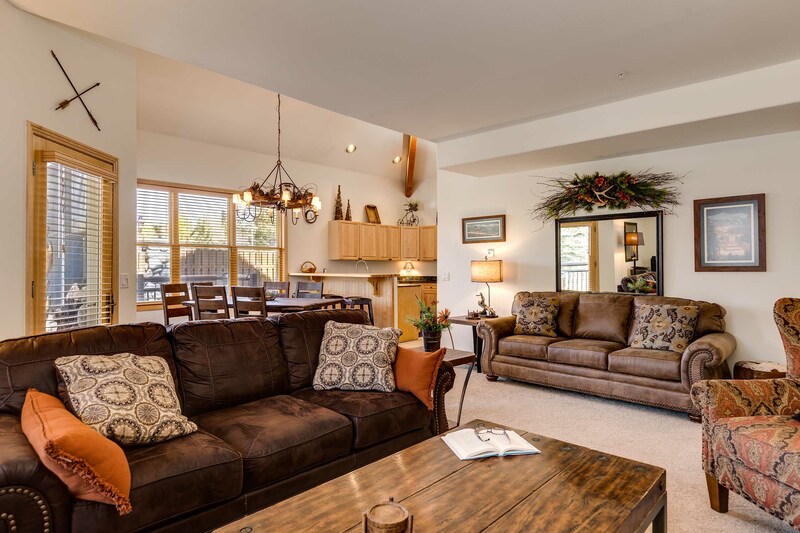 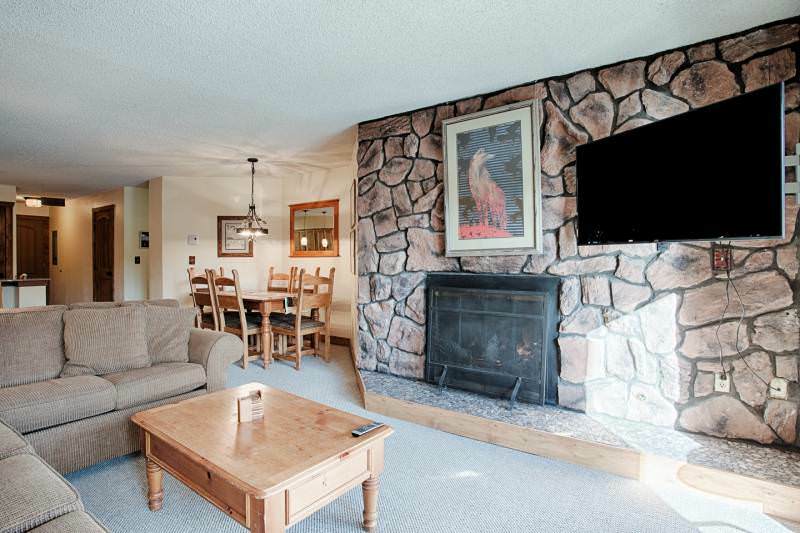 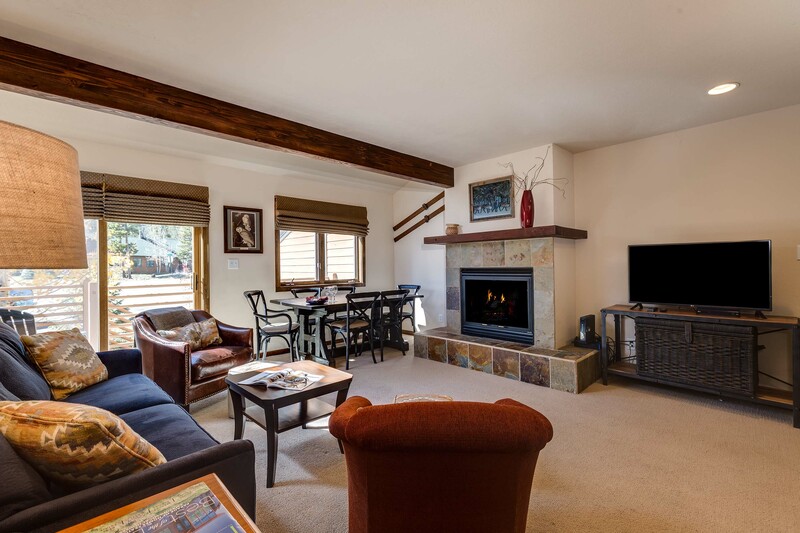 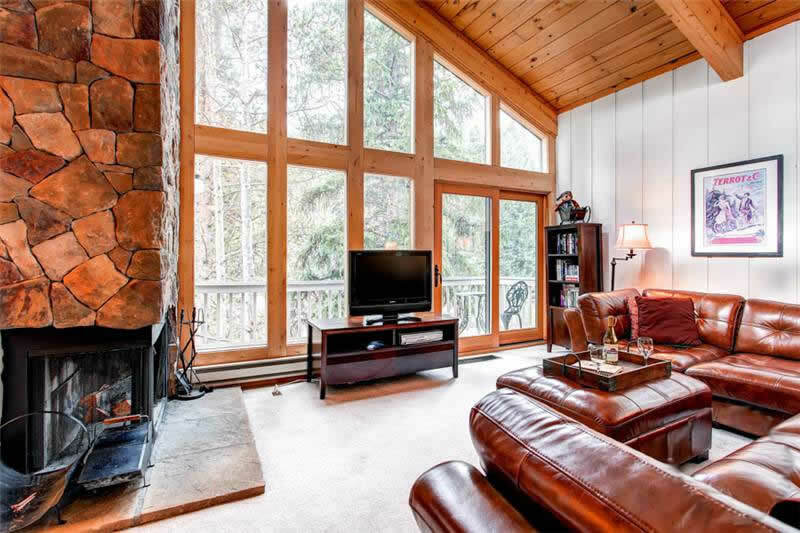 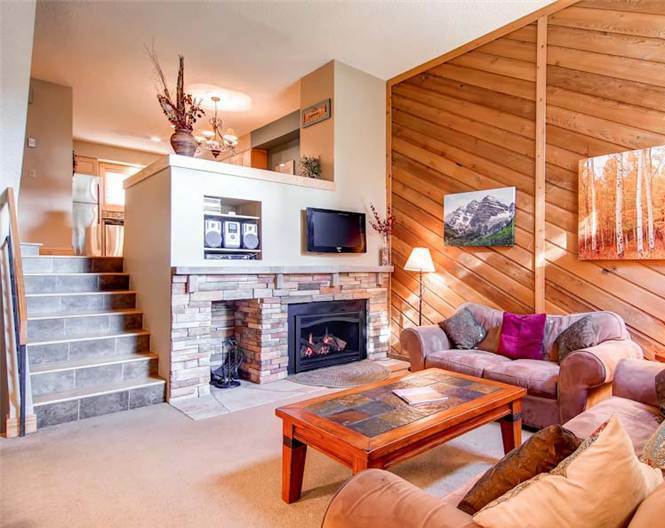 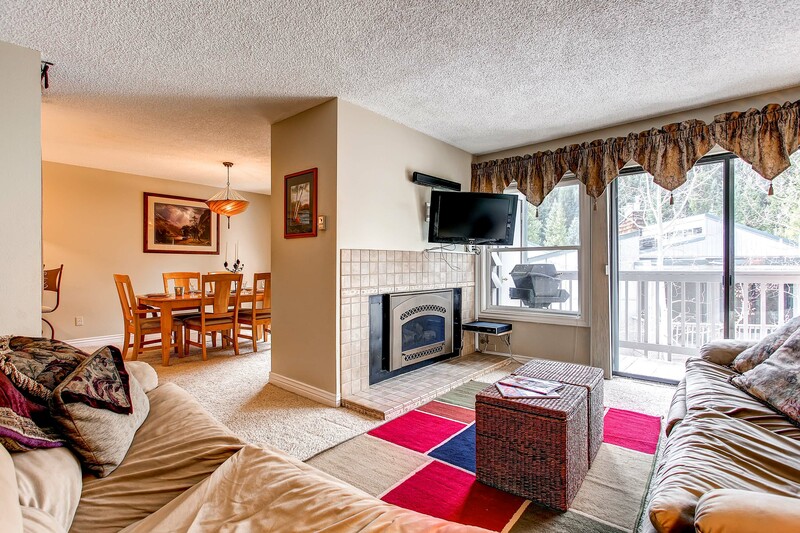 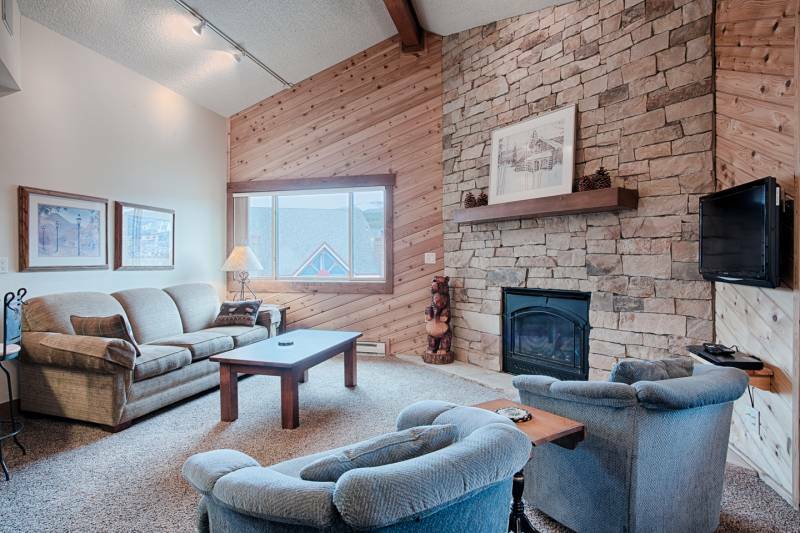 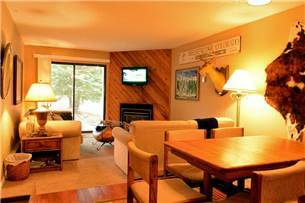 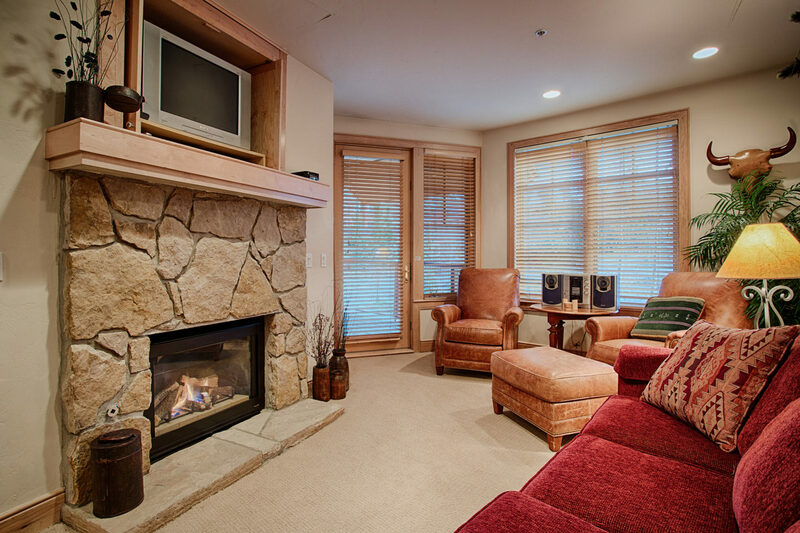 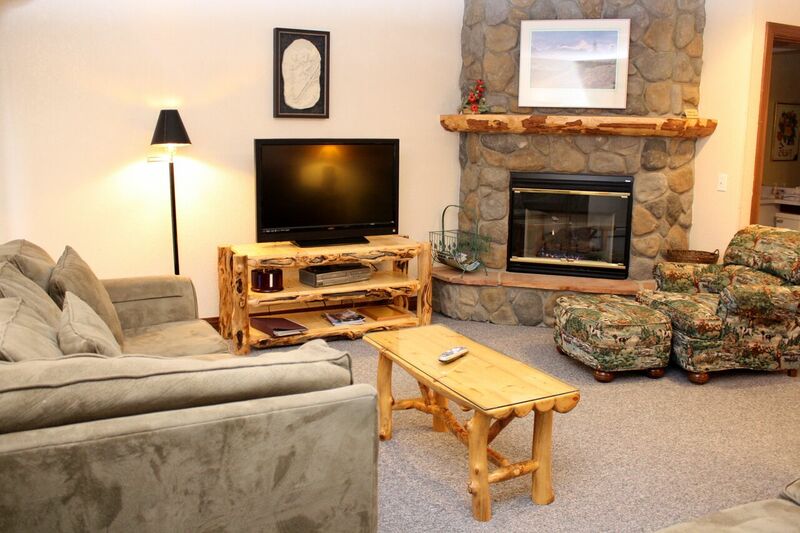 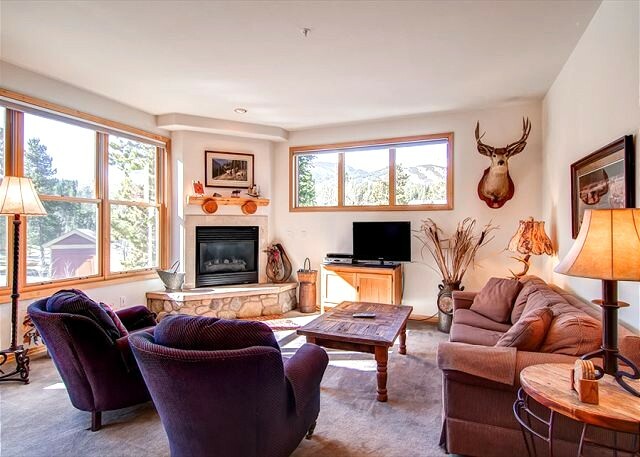 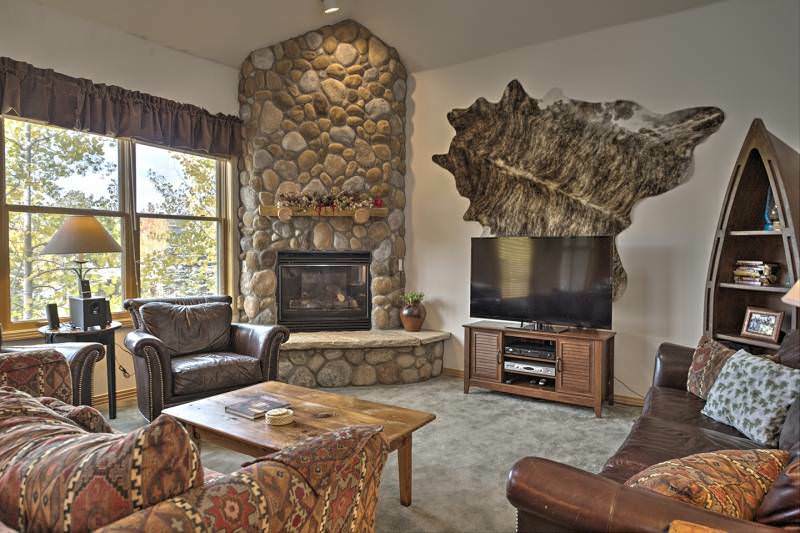 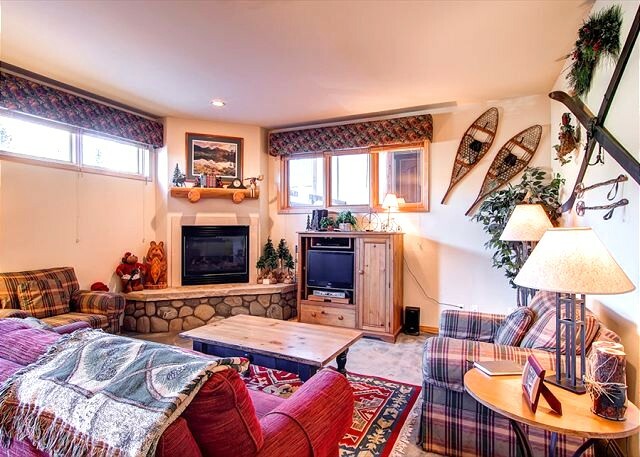 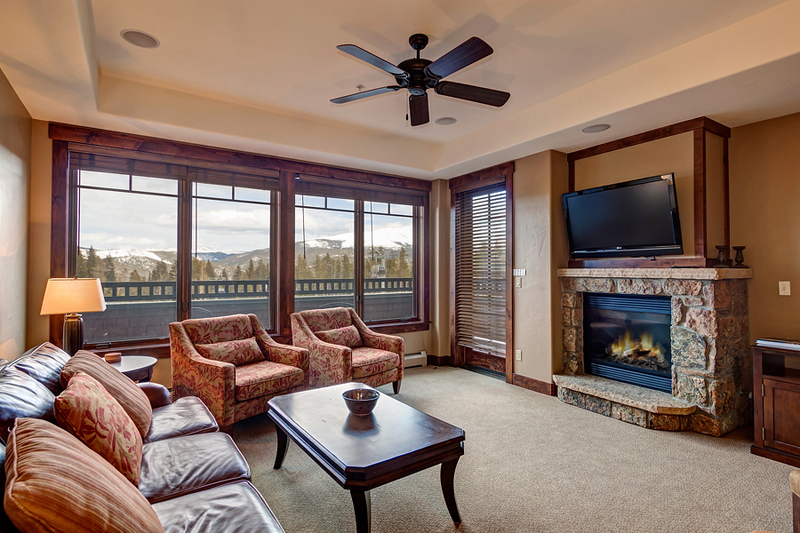 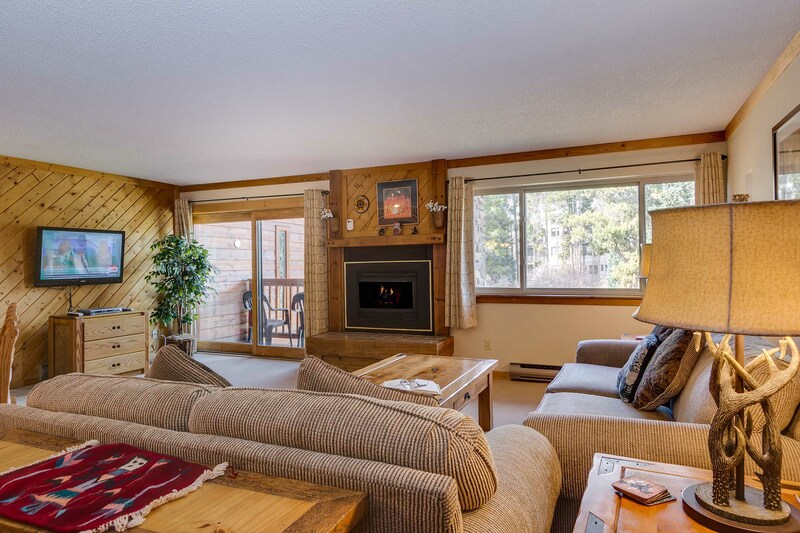 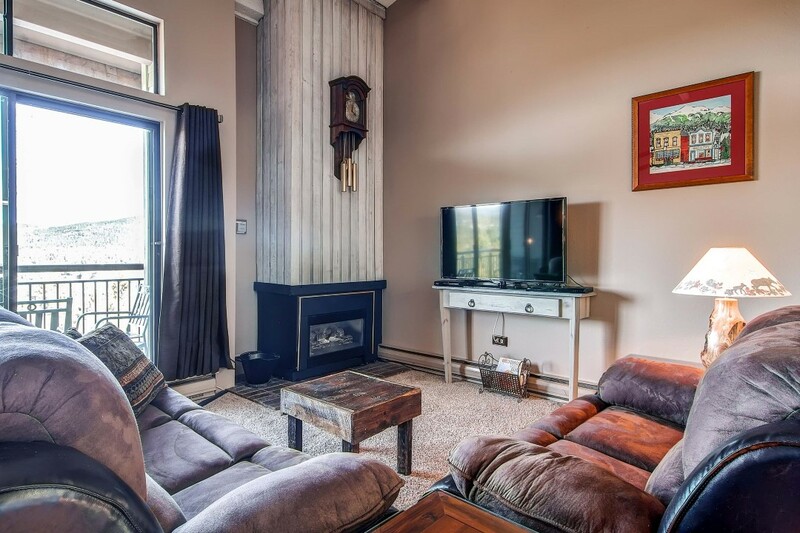 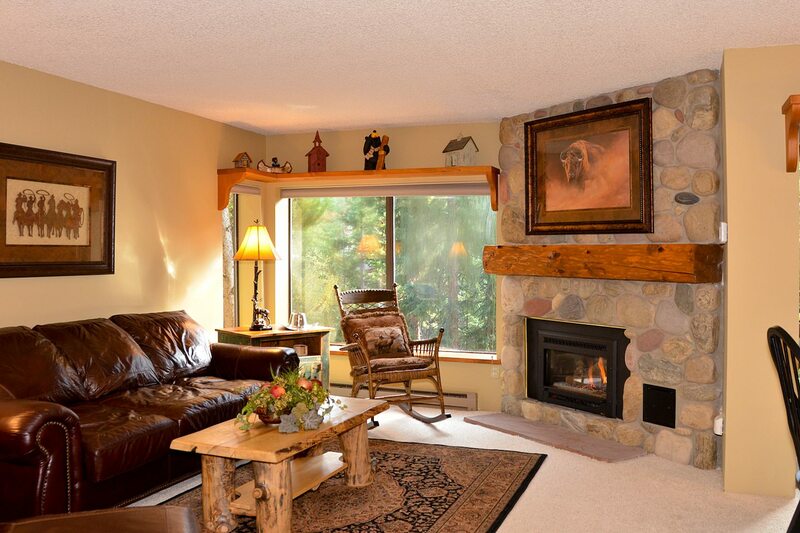 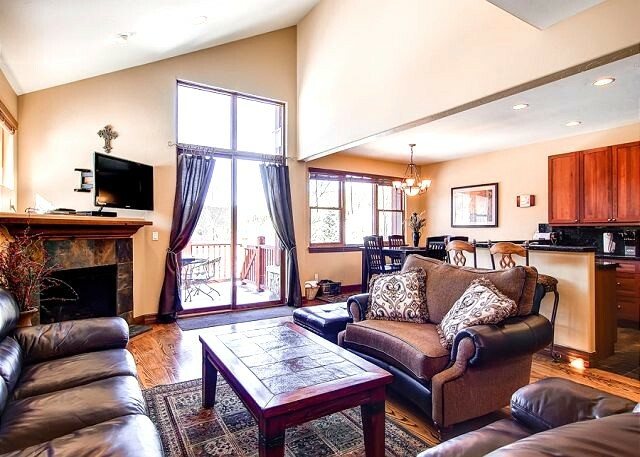 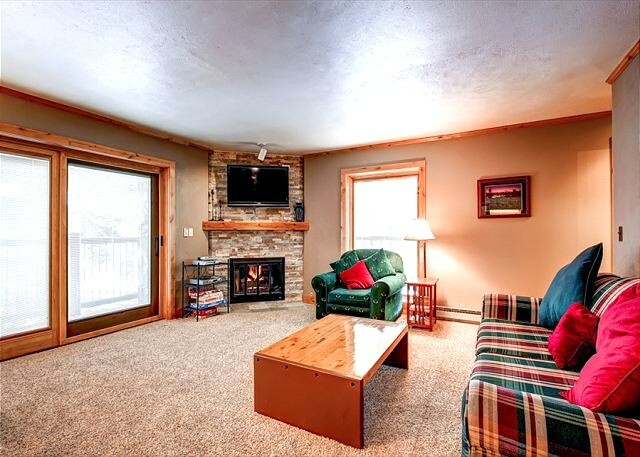 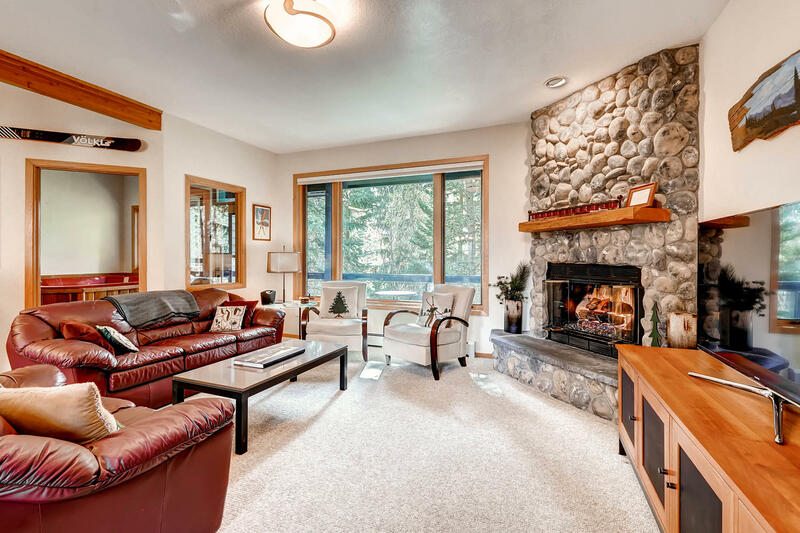 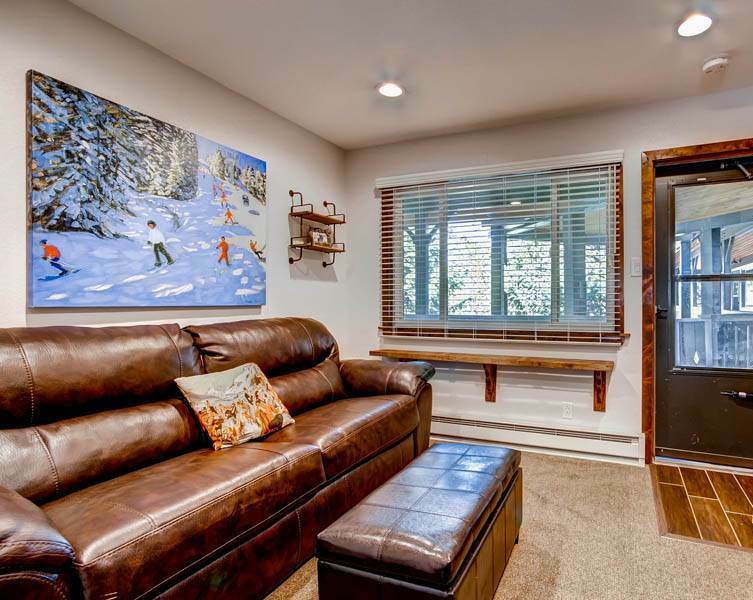 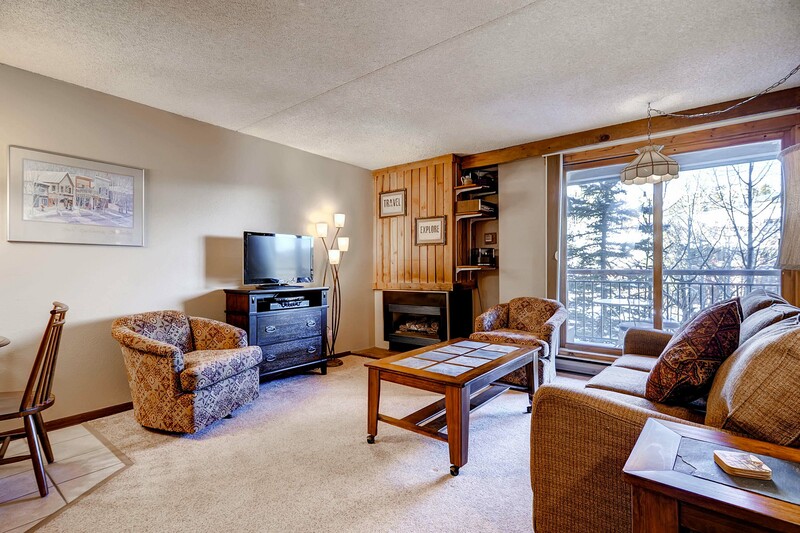 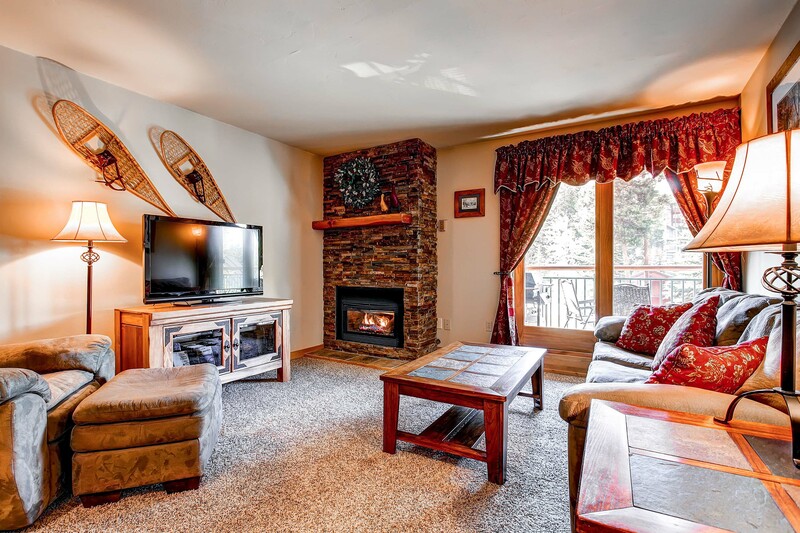 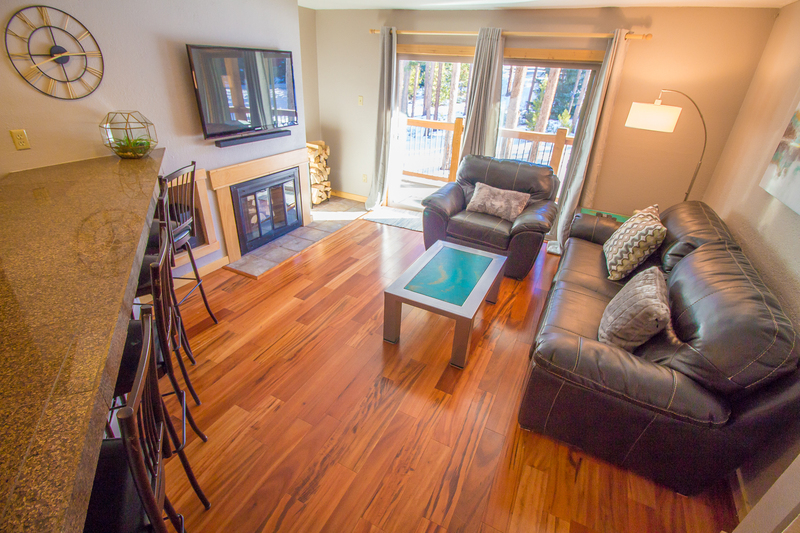 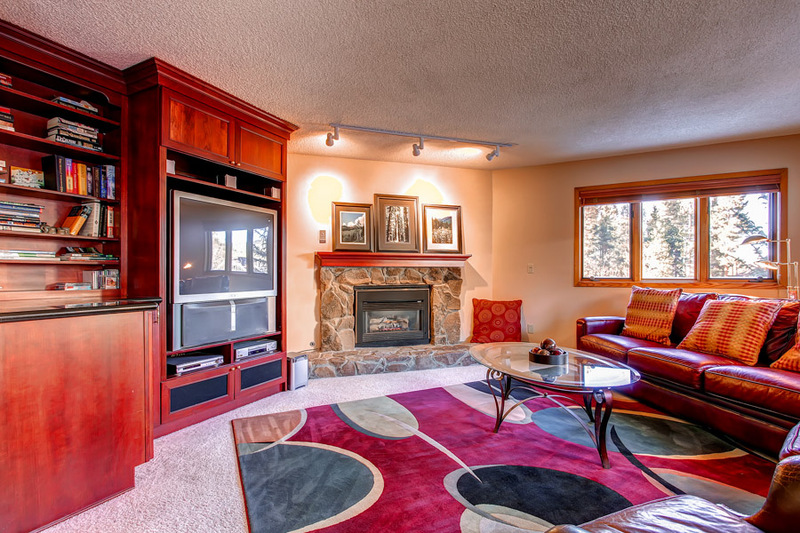 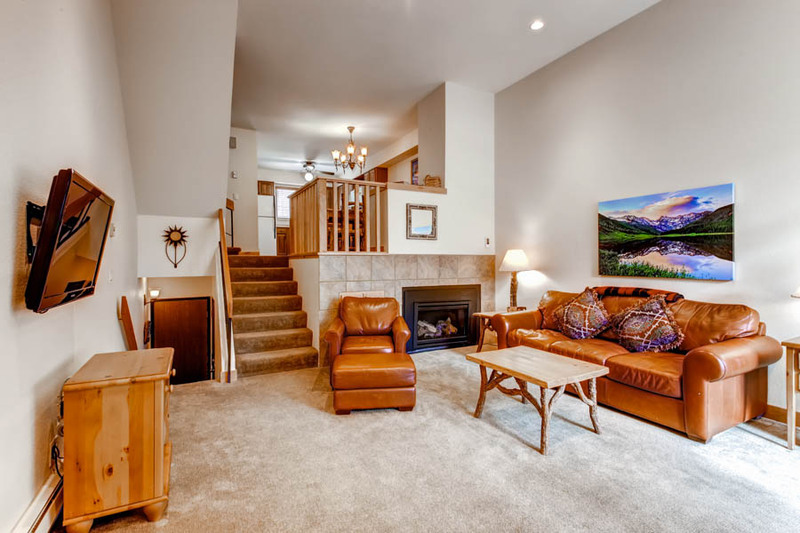 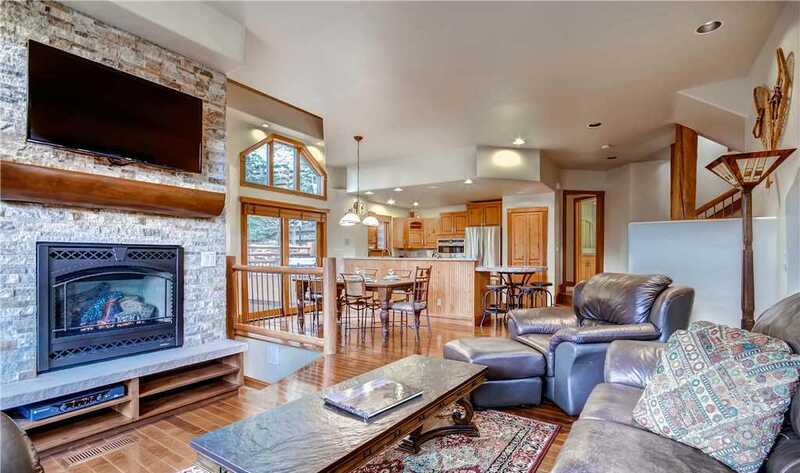 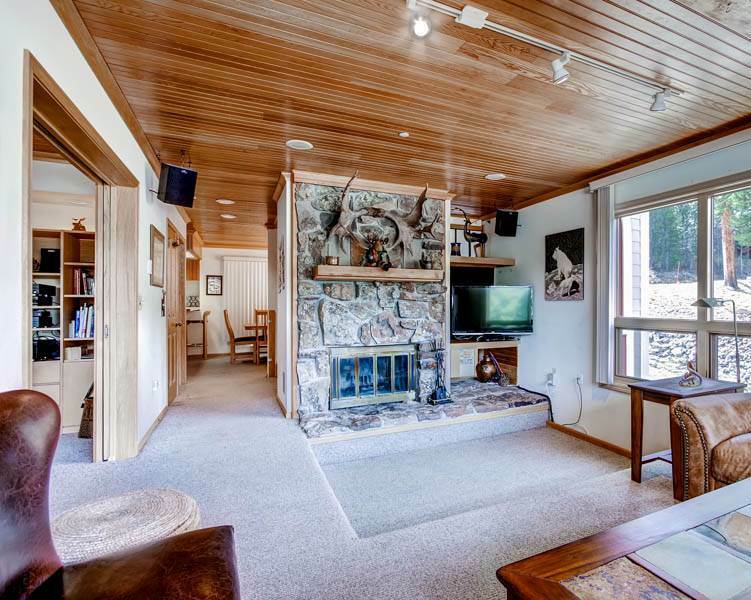 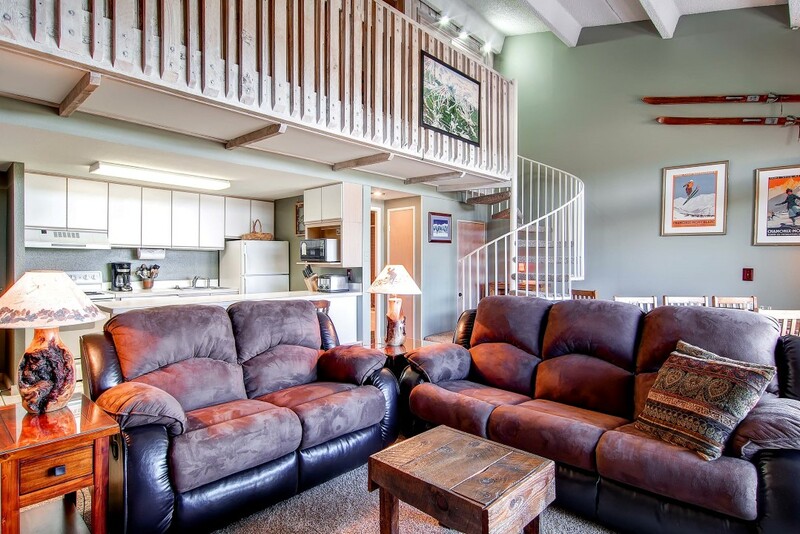 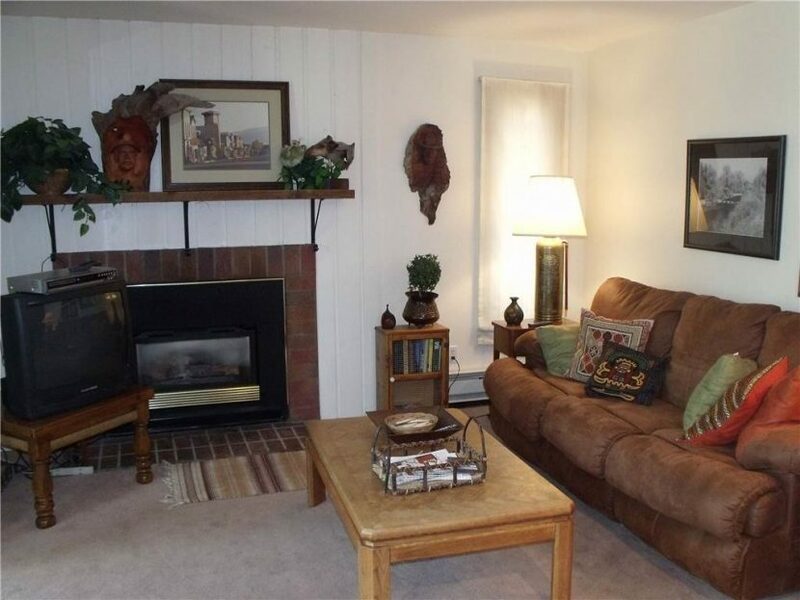 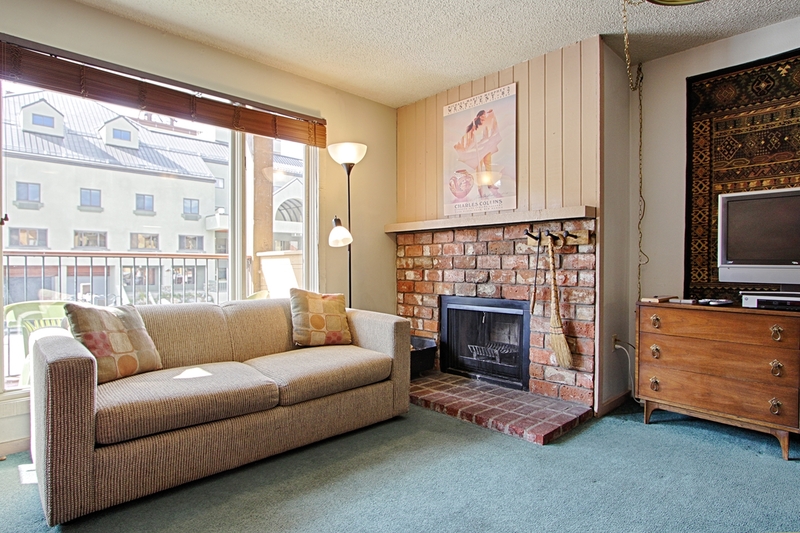 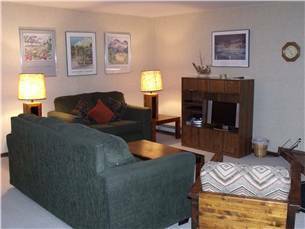 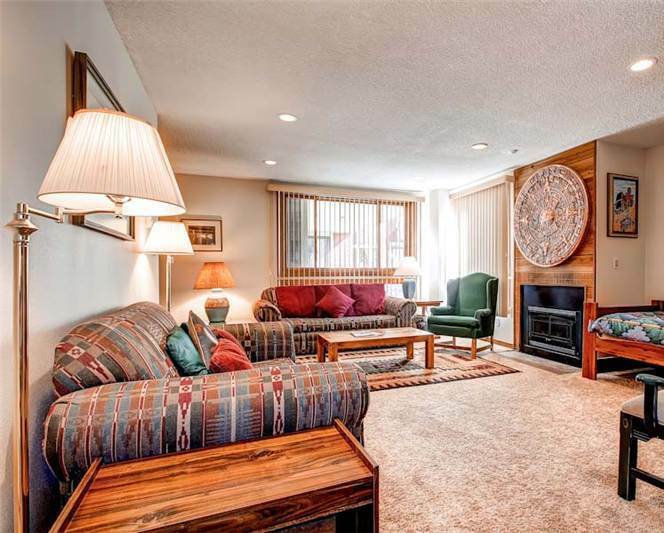 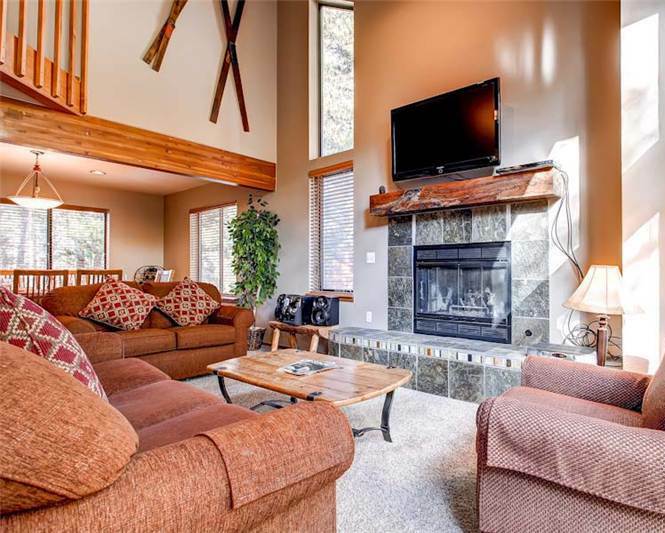 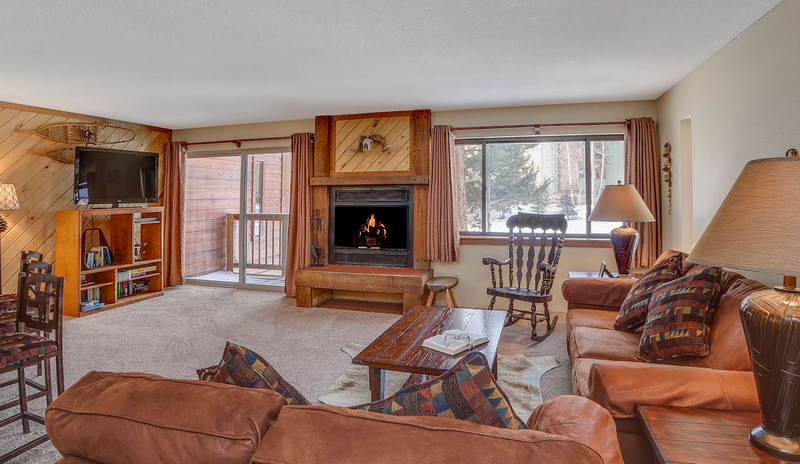 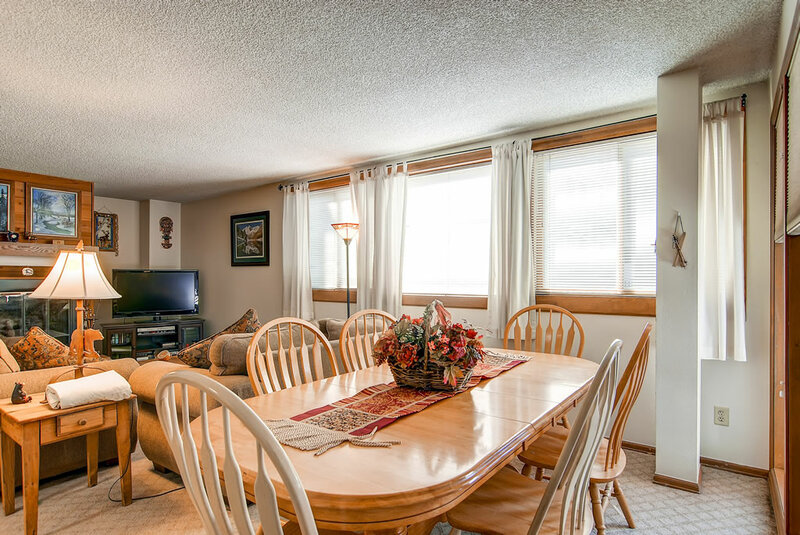 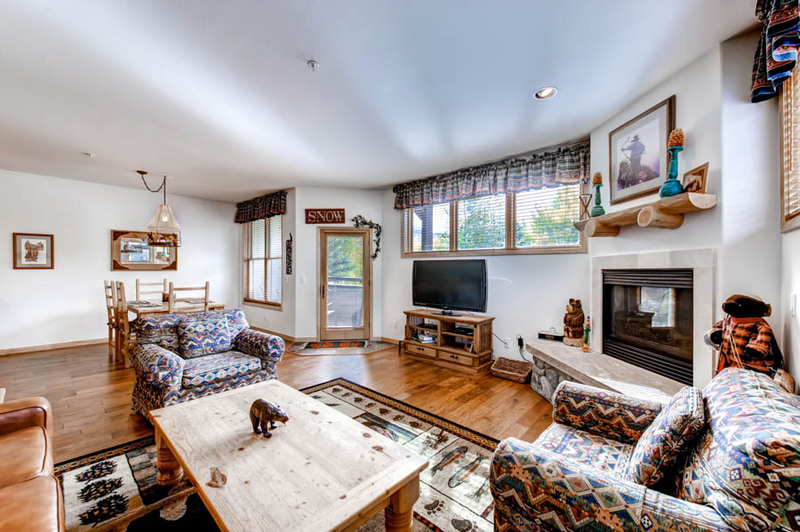 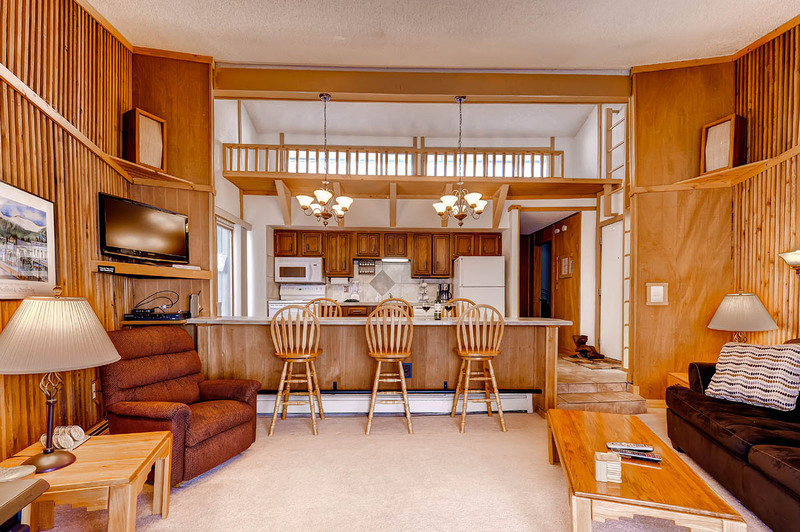 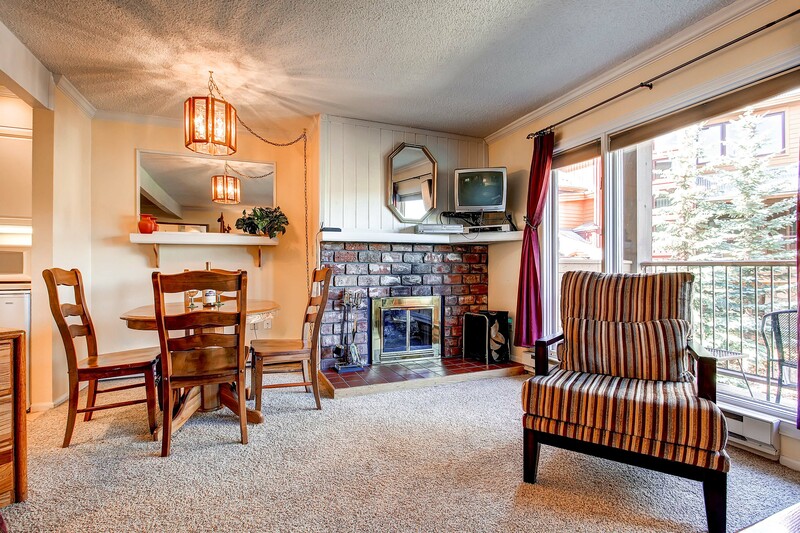 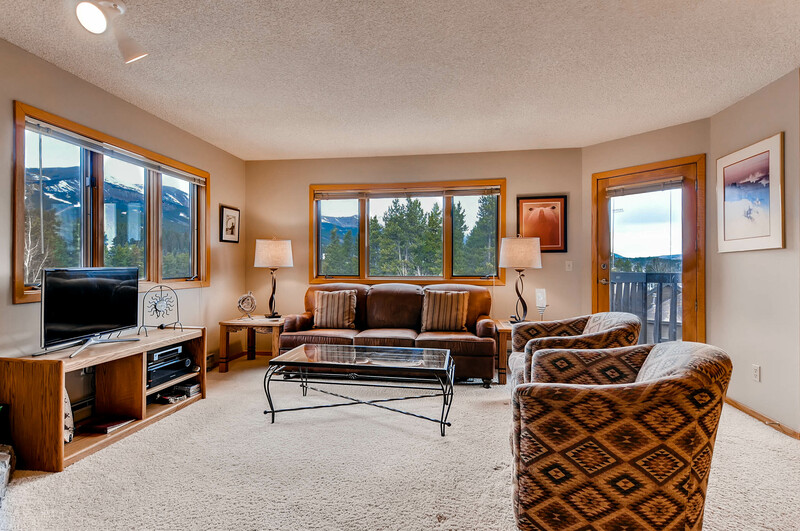 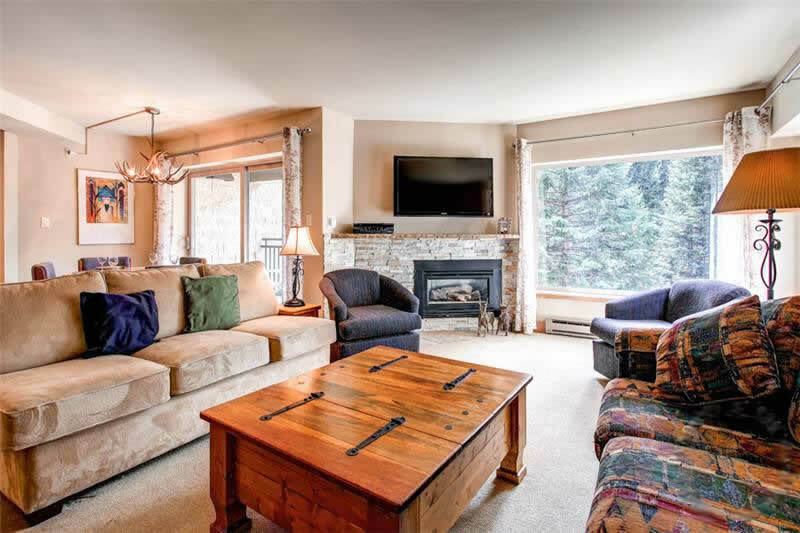 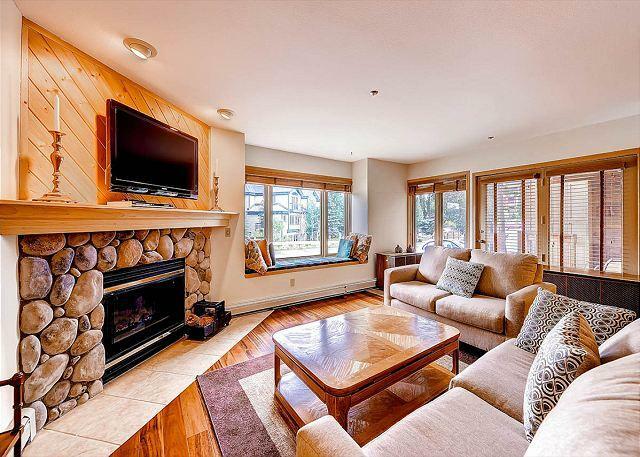 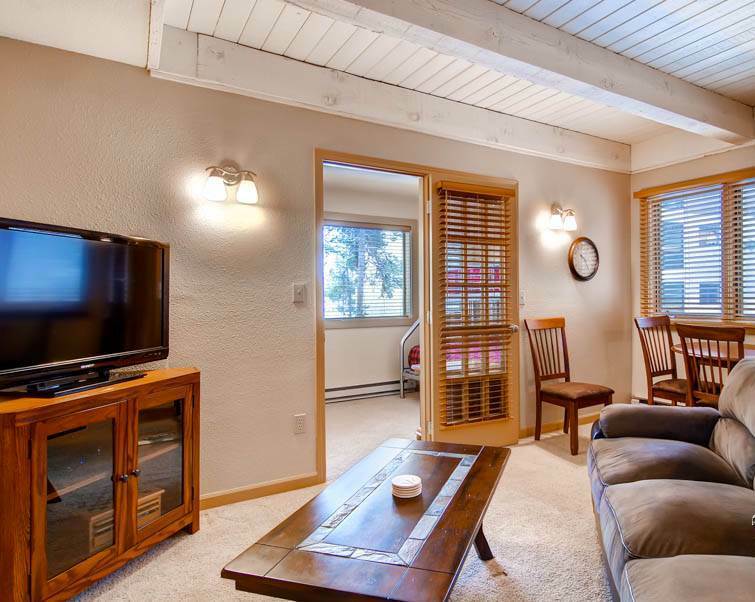 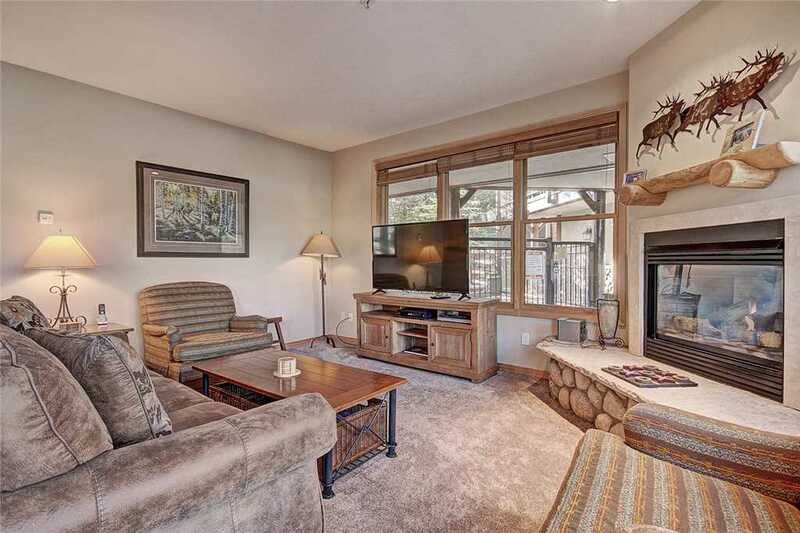 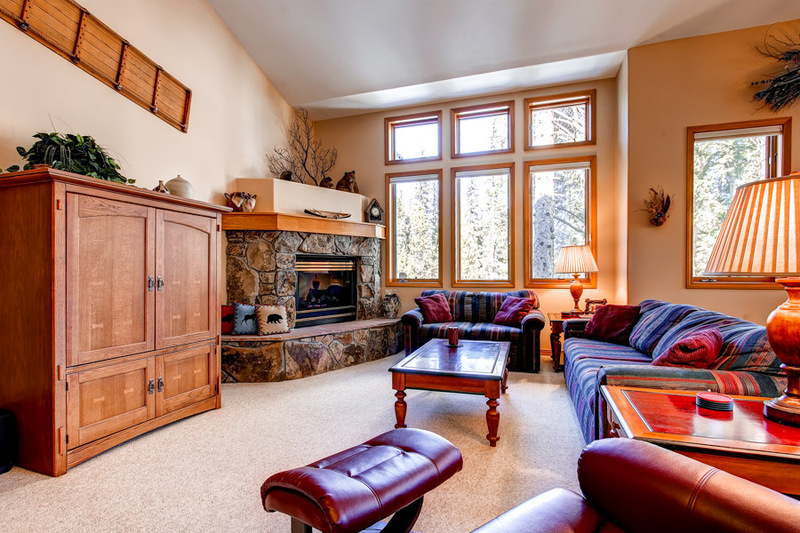 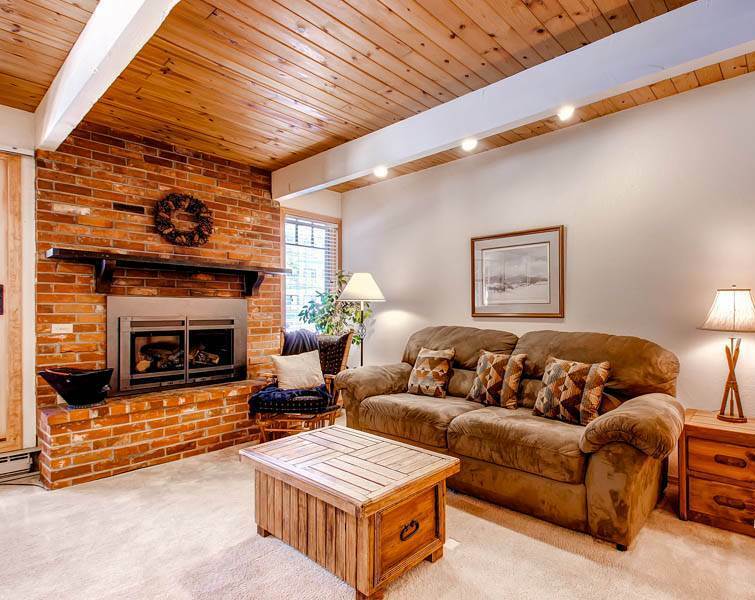 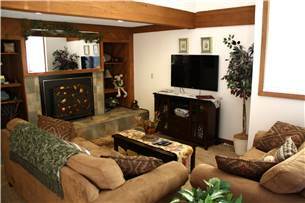 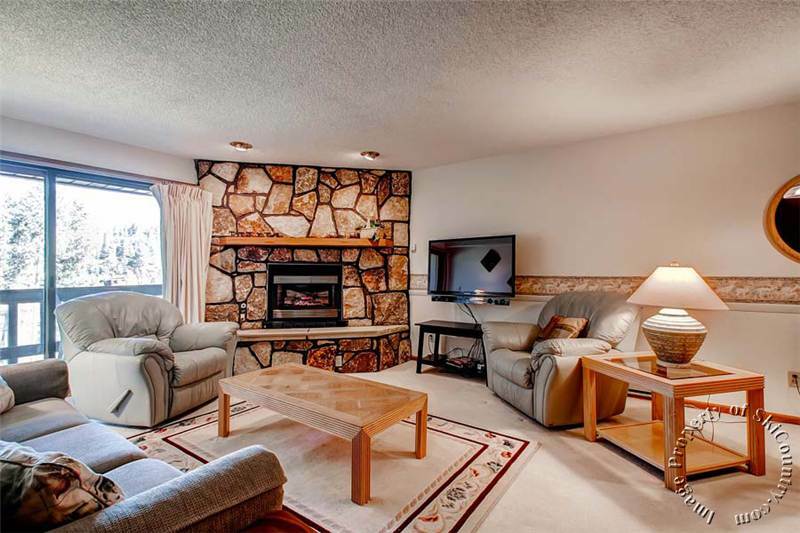 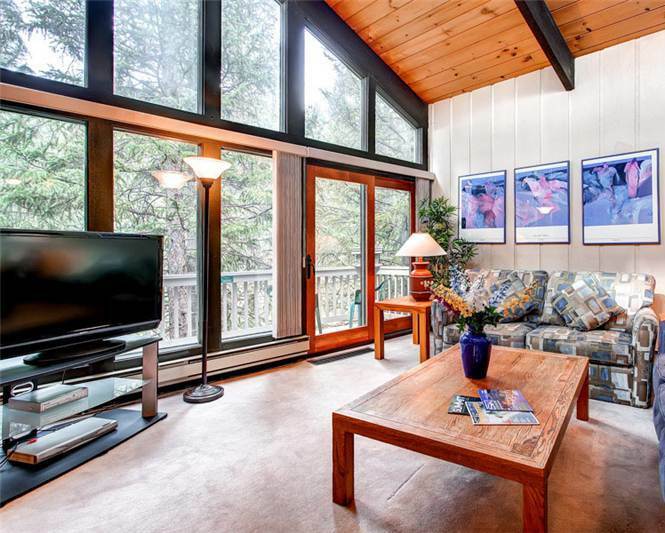 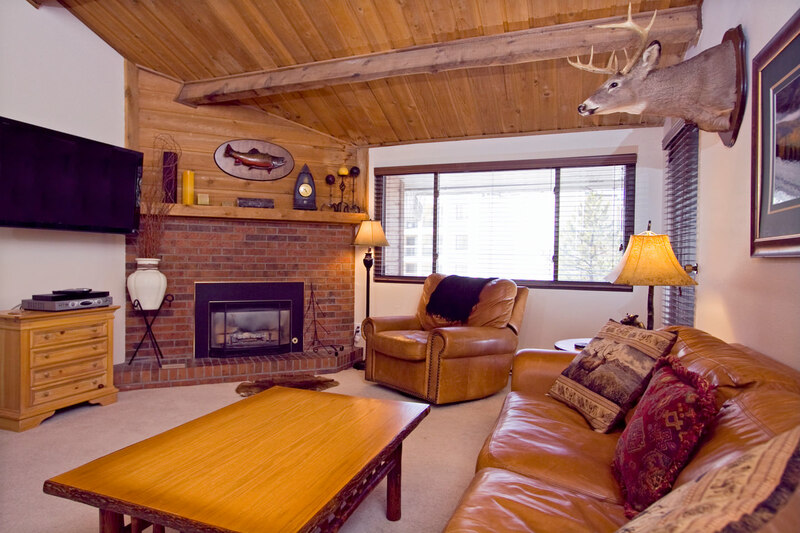 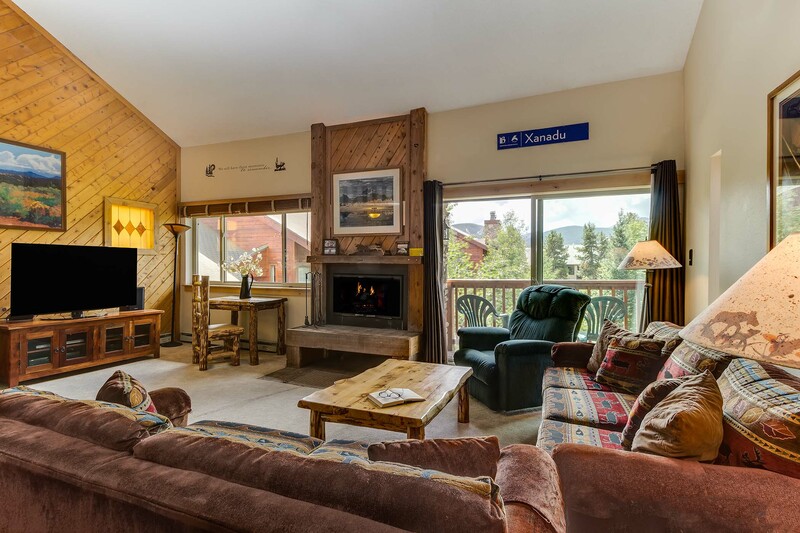 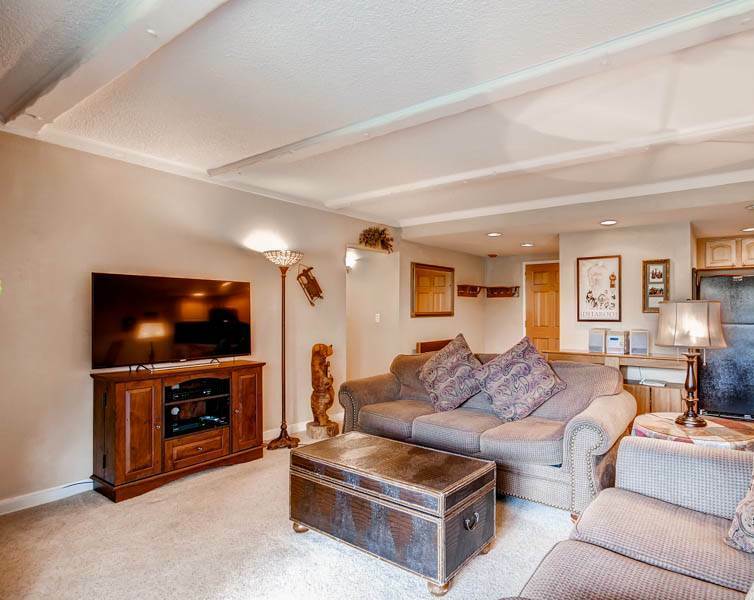 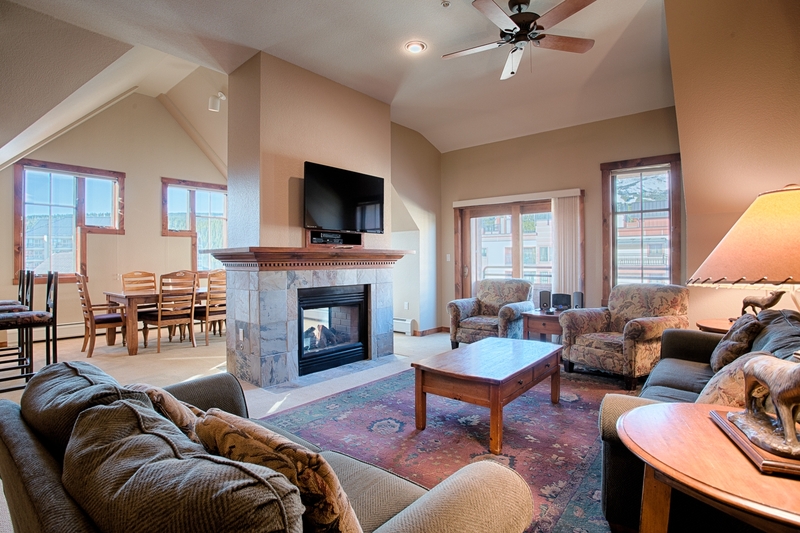 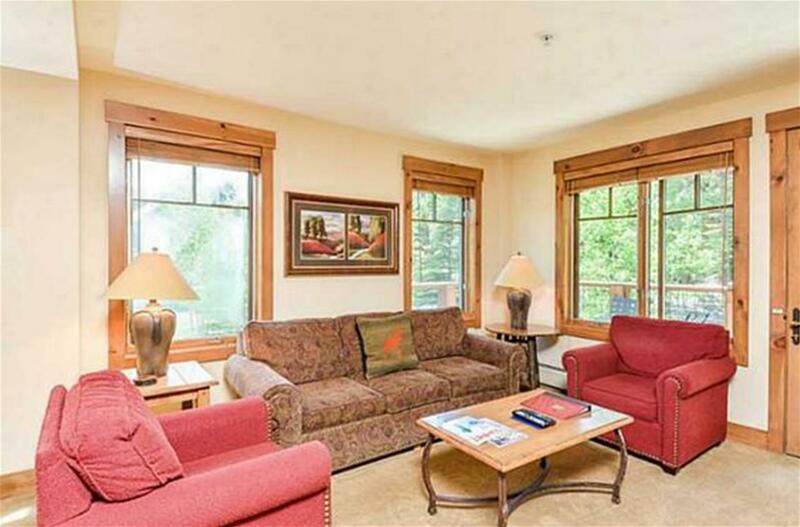 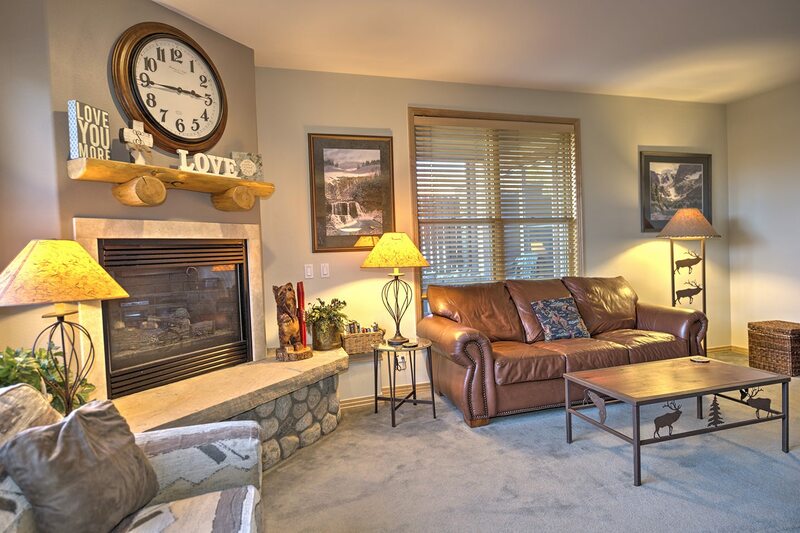 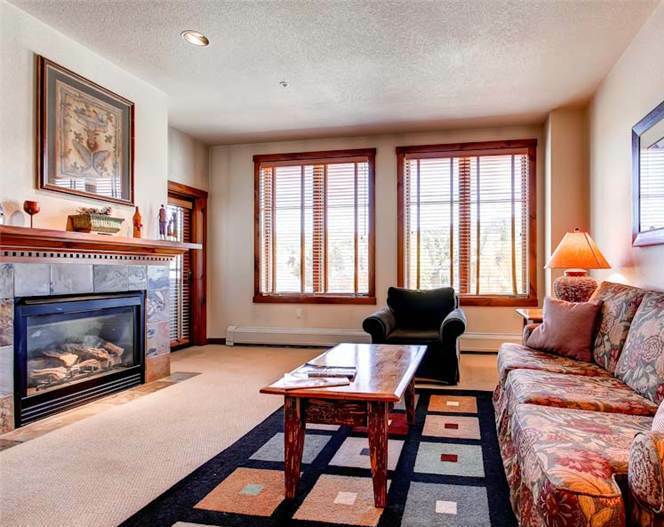 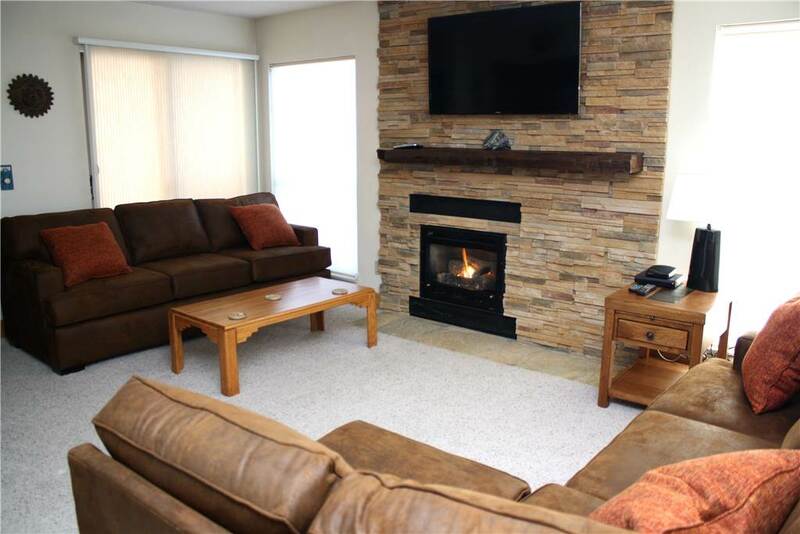 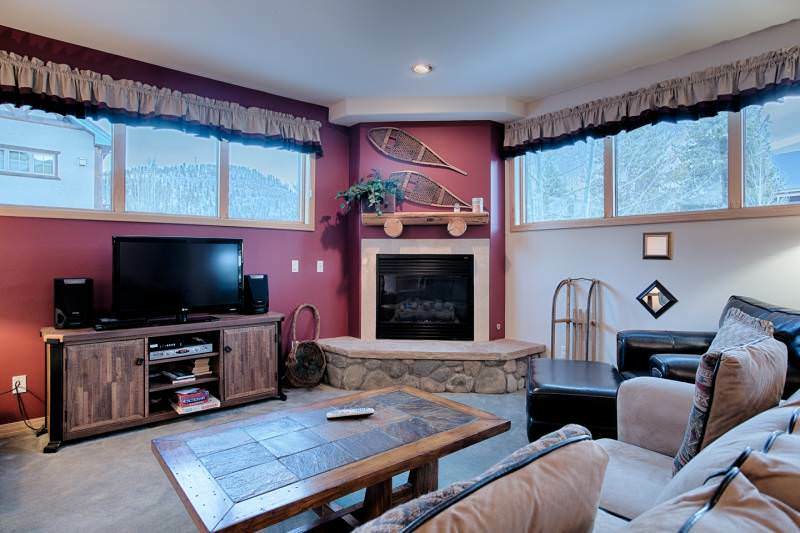 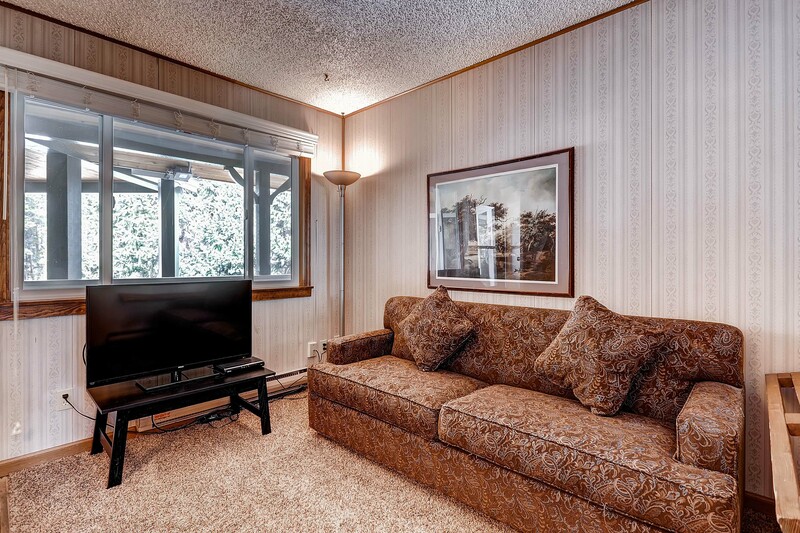 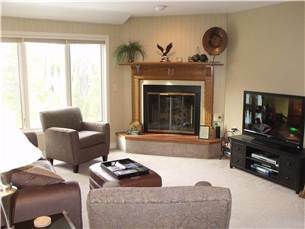 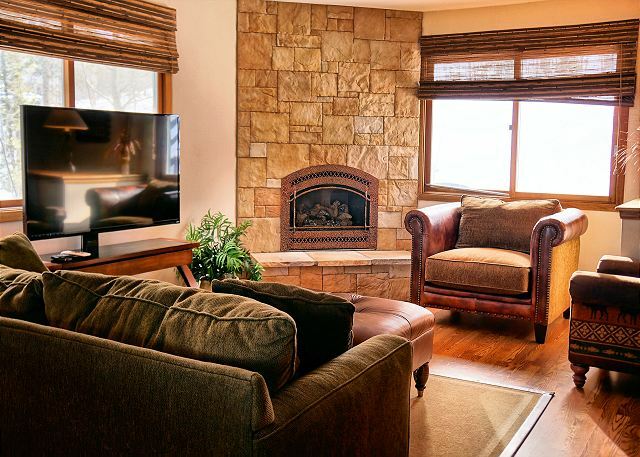 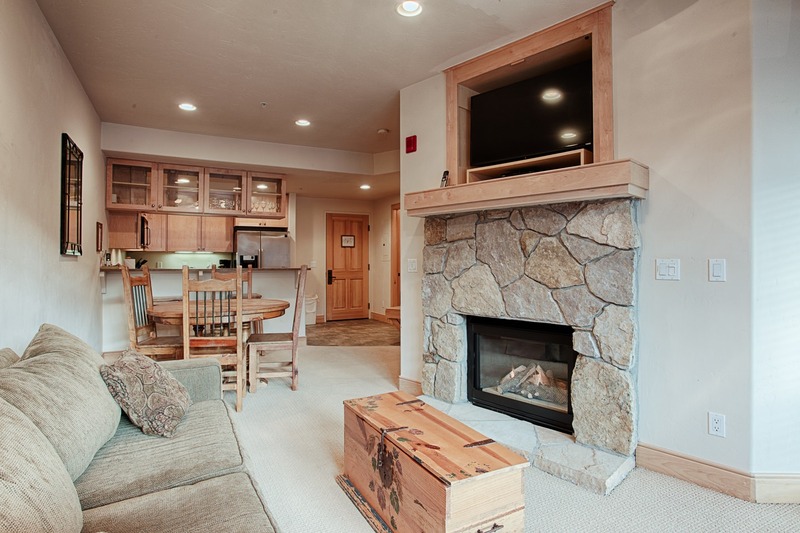 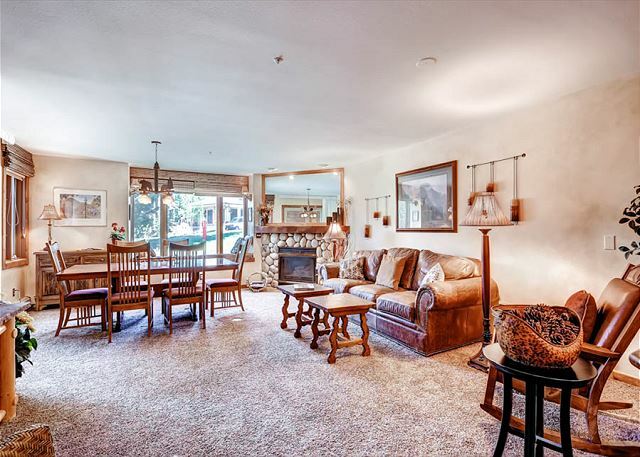 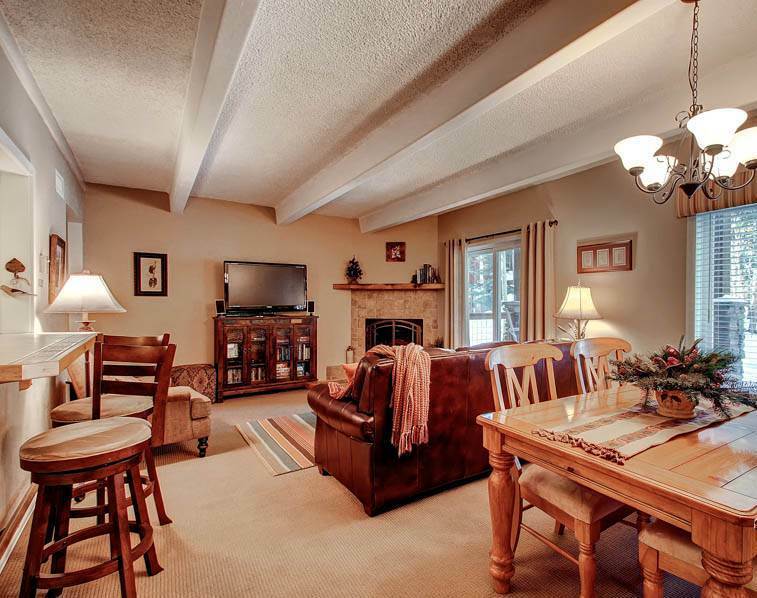 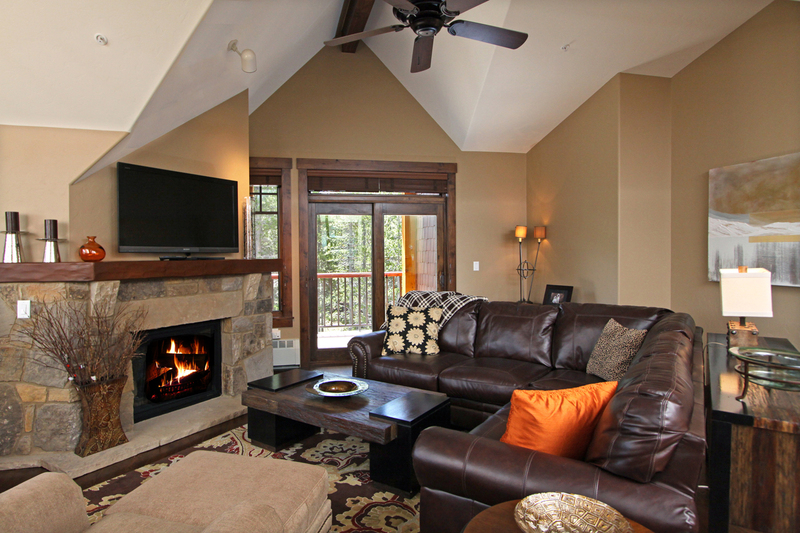 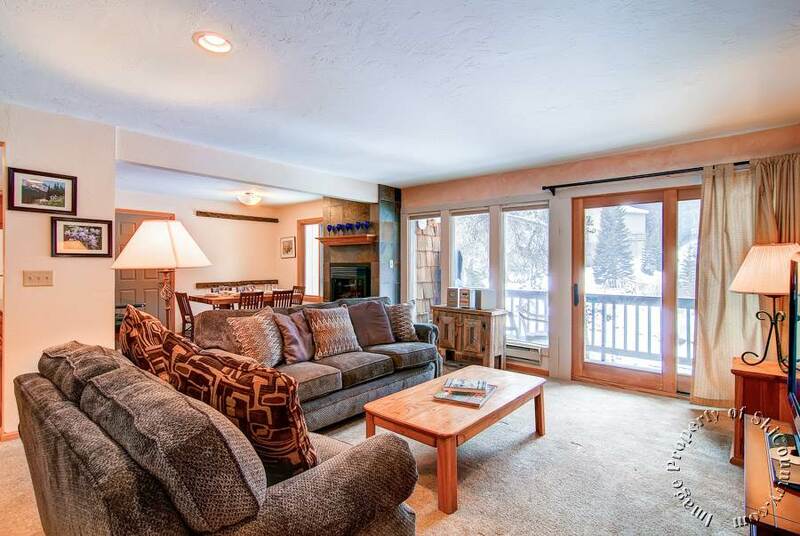 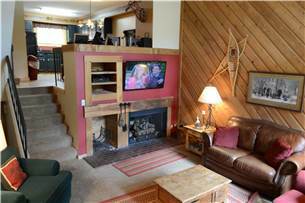 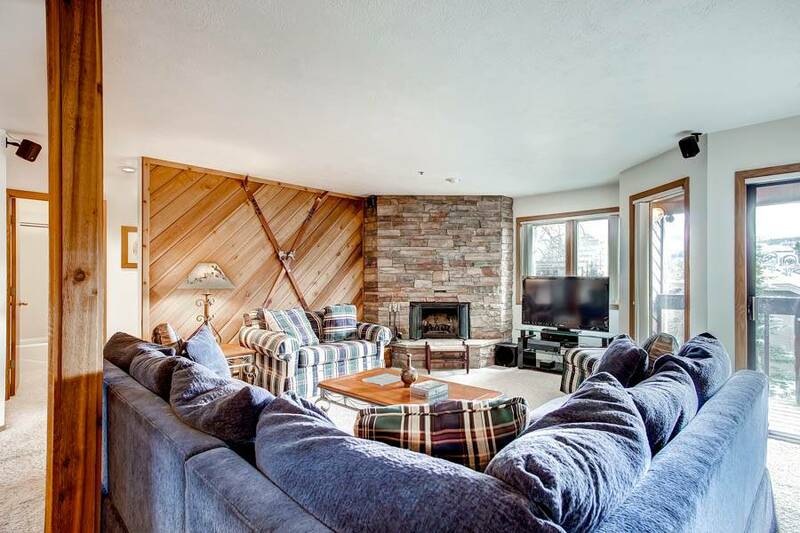 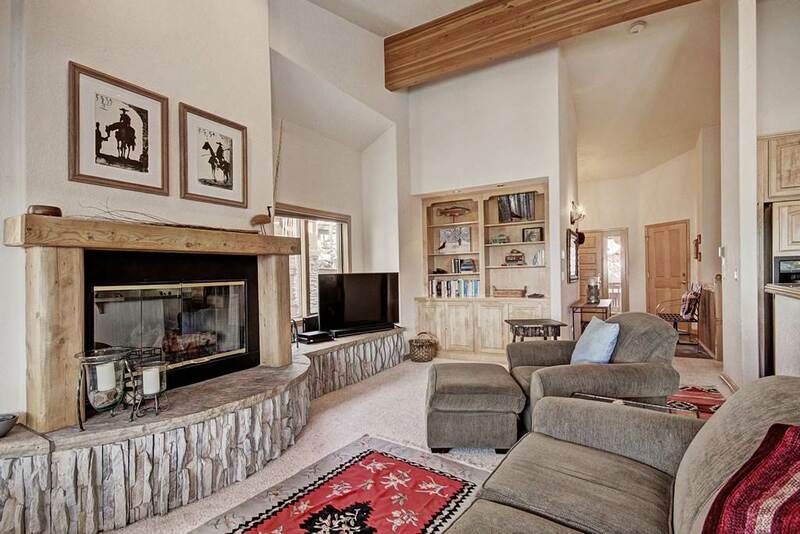 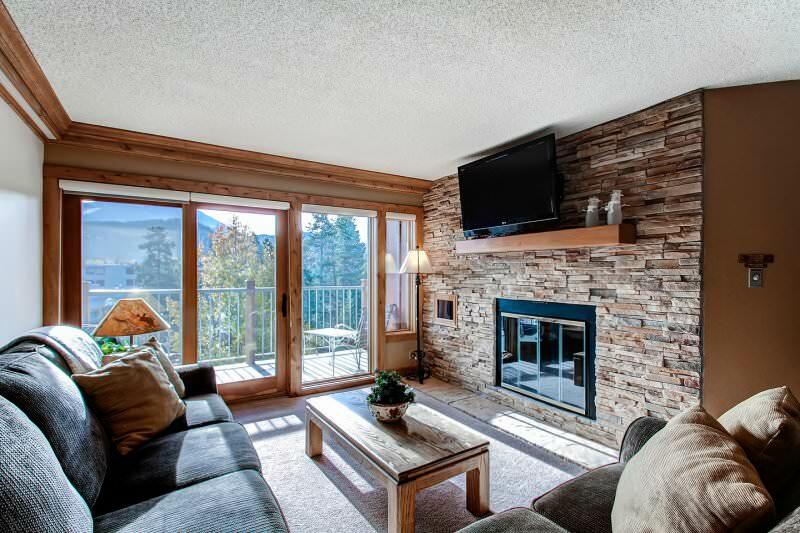 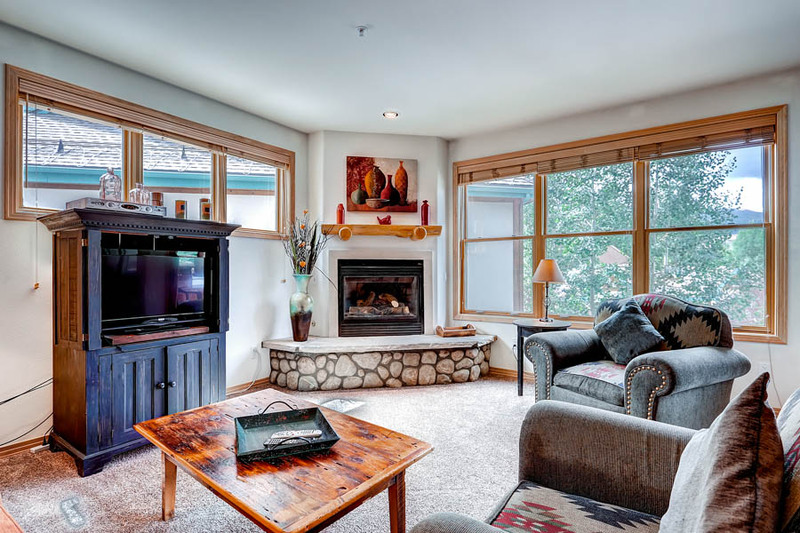 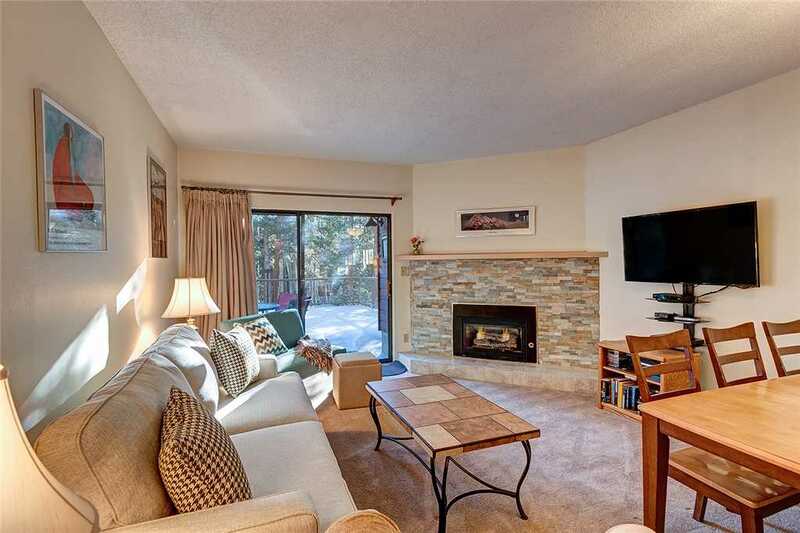 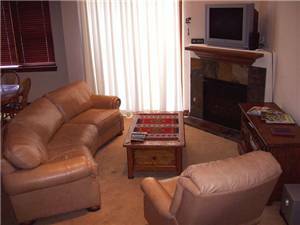 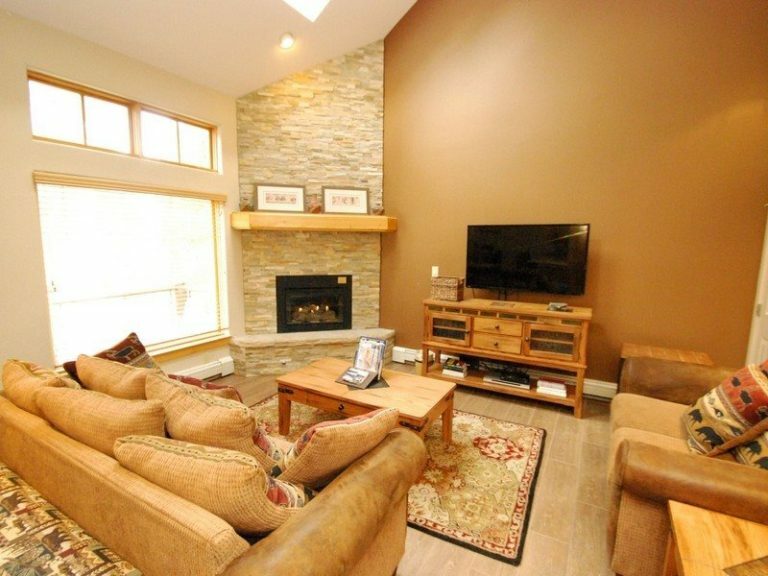 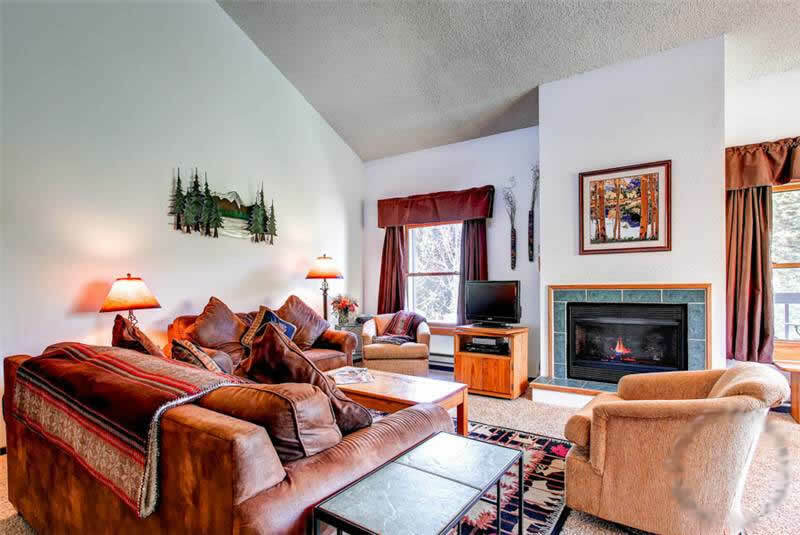 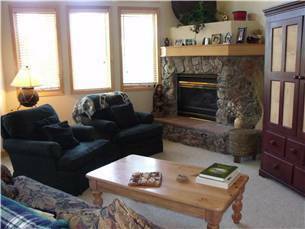 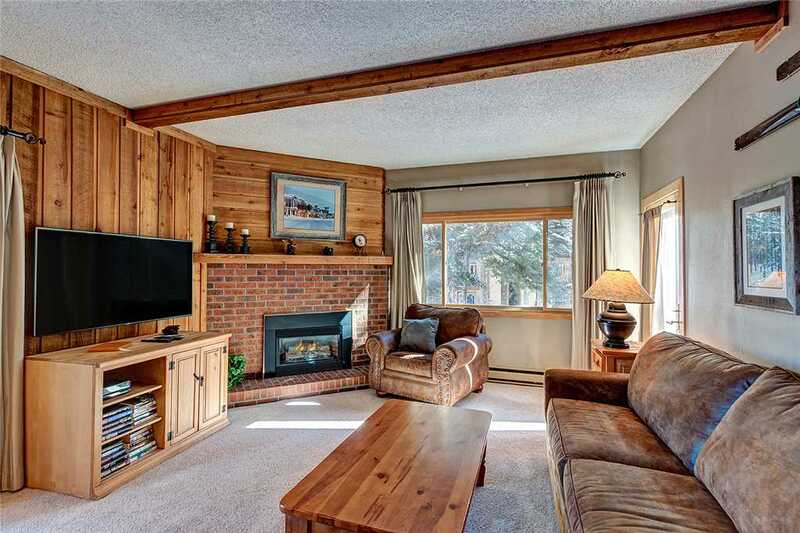 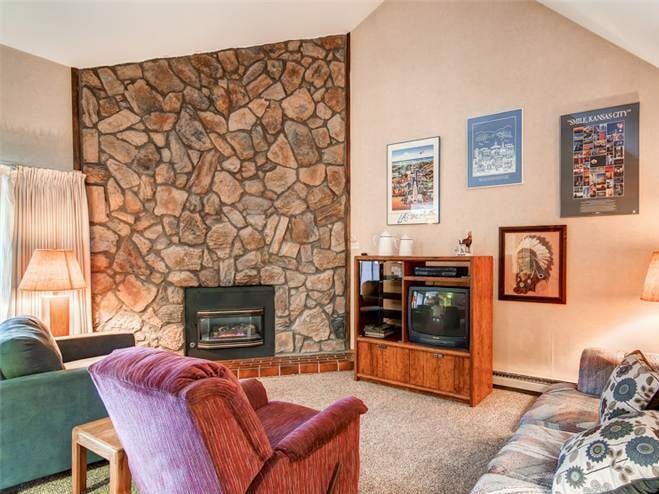 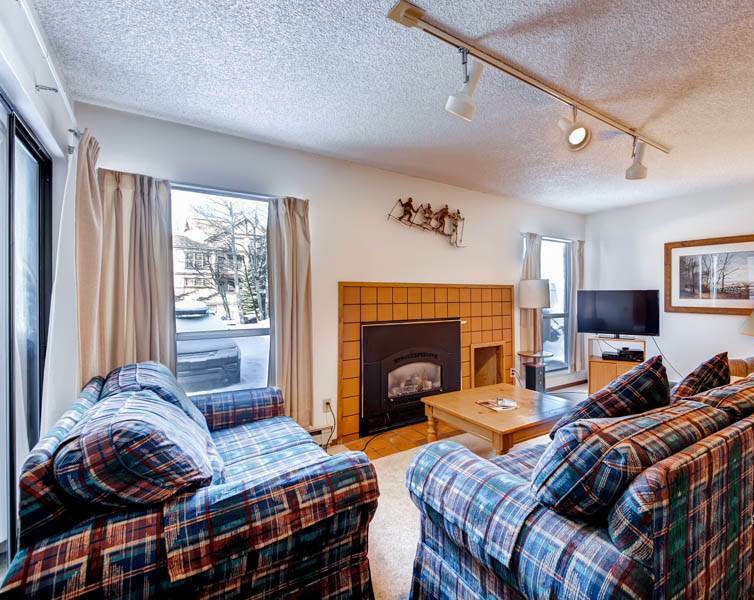 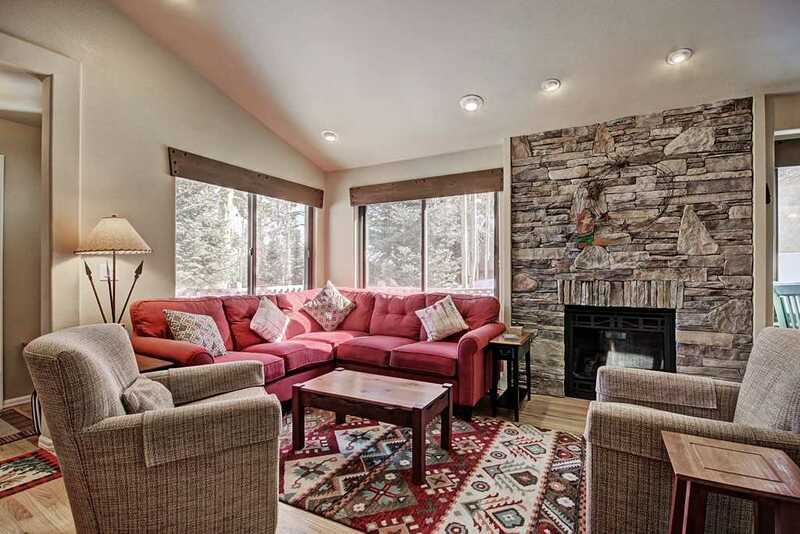 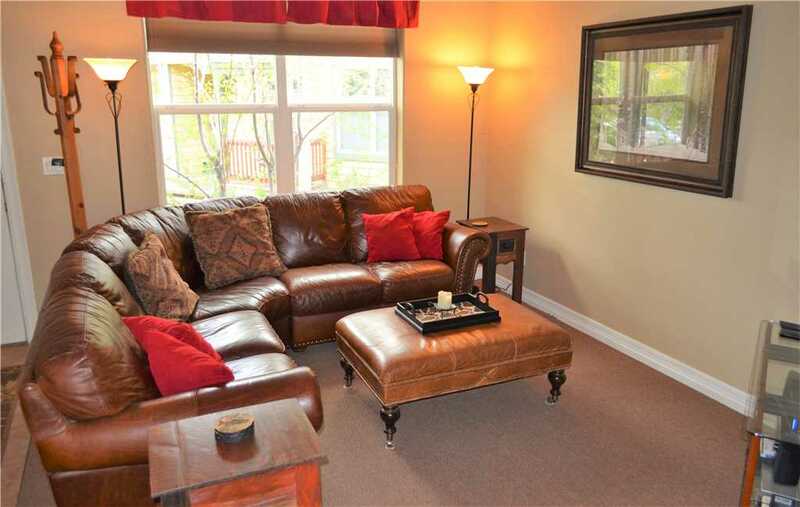 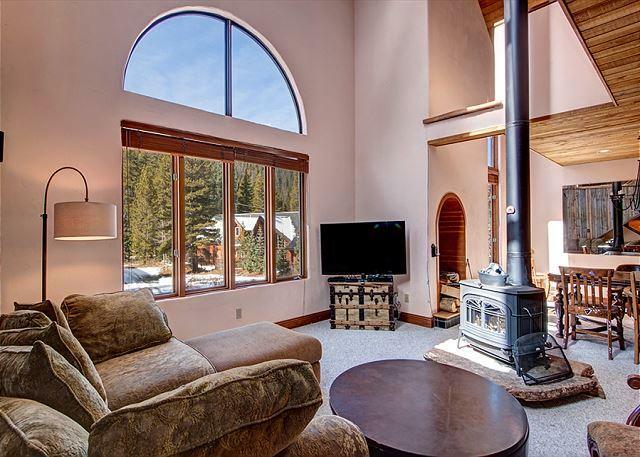 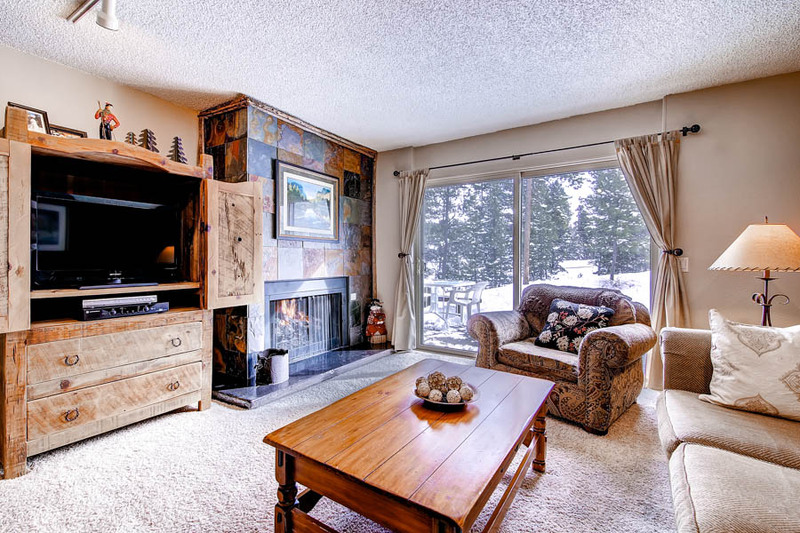 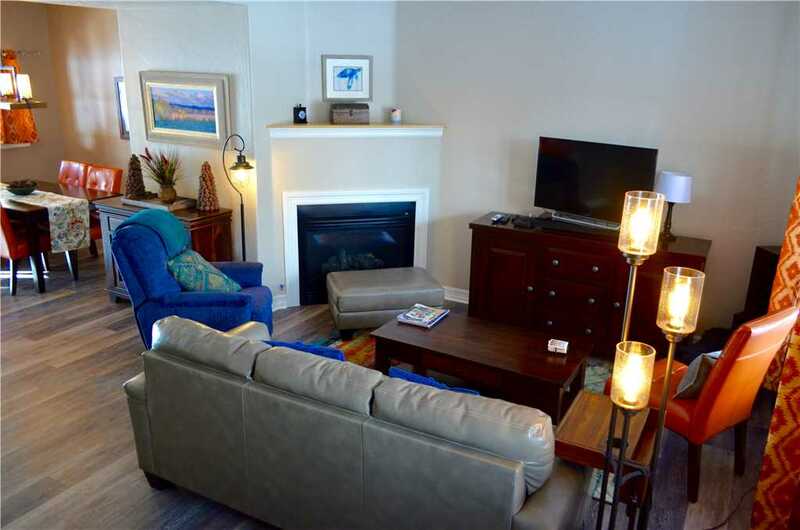 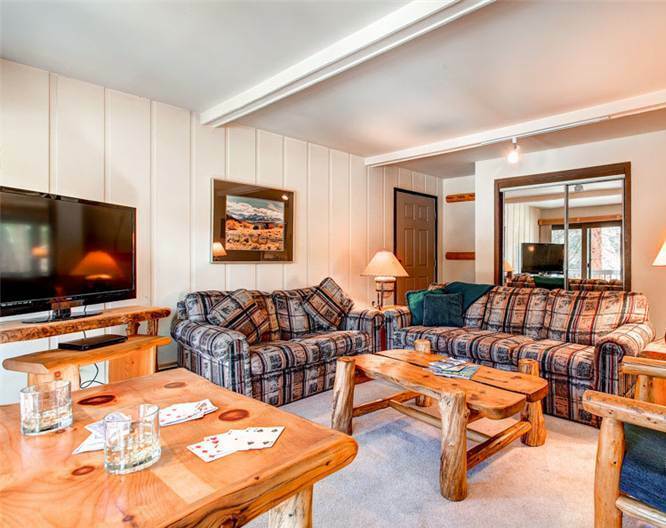 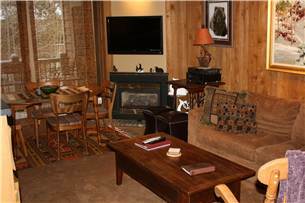 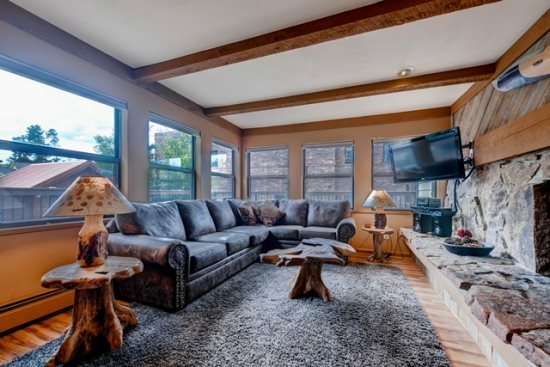 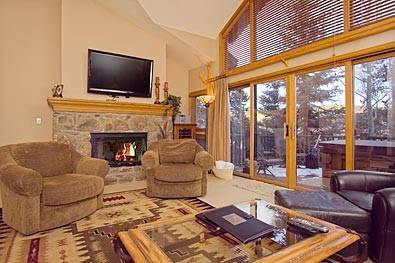 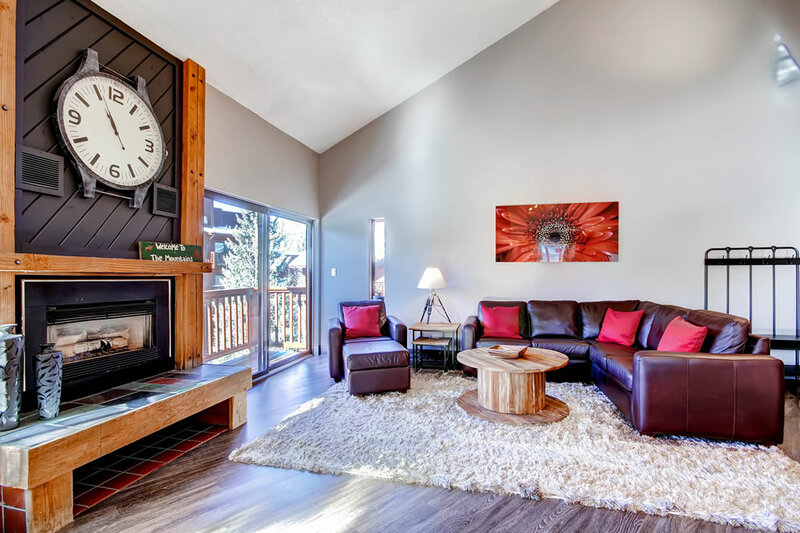 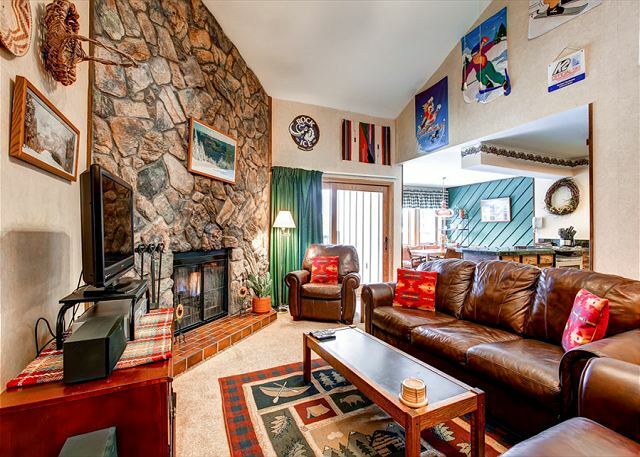 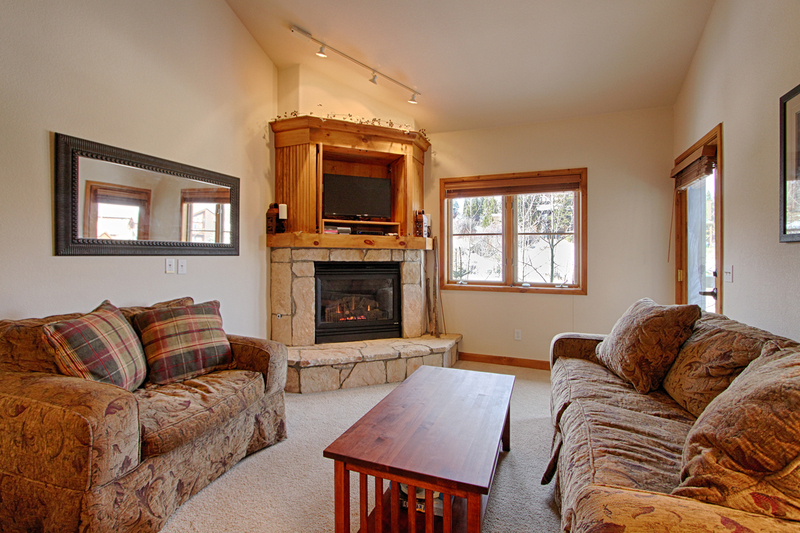 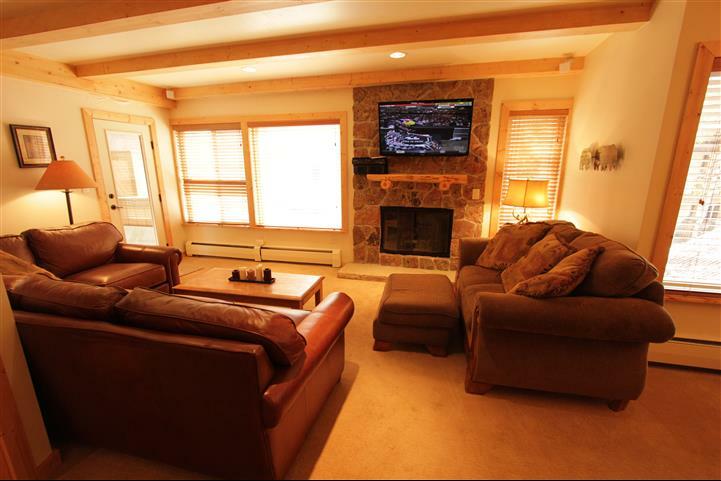 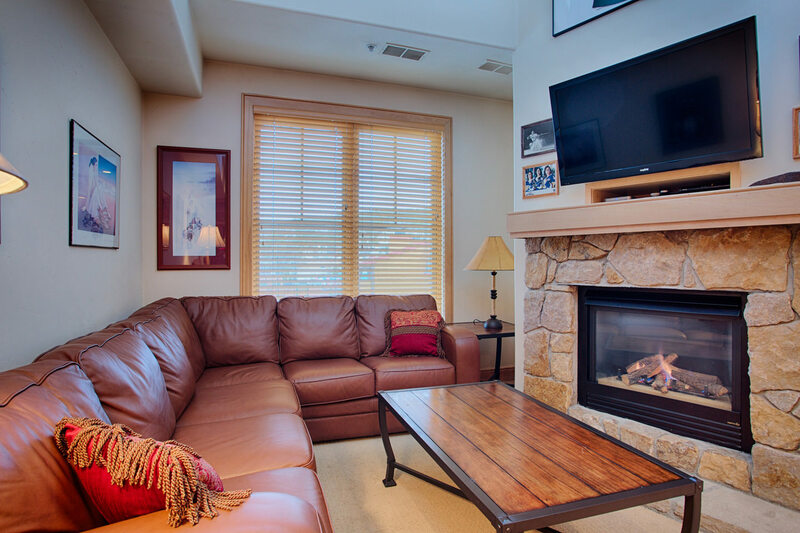 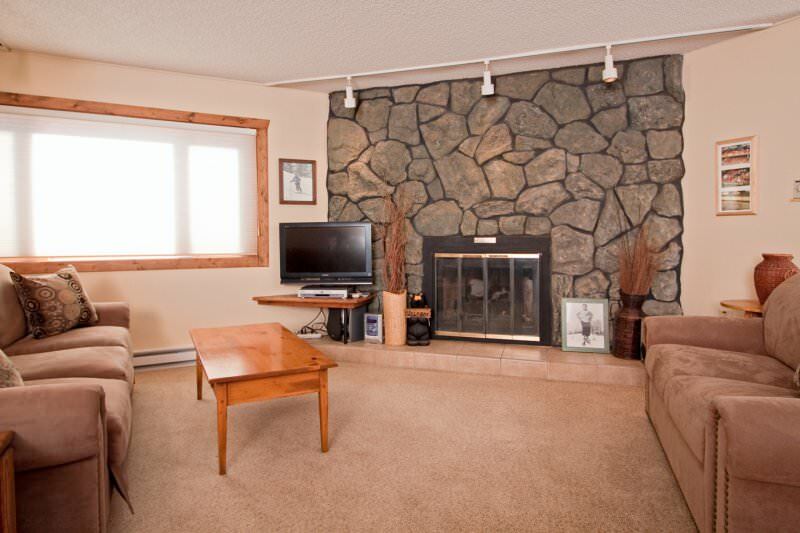 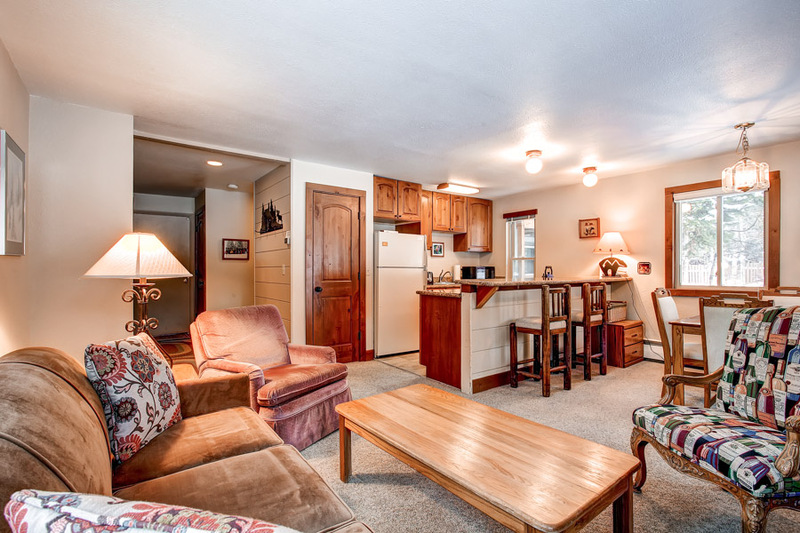 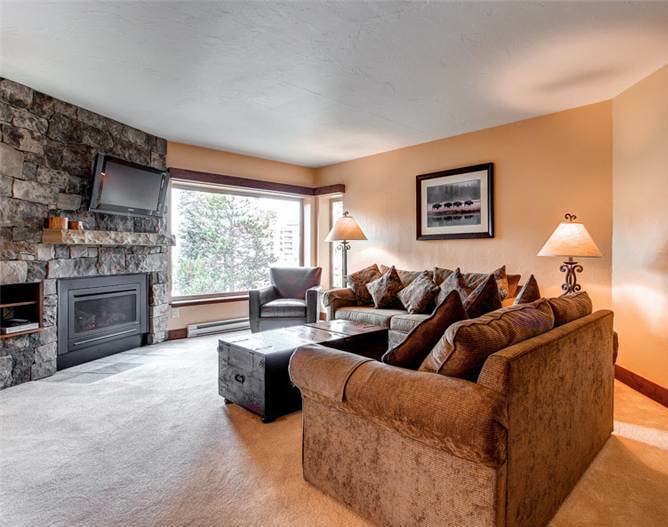 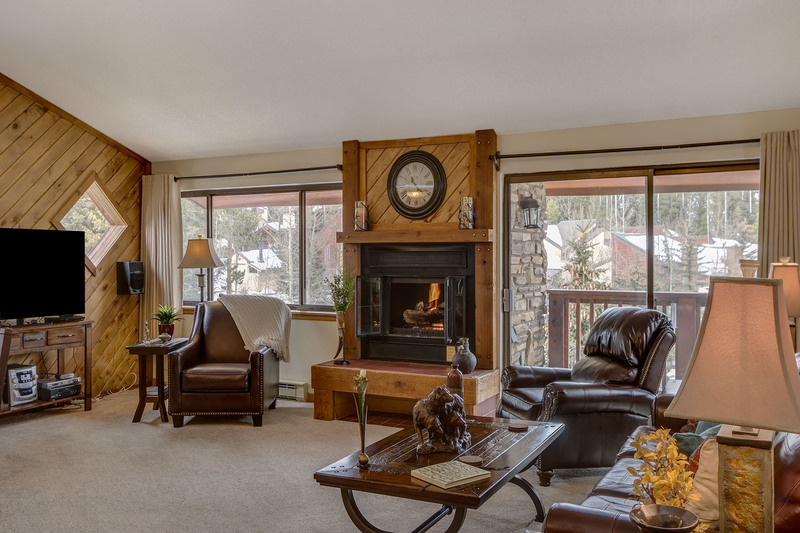 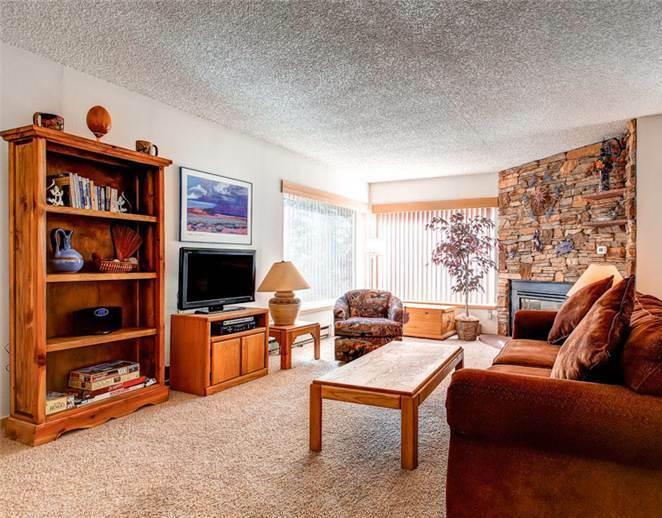 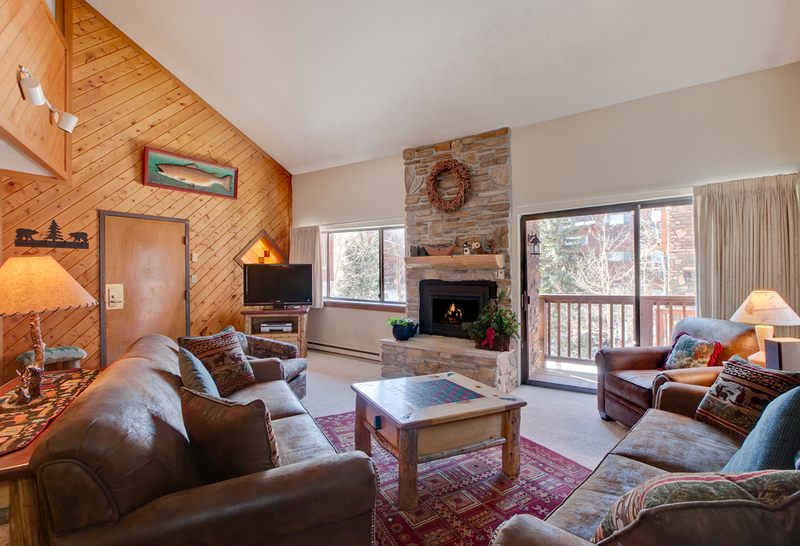 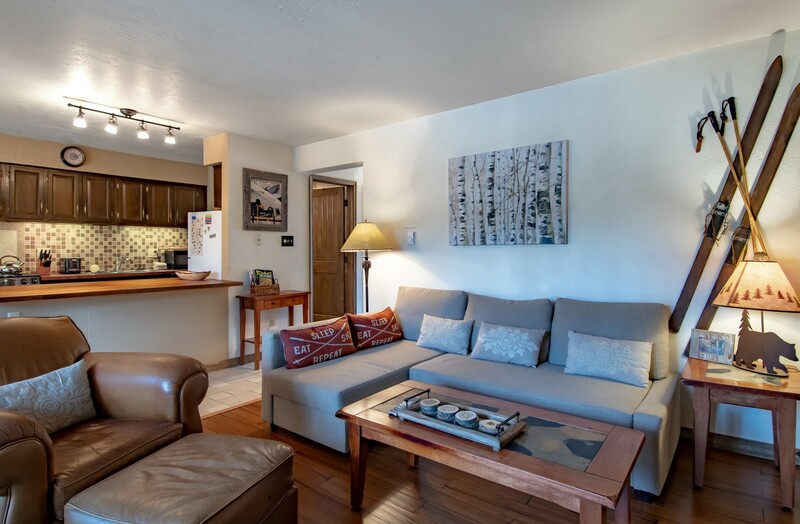 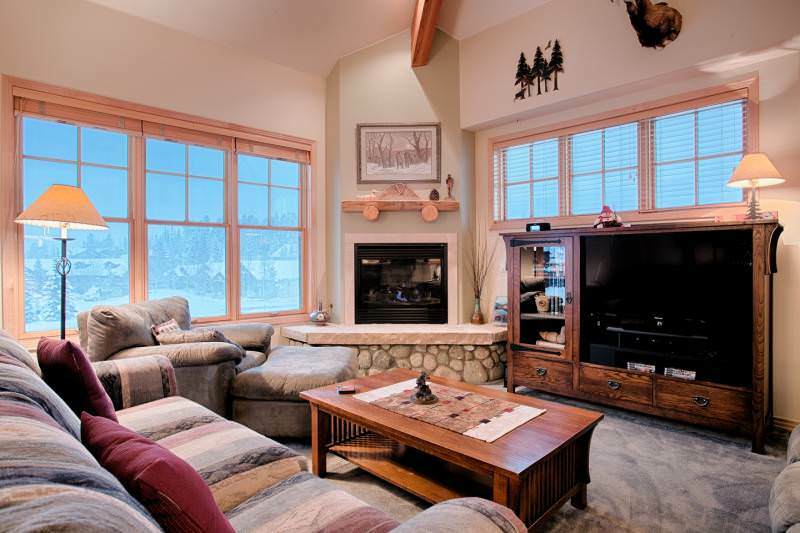 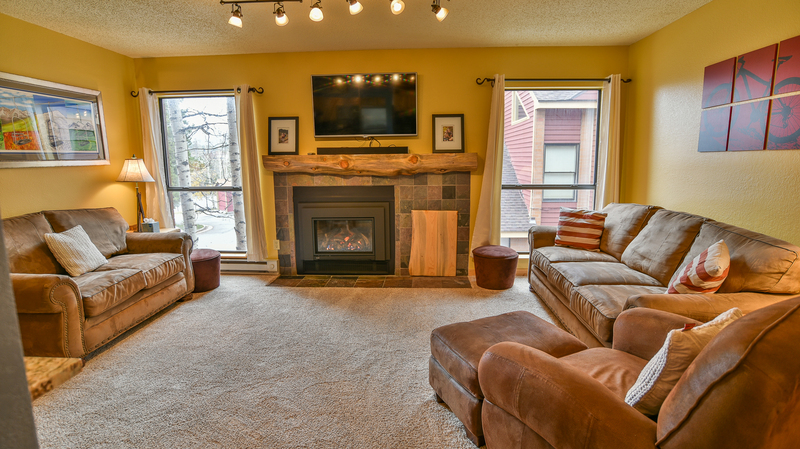 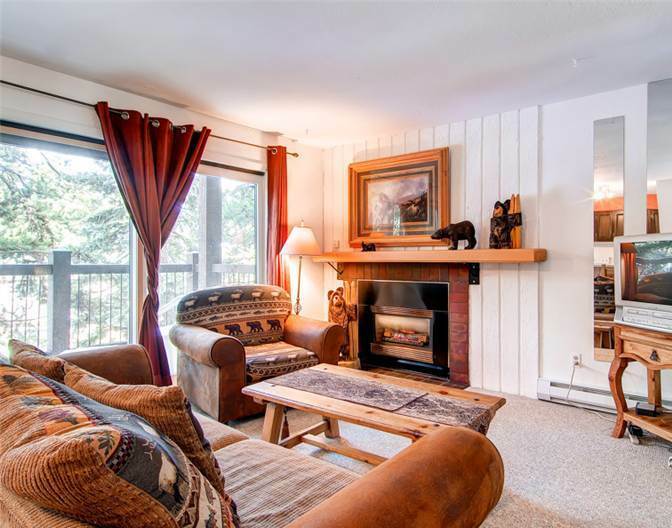 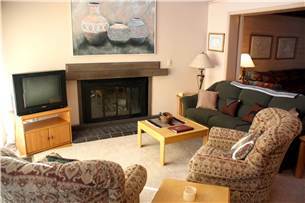 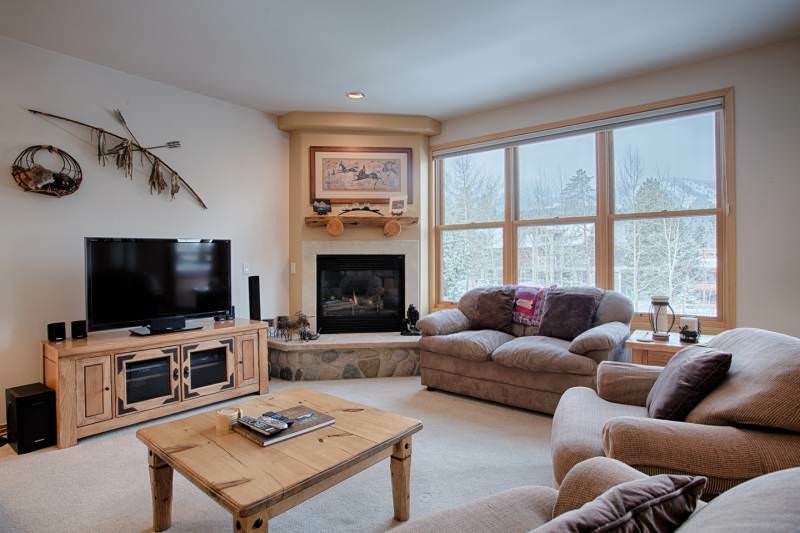 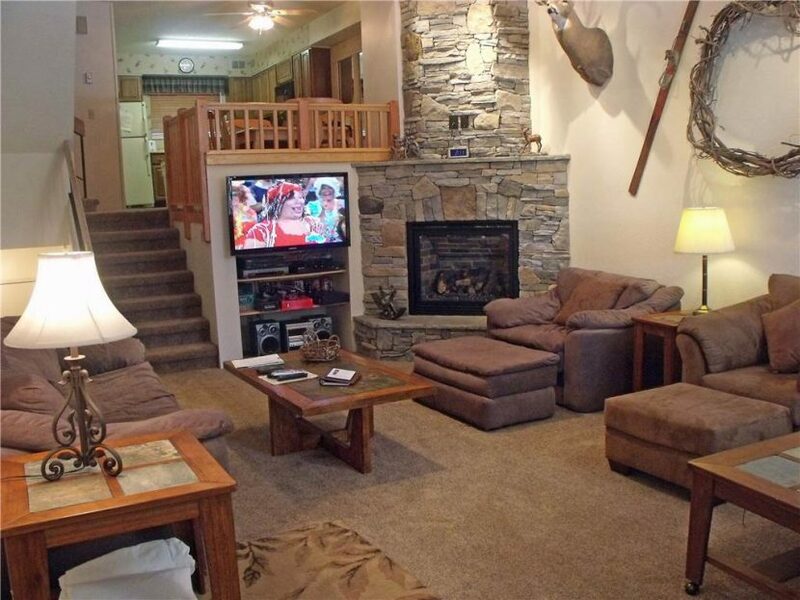 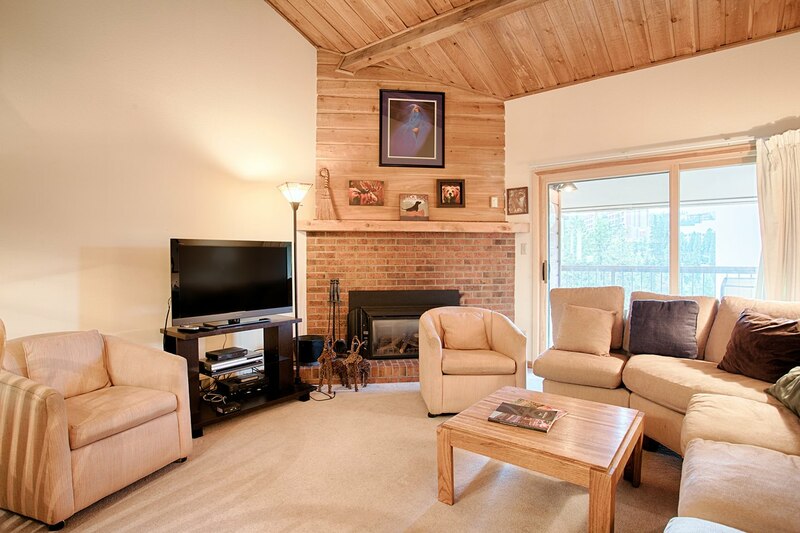 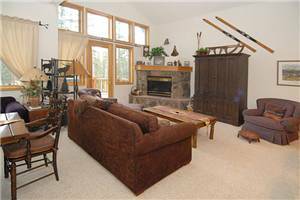 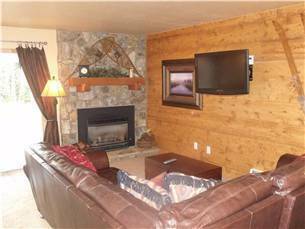 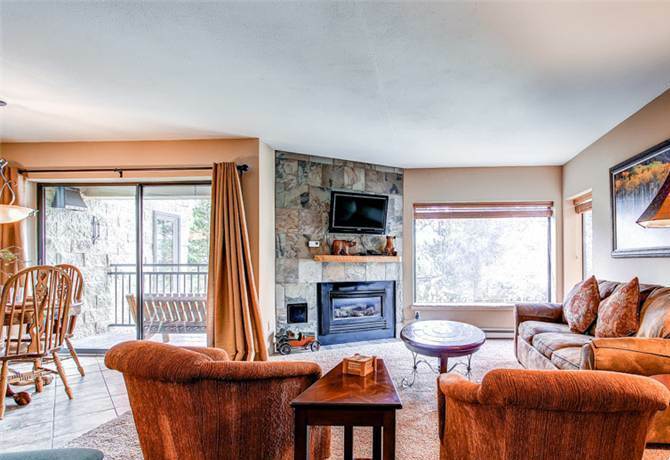 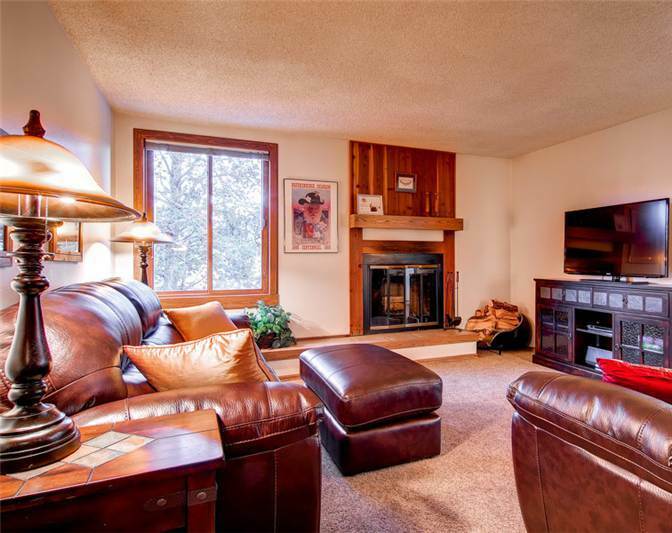 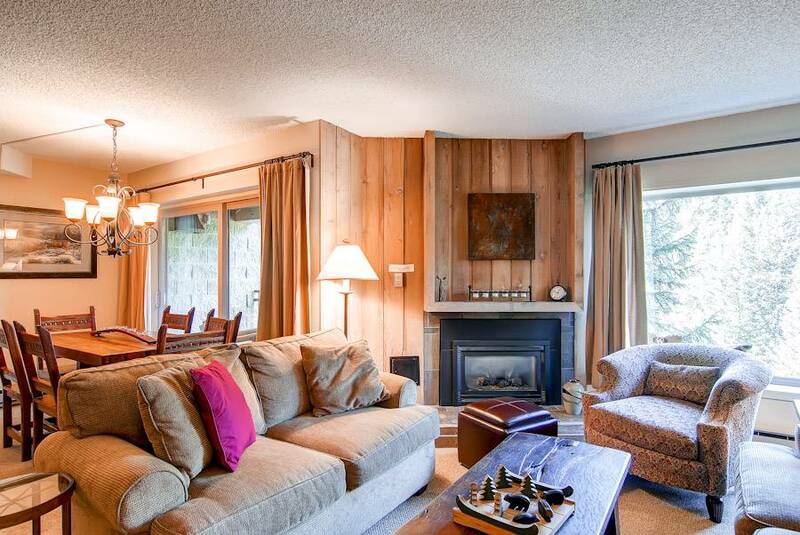 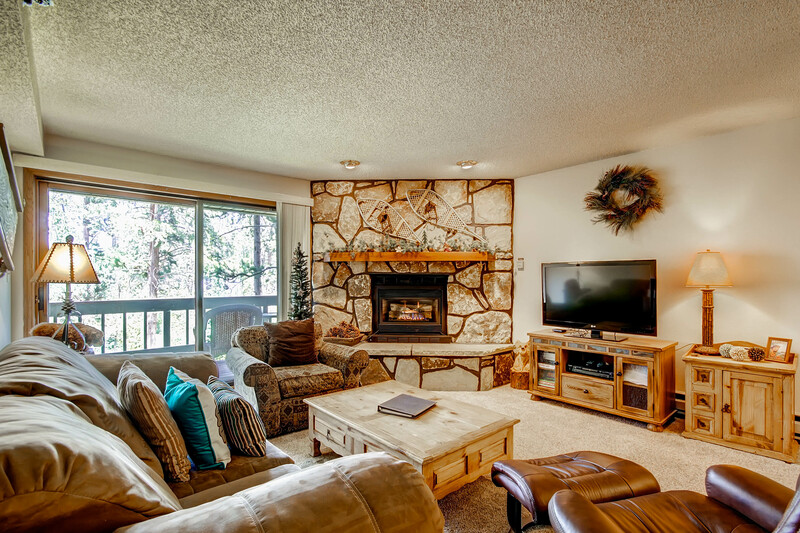 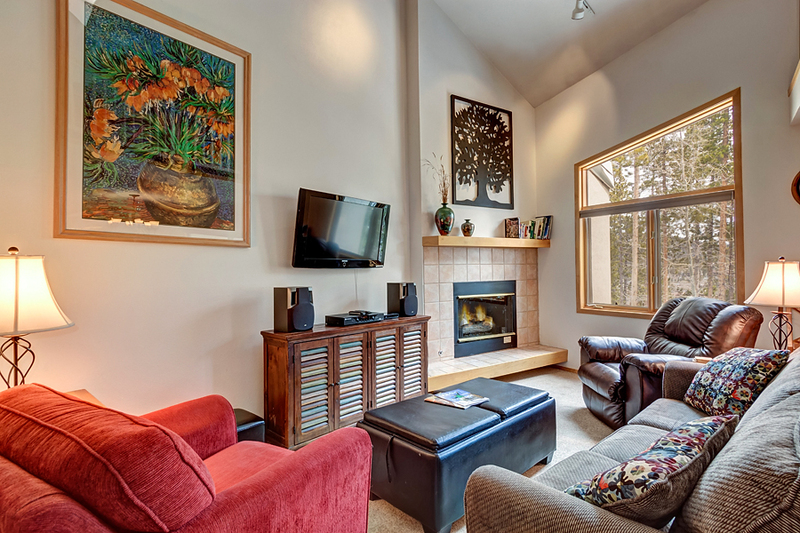 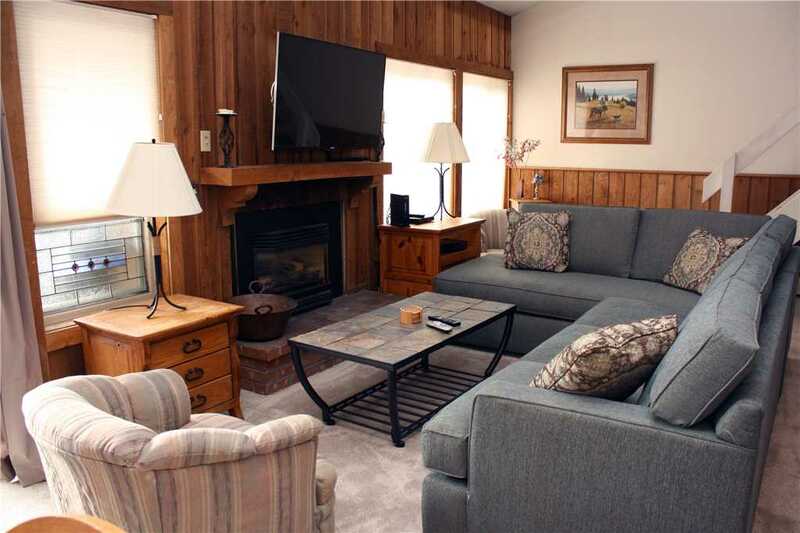 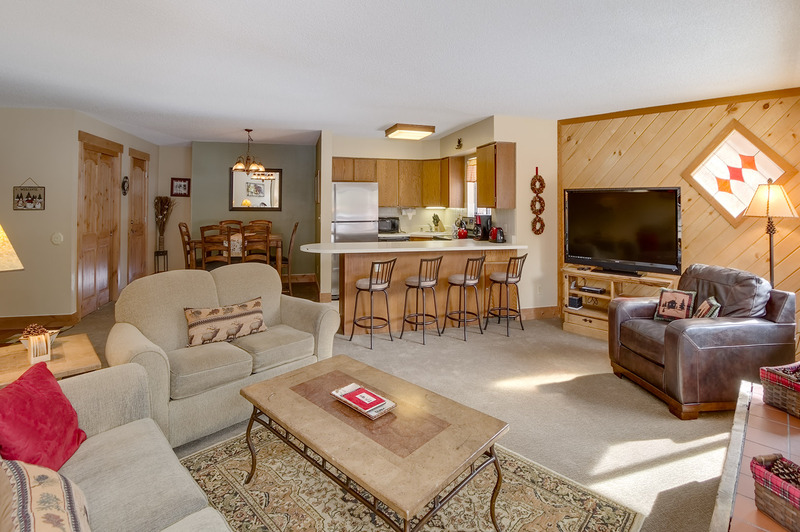 The living area features beautiful furniture, a gas fireplace and large LCD-TV — the perfect place to kick back after your mountain adventures. 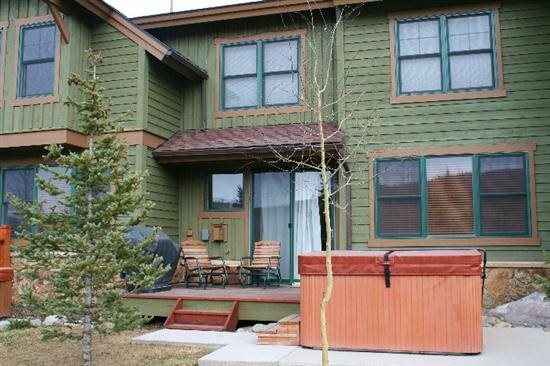 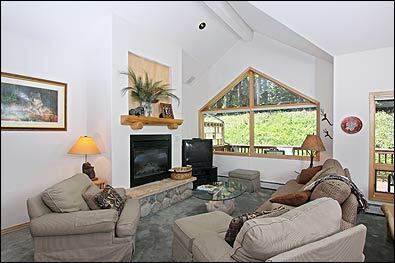 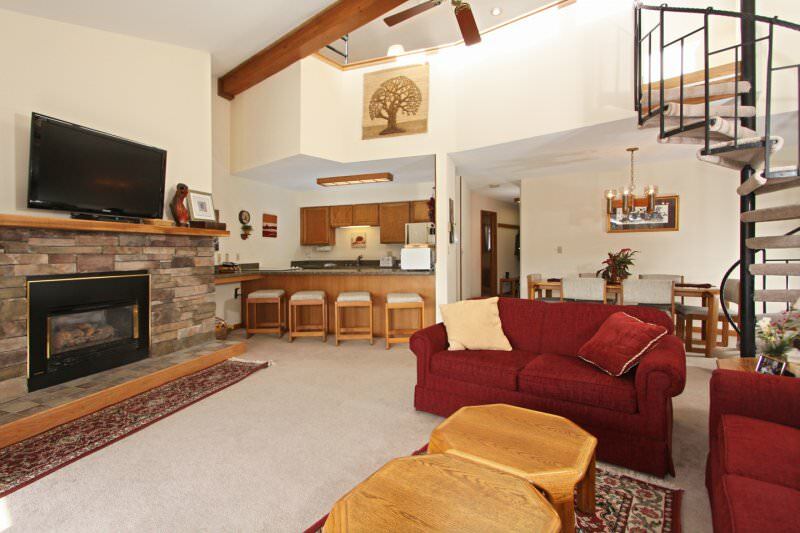 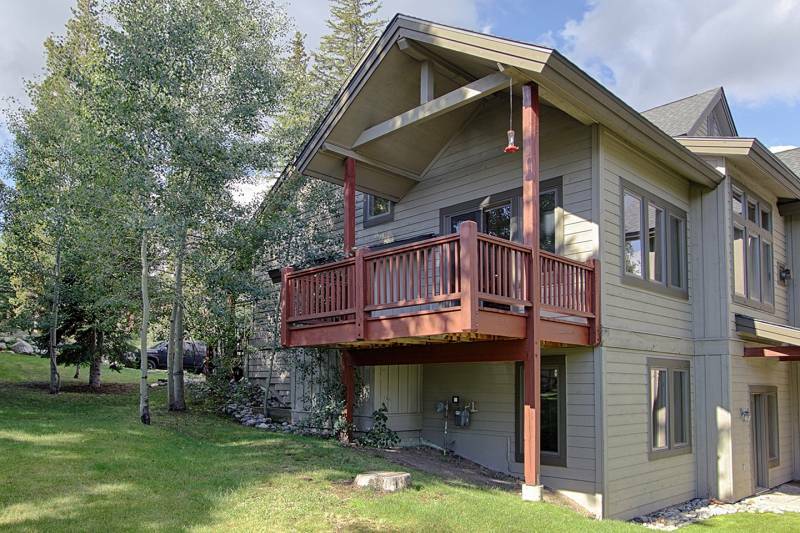 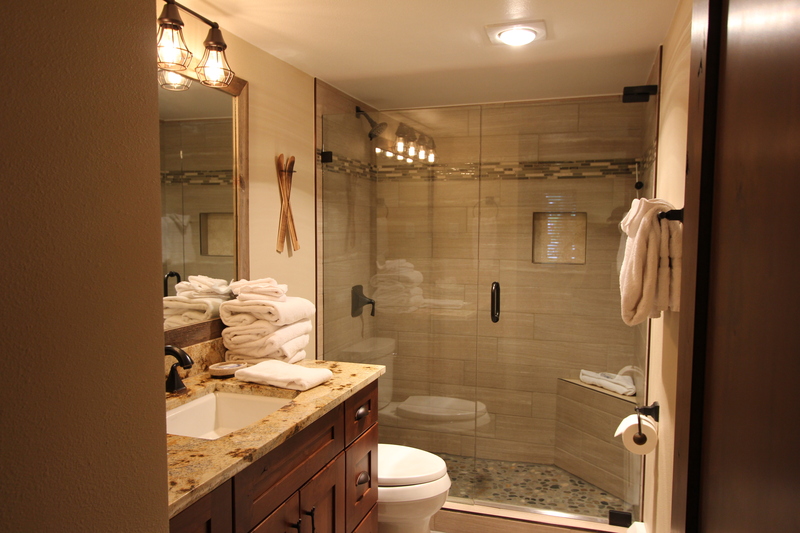 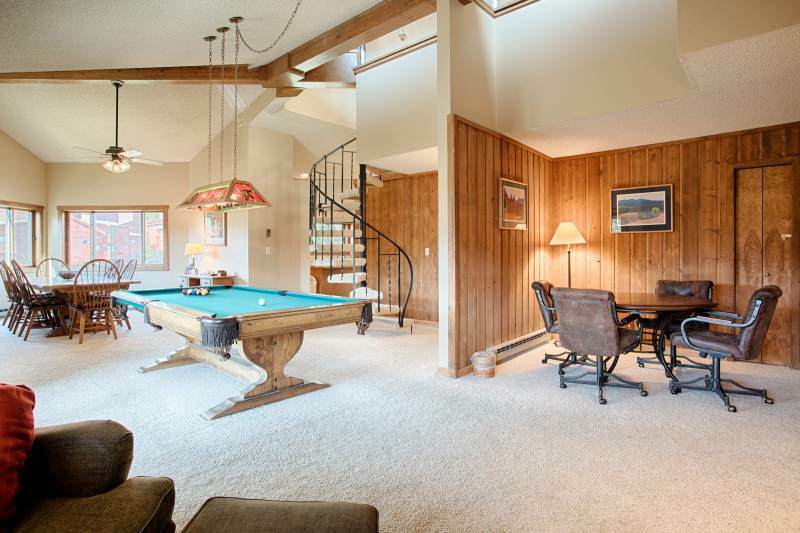 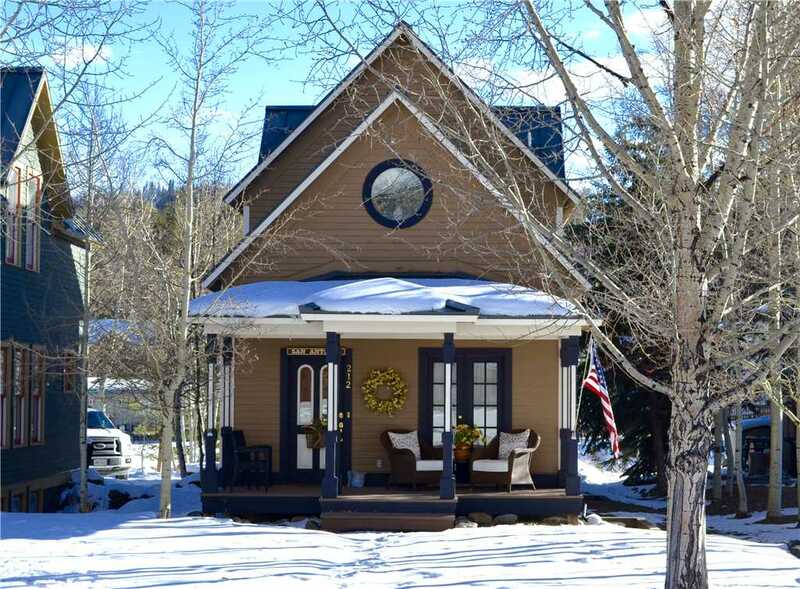 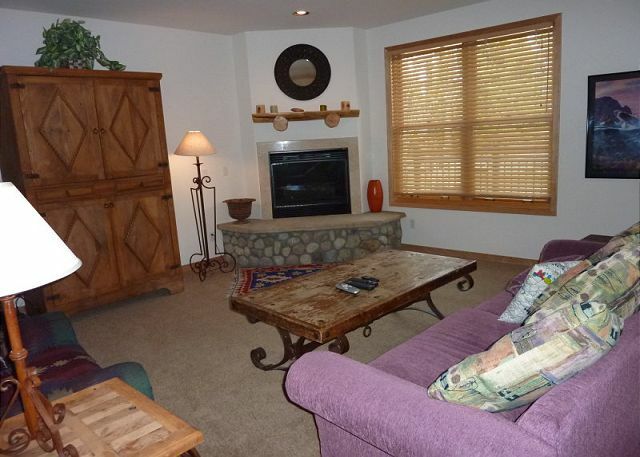 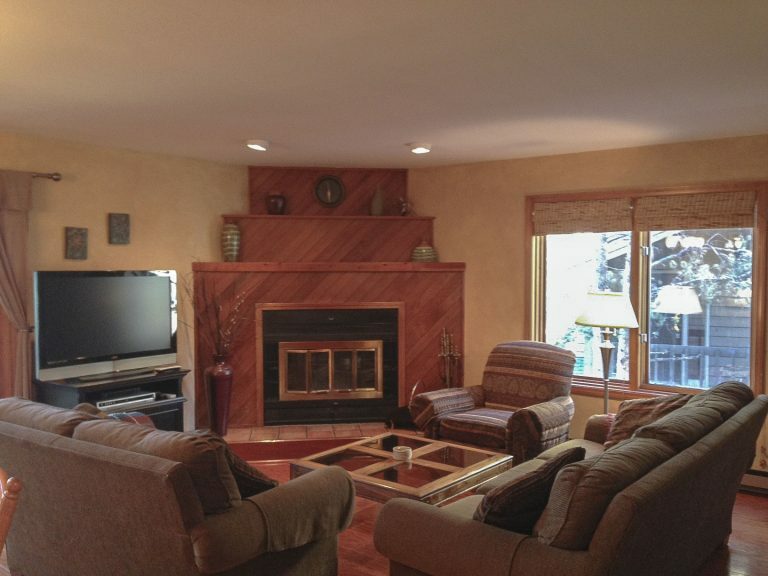 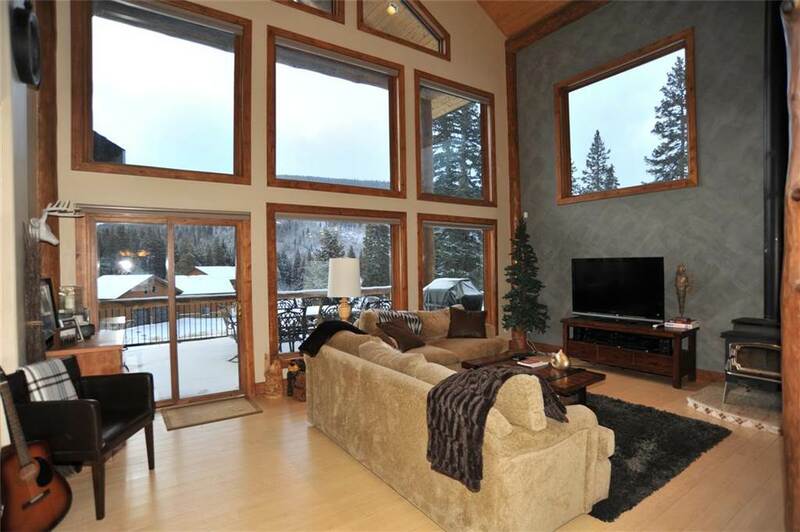 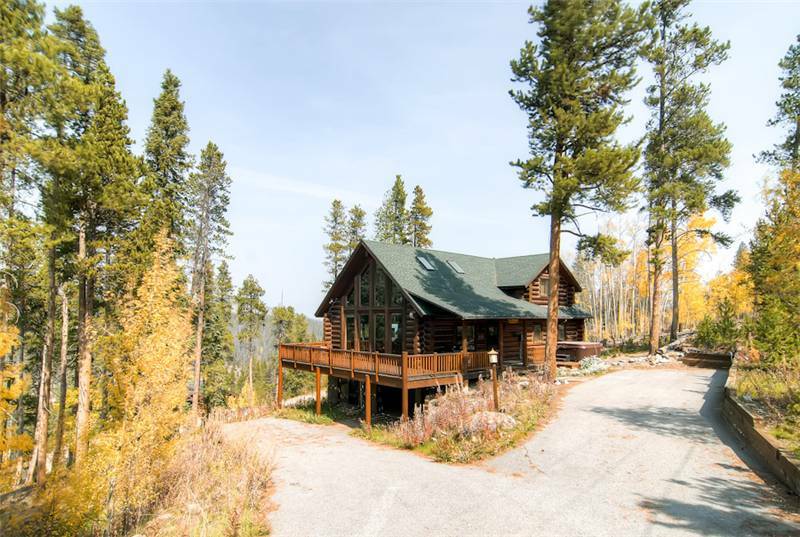 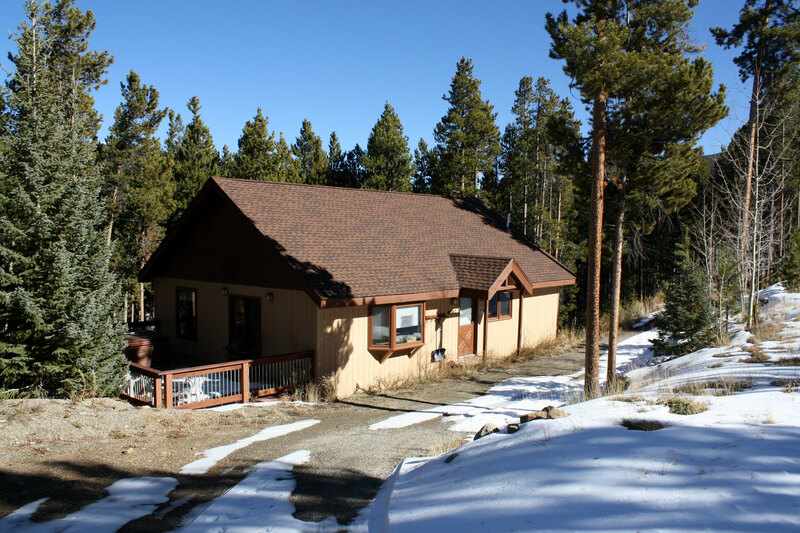 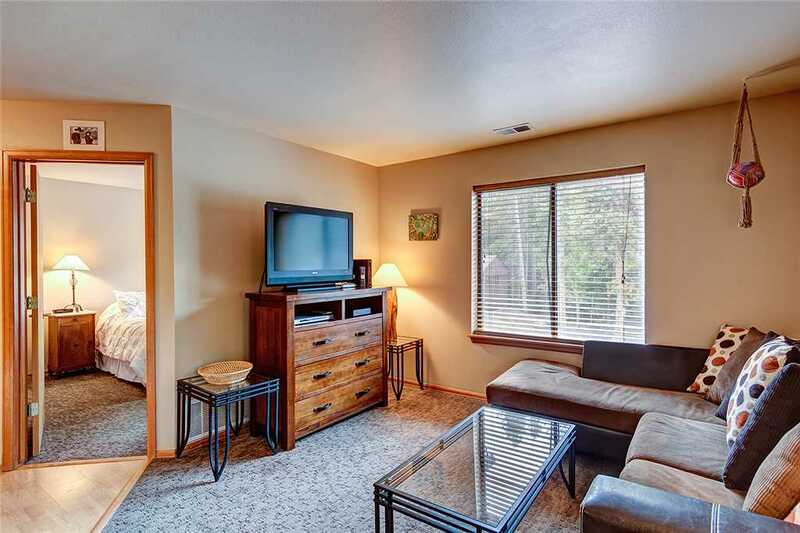 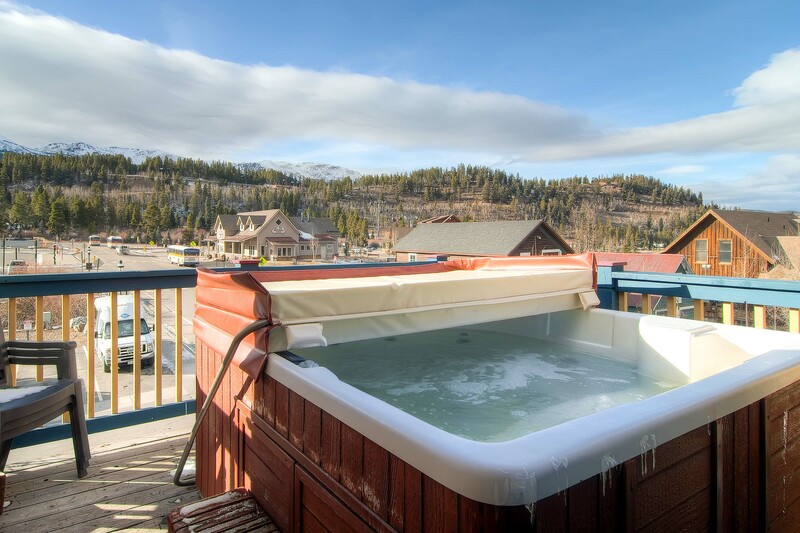 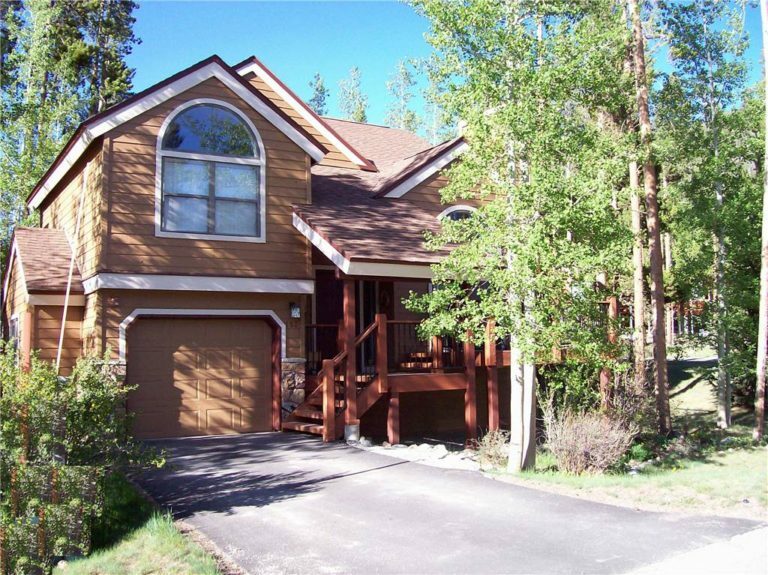 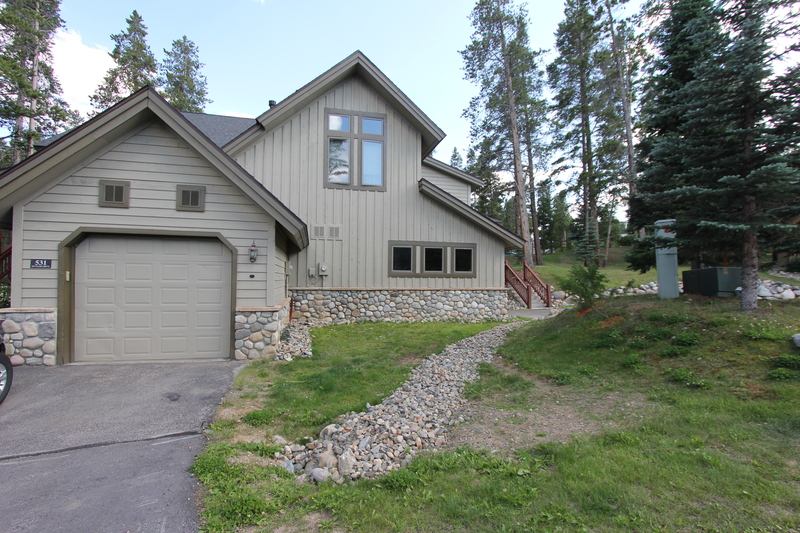 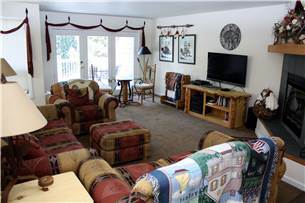 Or, take in the lake and mountain views while soaking in your own private hot tub on the patio! 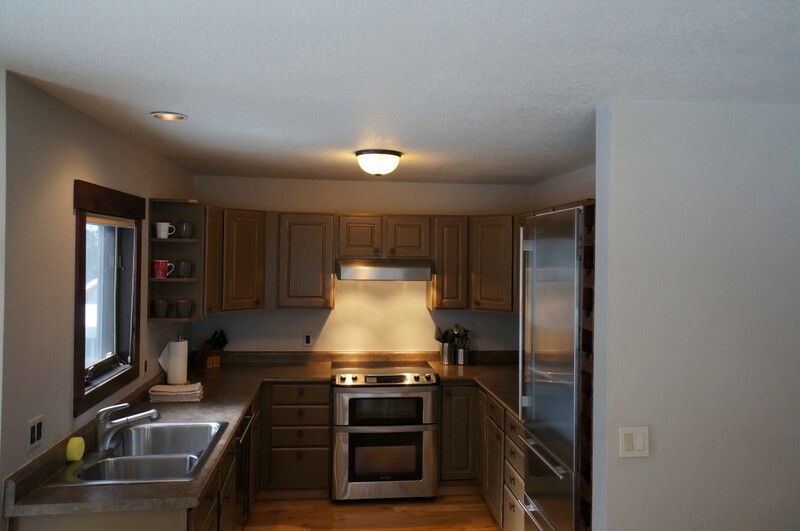 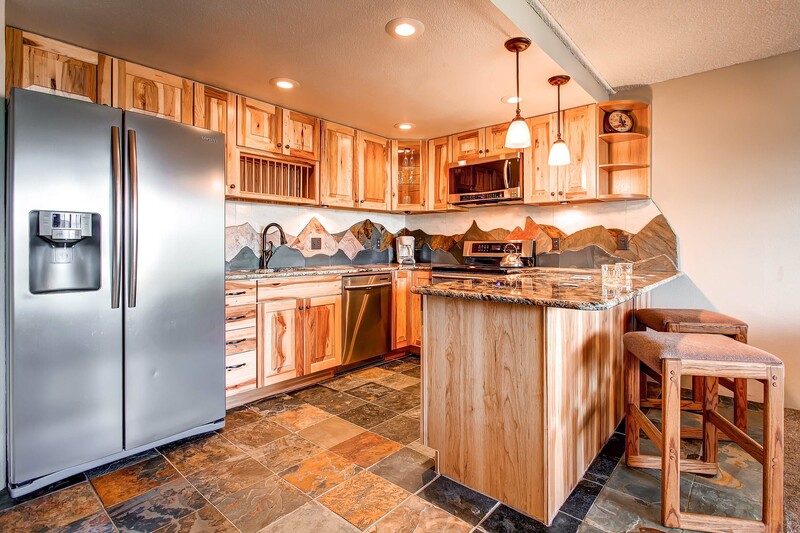 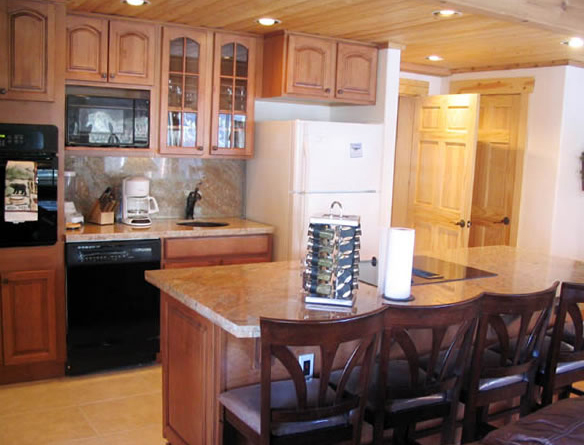 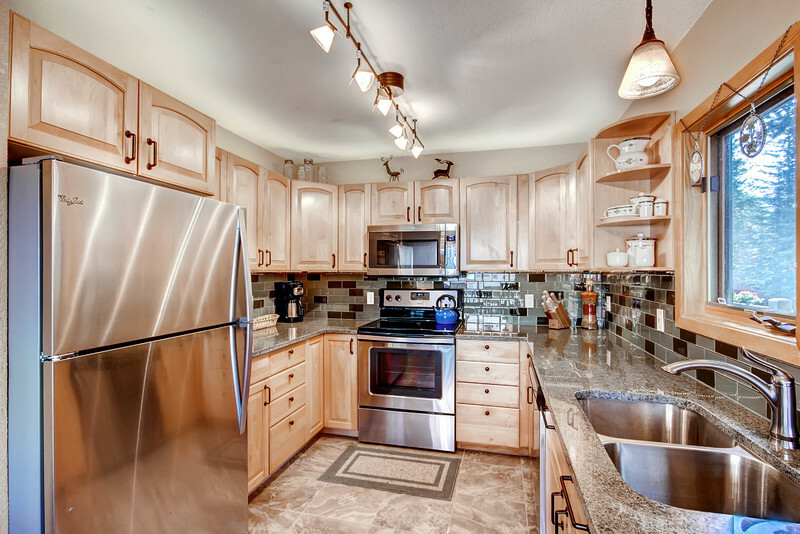 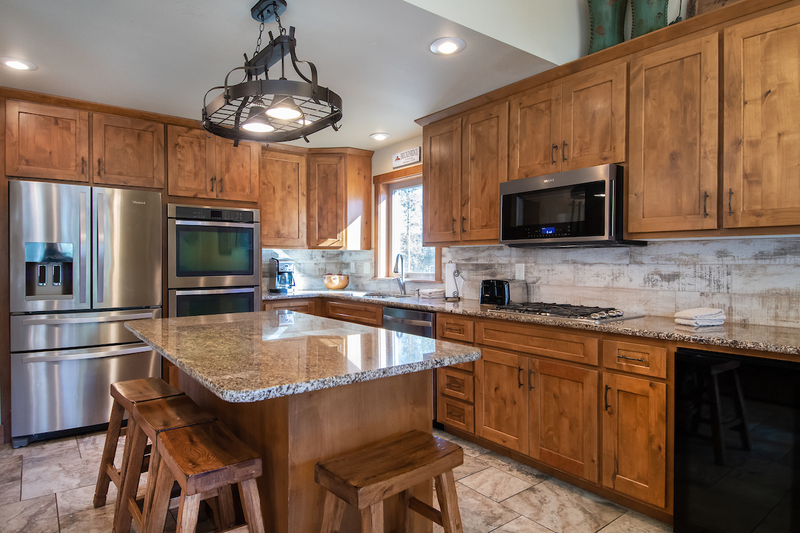 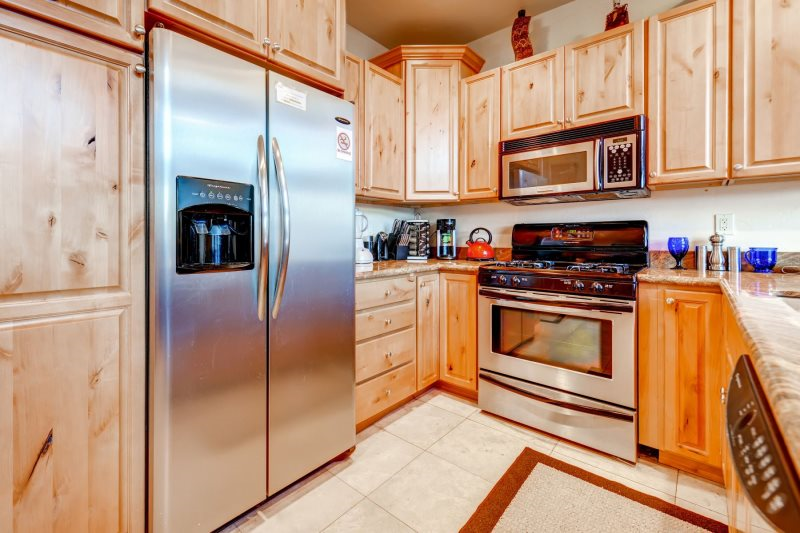 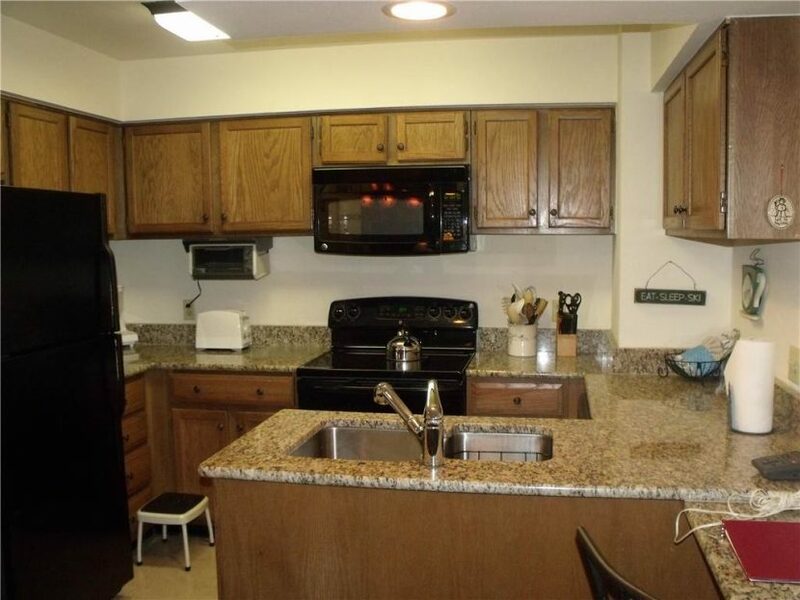 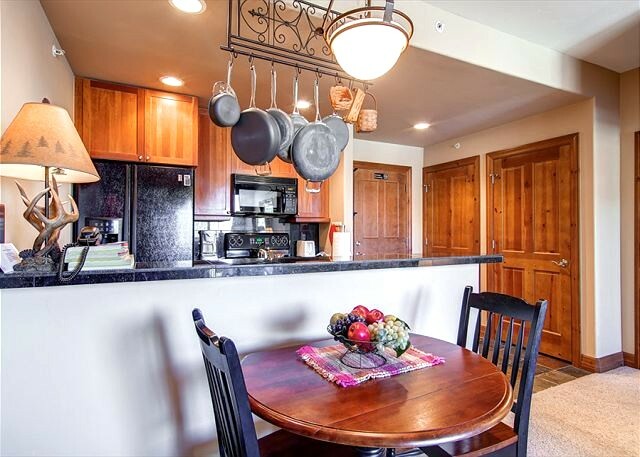 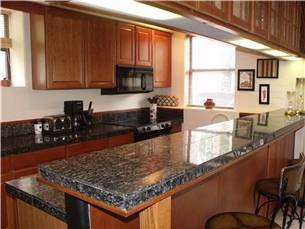 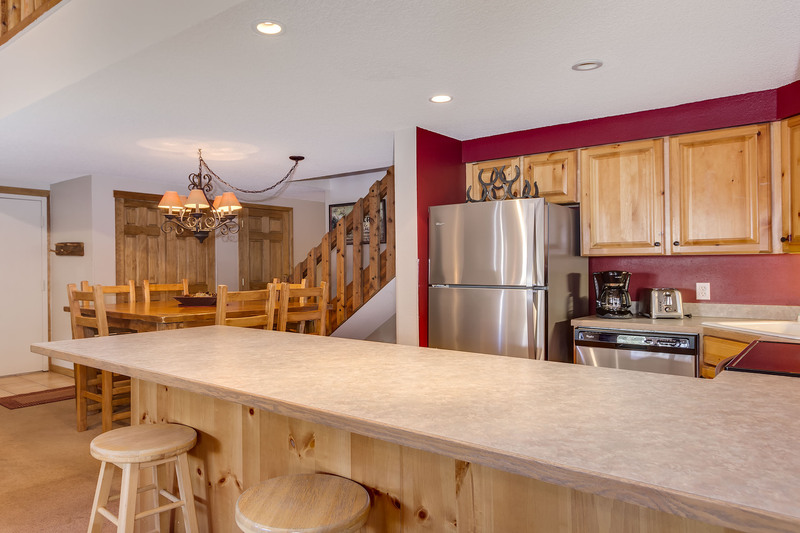 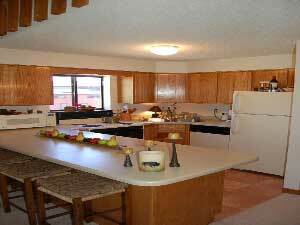 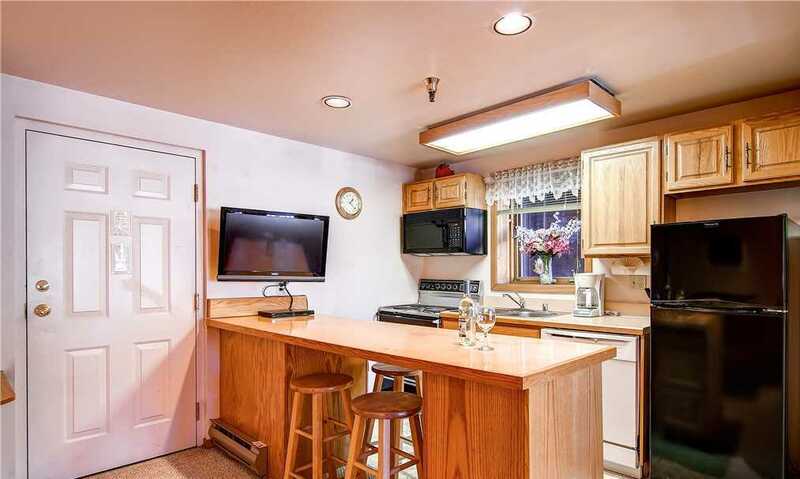 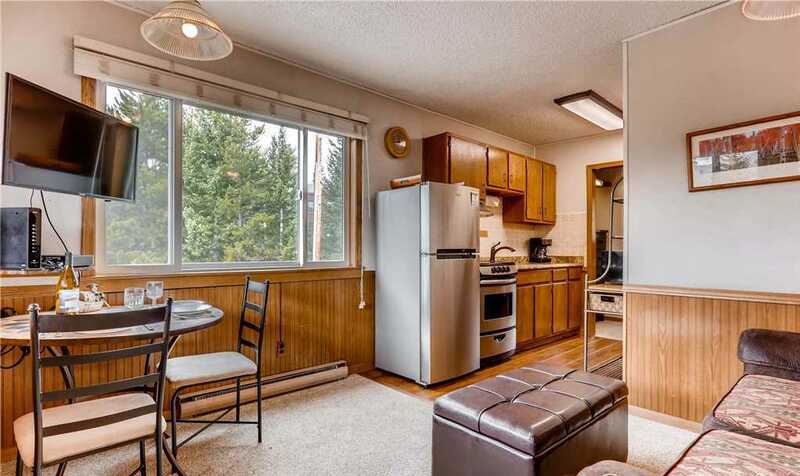 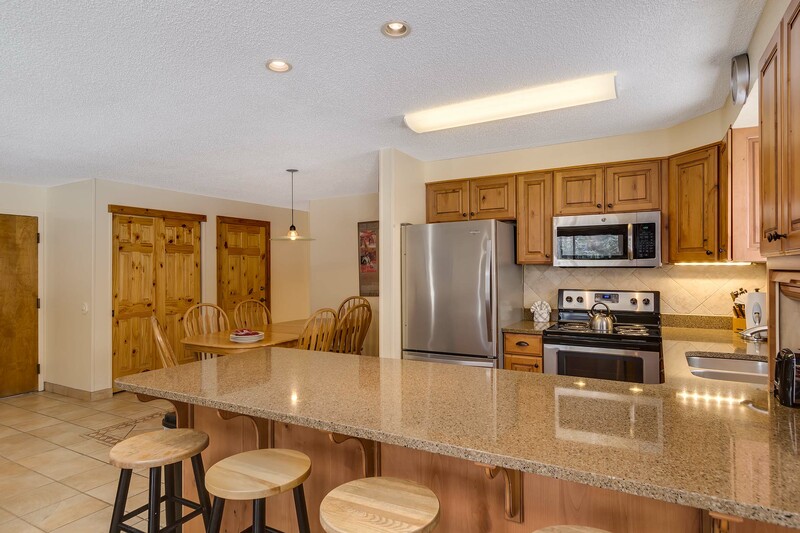 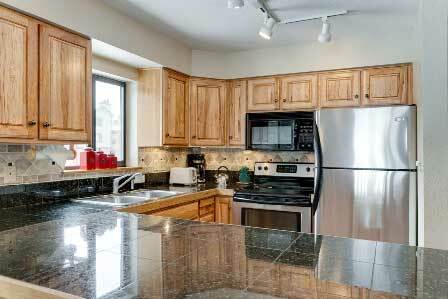 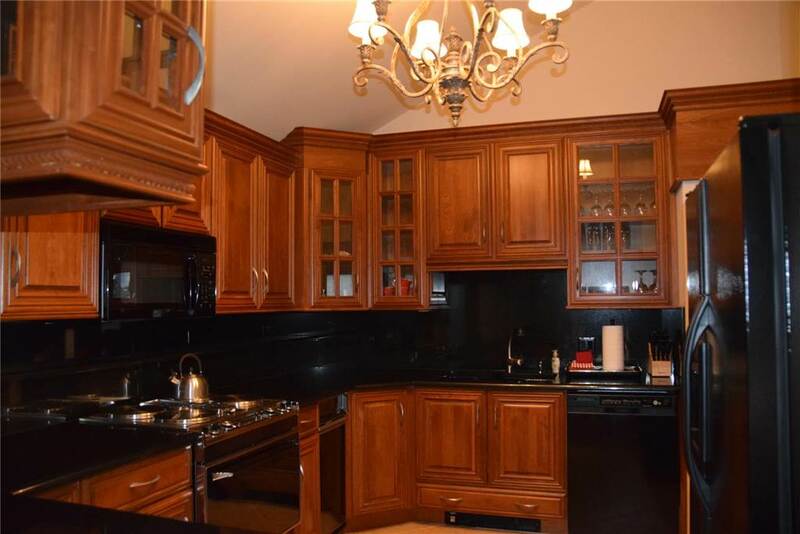 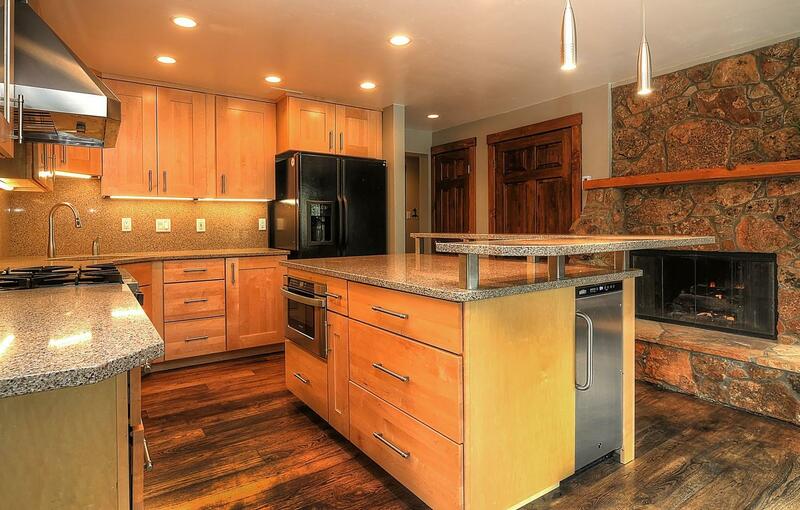 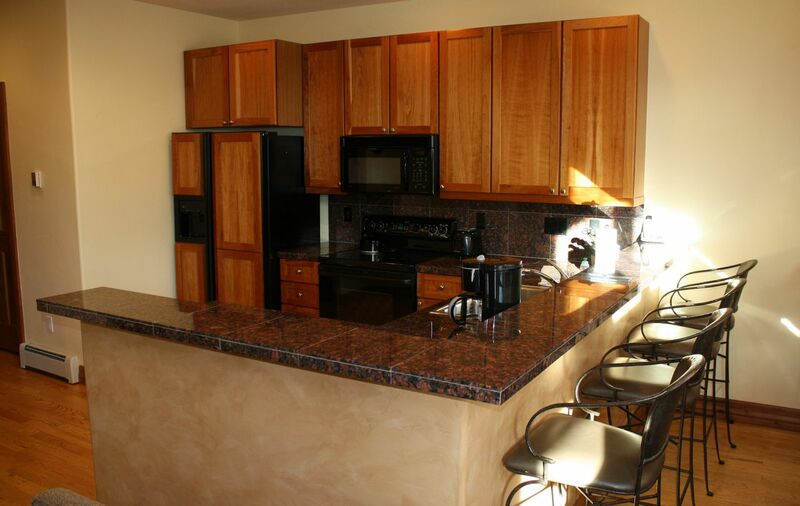 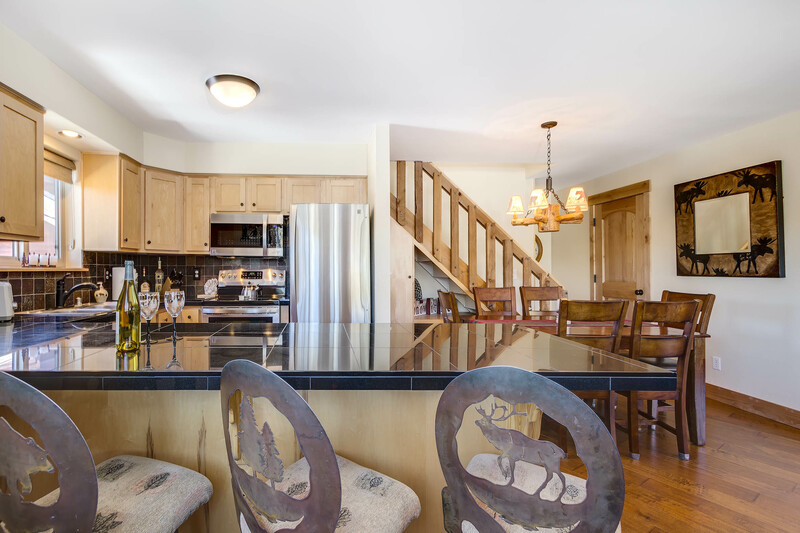 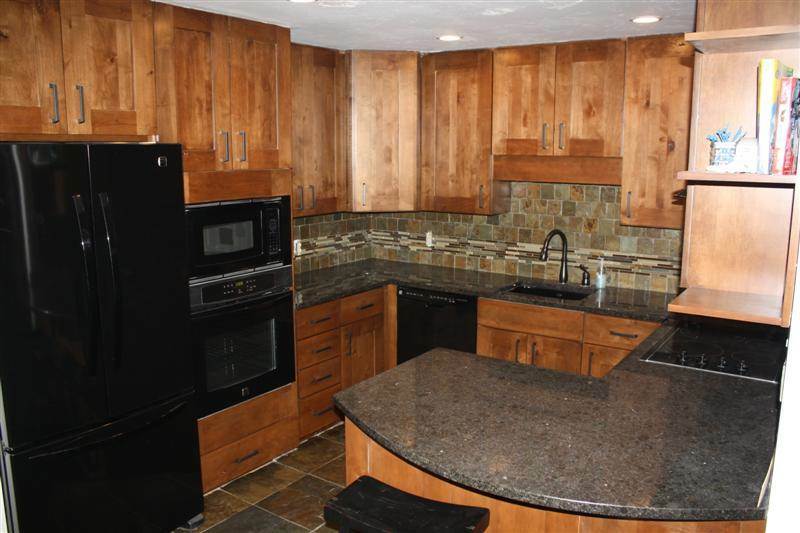 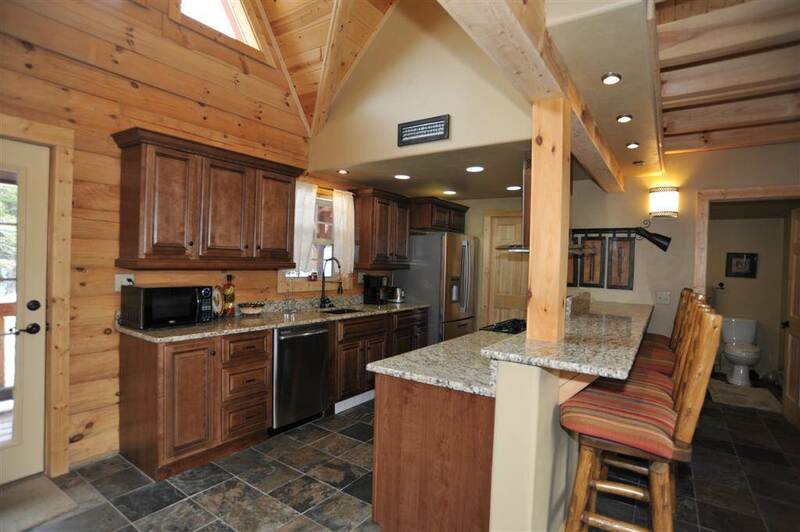 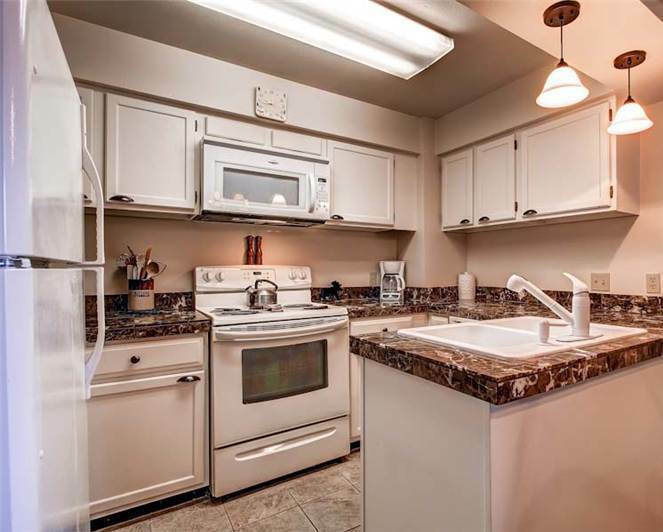 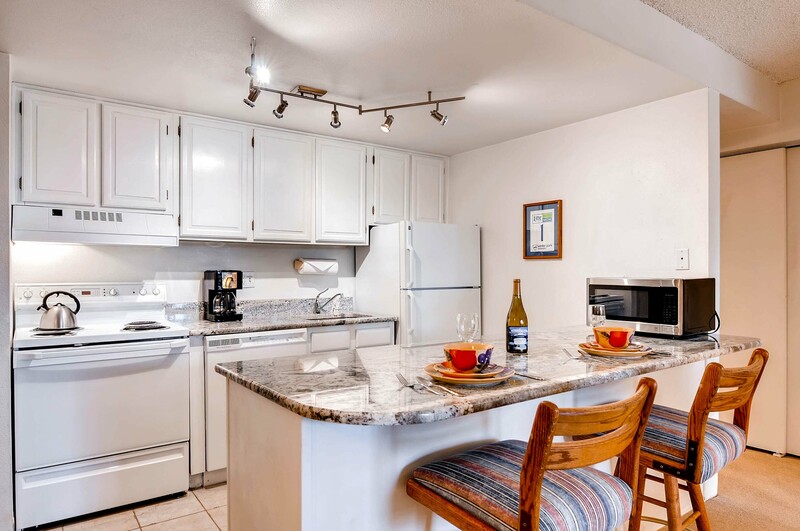 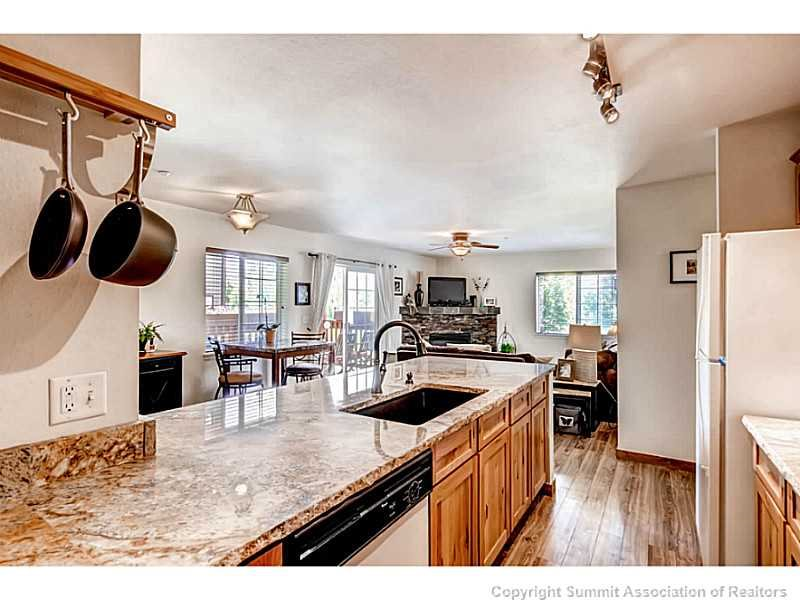 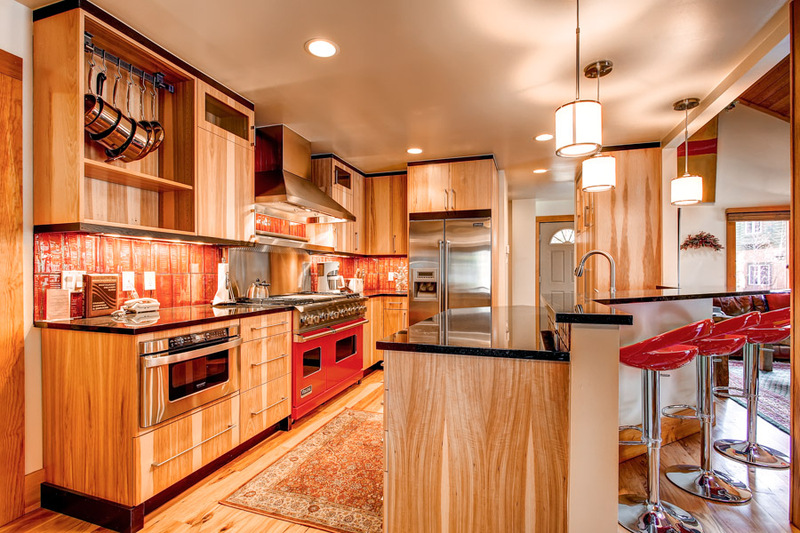 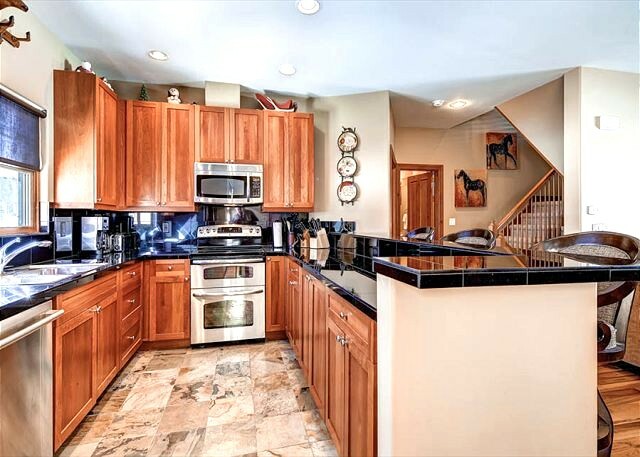 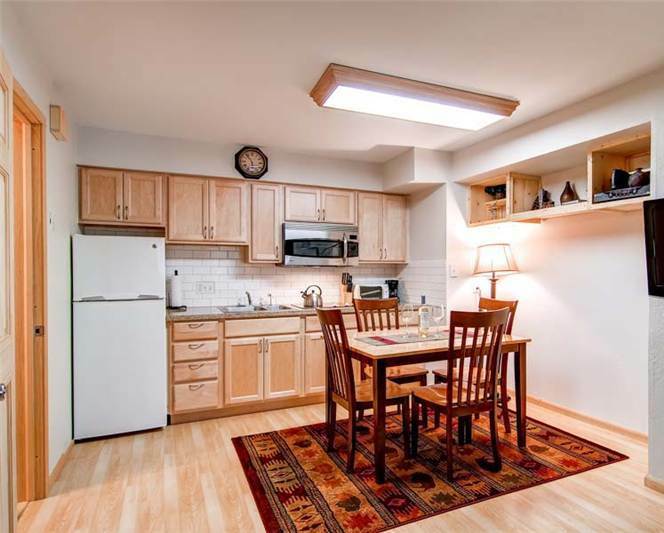 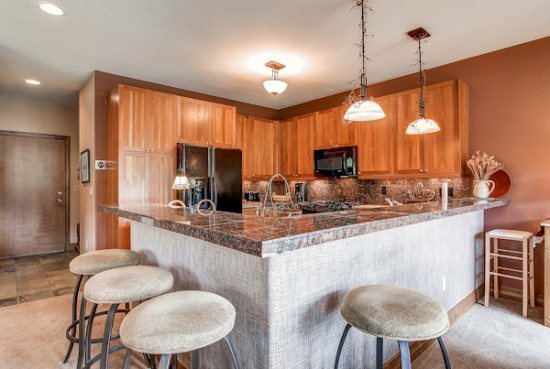 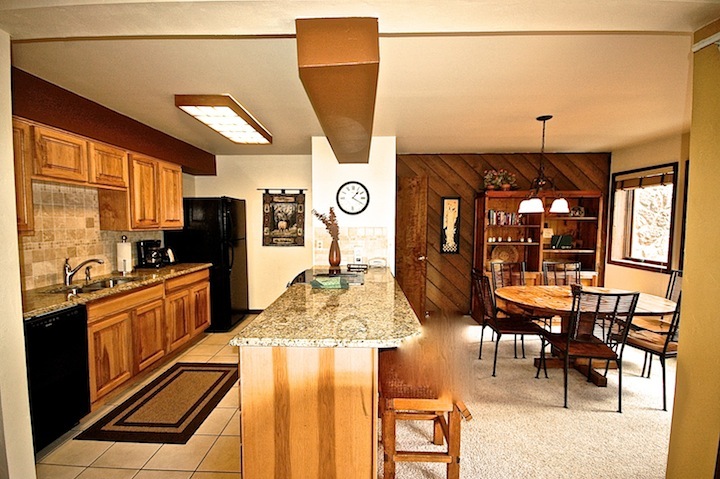 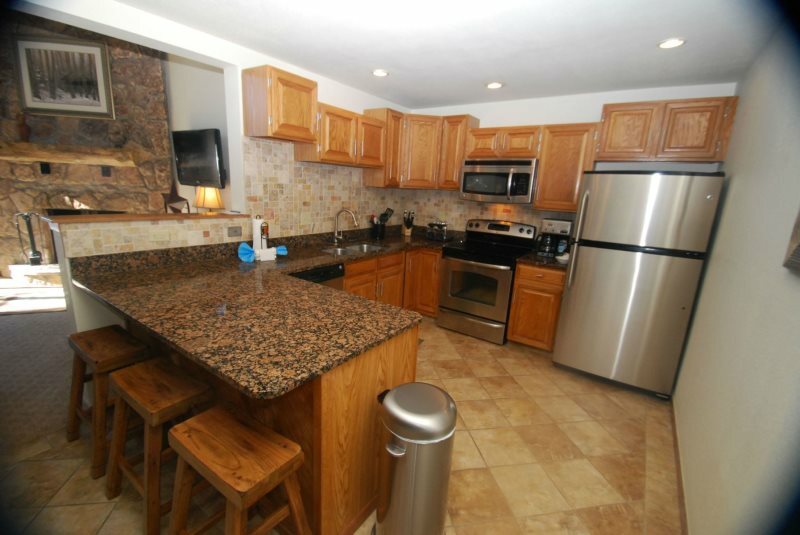 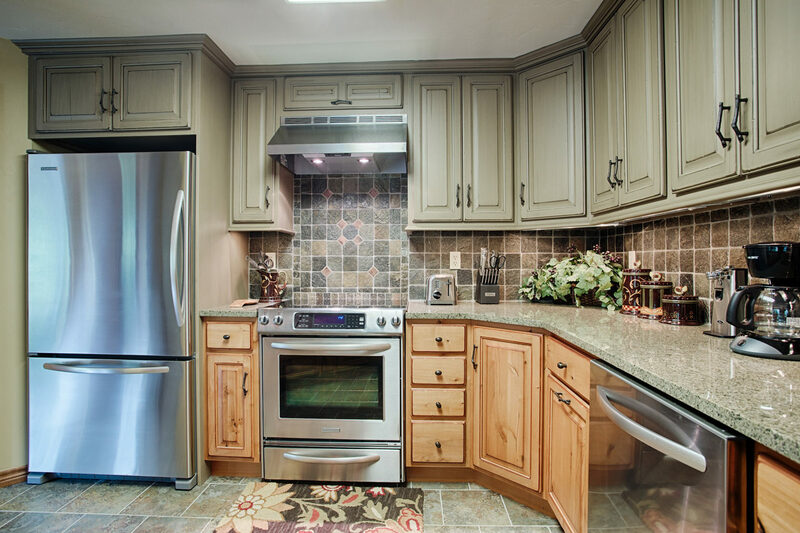 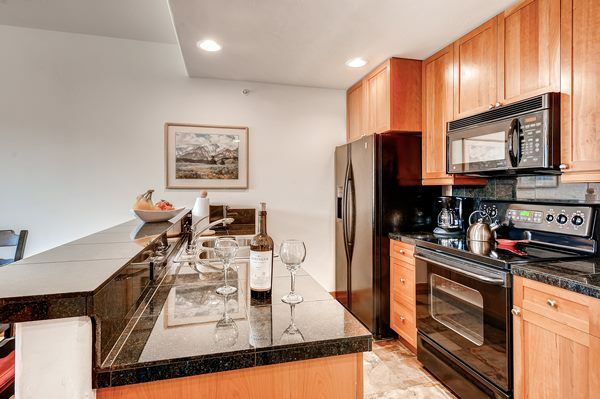 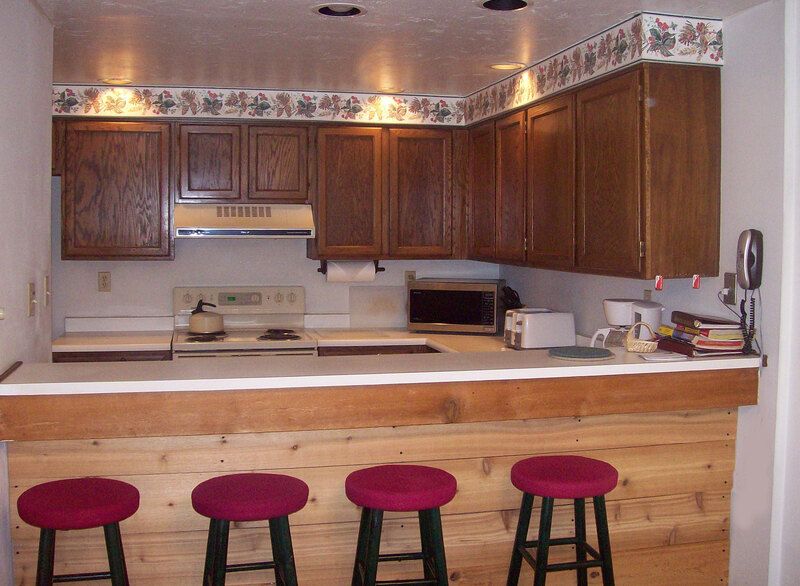 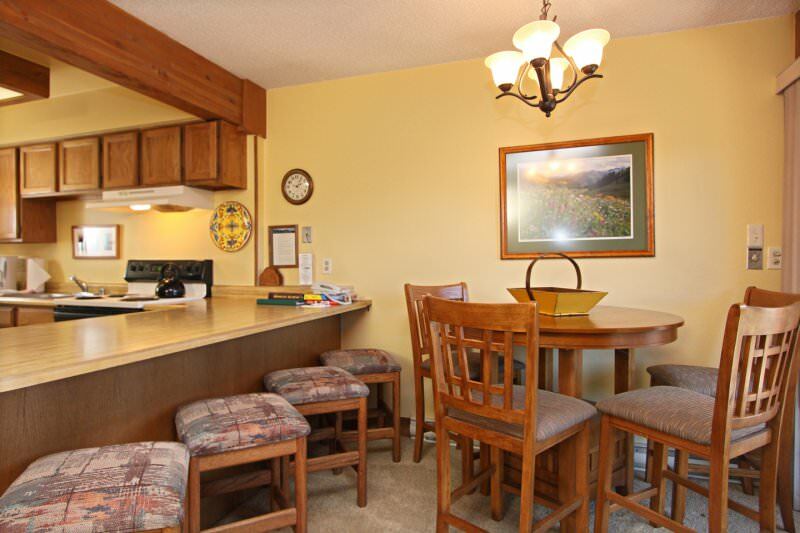 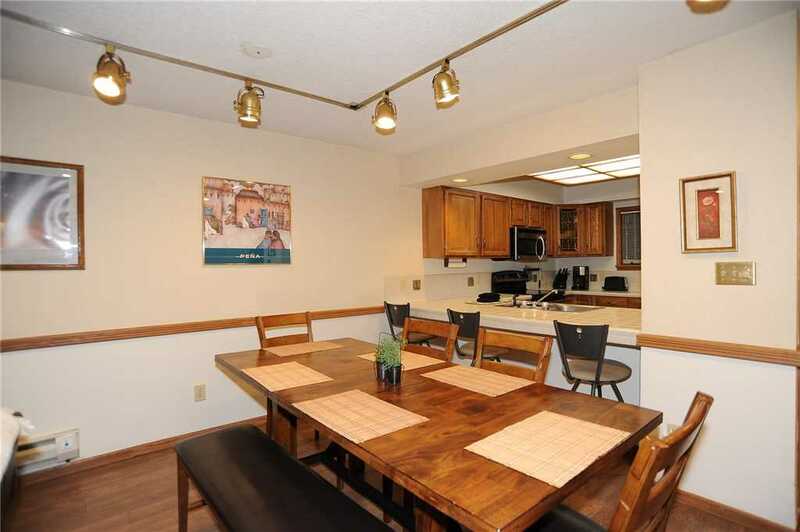 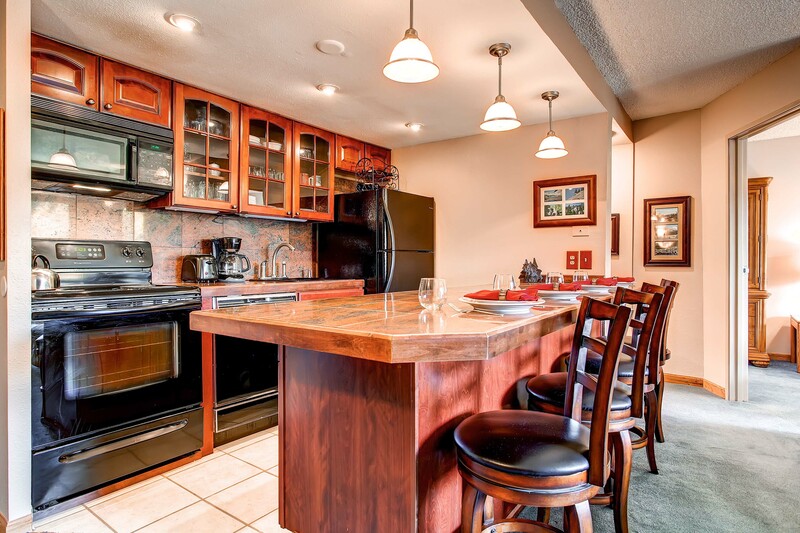 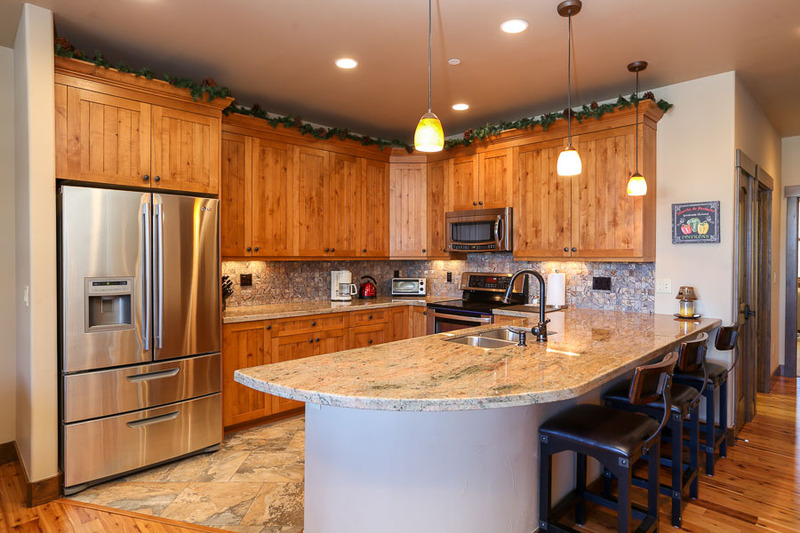 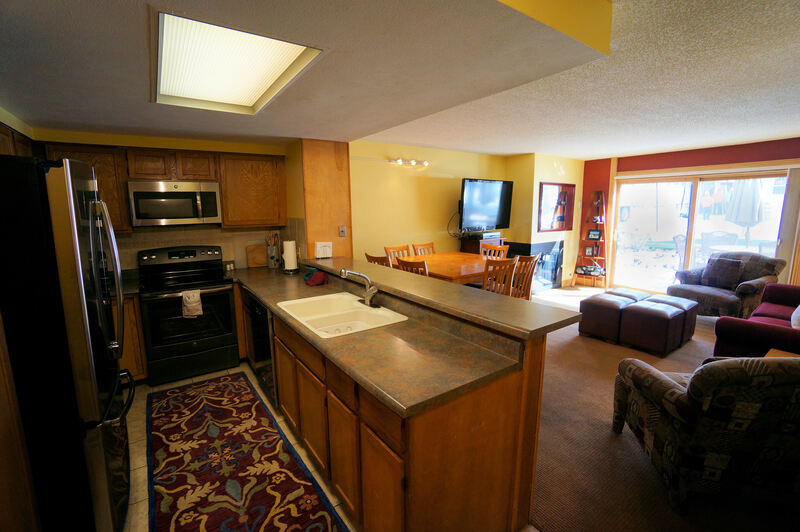 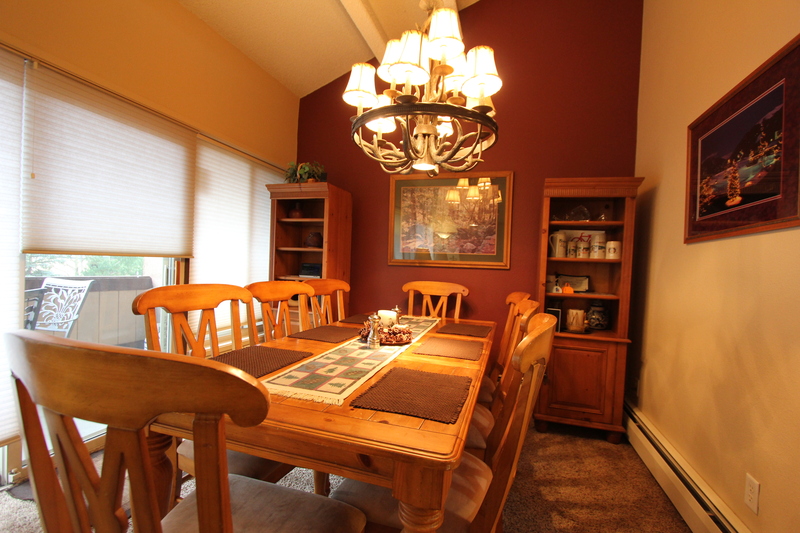 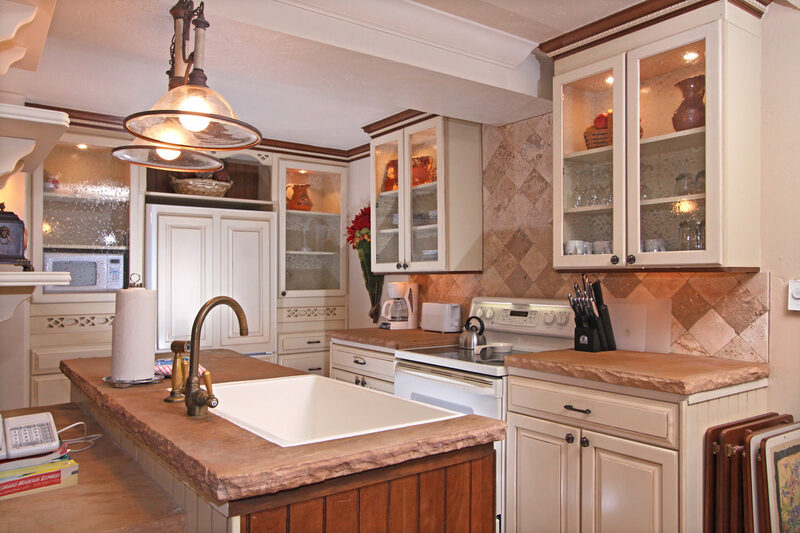 The kitchen is equally nice, with large granite counters, custom cabinetry and stainless steel appliances. 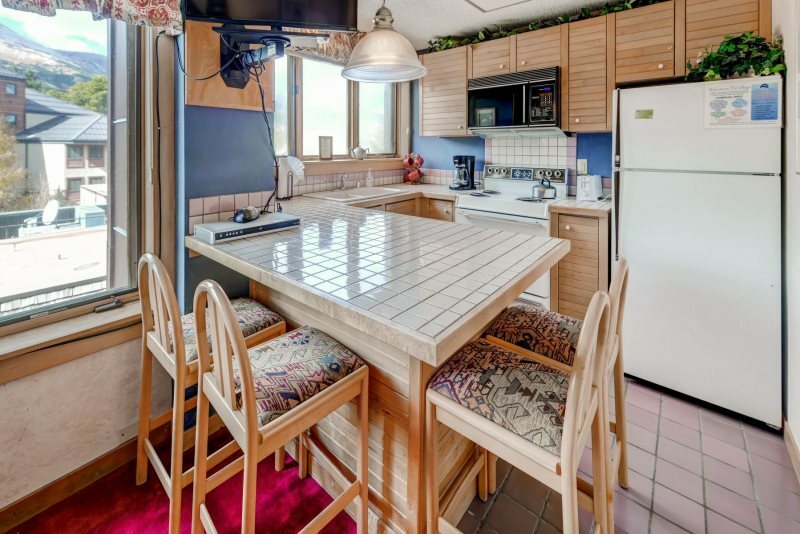 The dining table seats four, and there’s room for three at the counter. 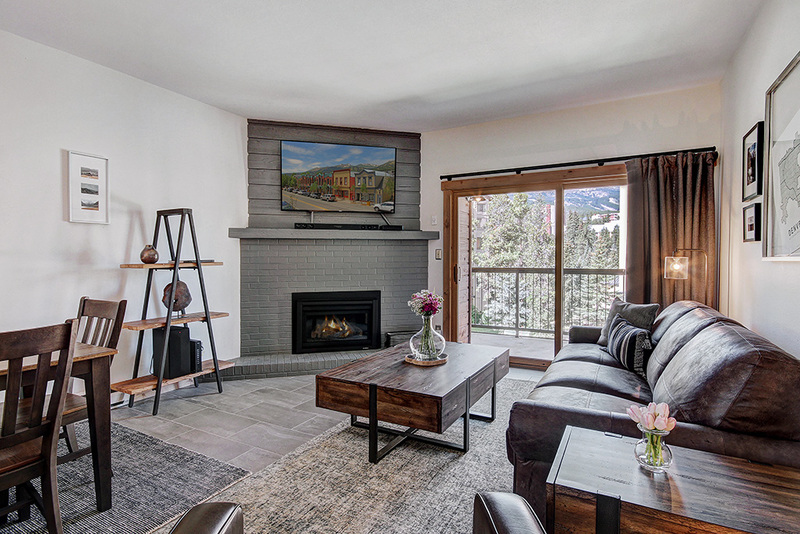 You’ll also find all amenities you’d expect in a high-end mountain home, including a washer and dryer, a two-car garage and complimentary Wi-Fi throughout the unit. 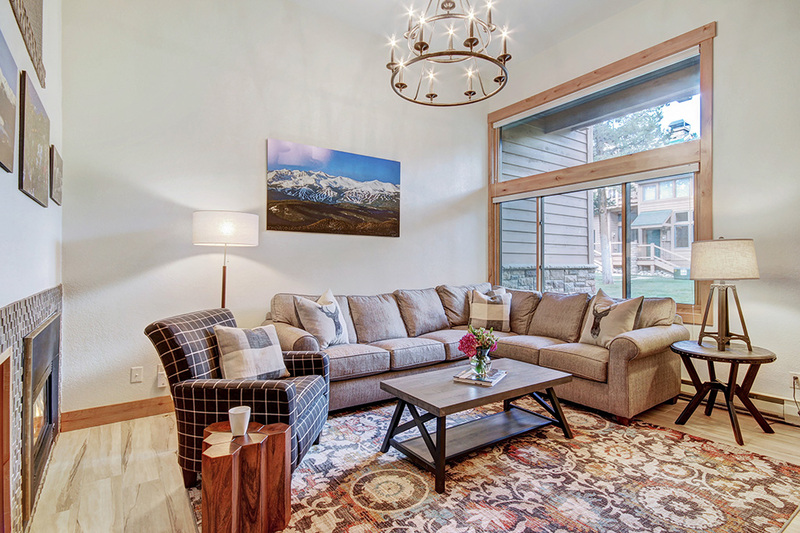 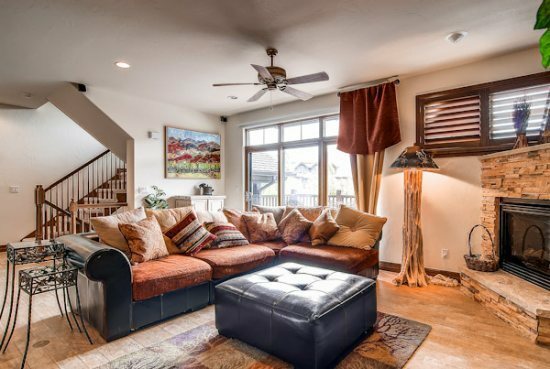 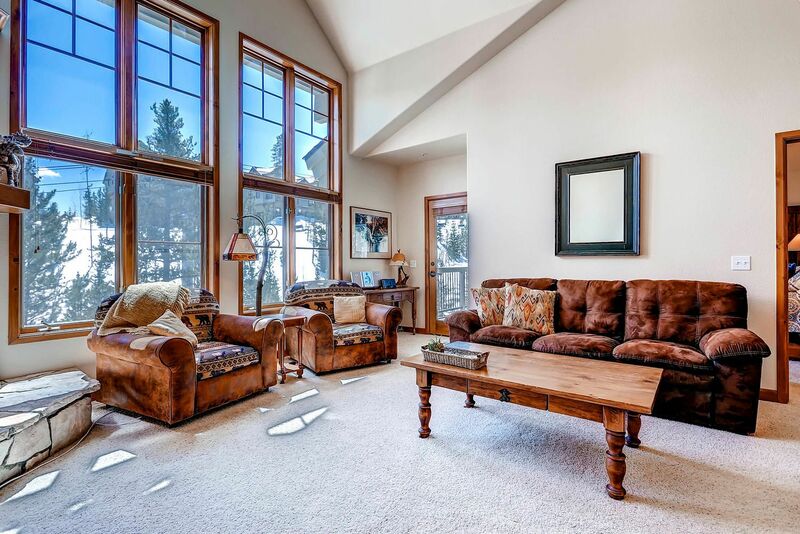 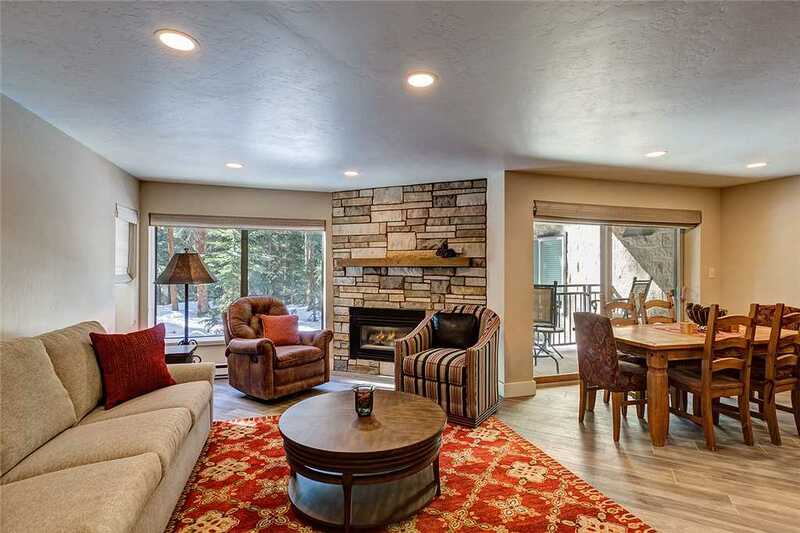 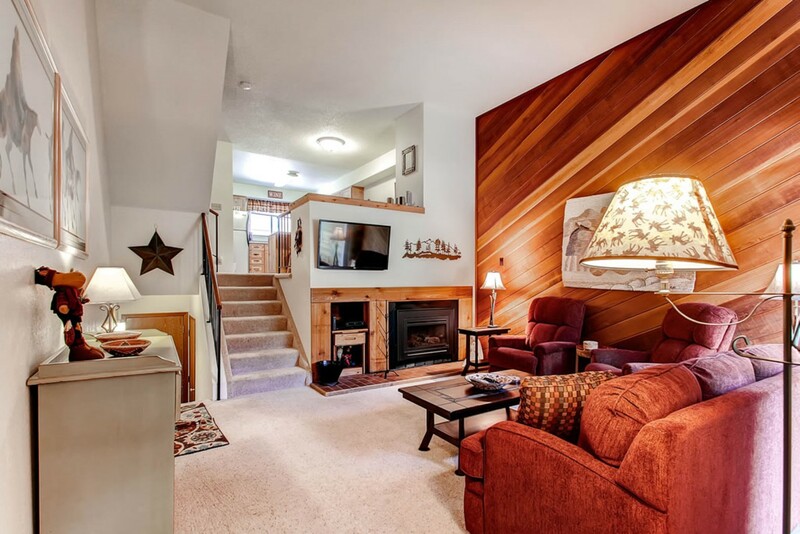 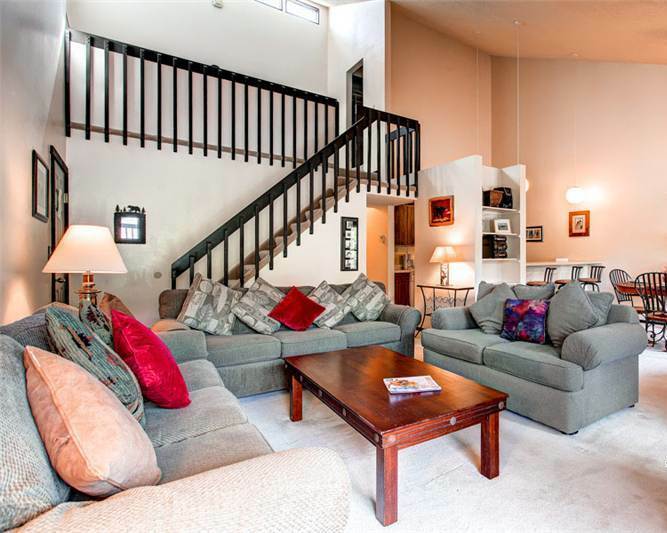 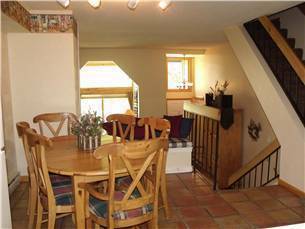 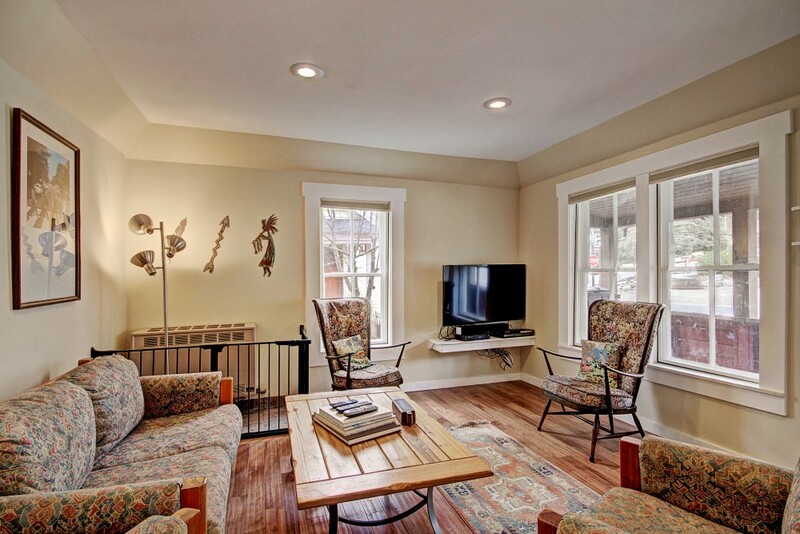 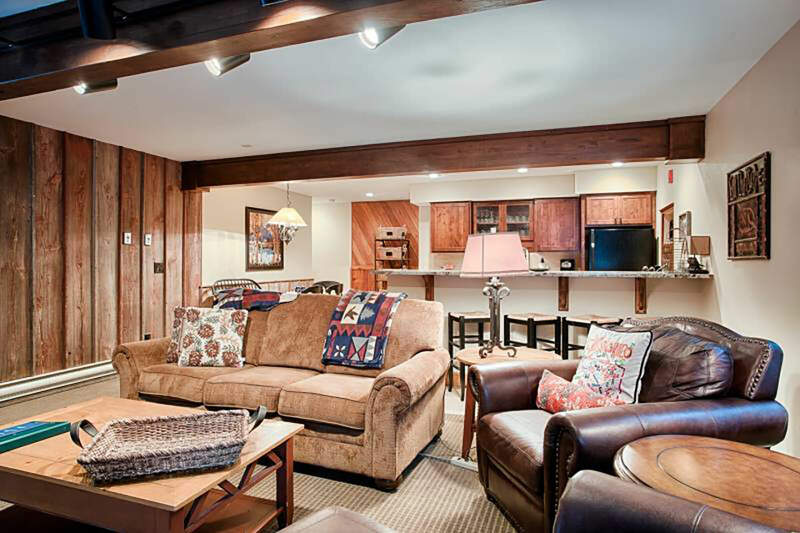 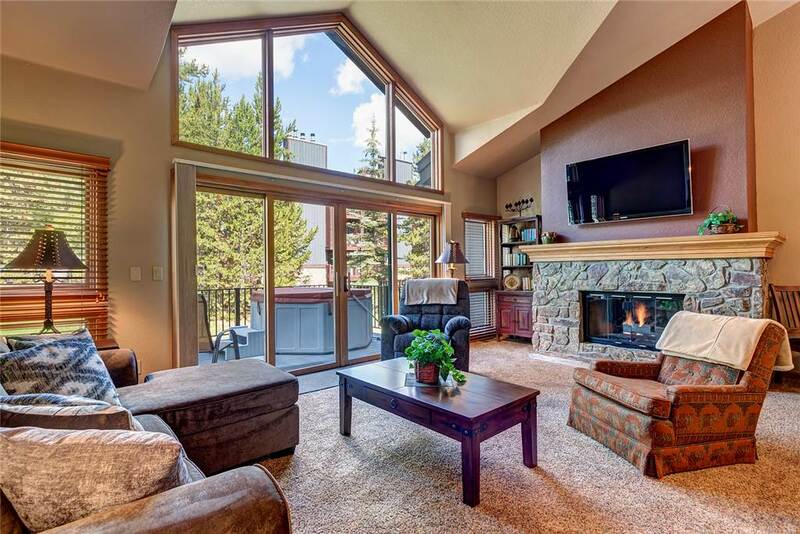 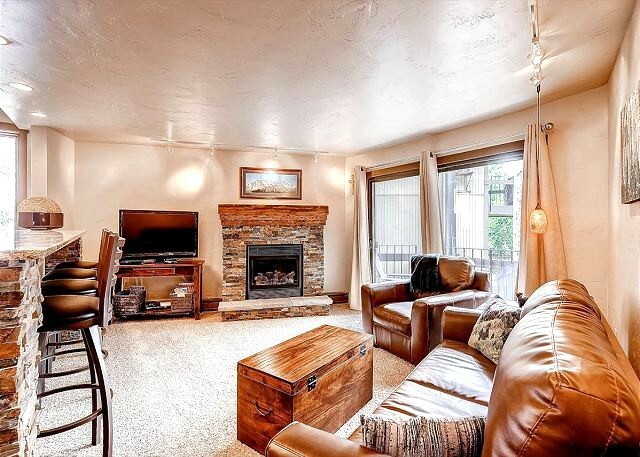 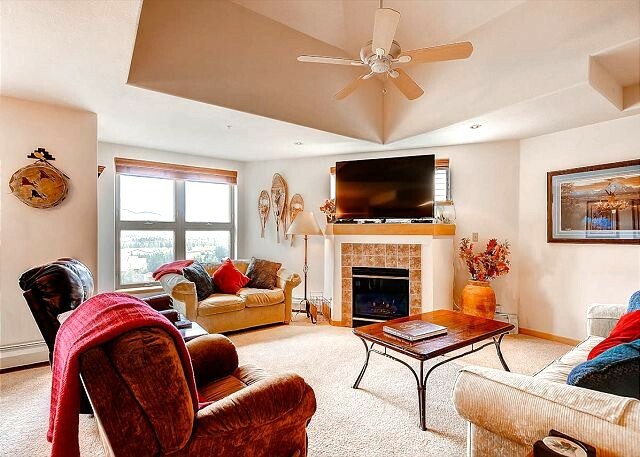 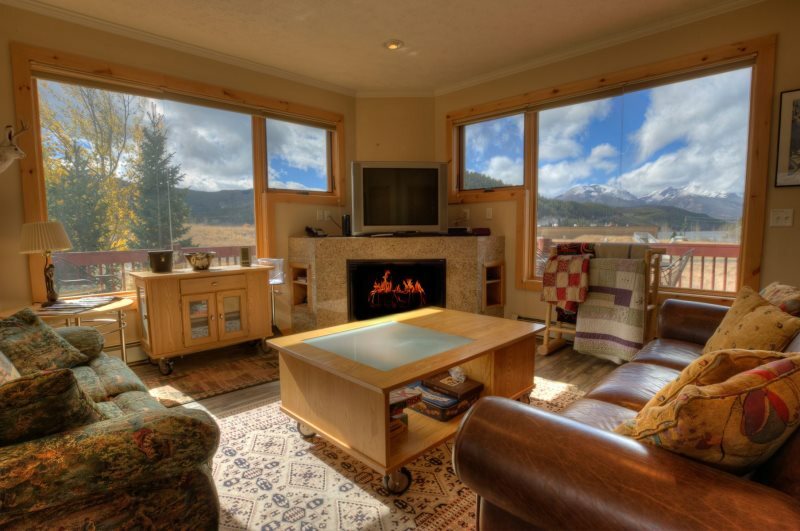 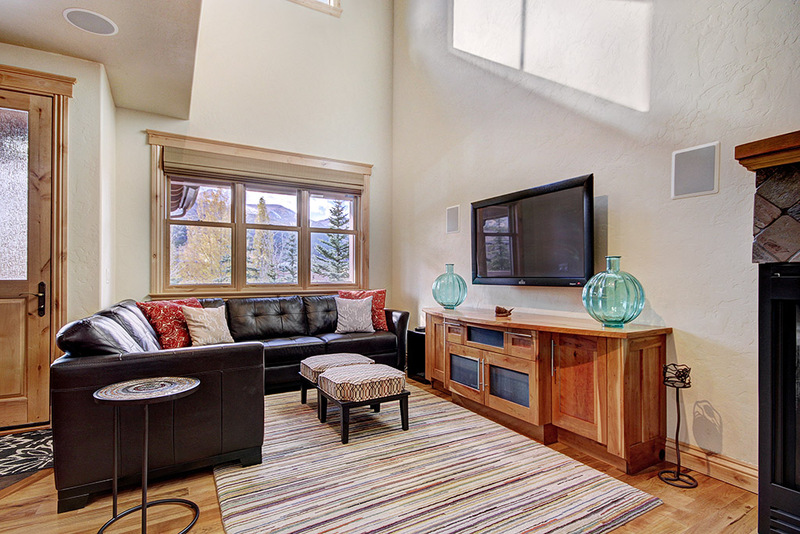 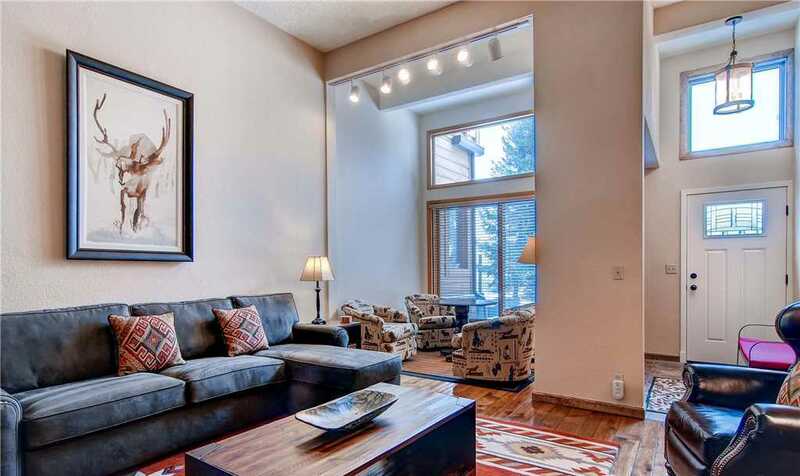 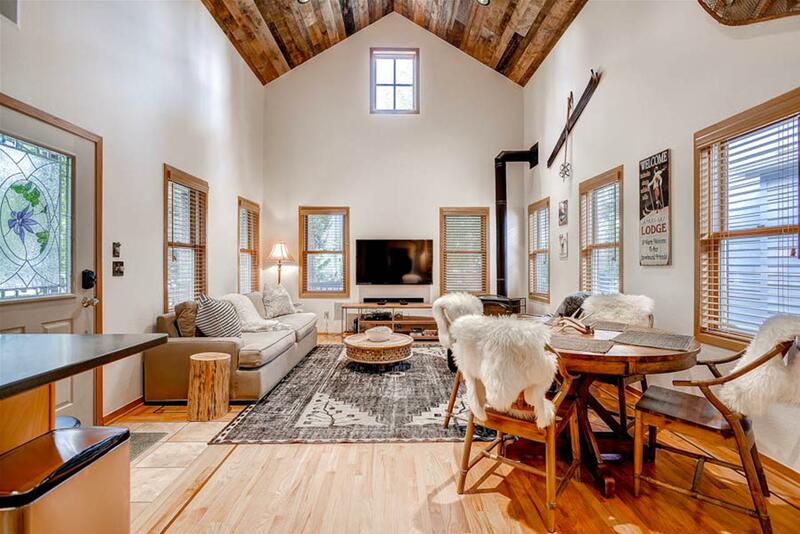 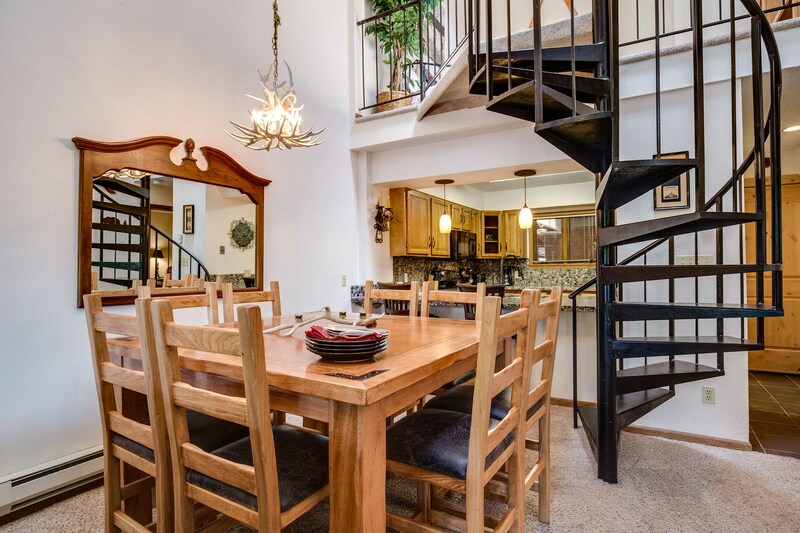 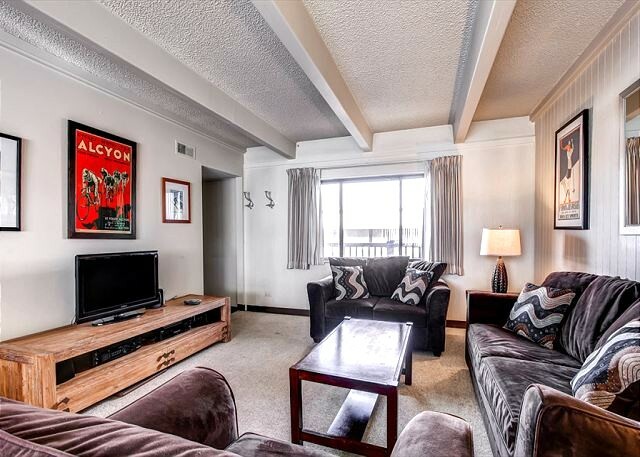 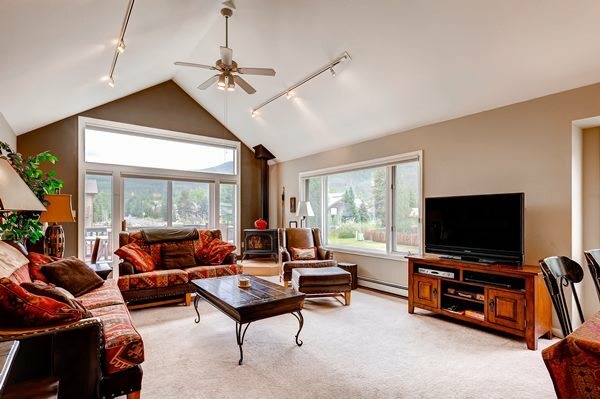 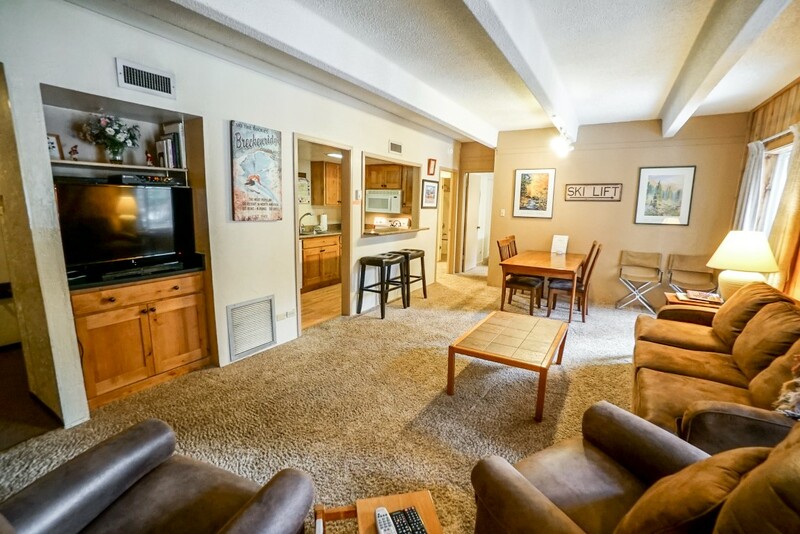 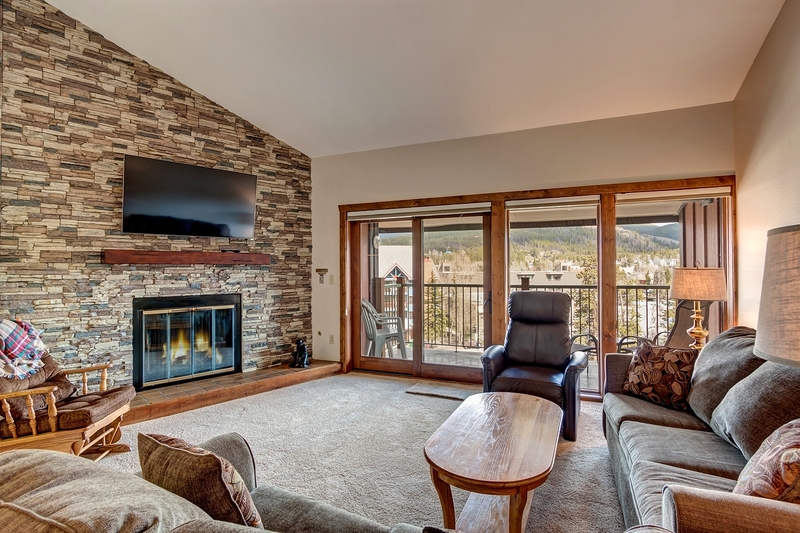 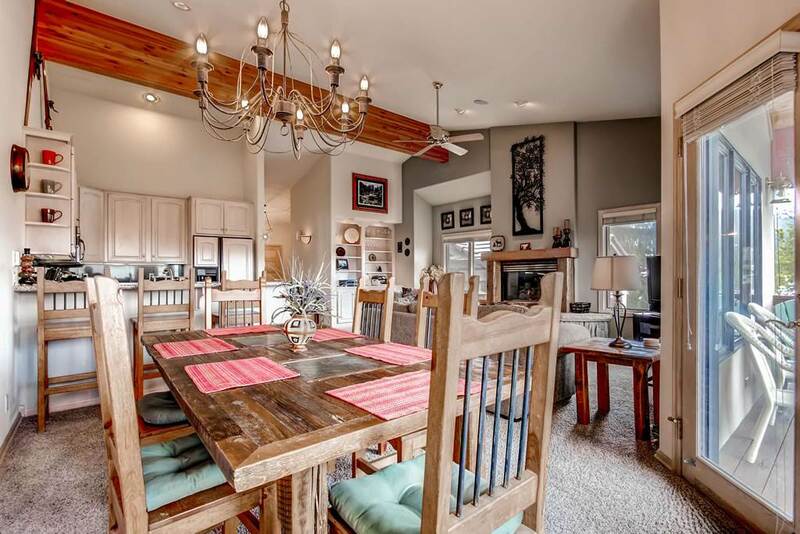 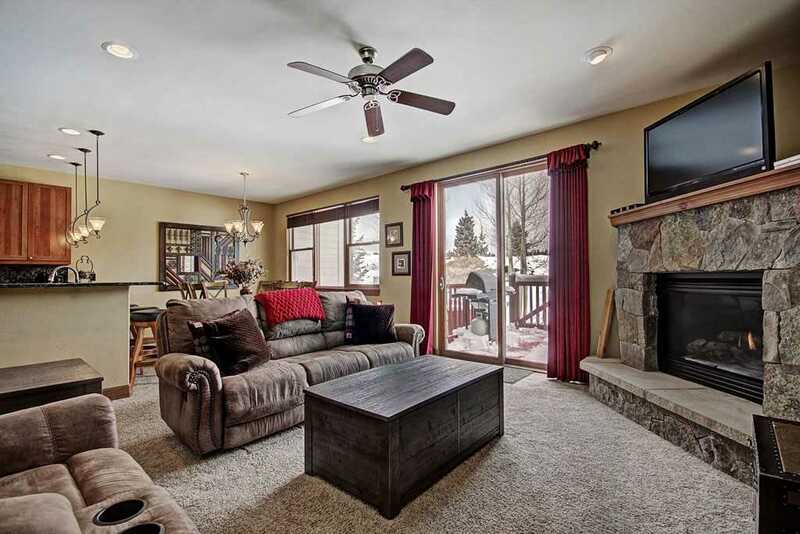 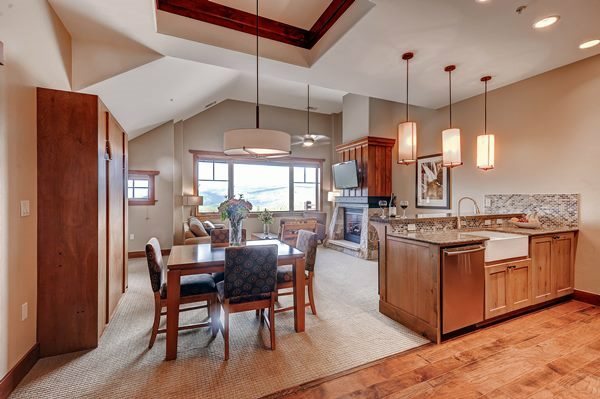 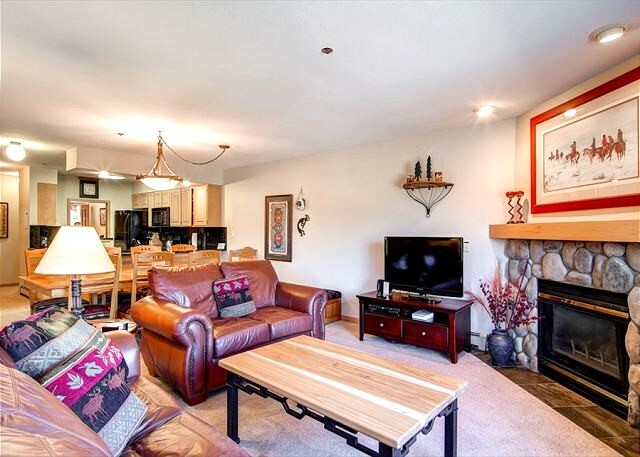 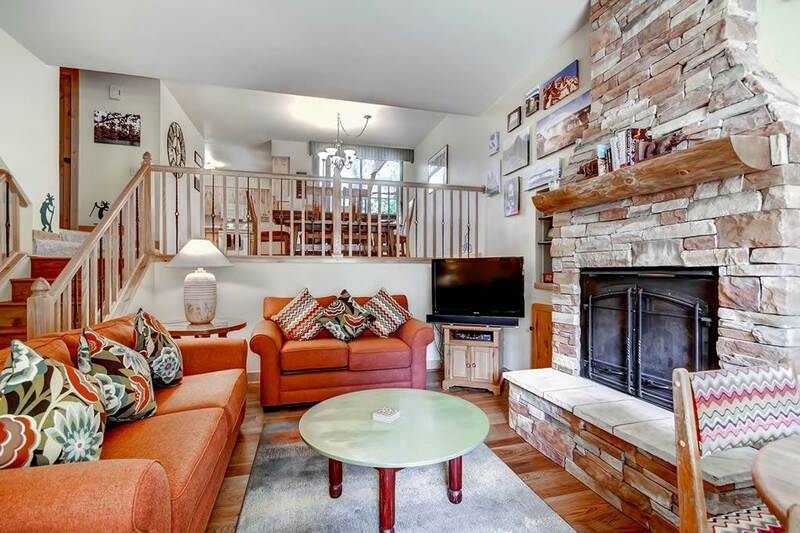 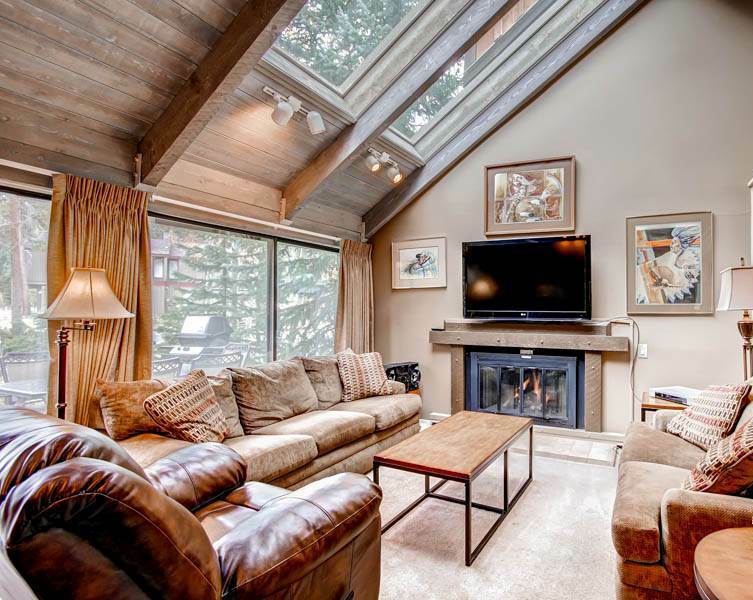 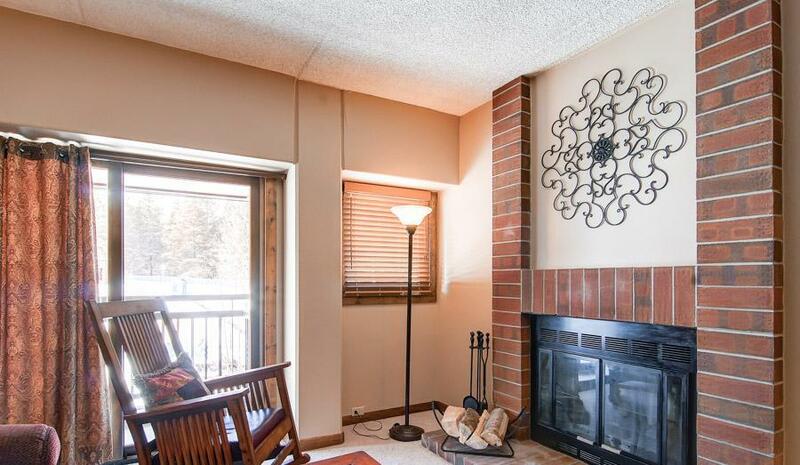 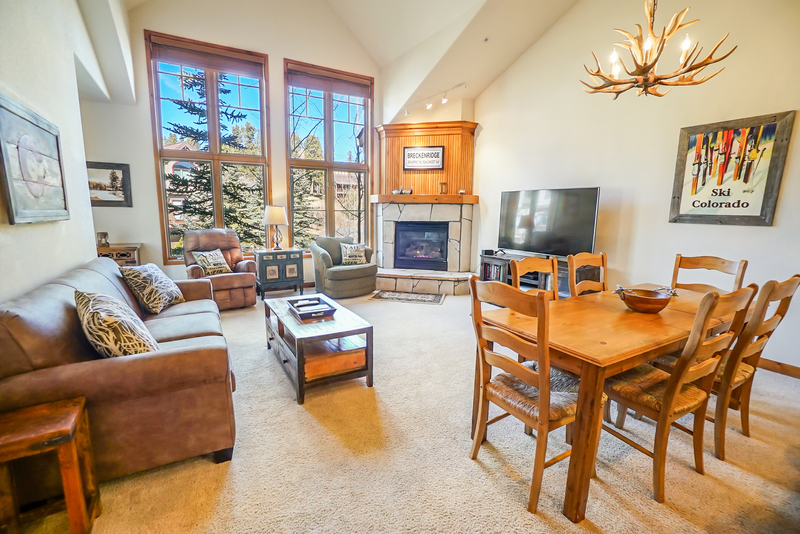 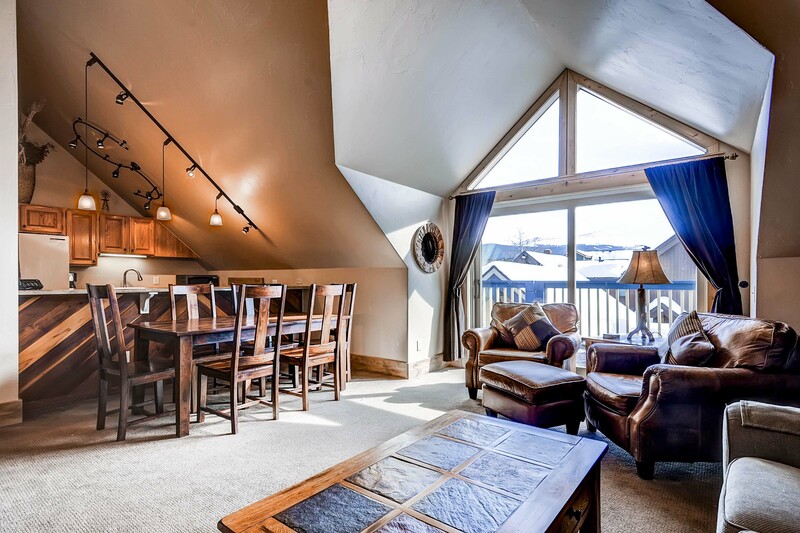 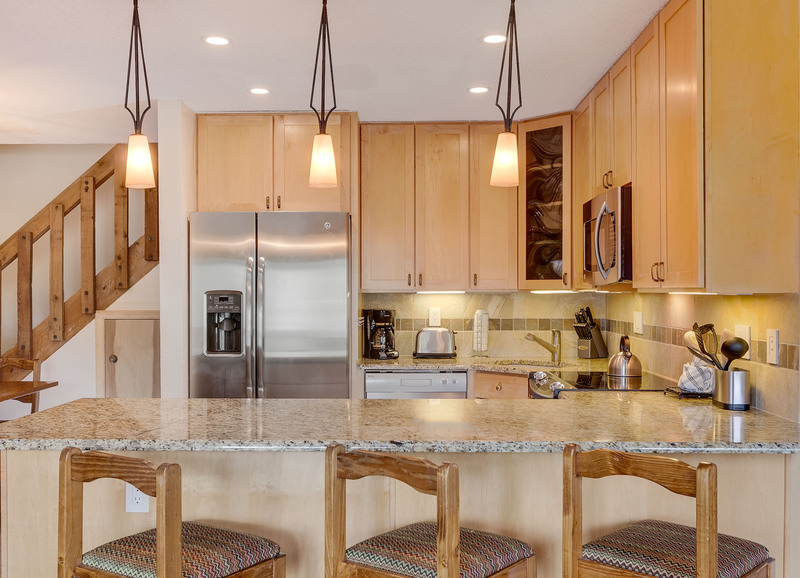 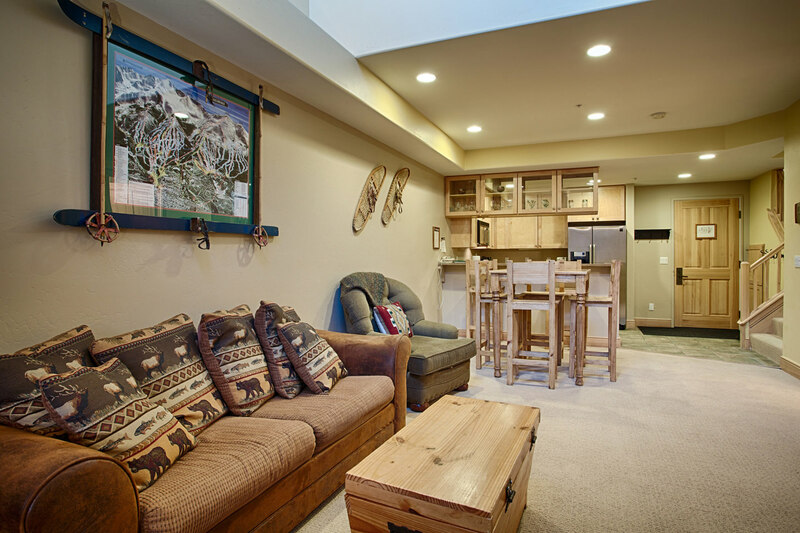 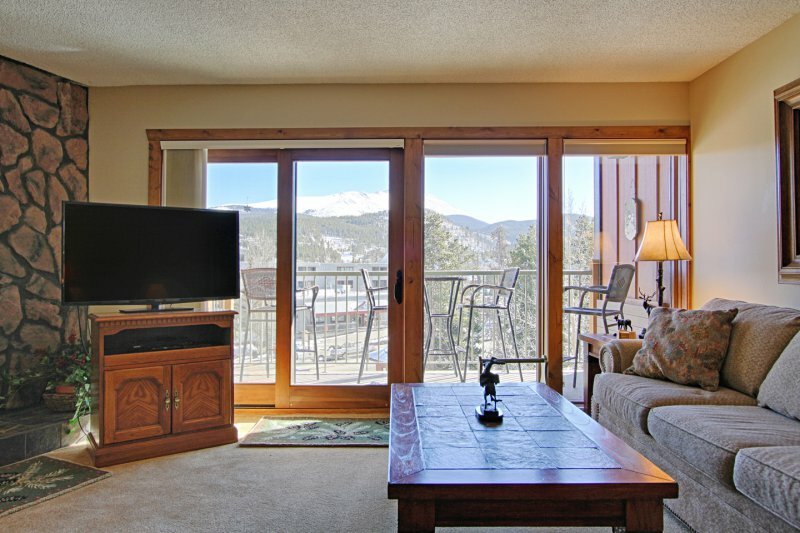 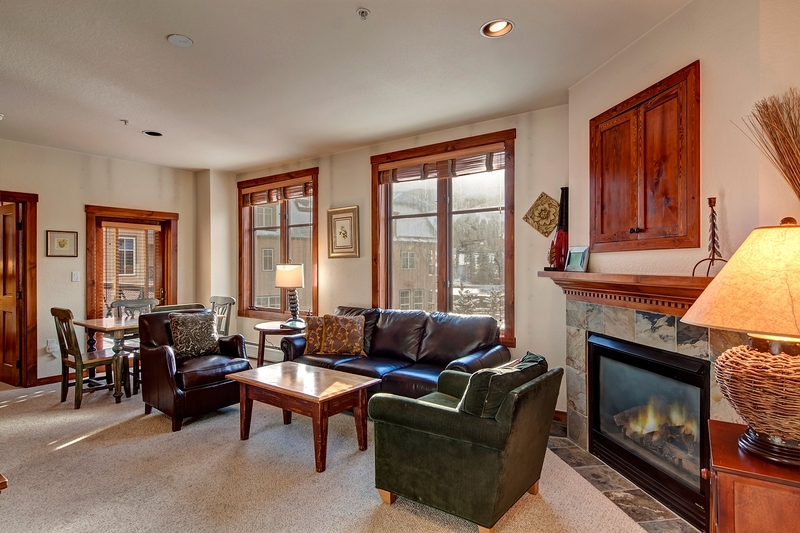 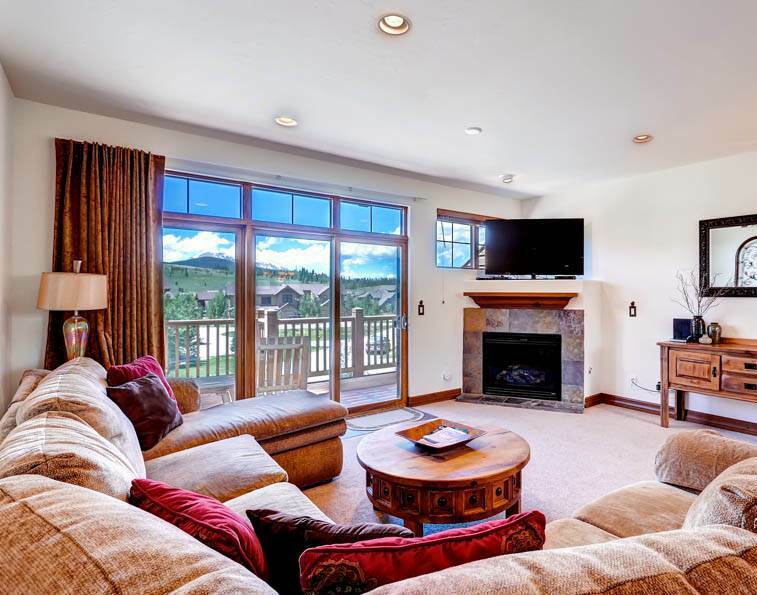 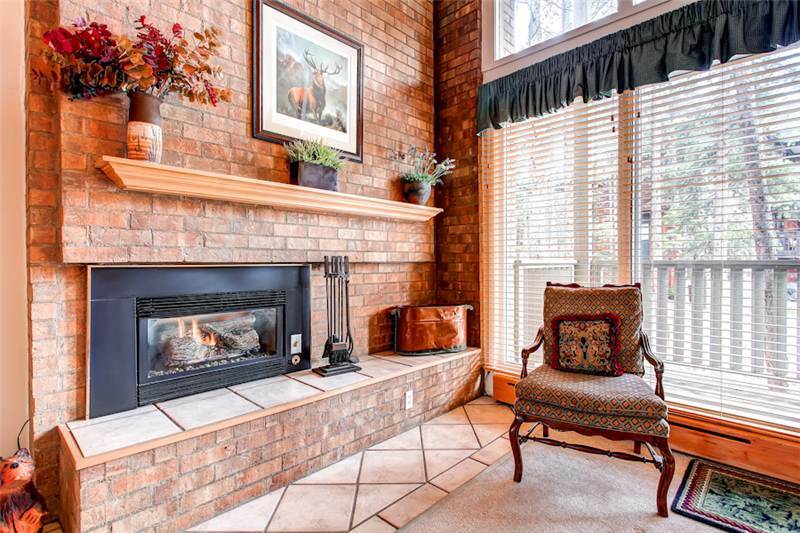 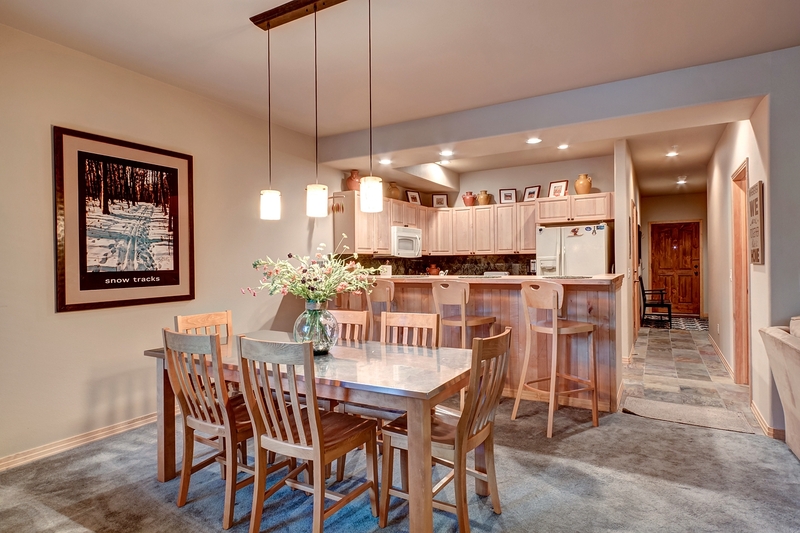 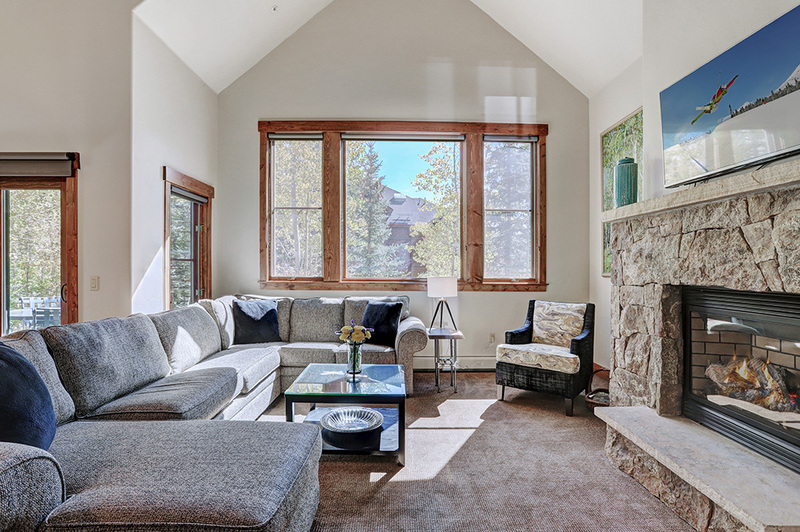 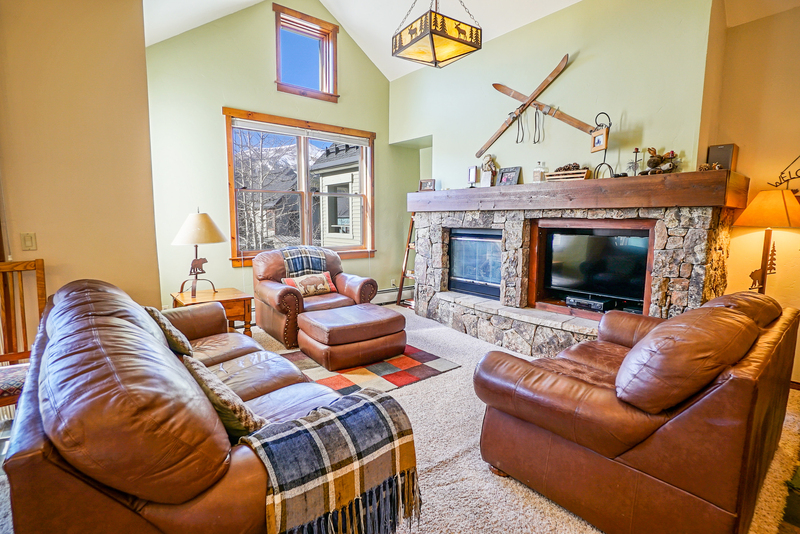 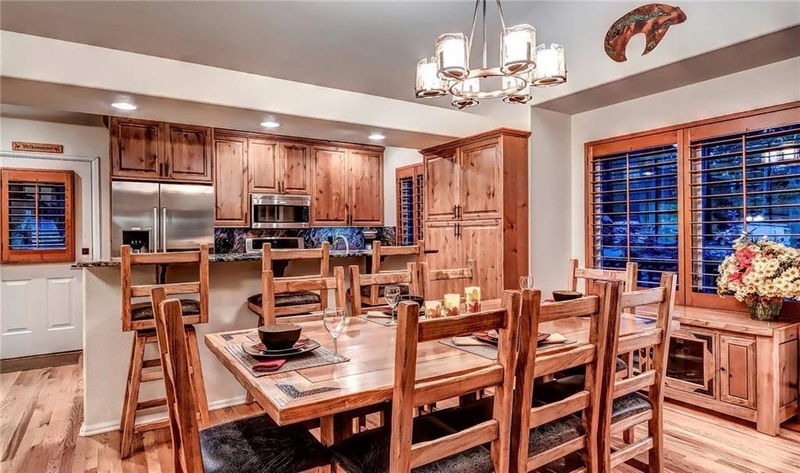 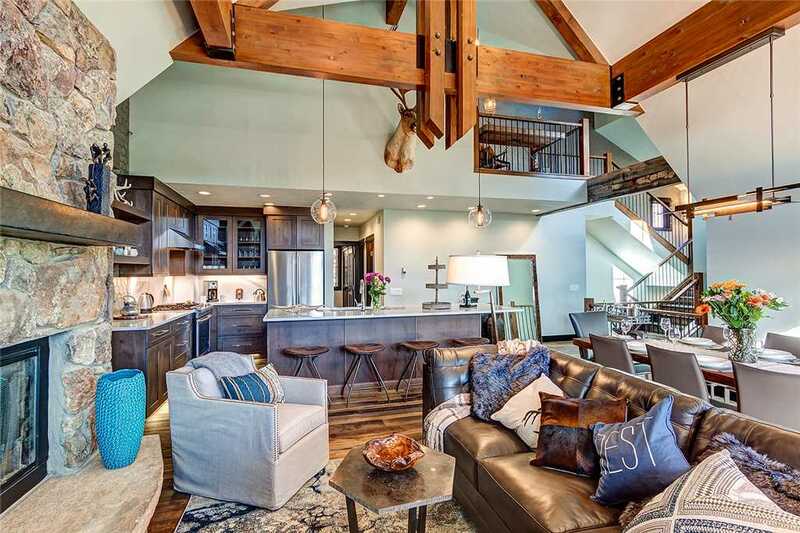 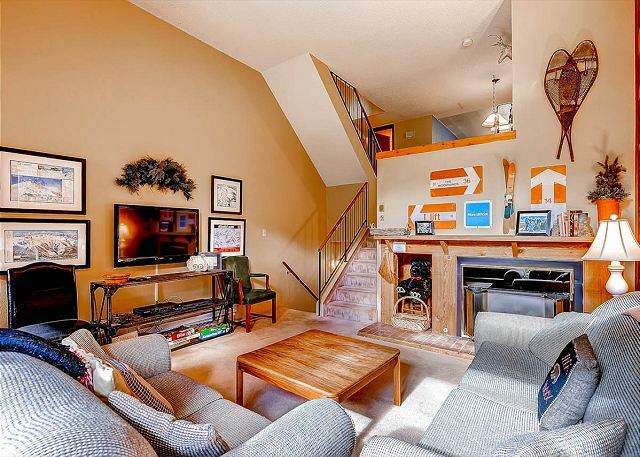 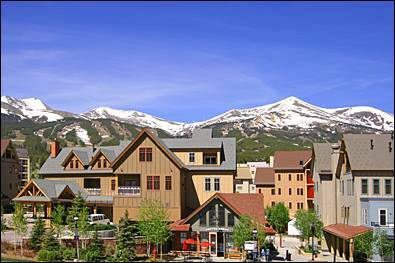 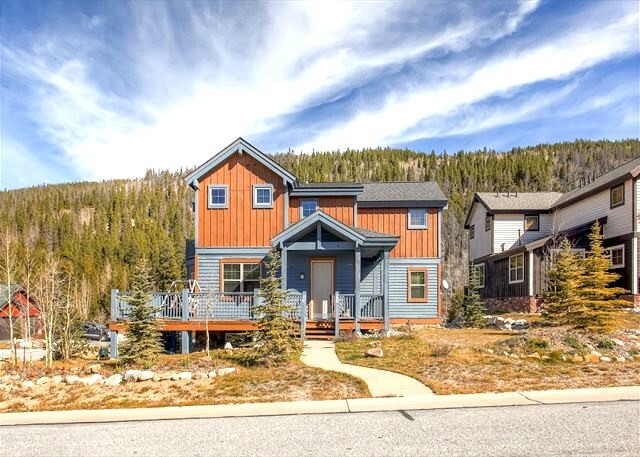 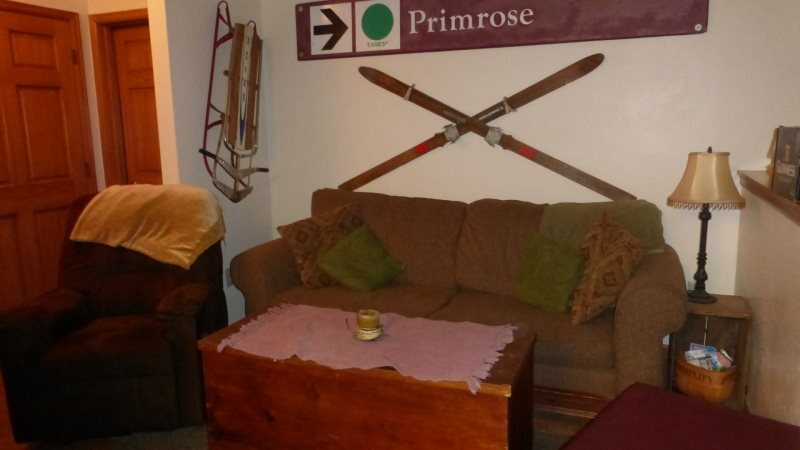 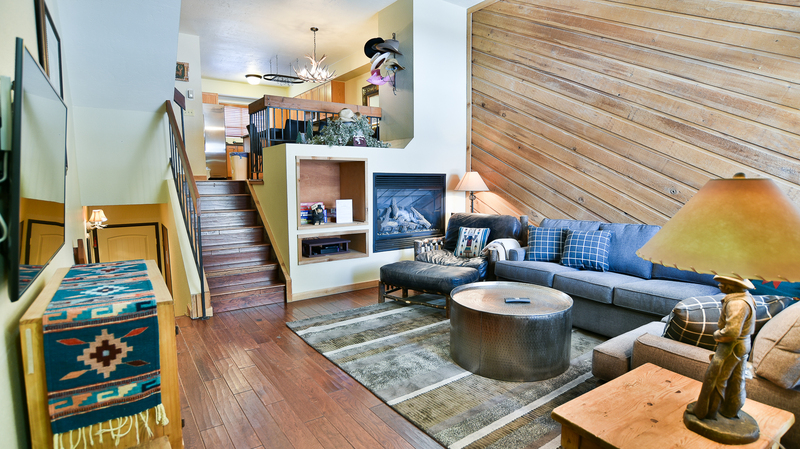 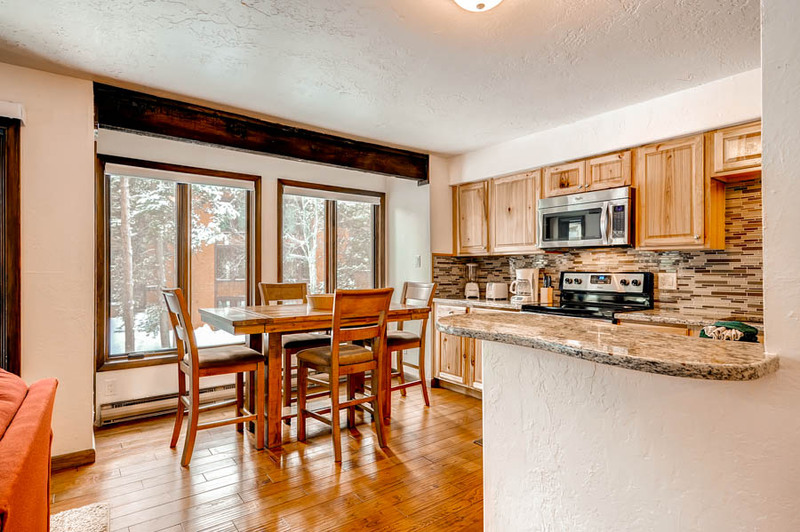 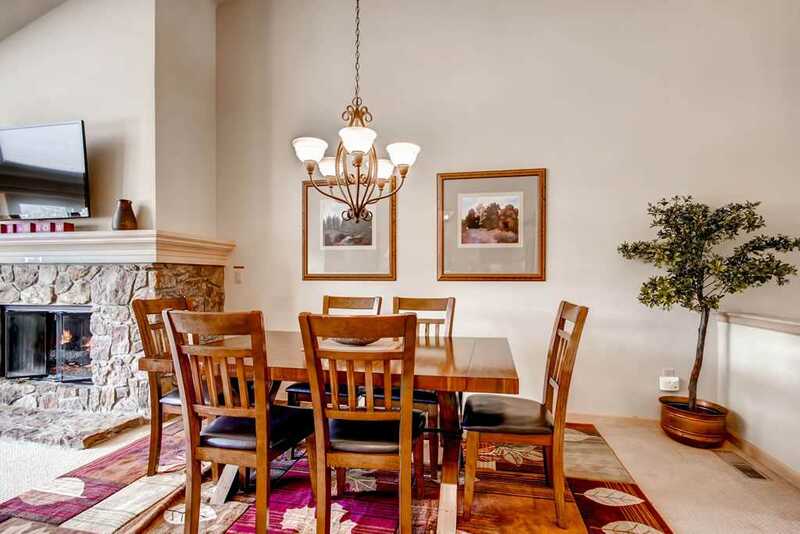 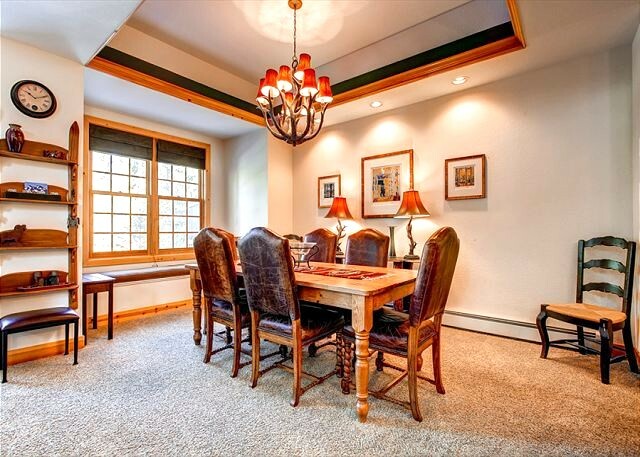 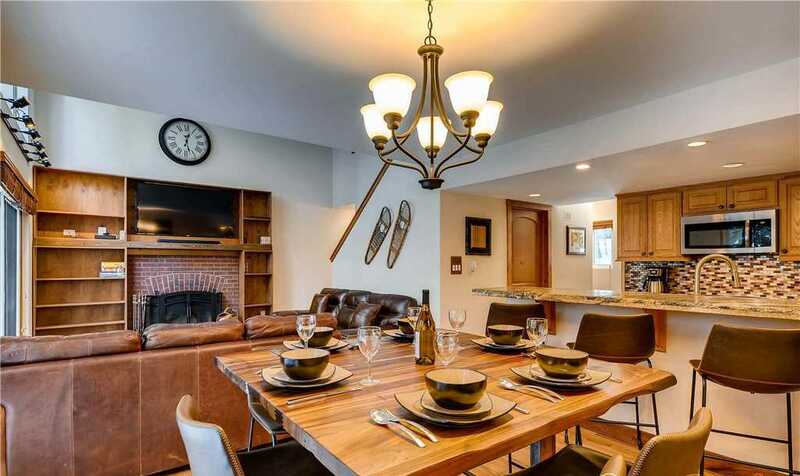 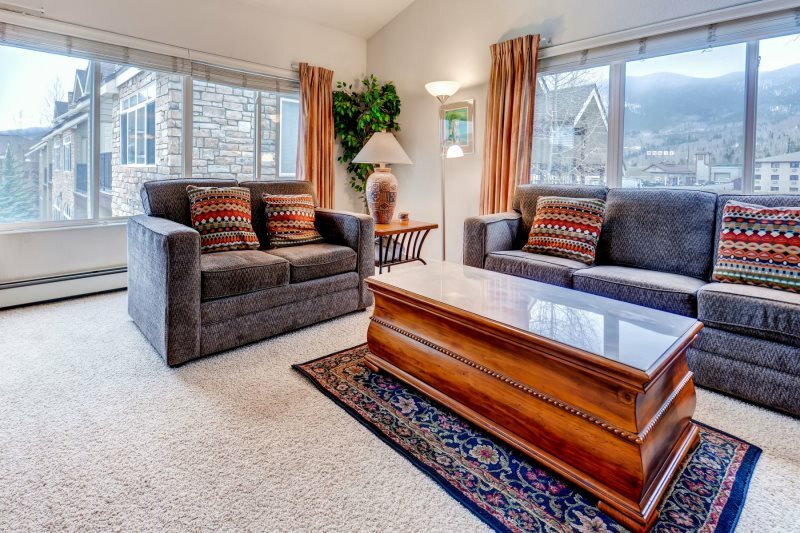 You’ll love Frisco’s laid-back charm and perfect location in the heart of Summit County — and you won’t find a nicer, more stylish condo in Frisco. 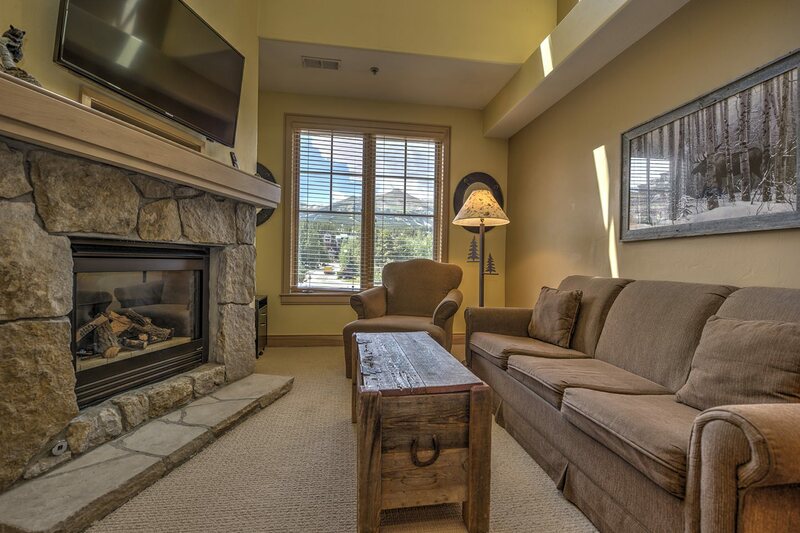 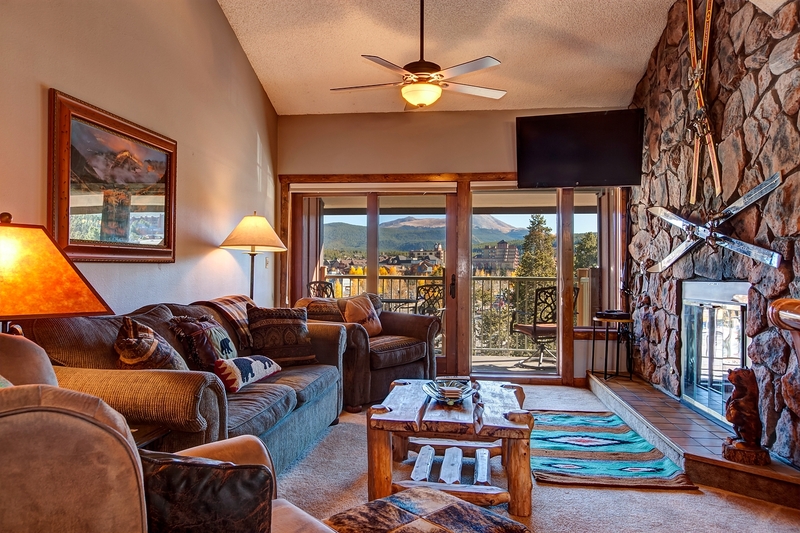 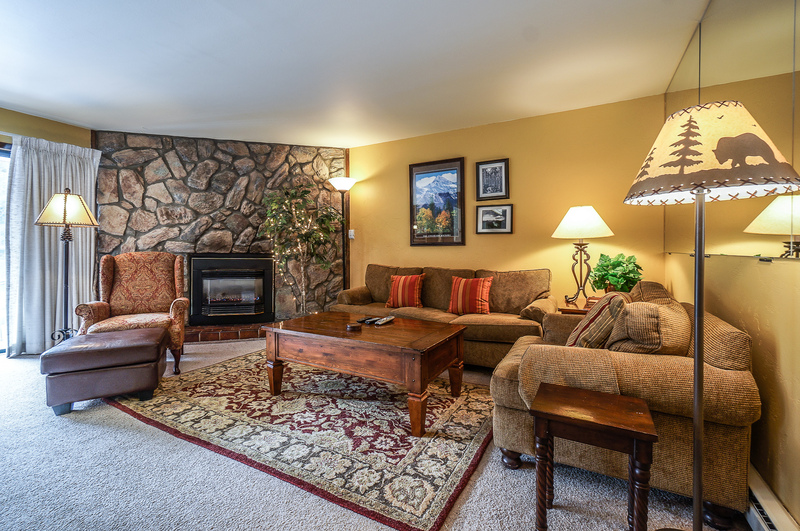 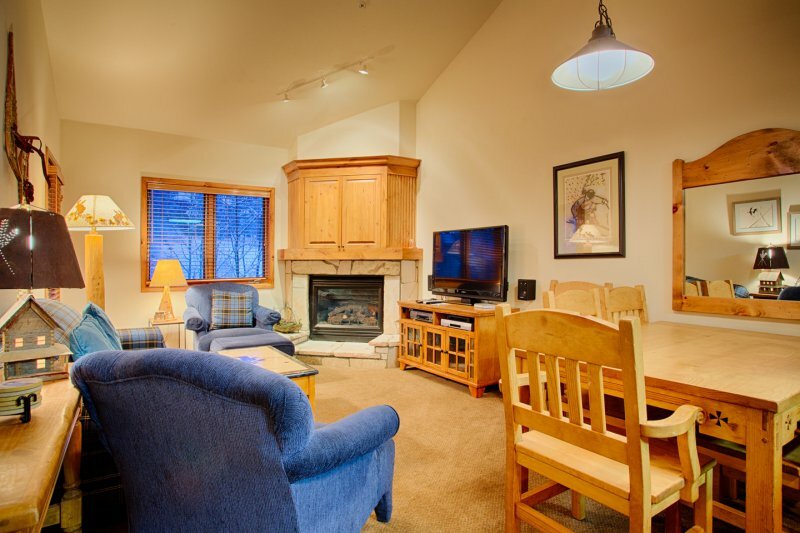 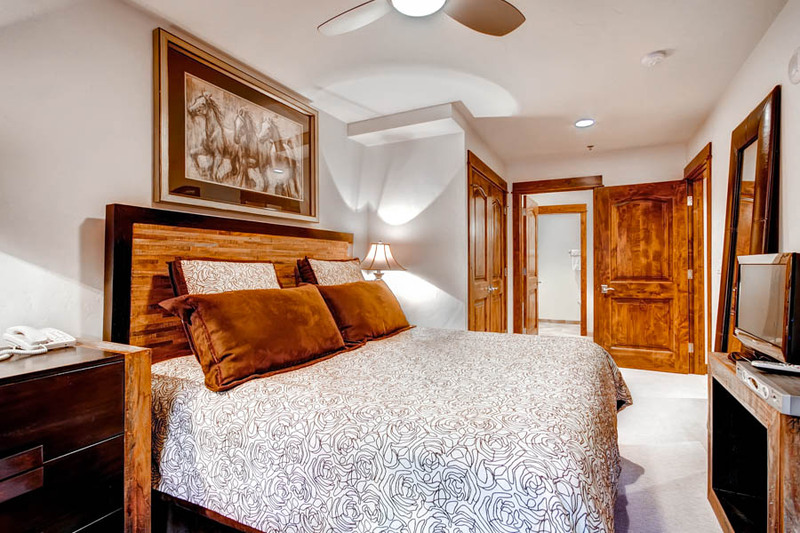 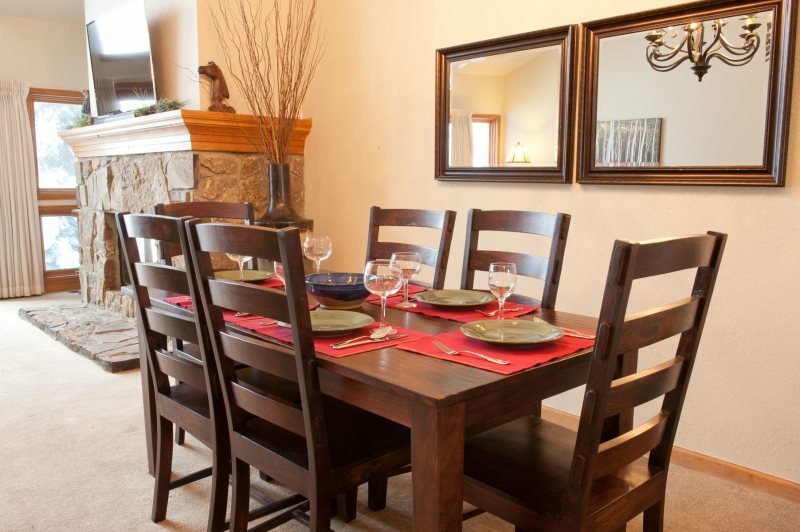 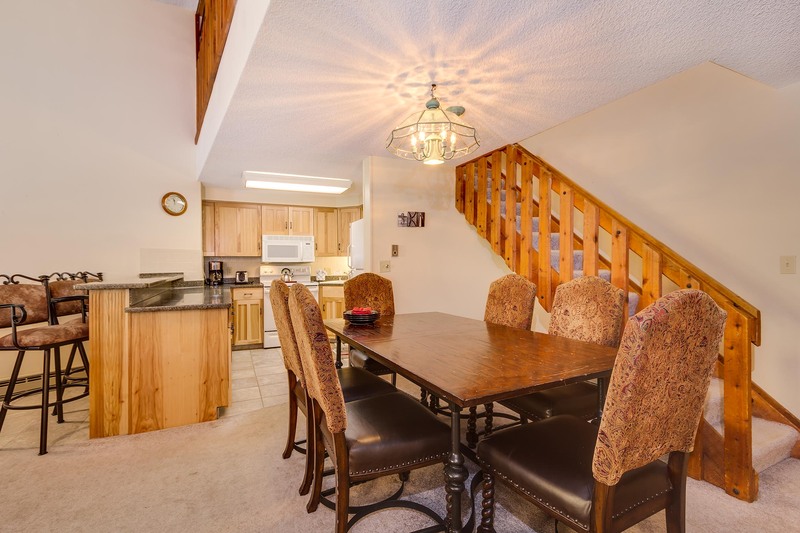 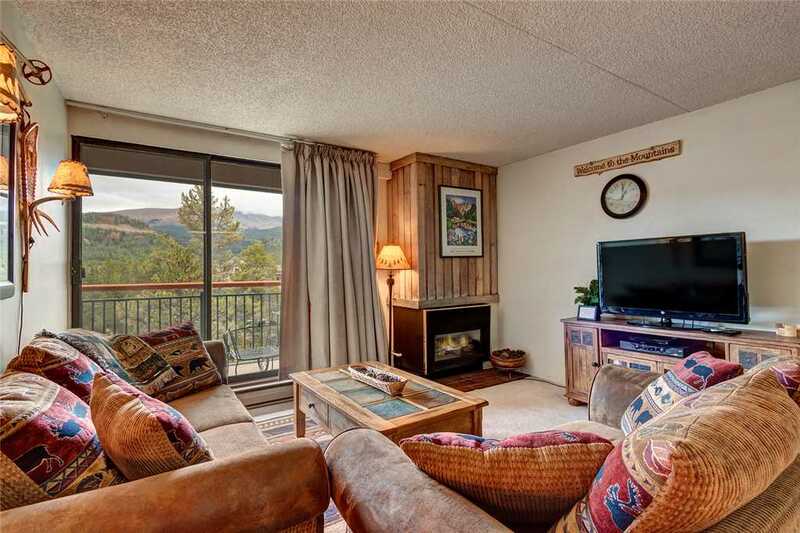 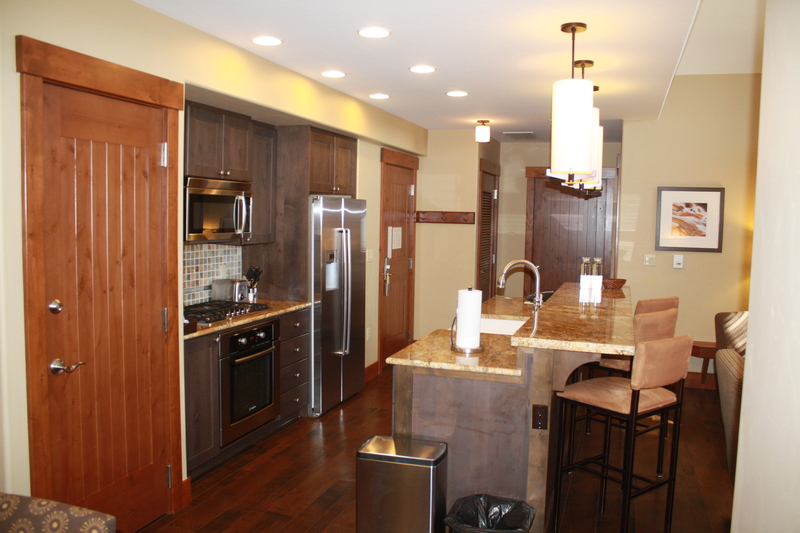 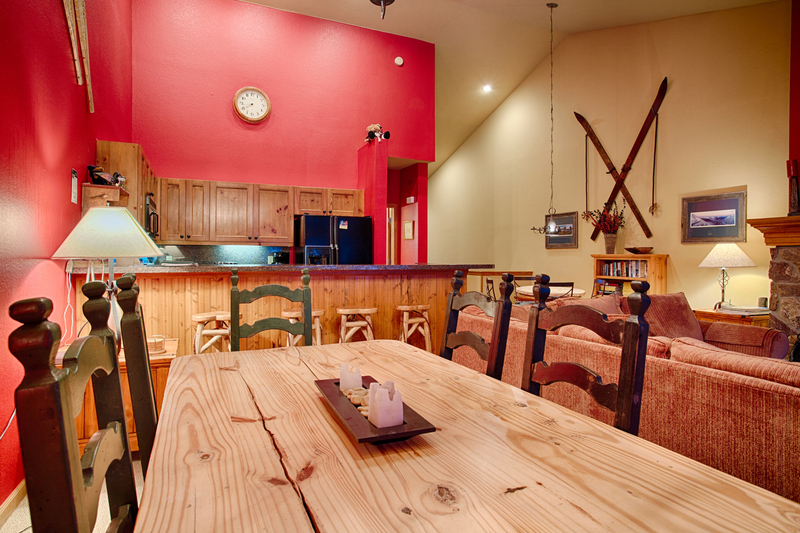 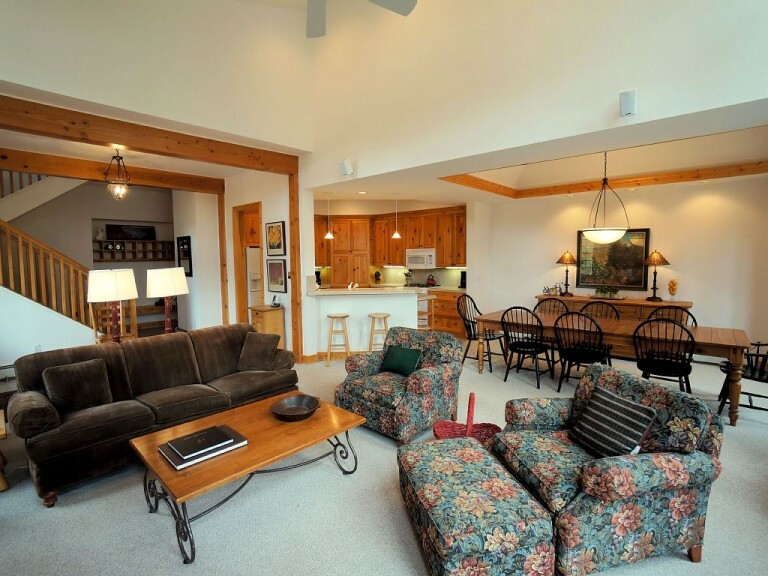 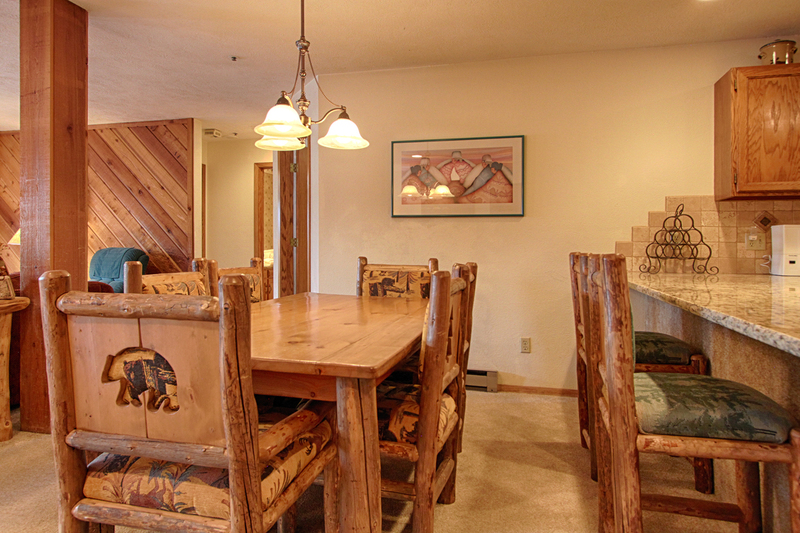 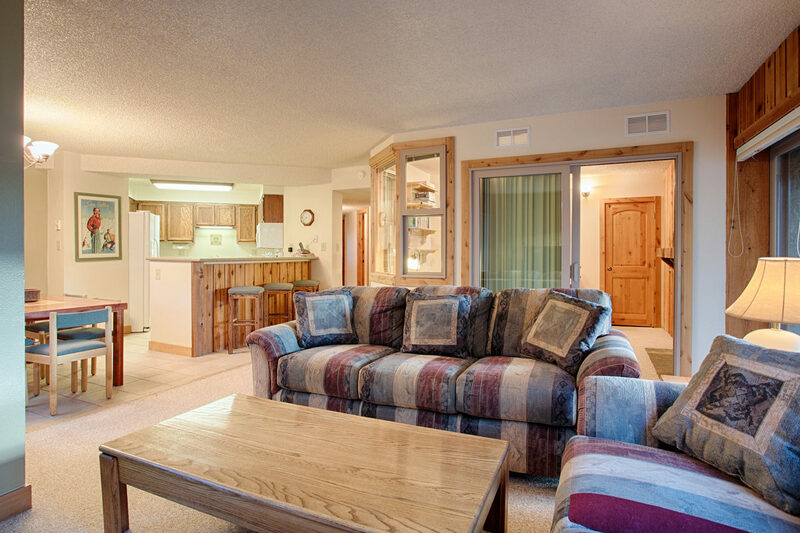 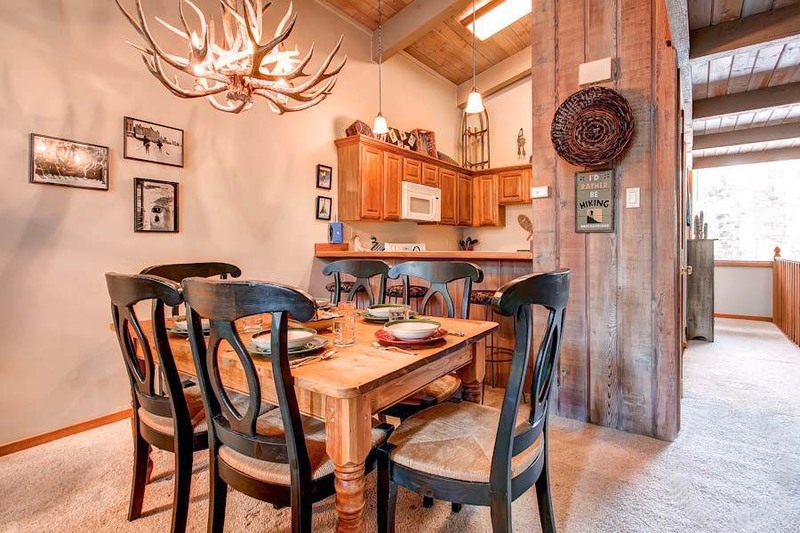 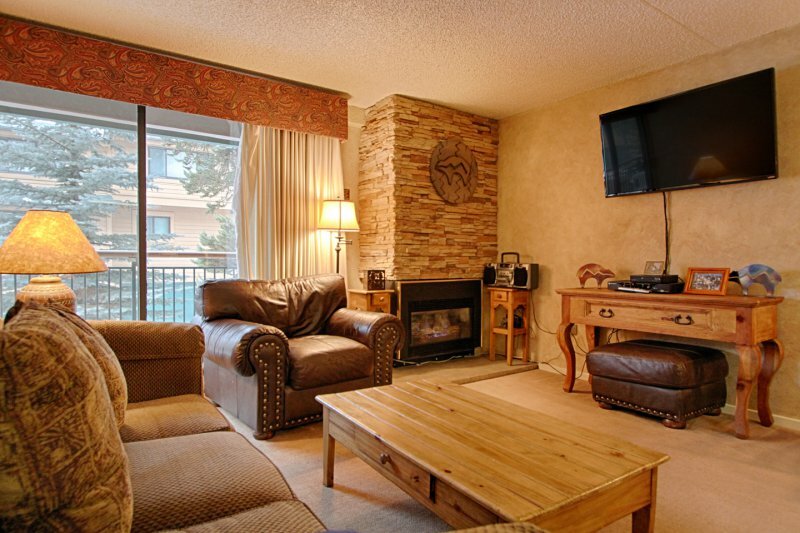 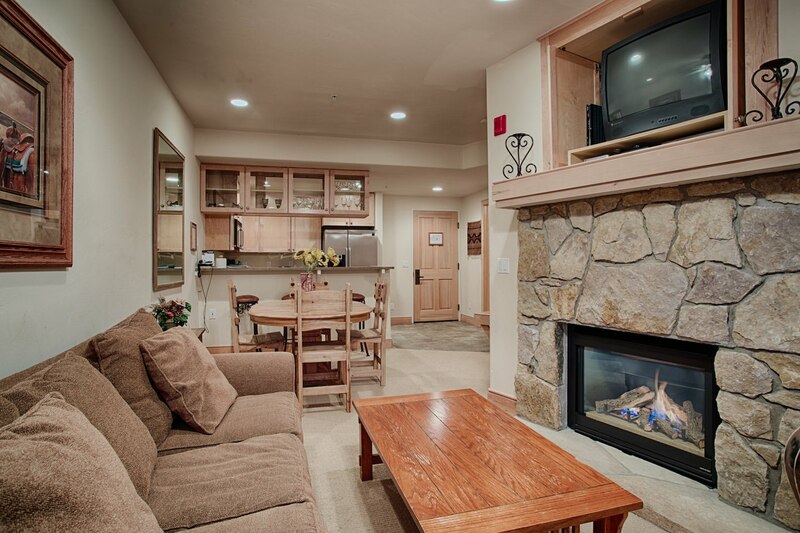 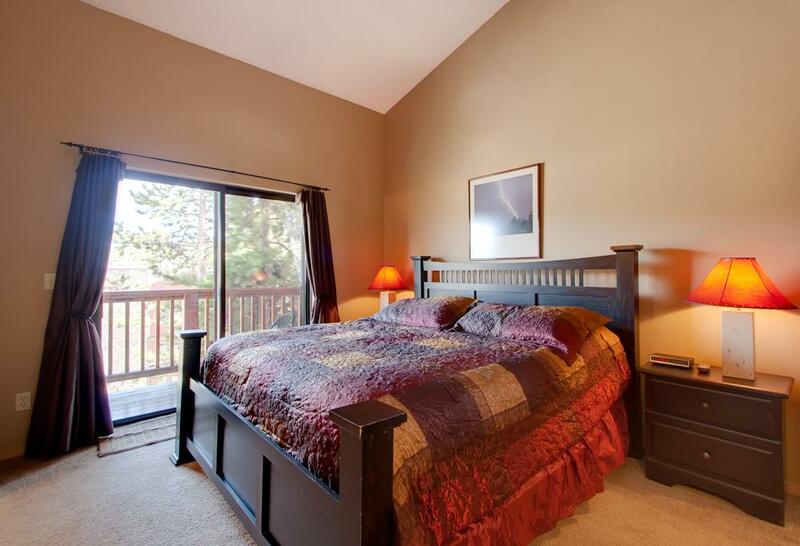 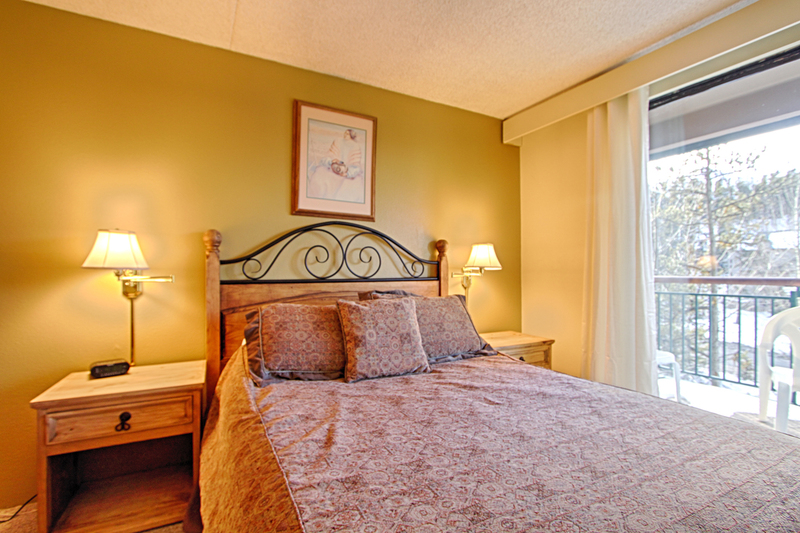 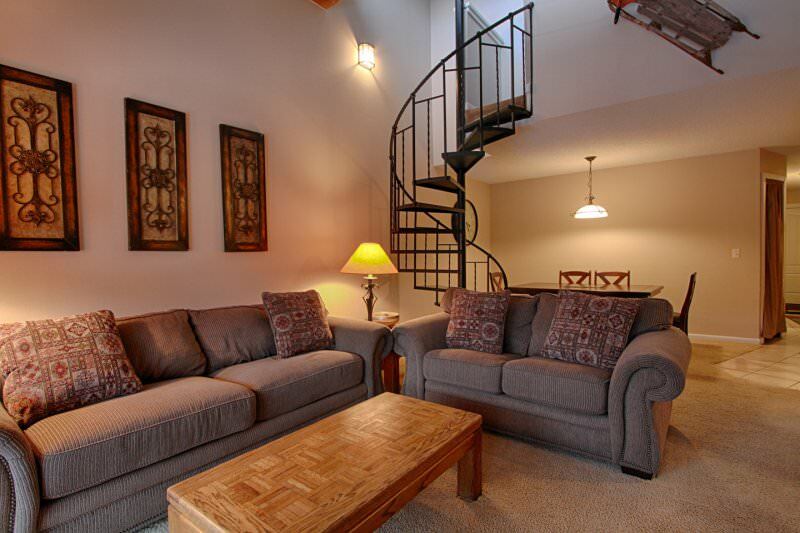 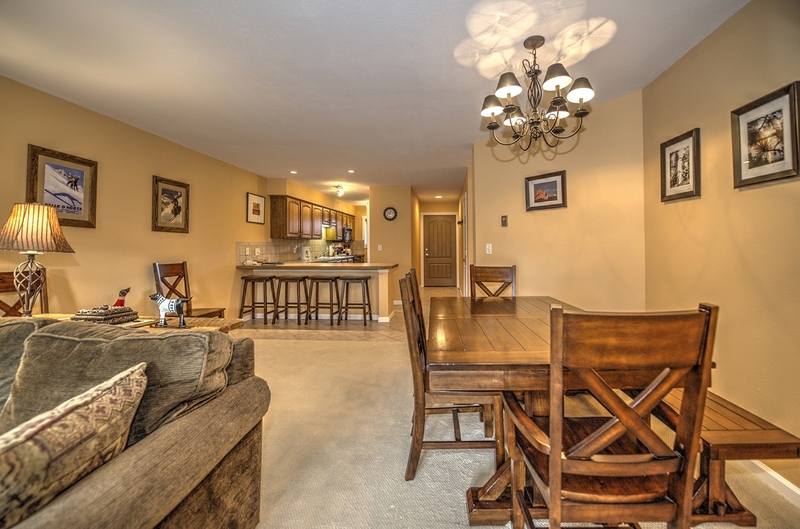 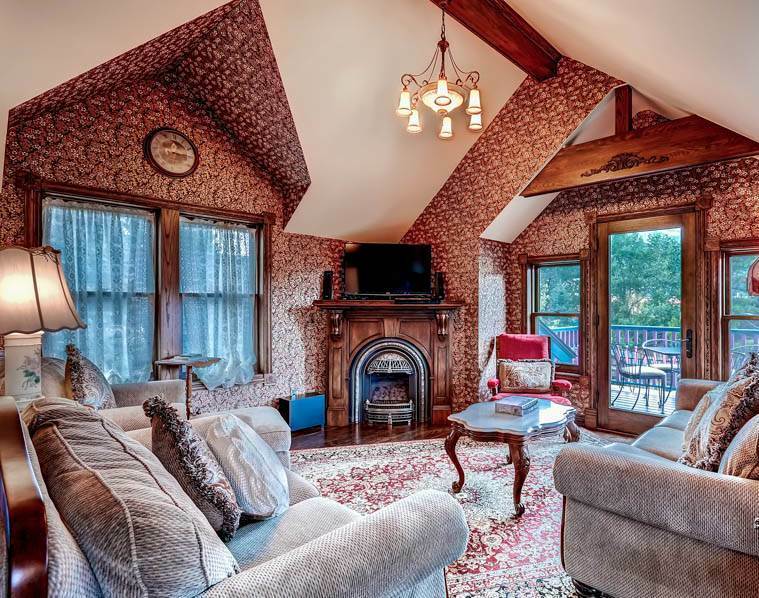 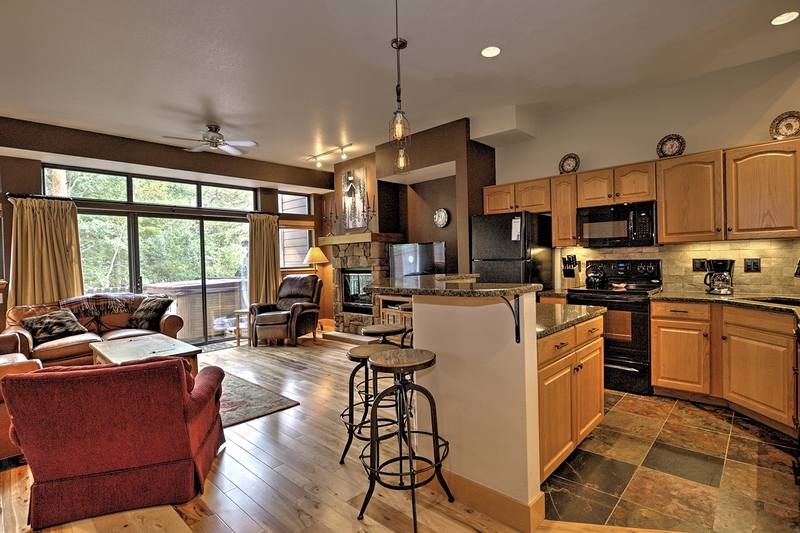 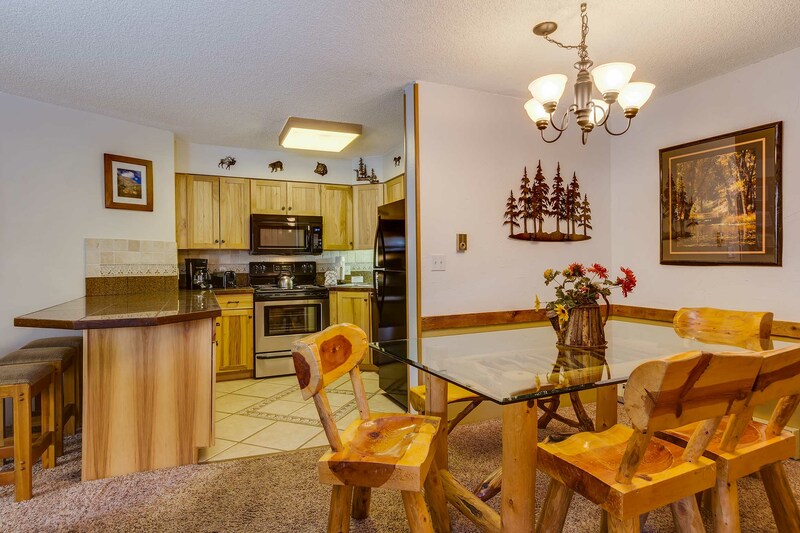 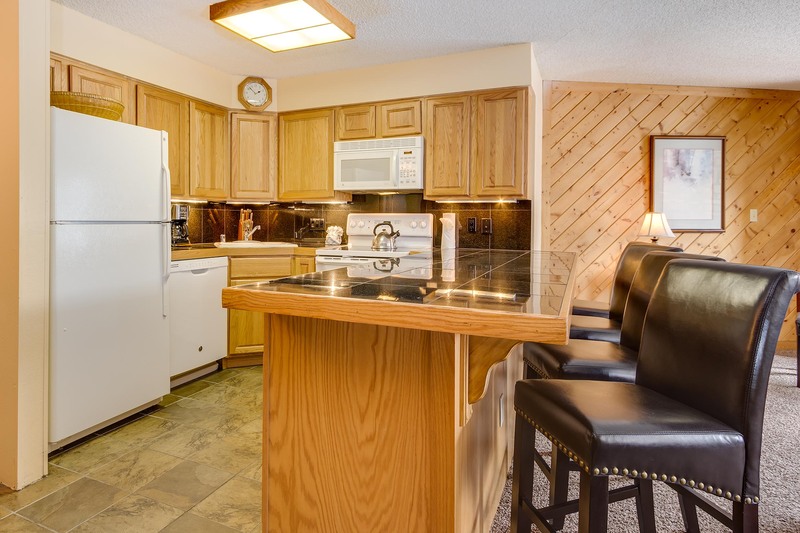 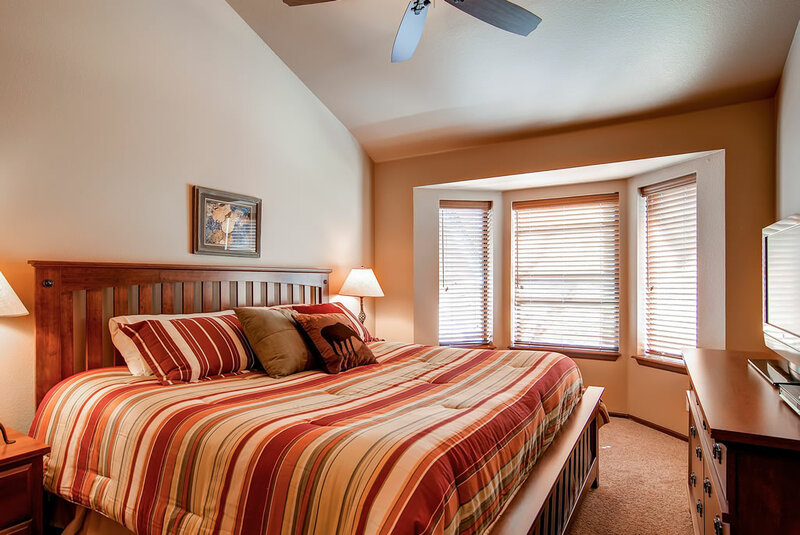 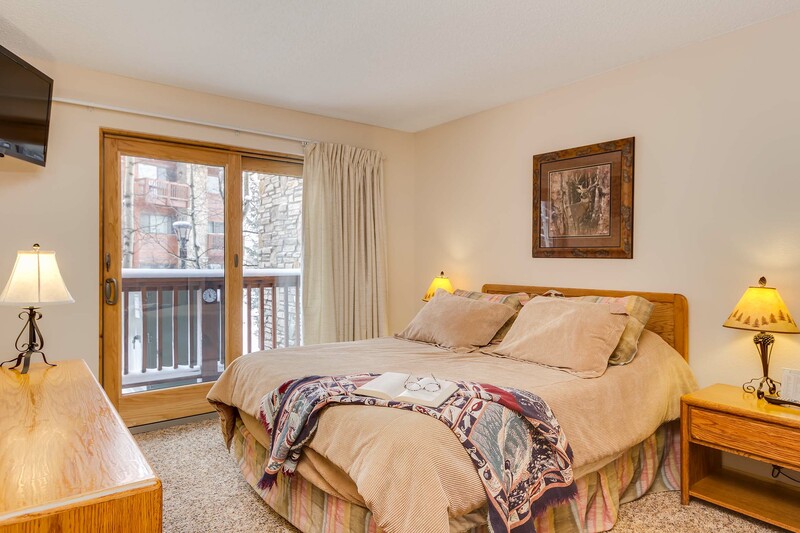 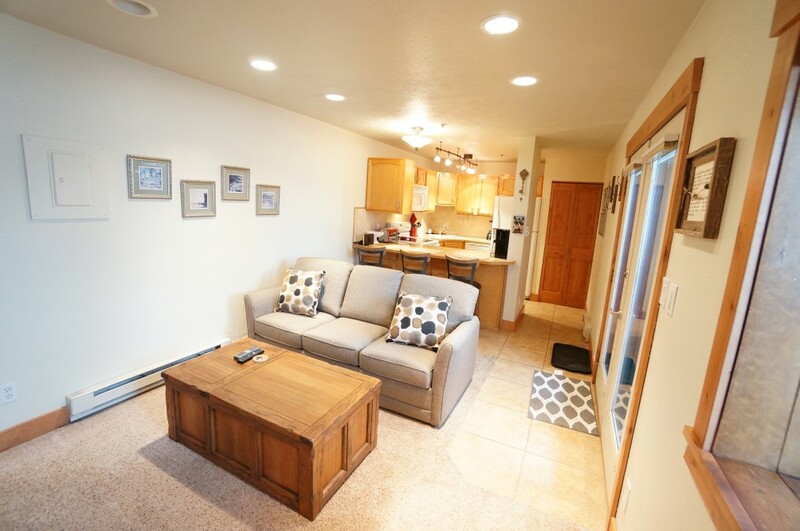 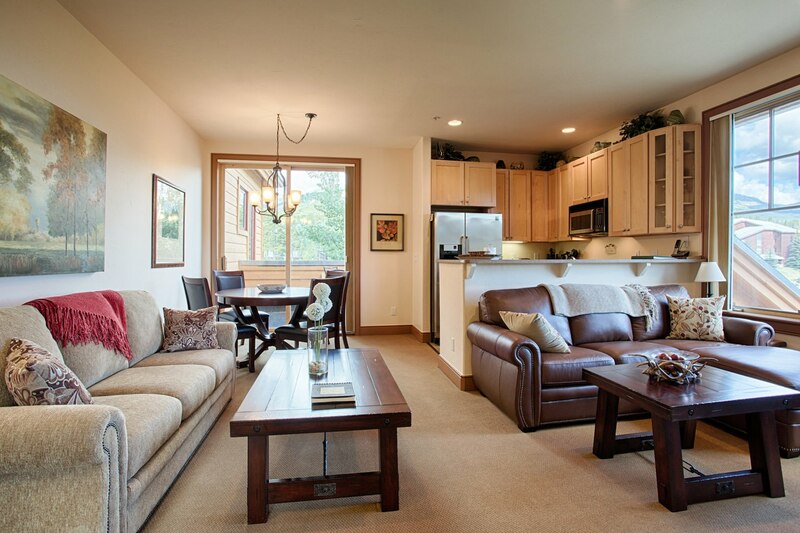 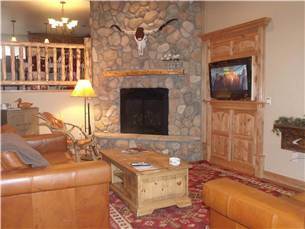 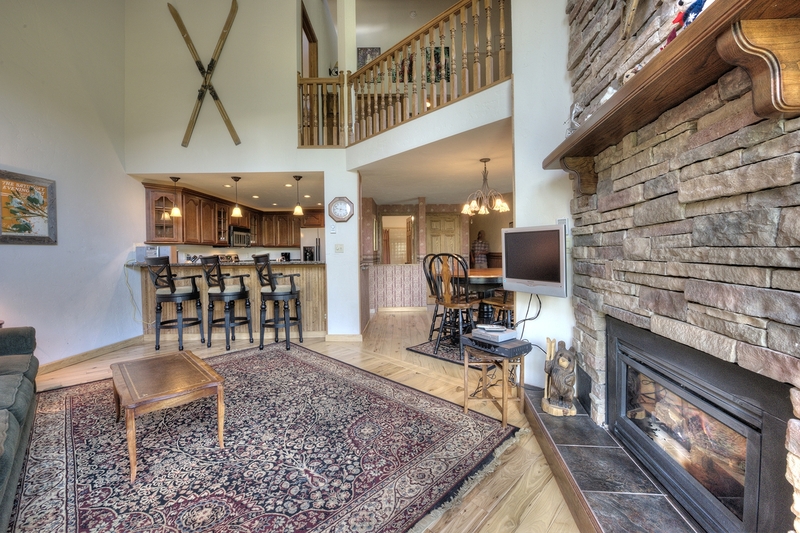 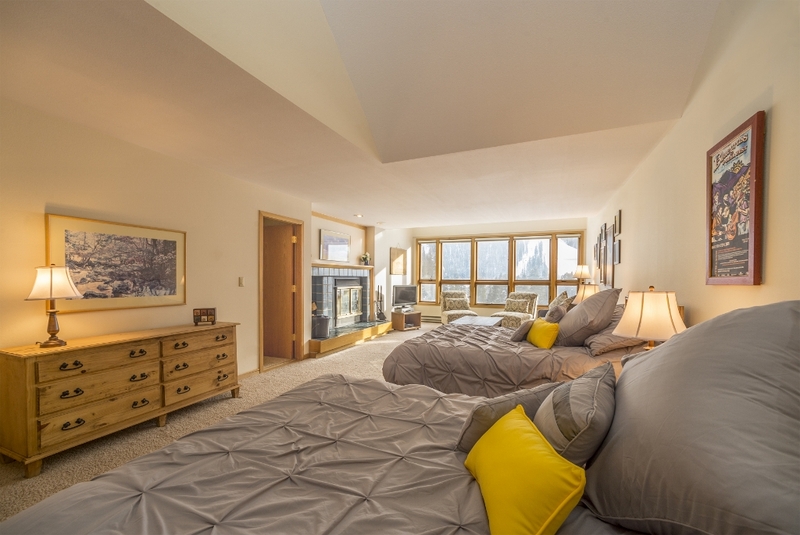 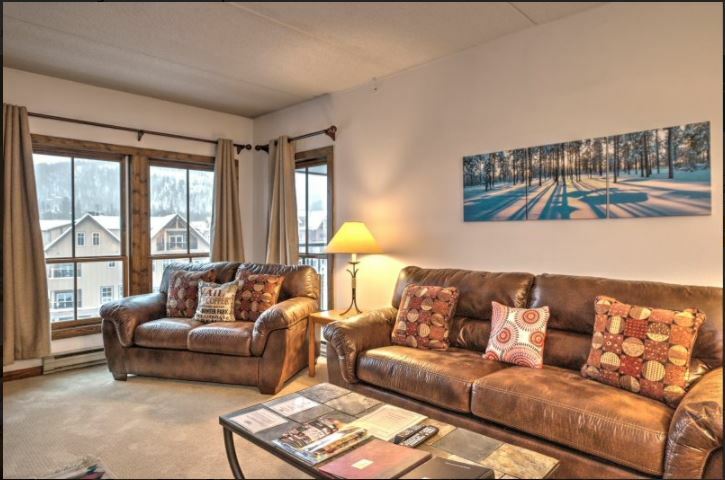 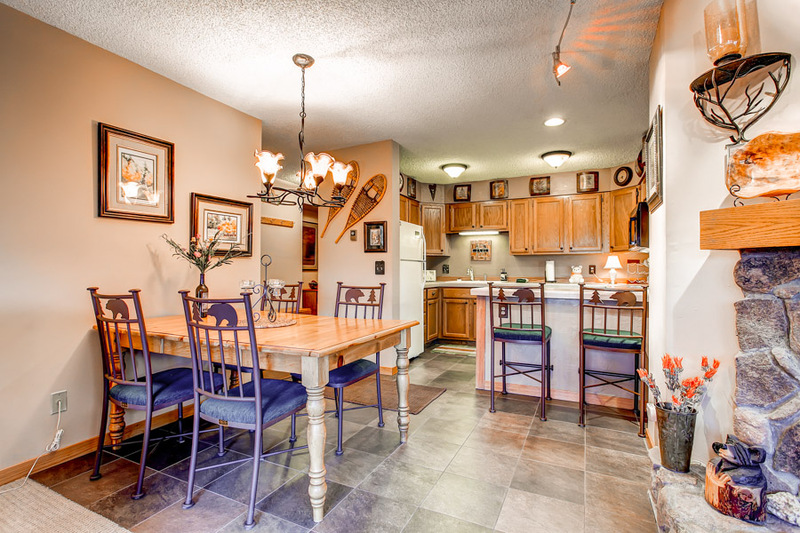 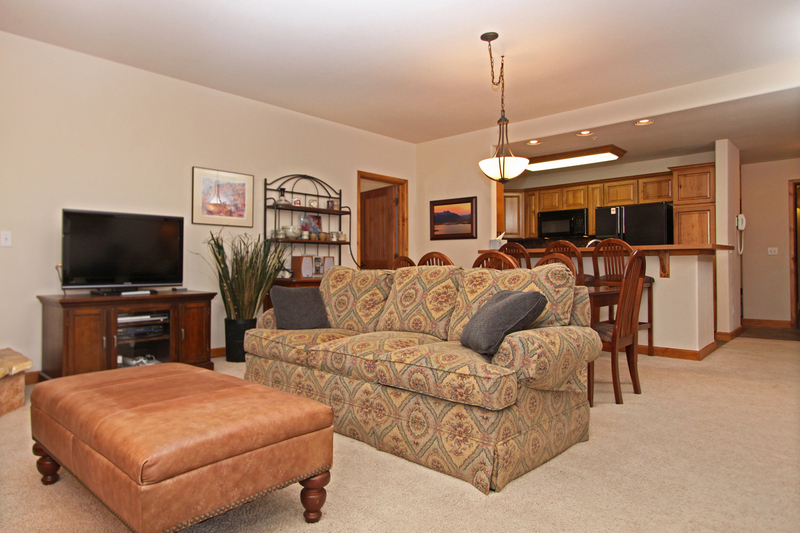 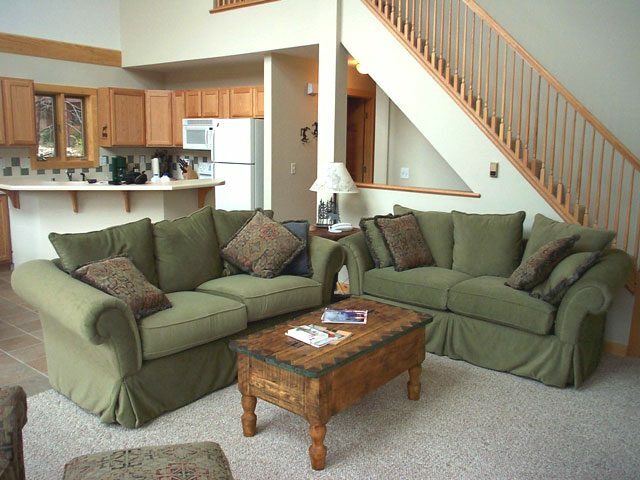 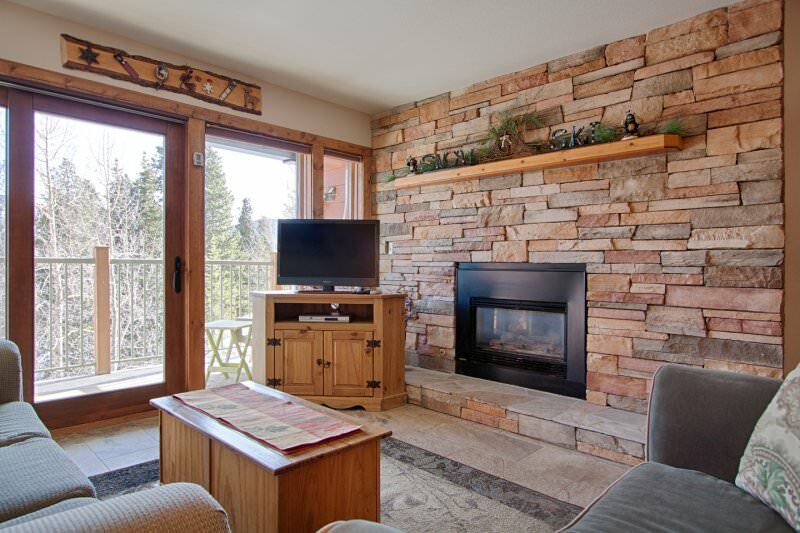 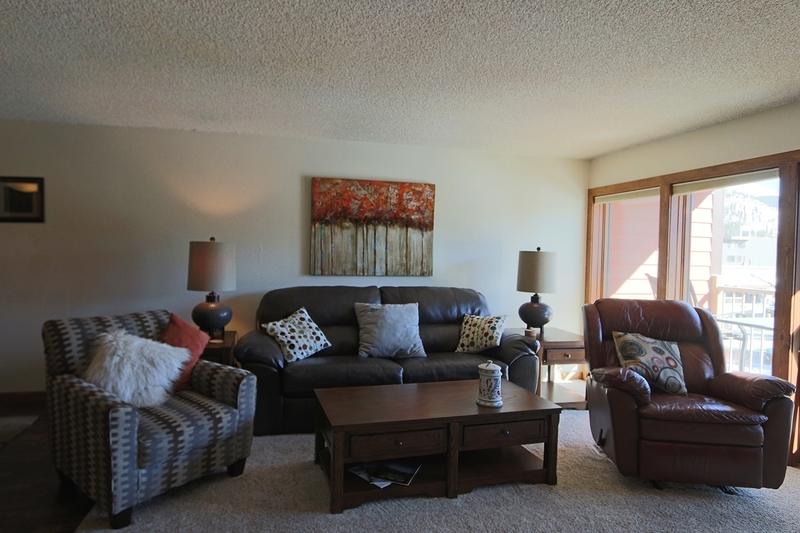 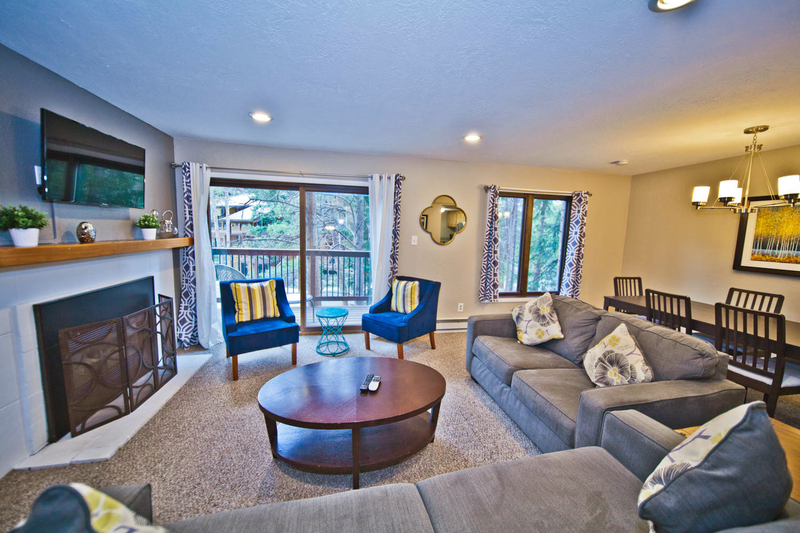 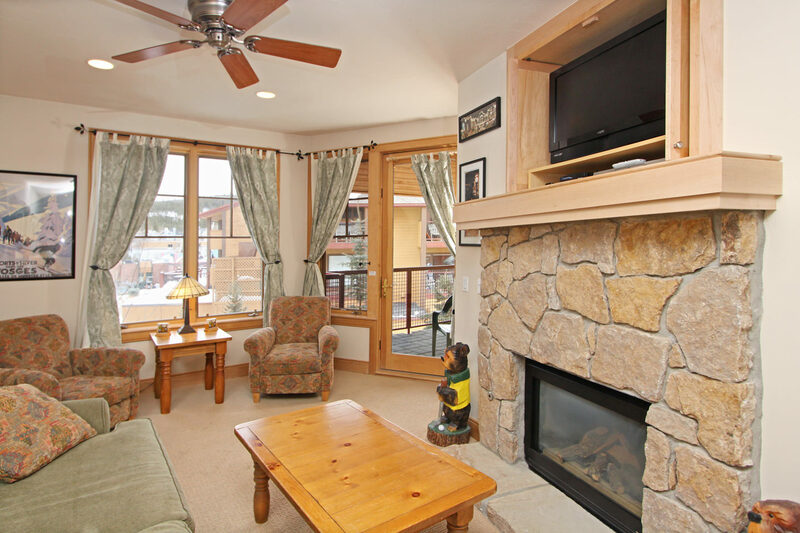 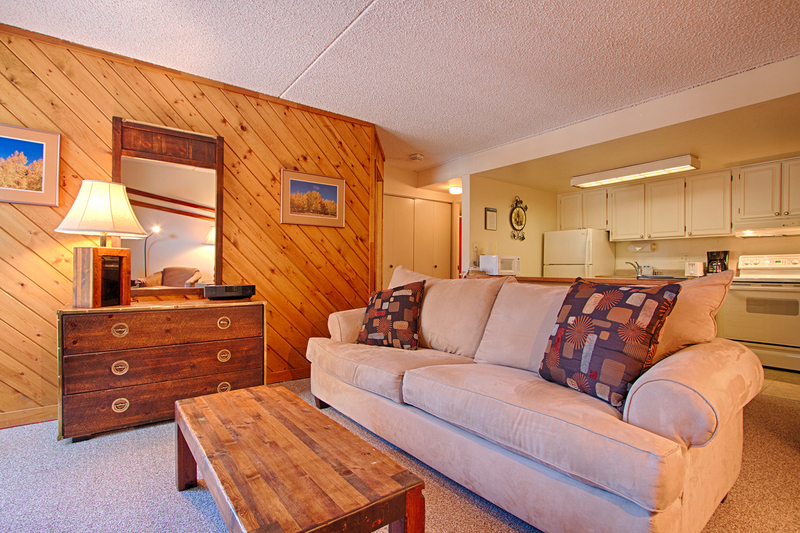 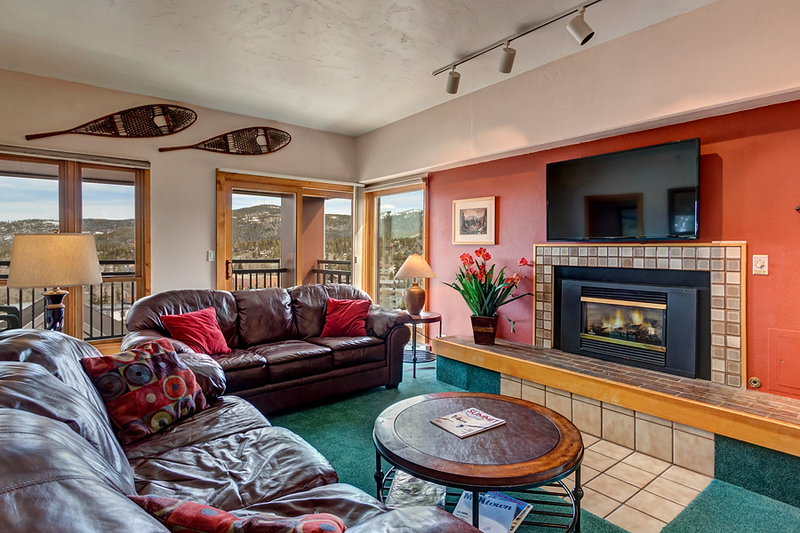 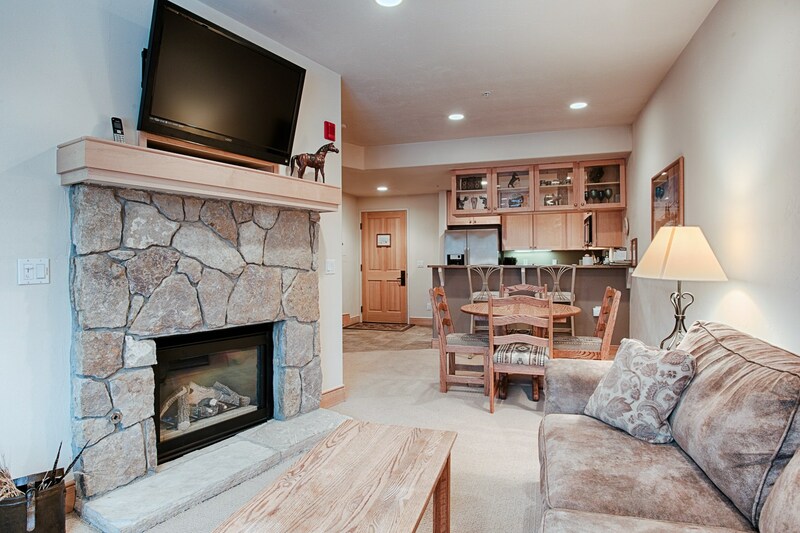 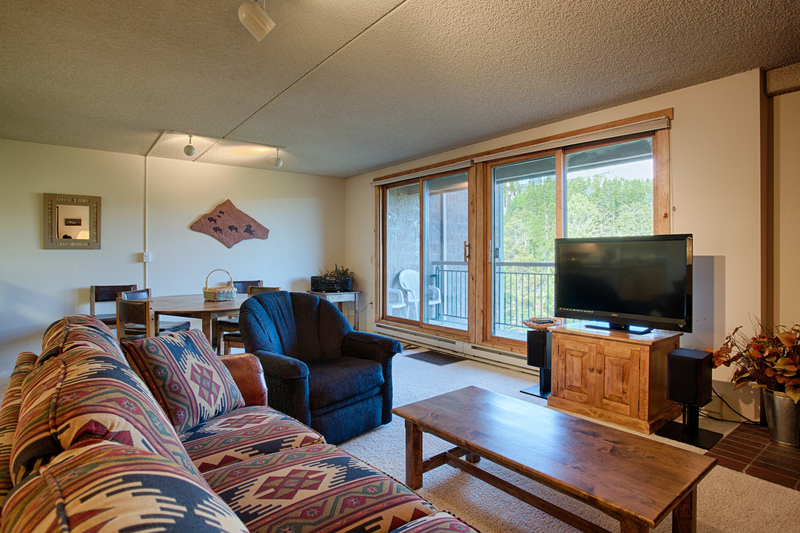 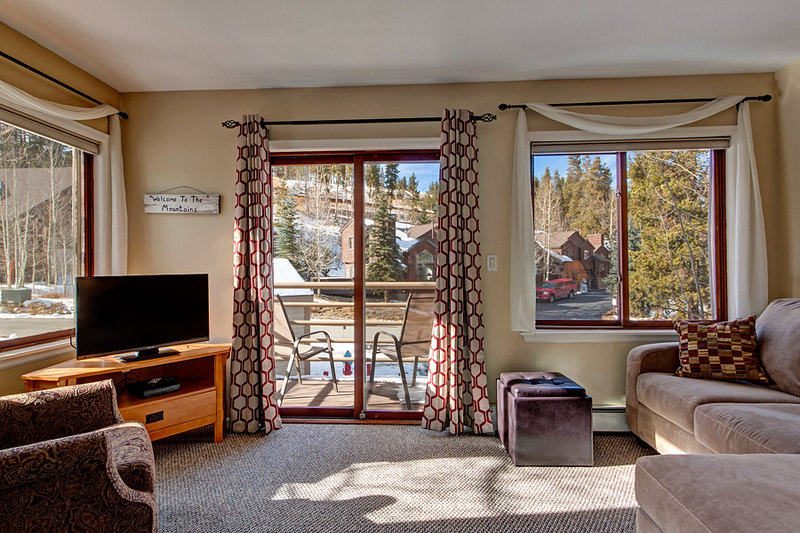 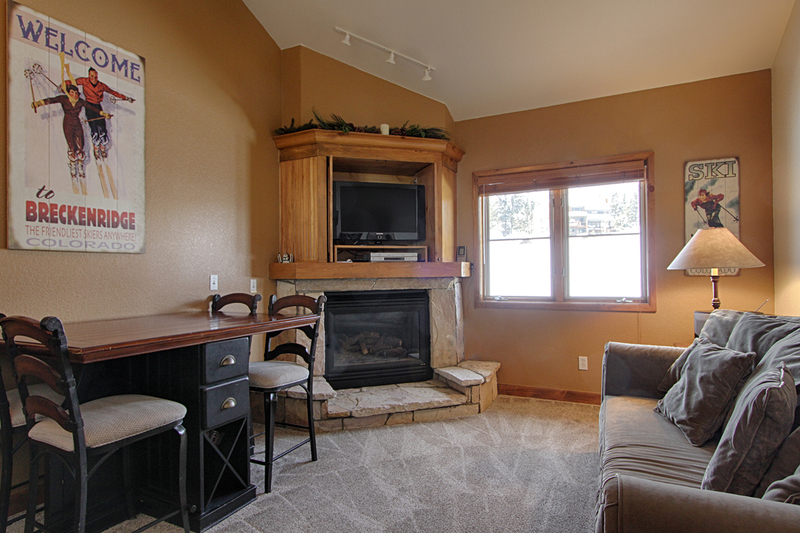 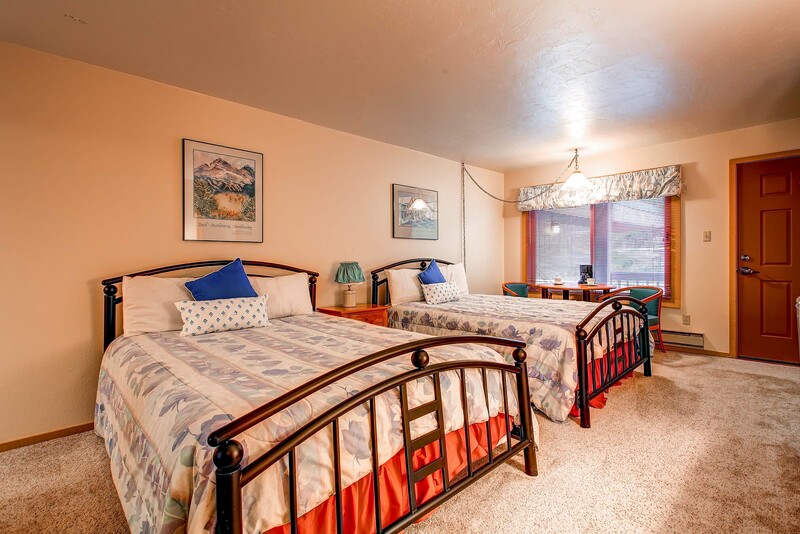 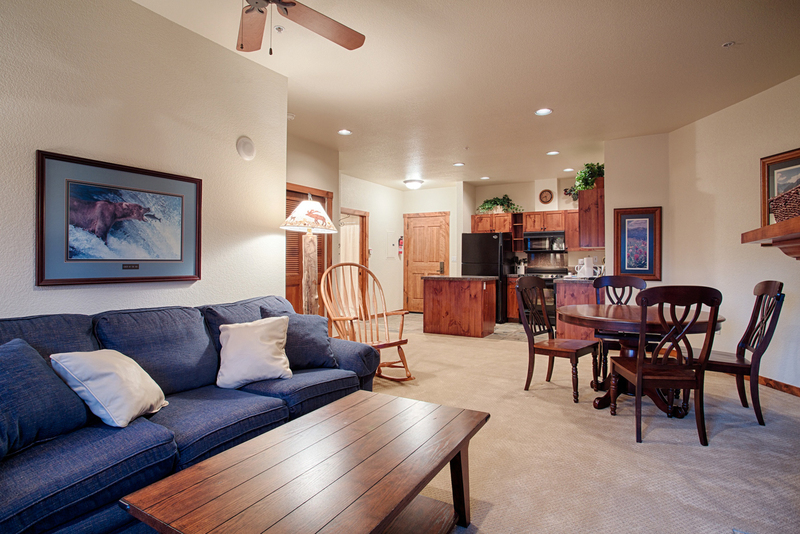 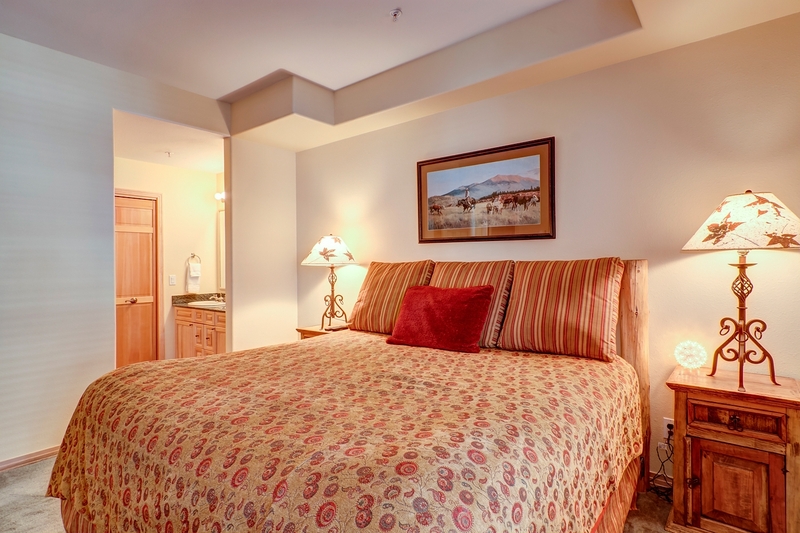 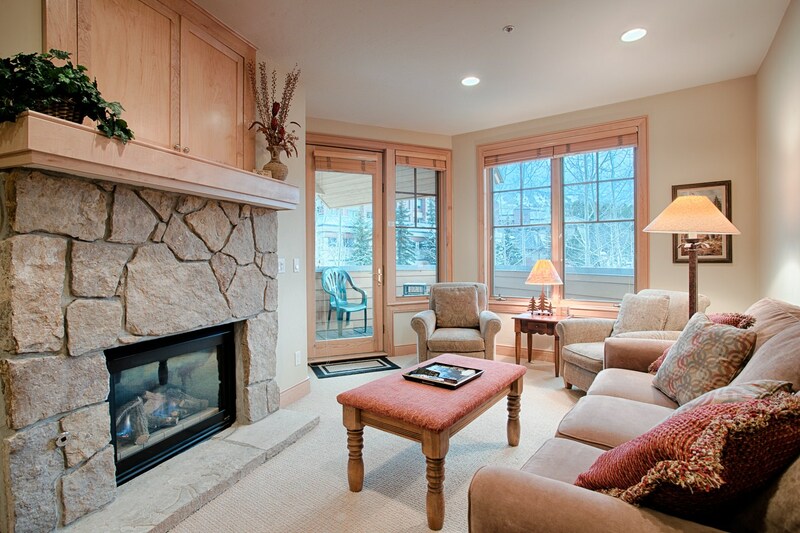 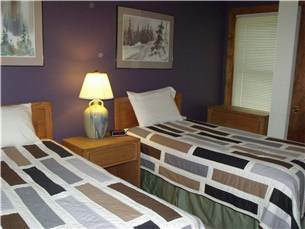 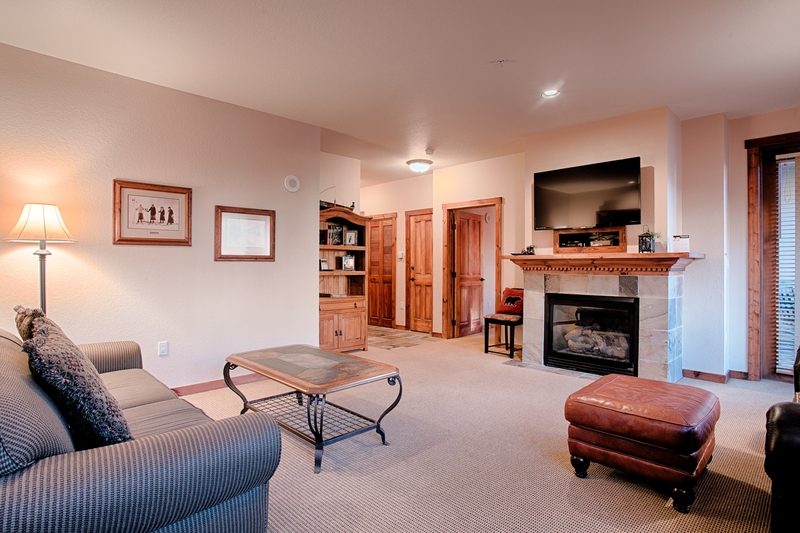 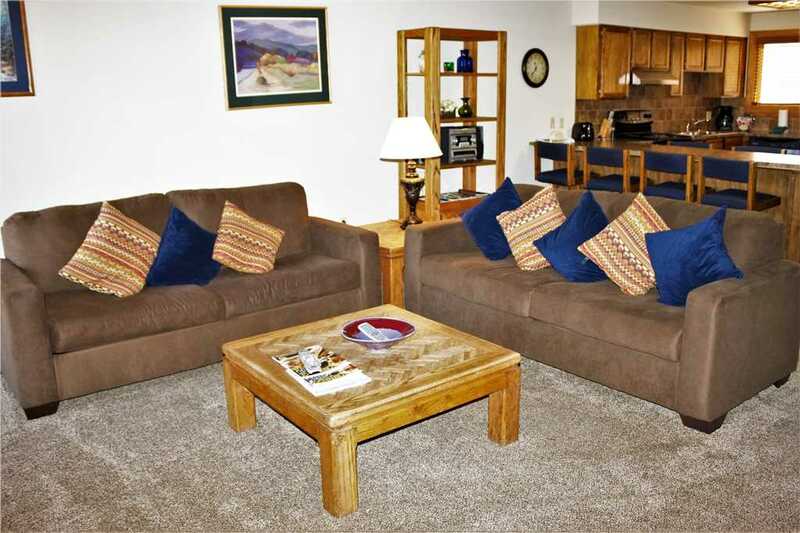 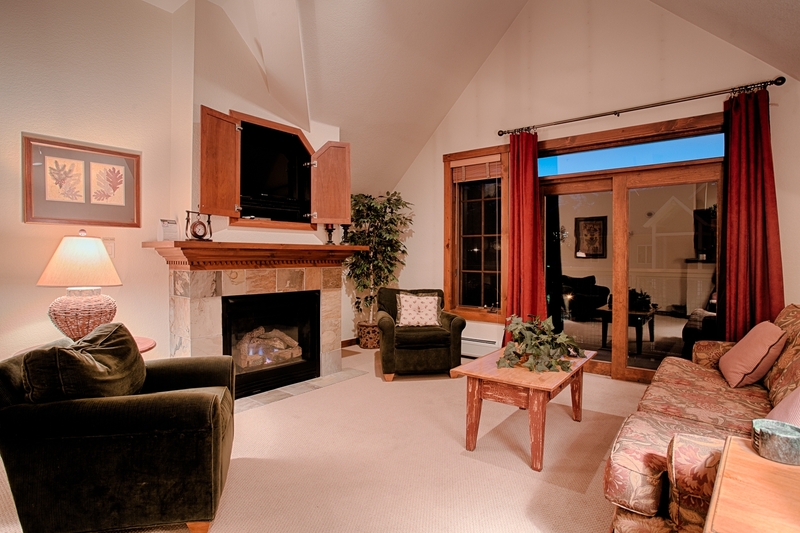 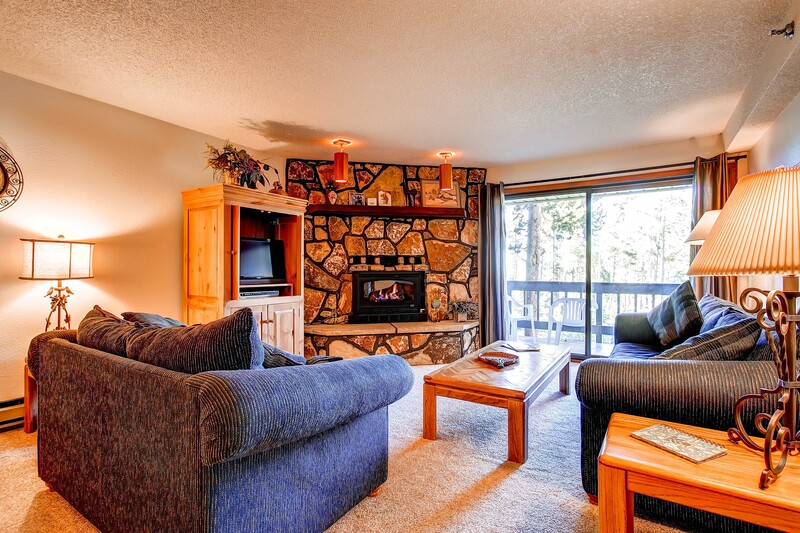 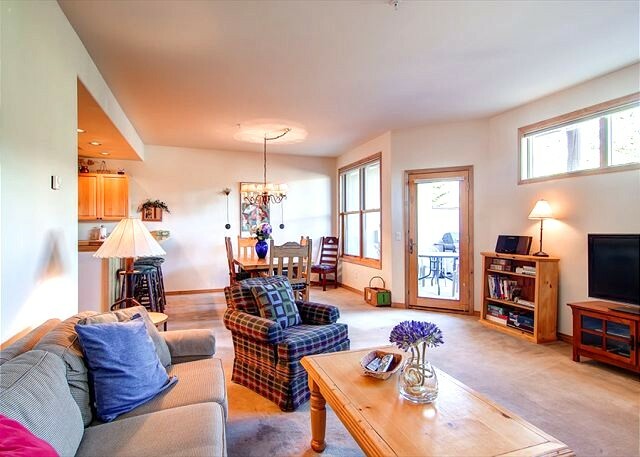 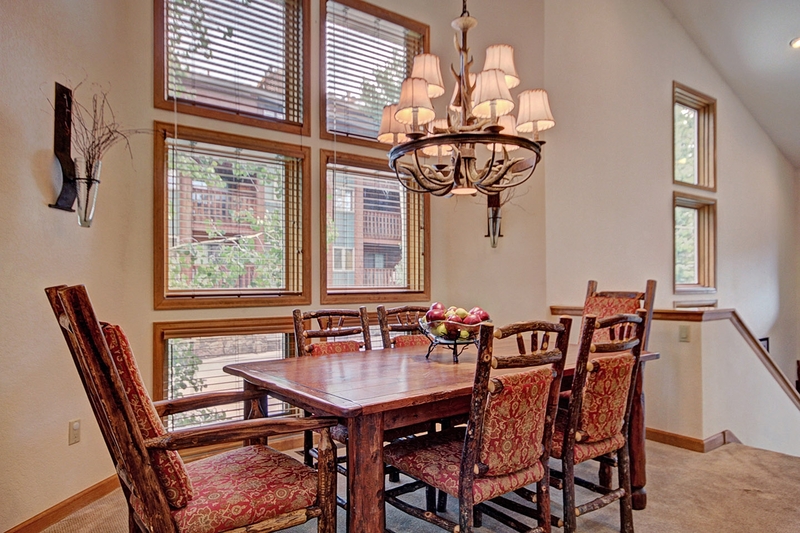 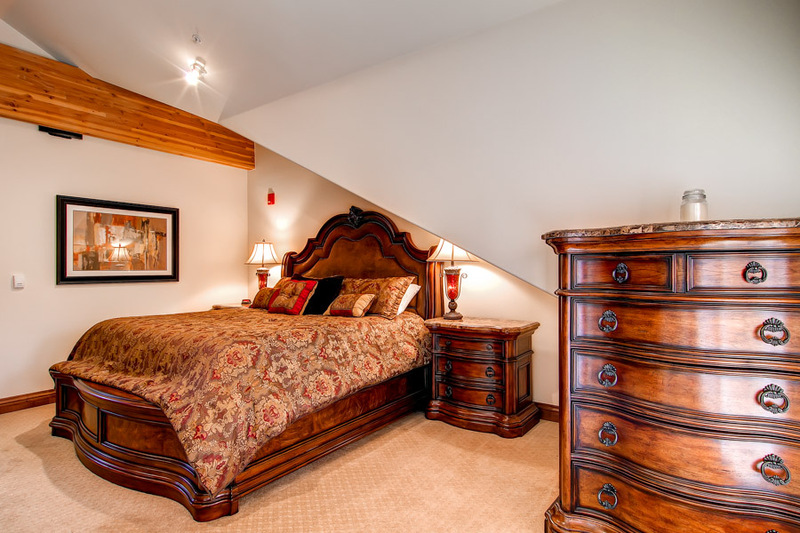 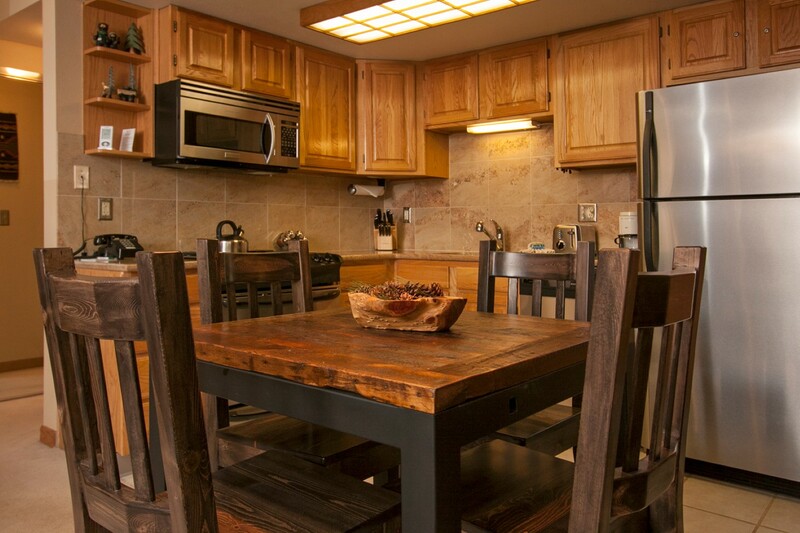 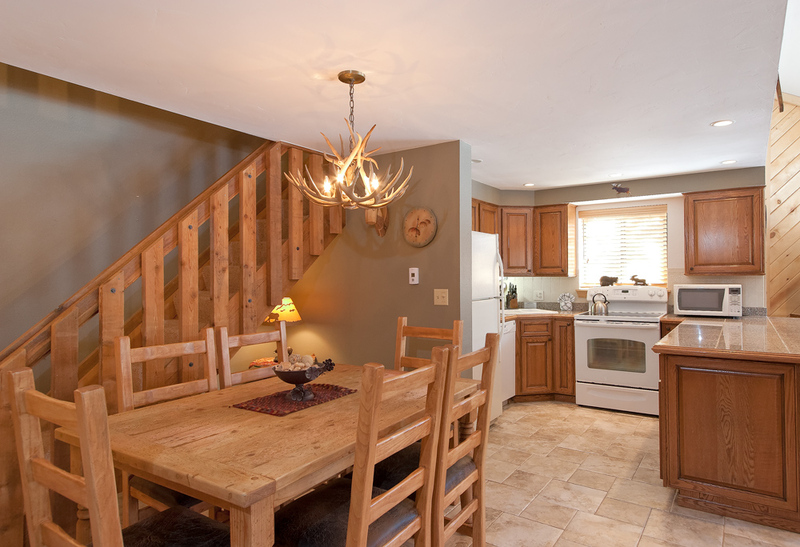 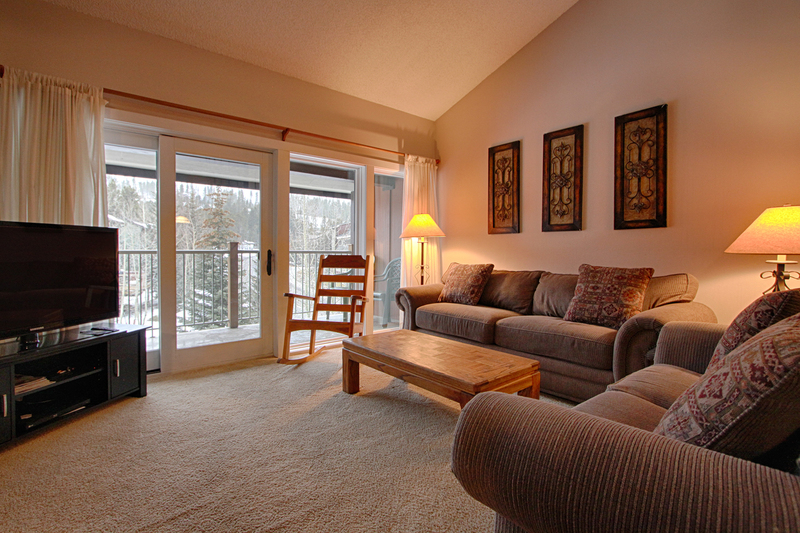 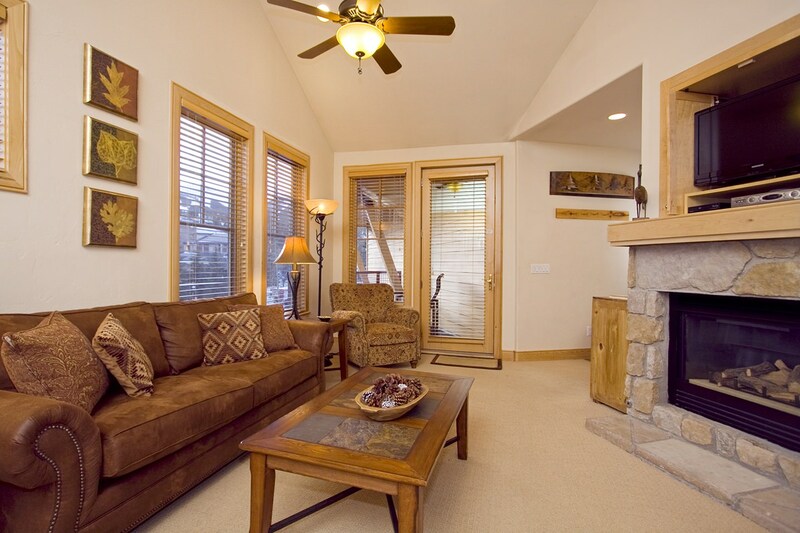 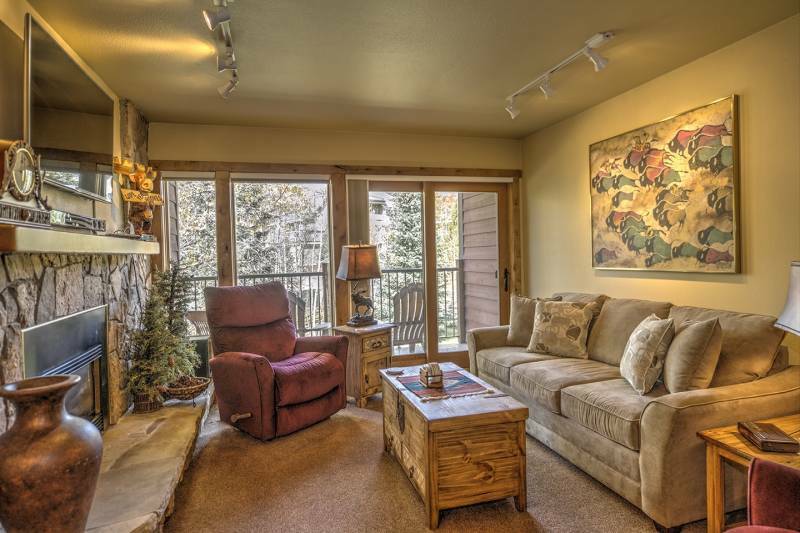 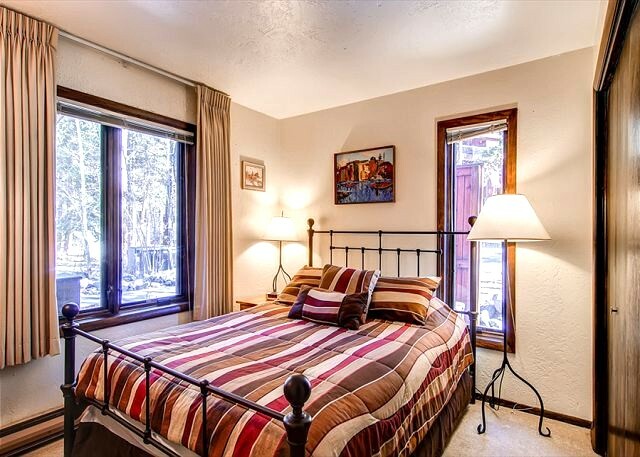 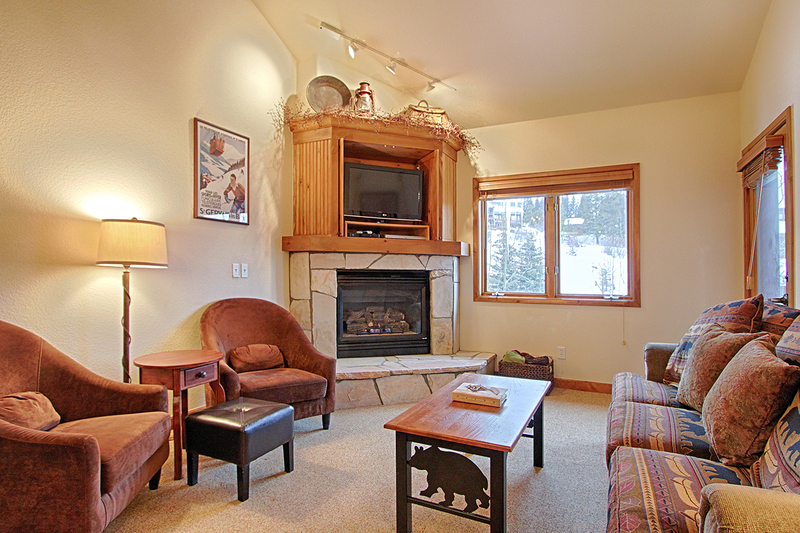 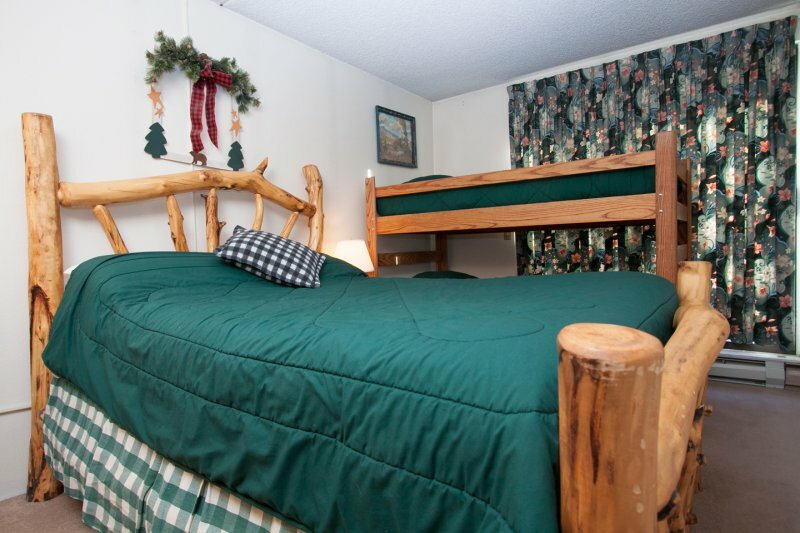 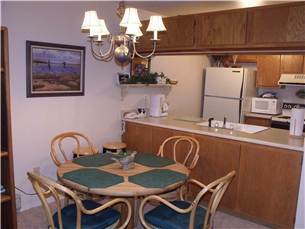 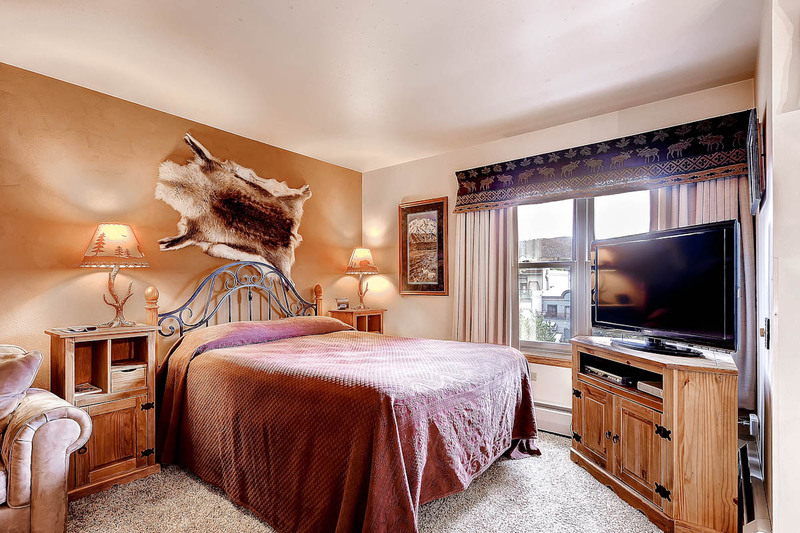 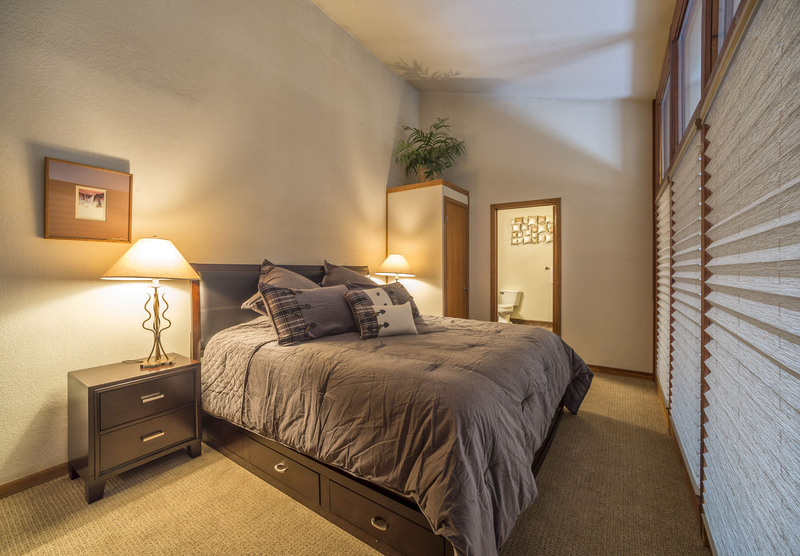 Call us today to book your fabulous mountain getaway at Boulevard Bend 2!